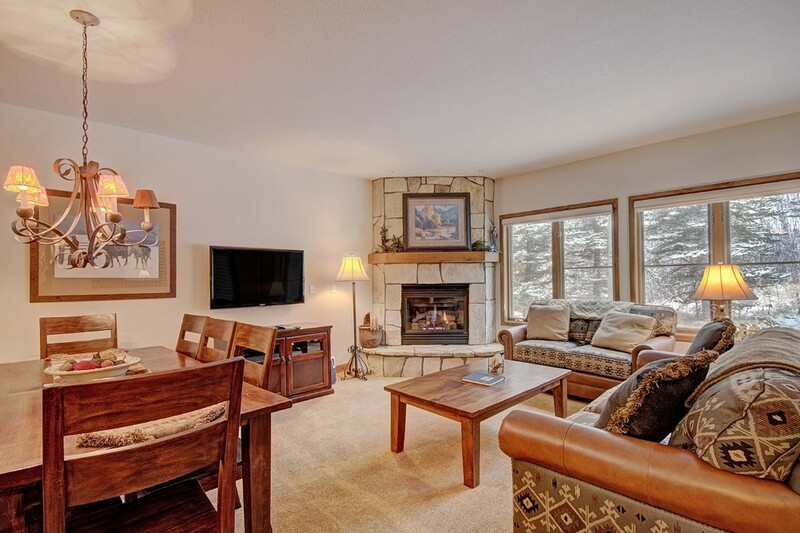 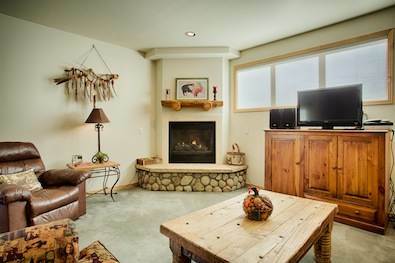 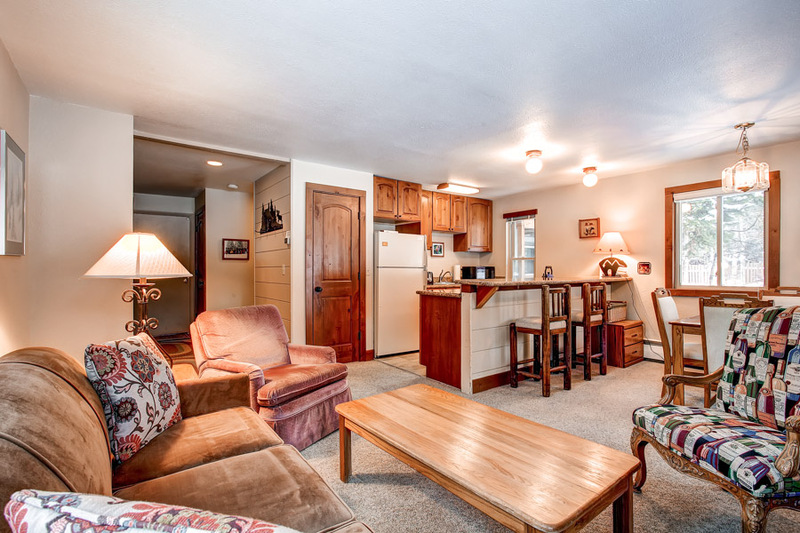 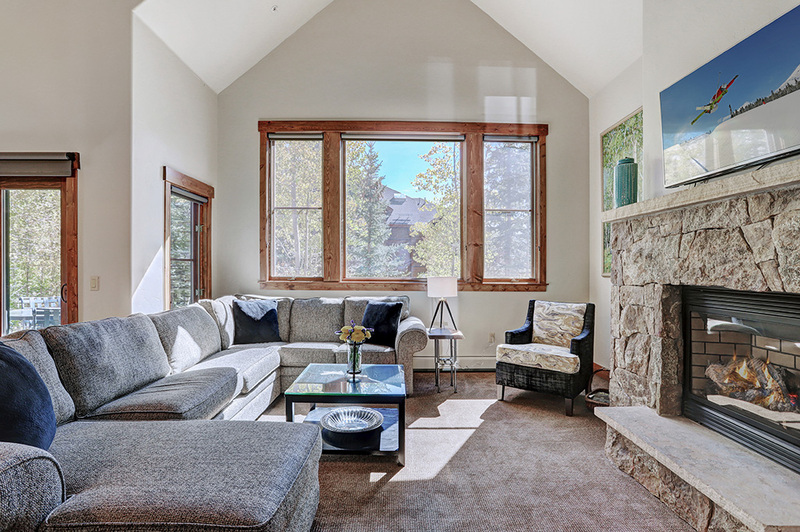 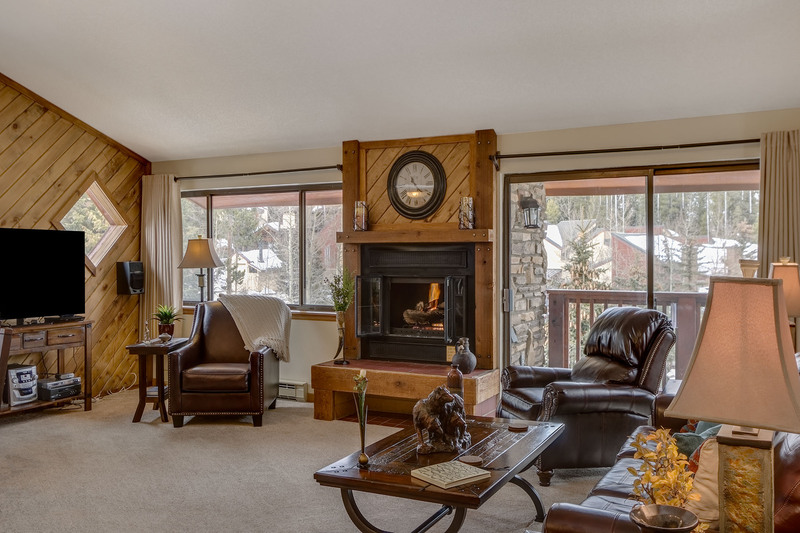 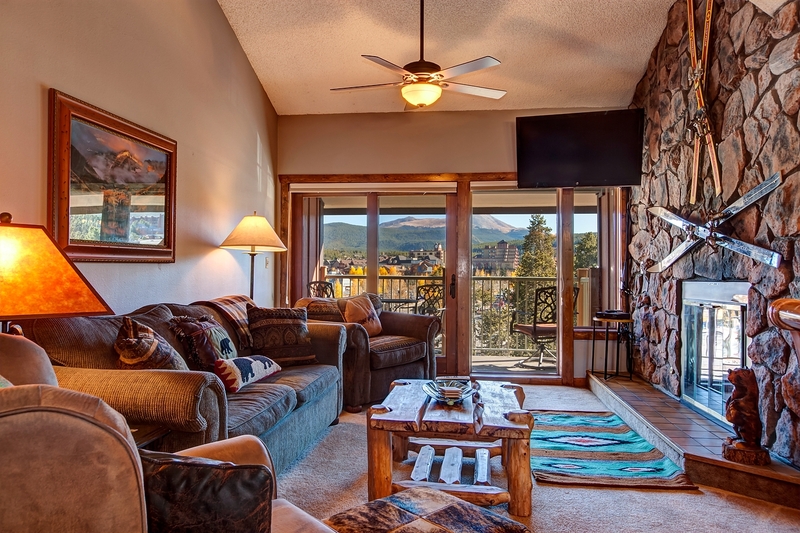 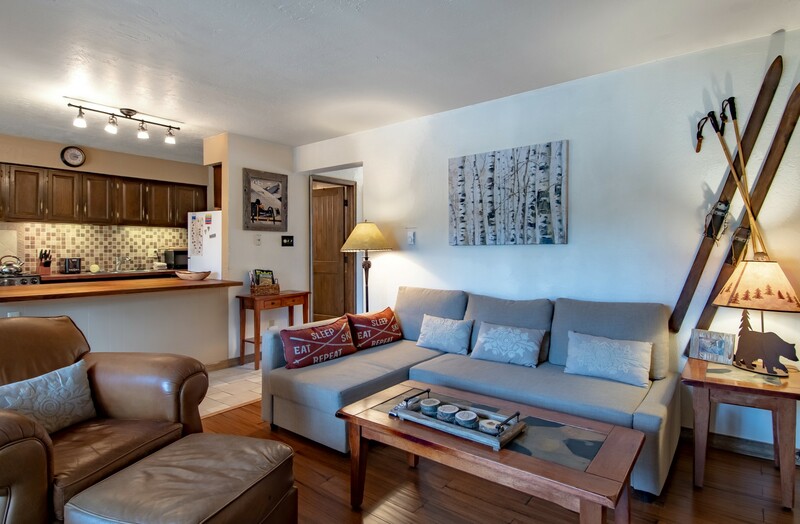 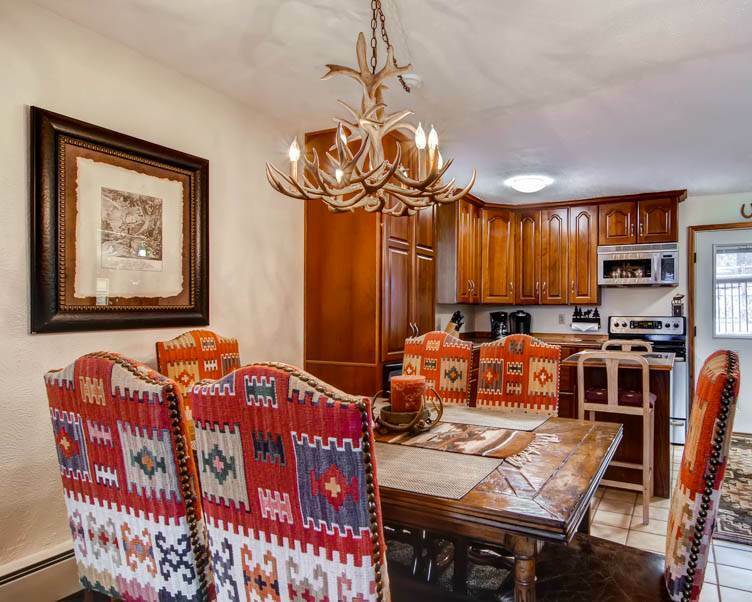 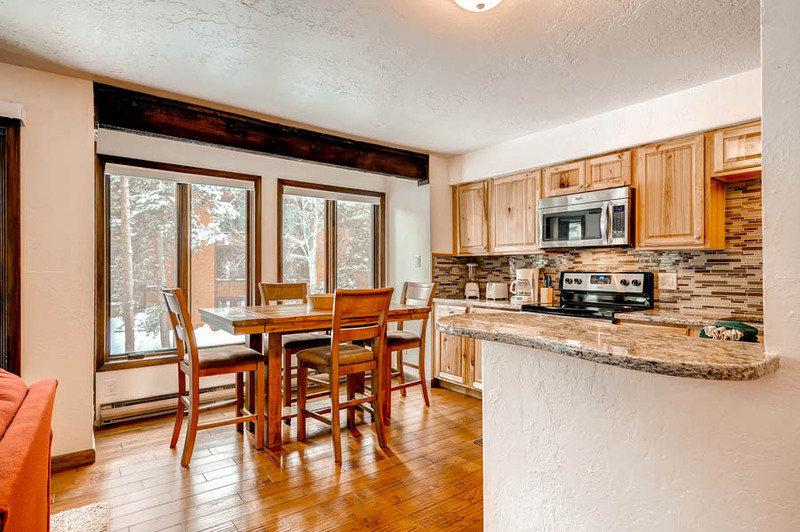 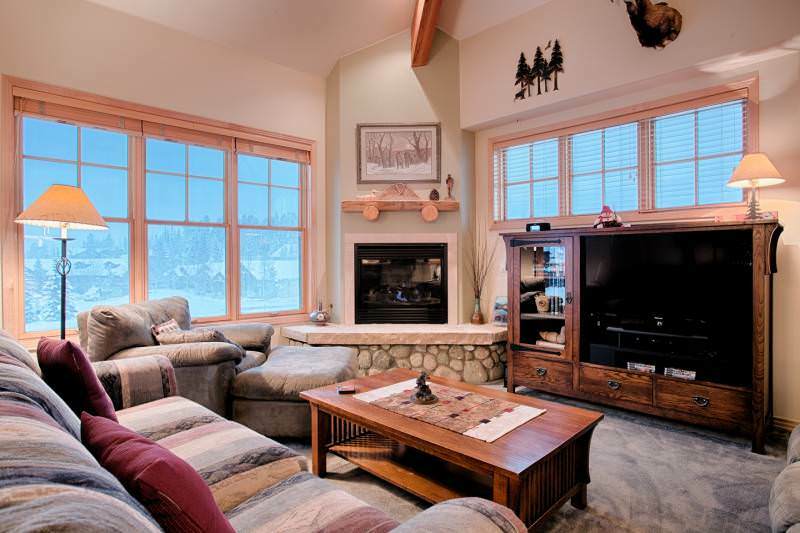 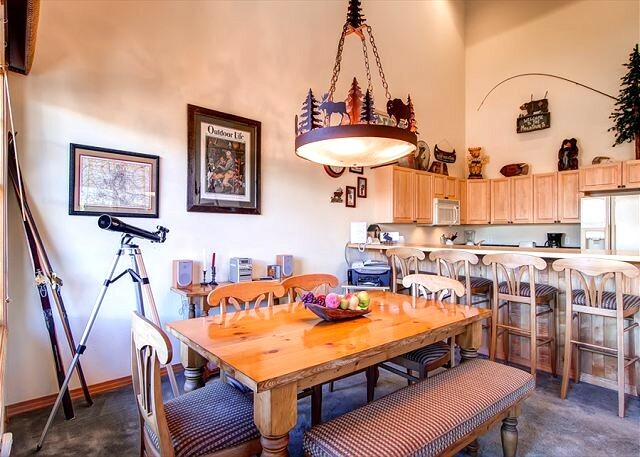 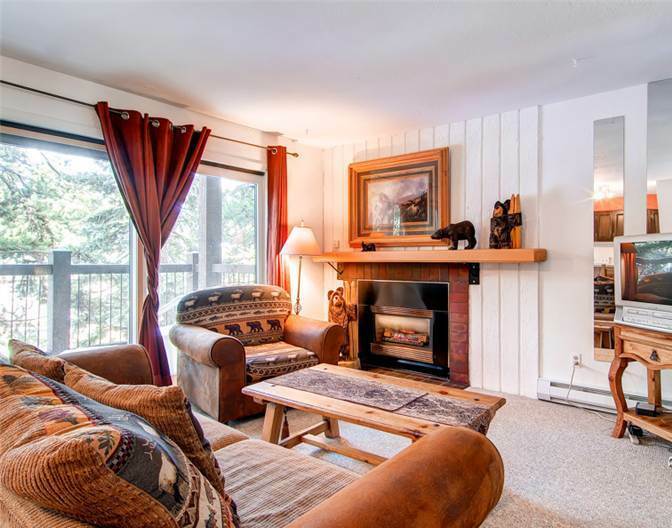 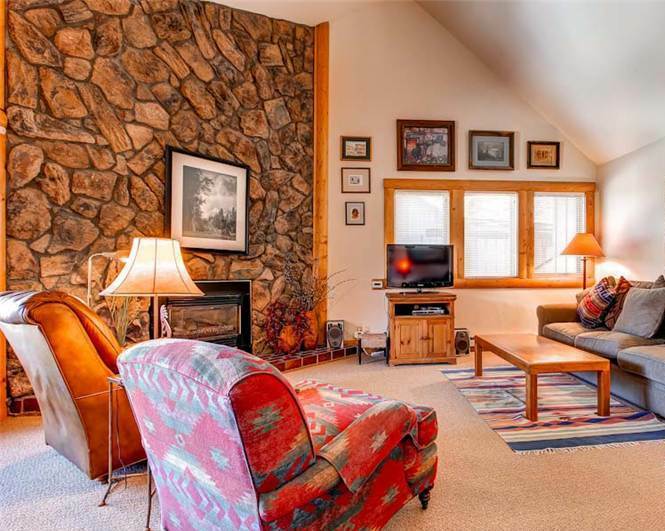 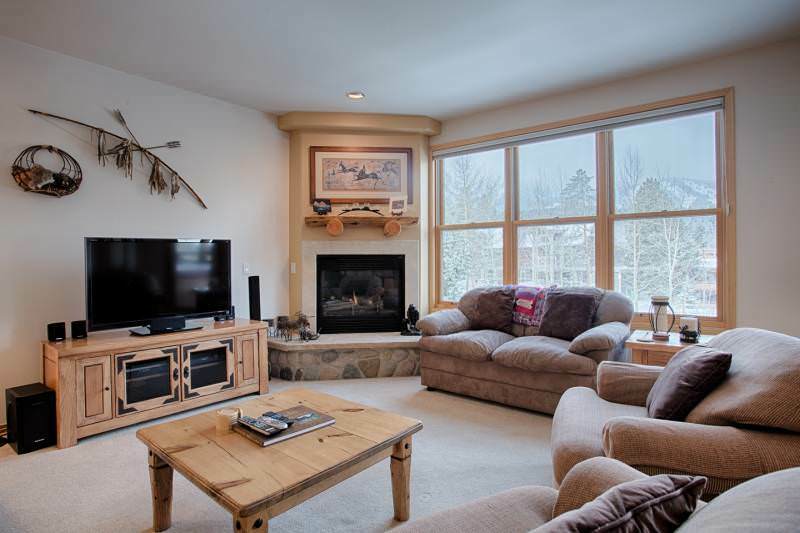 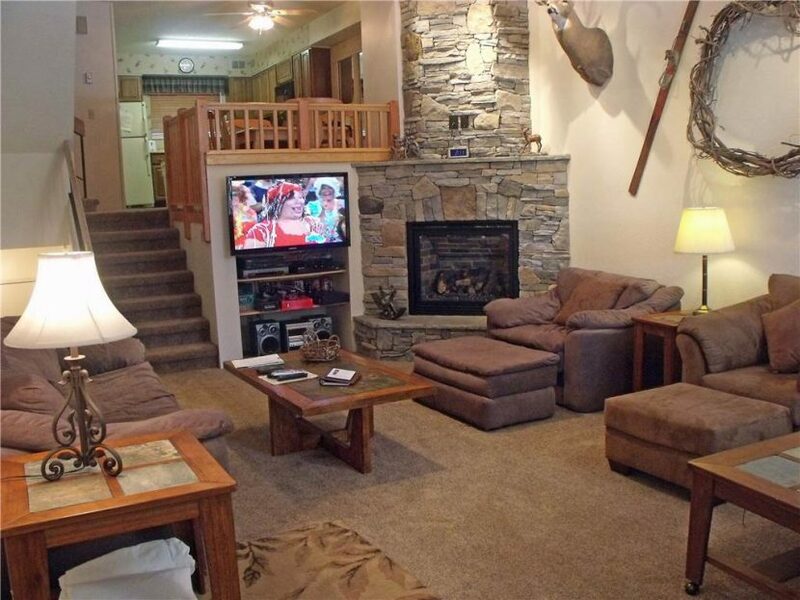 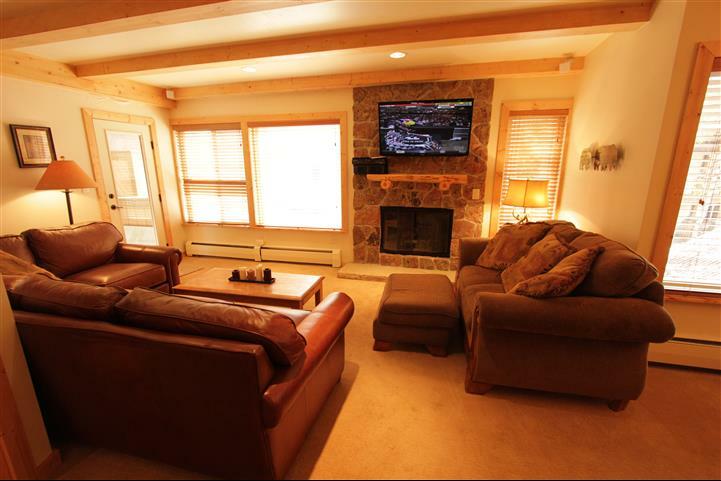 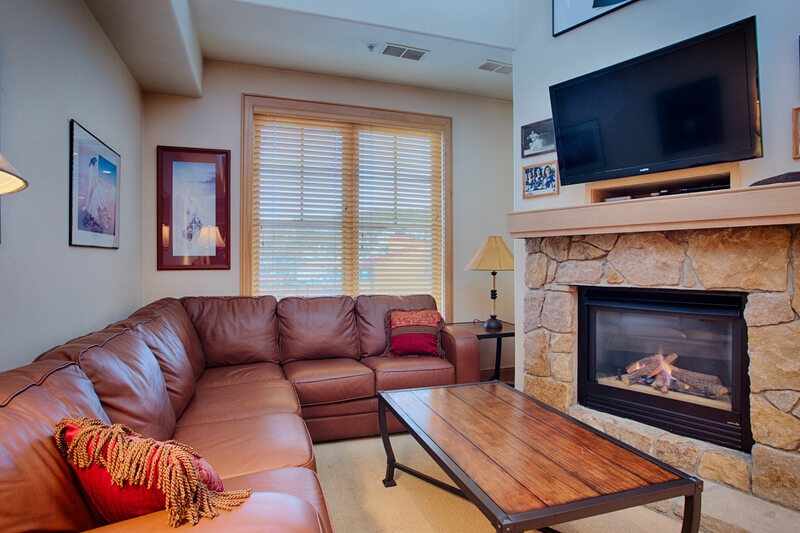 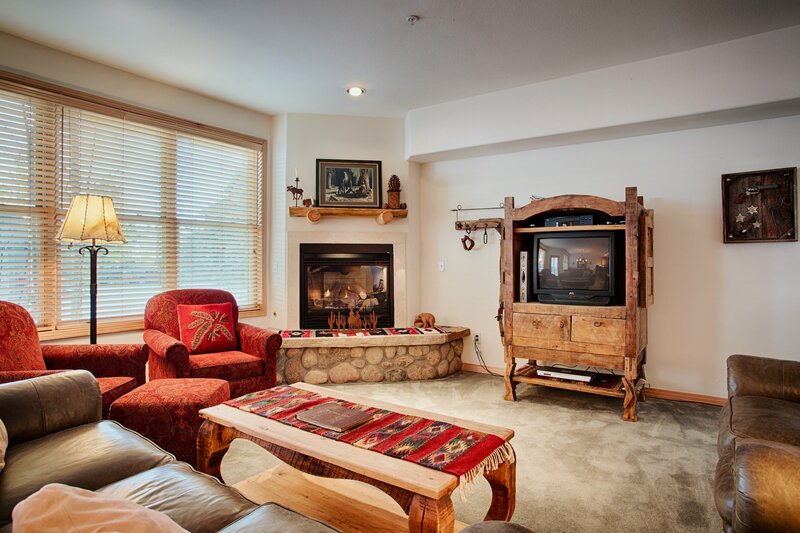 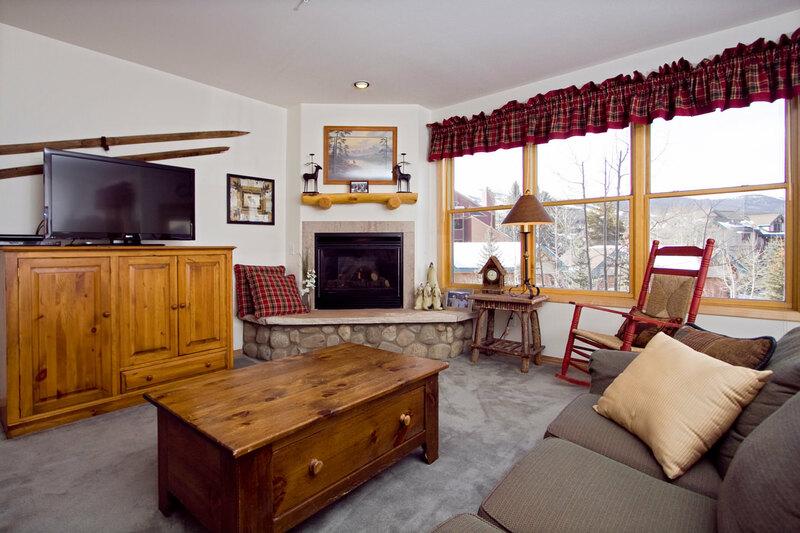 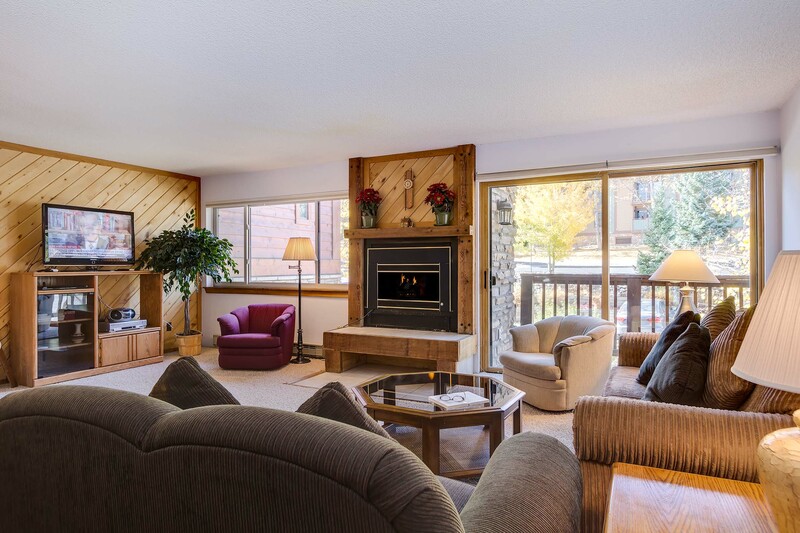 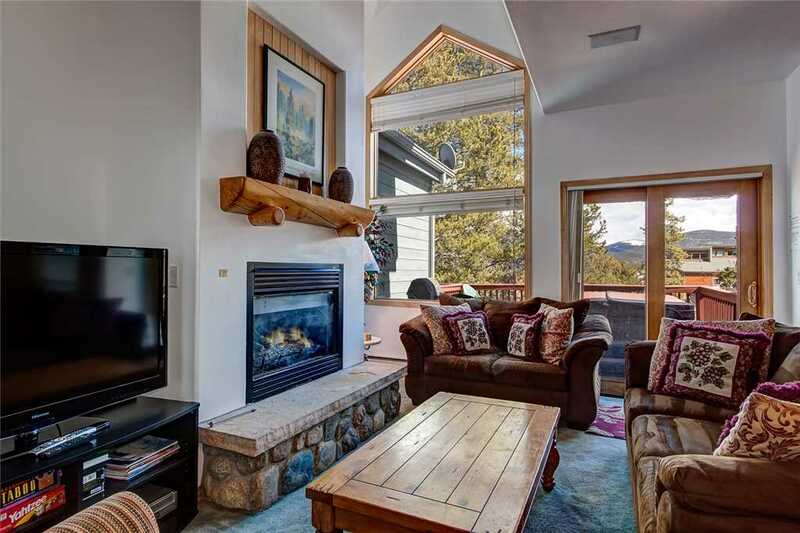 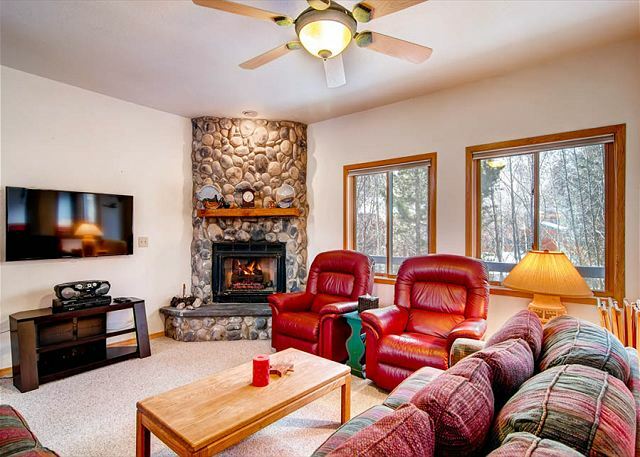 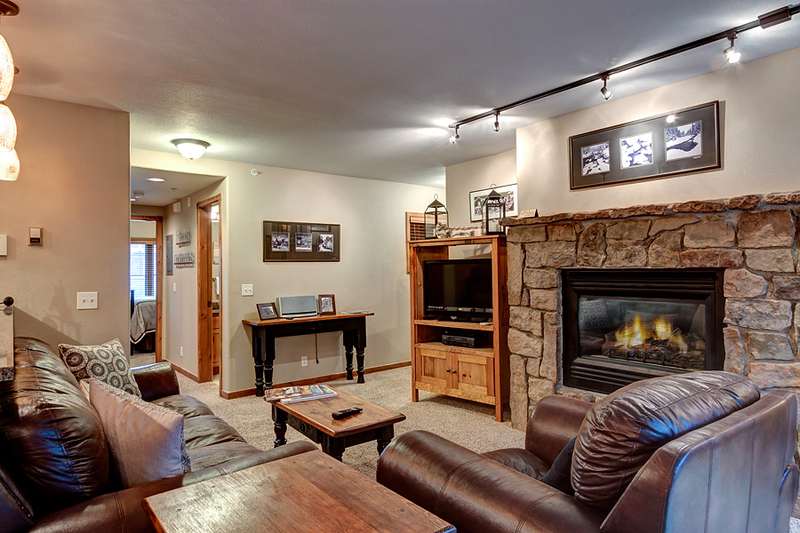 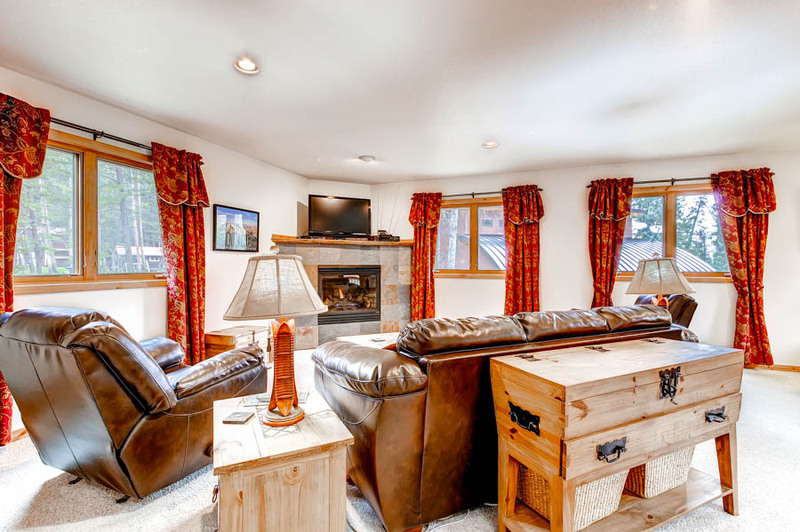 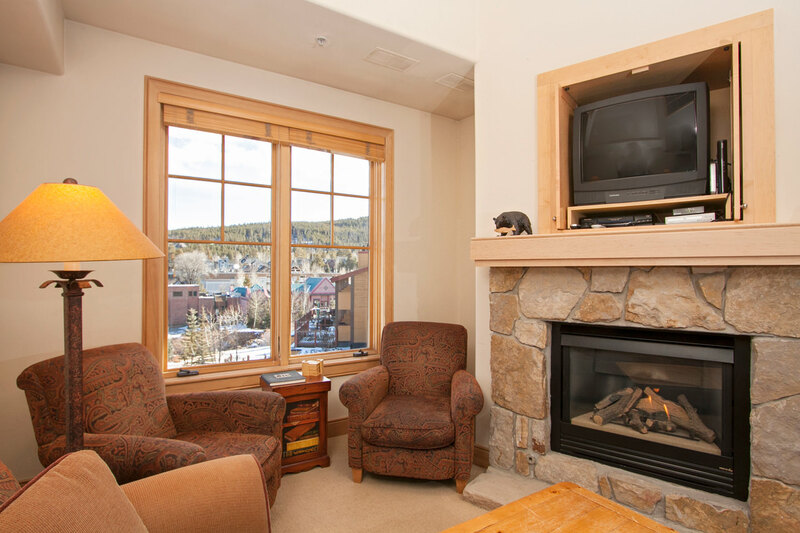 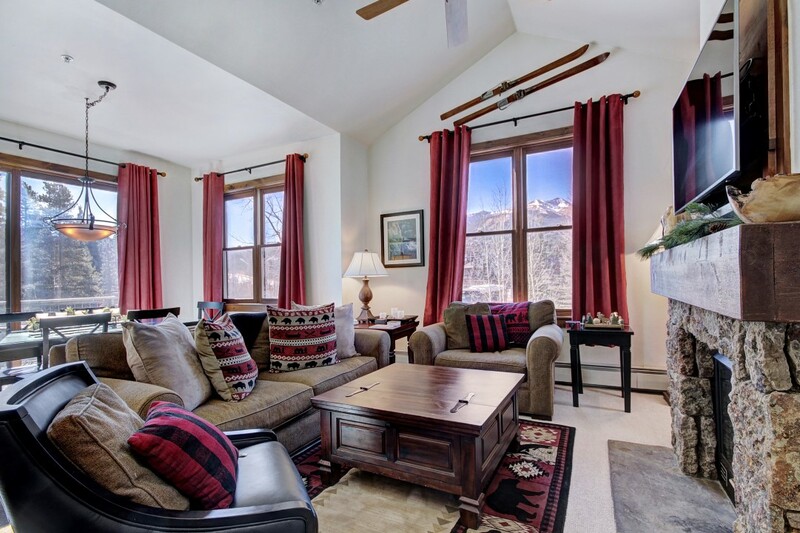 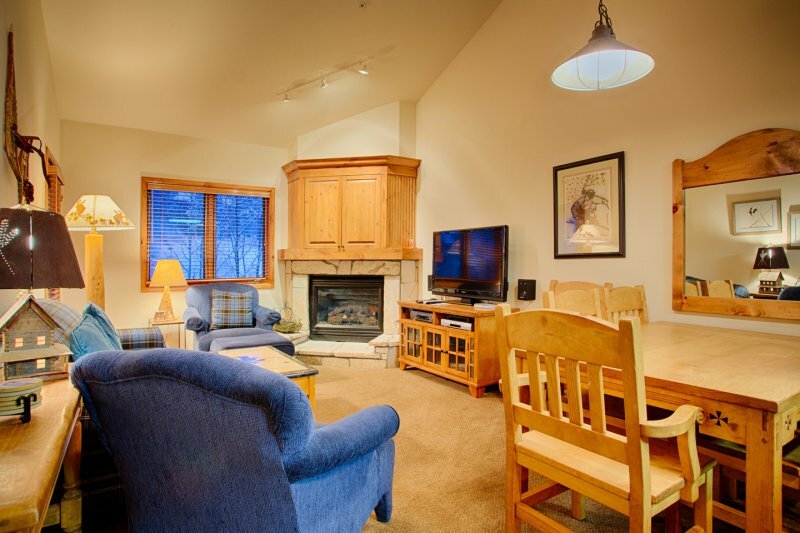 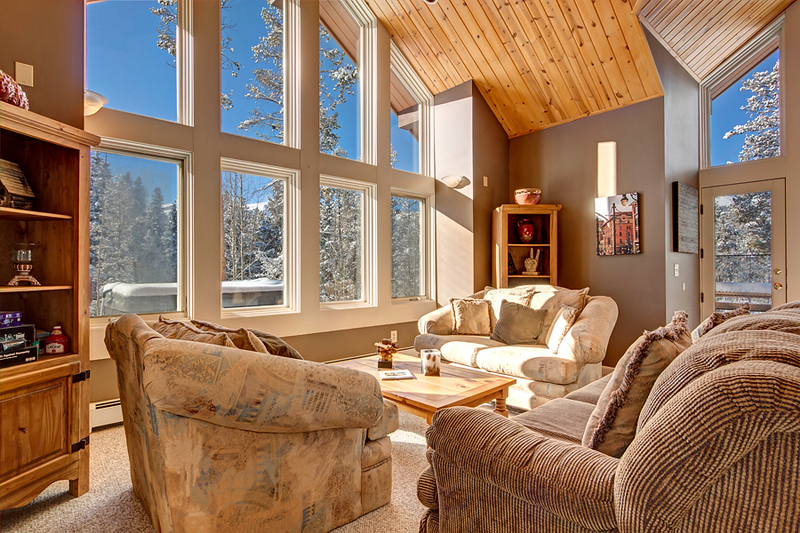 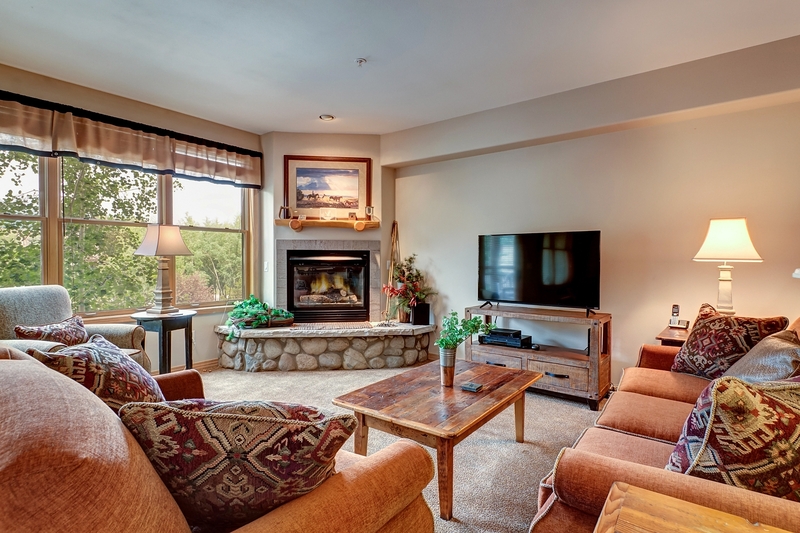 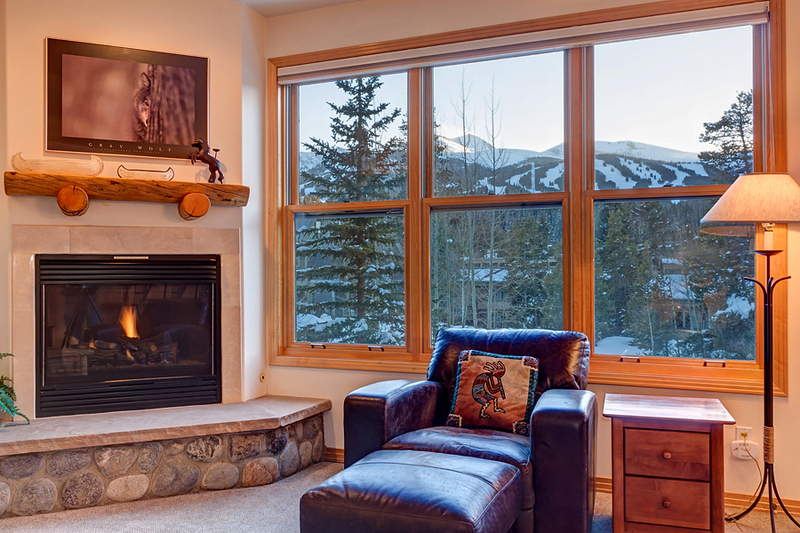 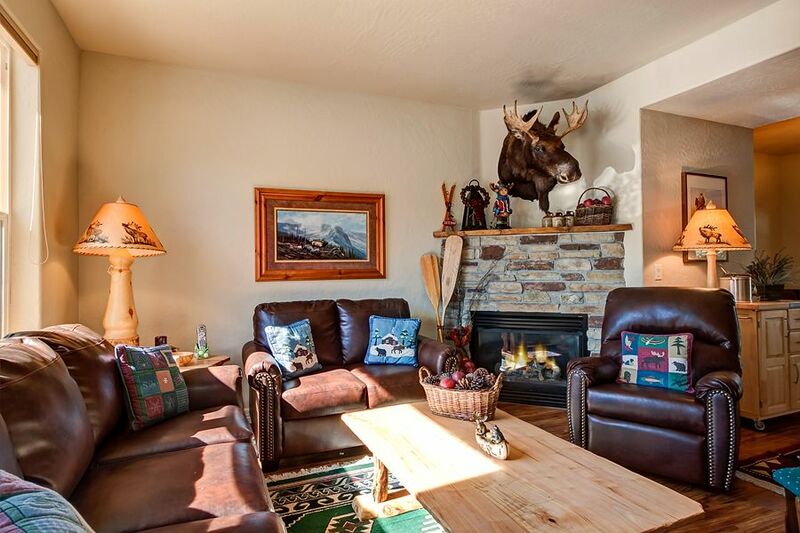 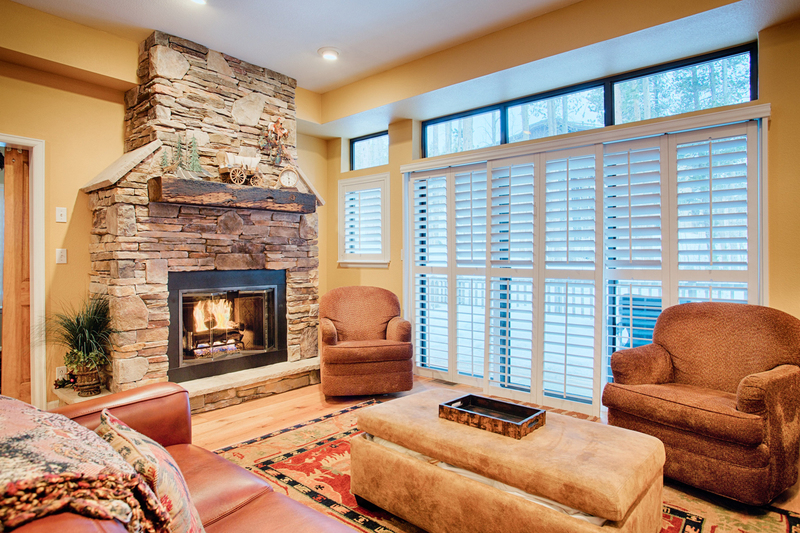 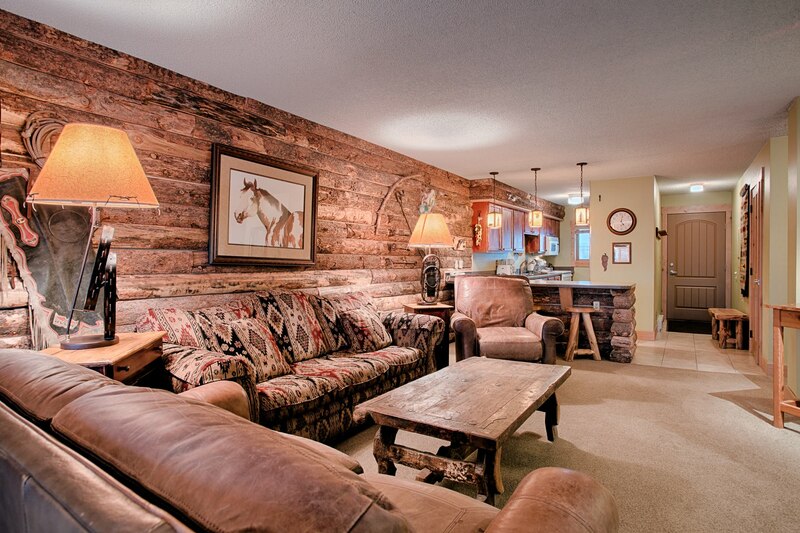 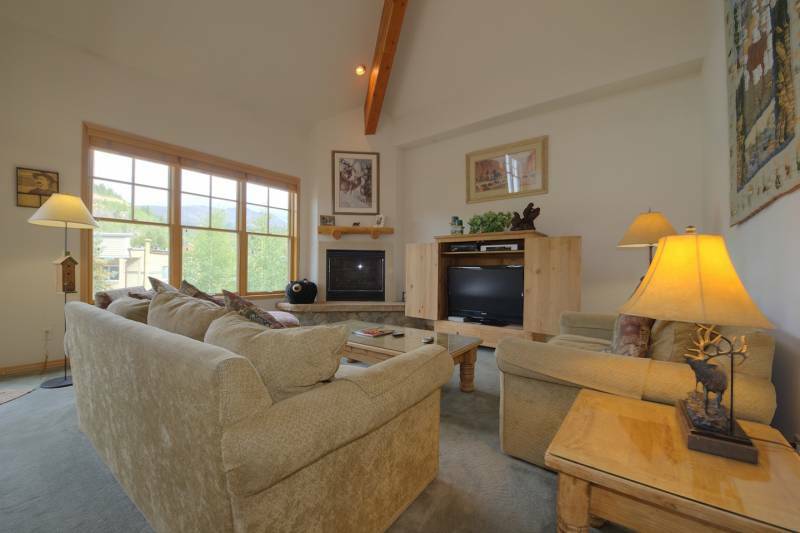 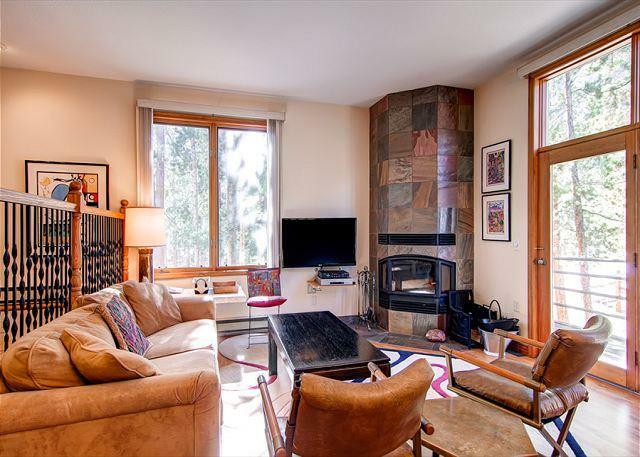 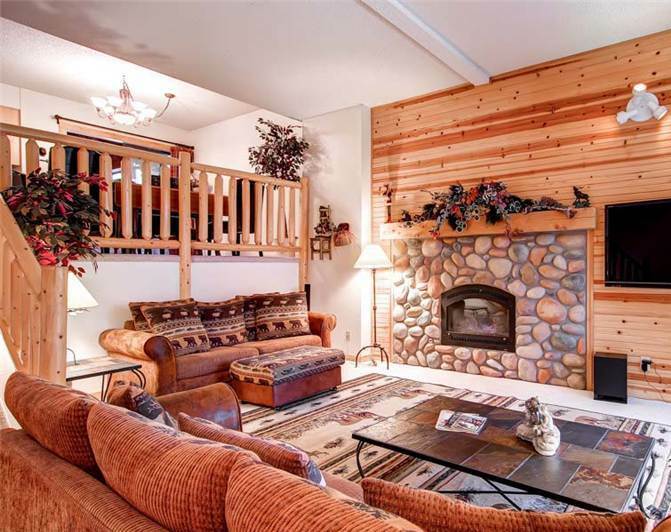 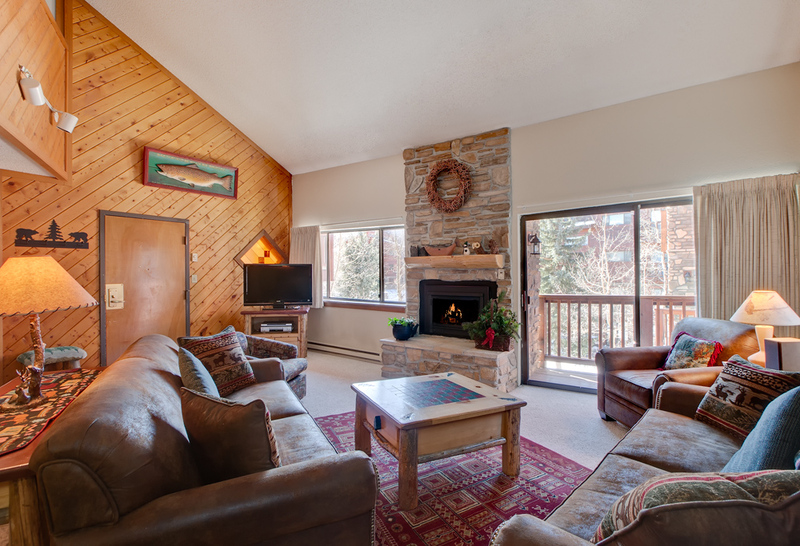 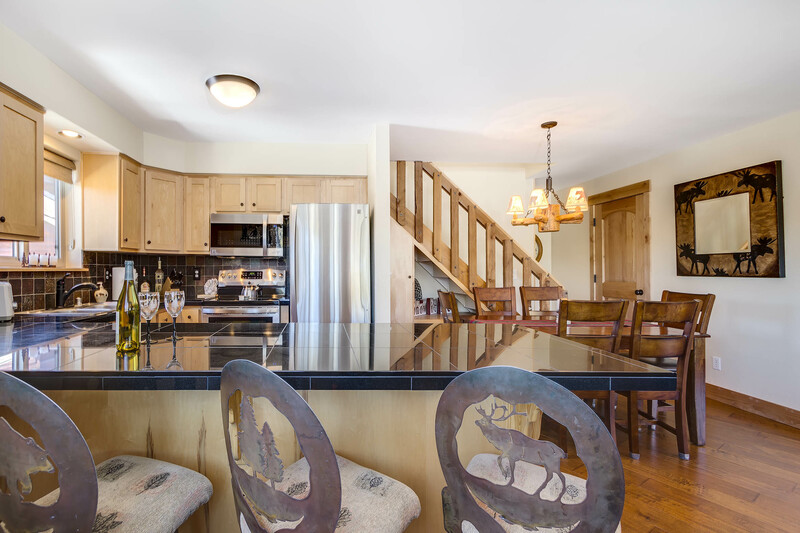 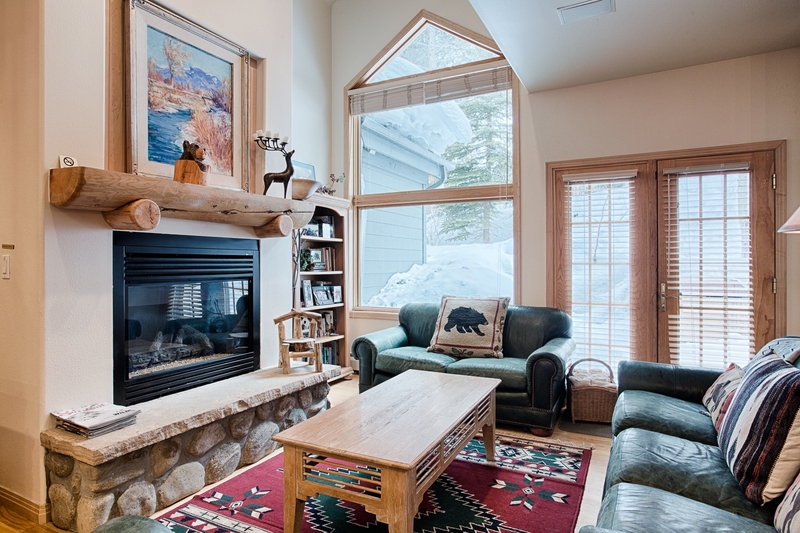 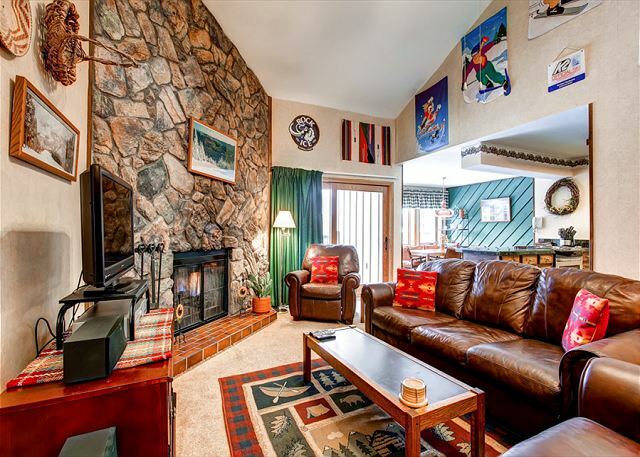 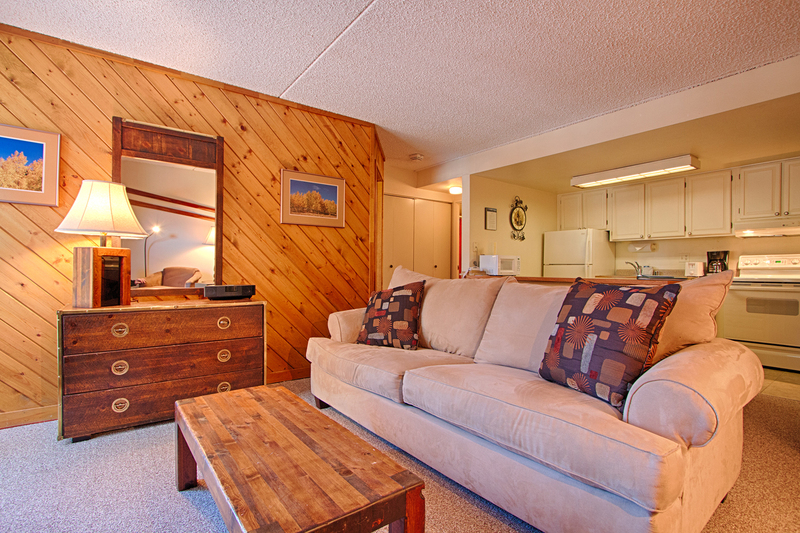 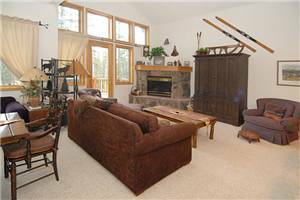 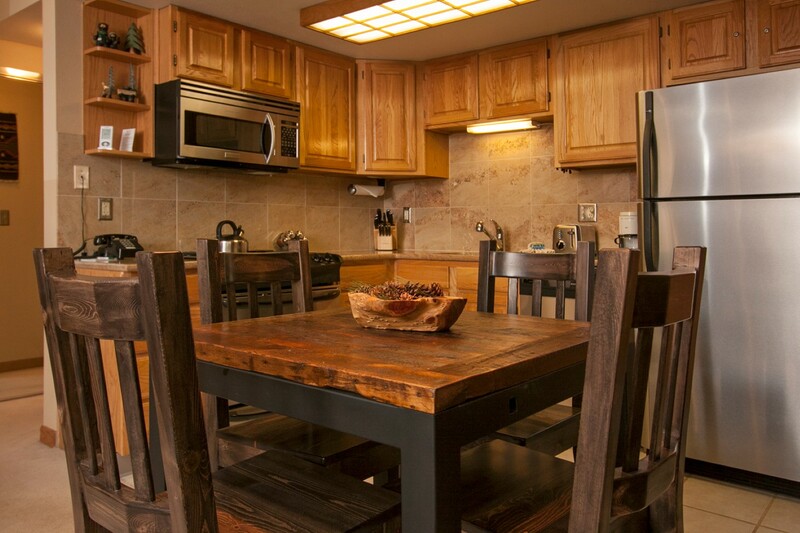 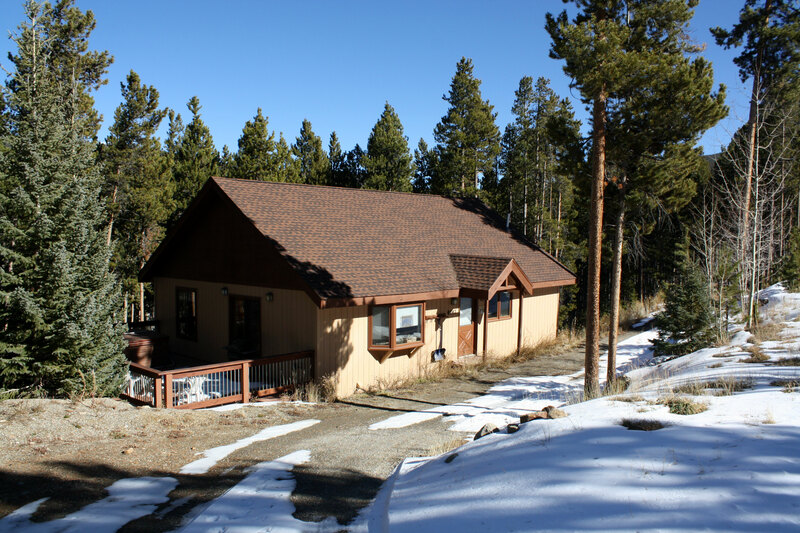 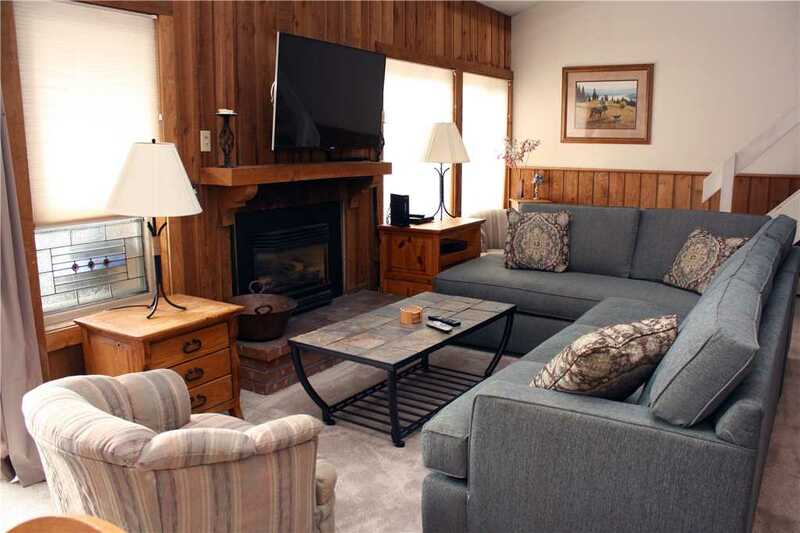 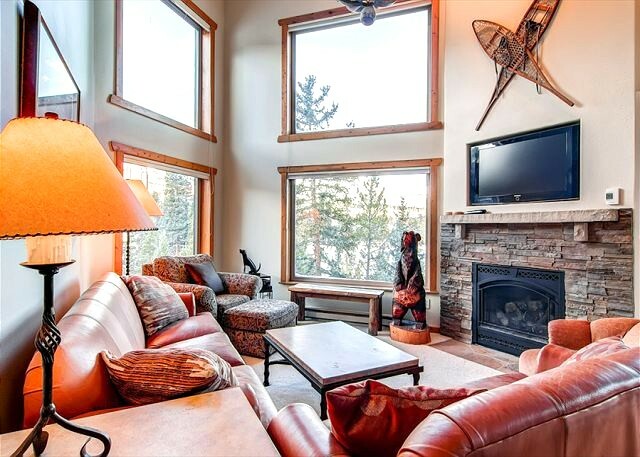 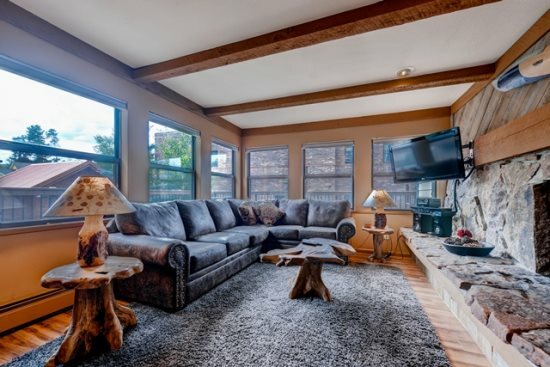 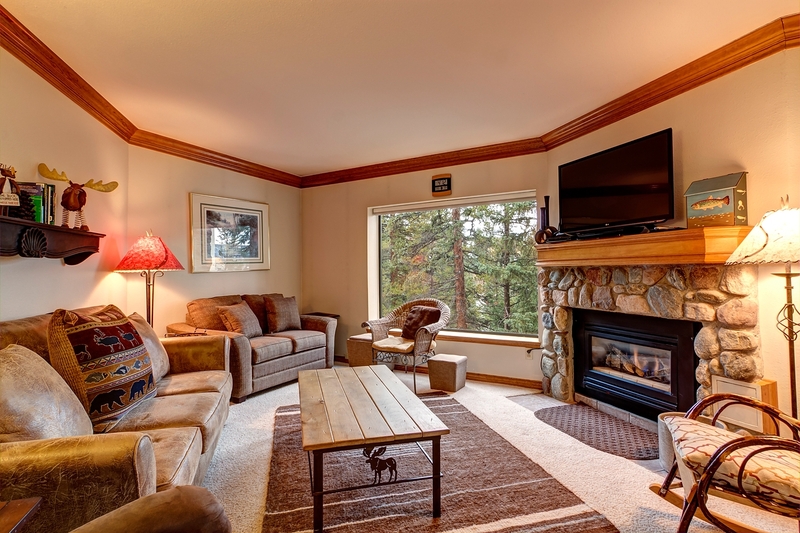 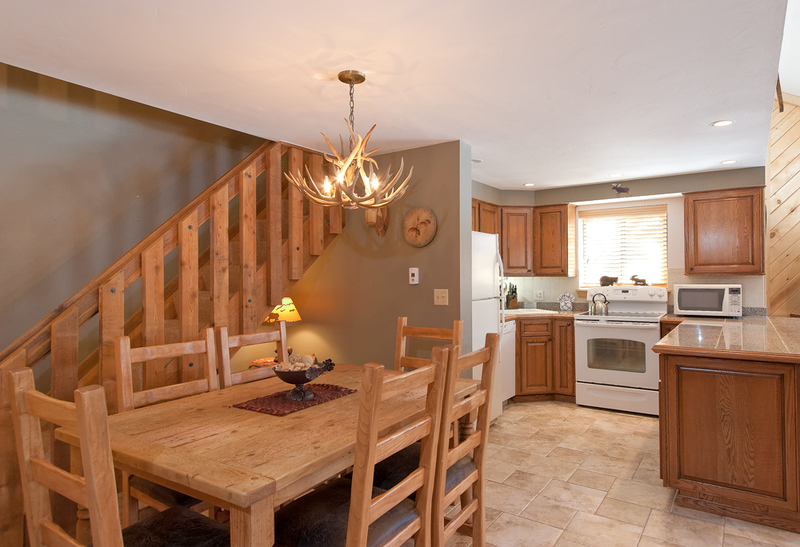 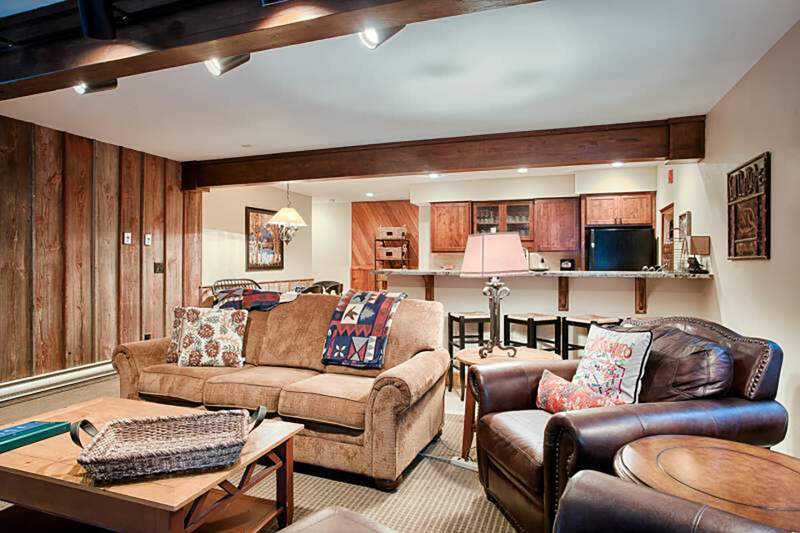 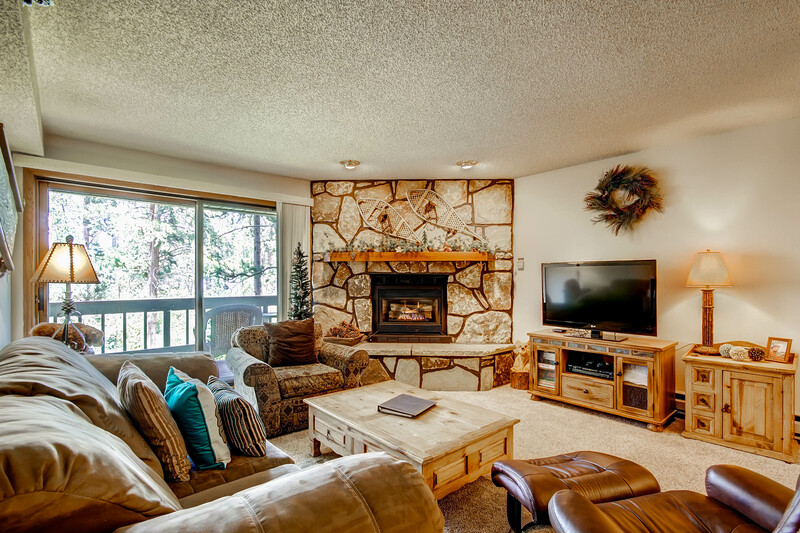 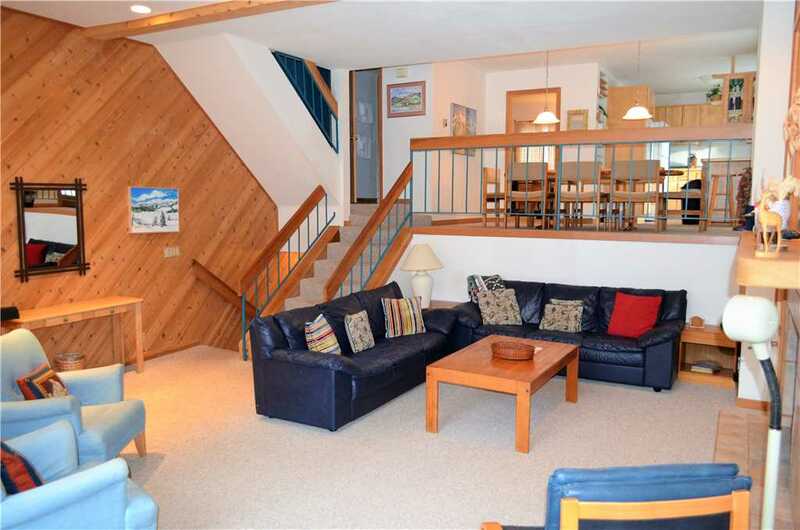 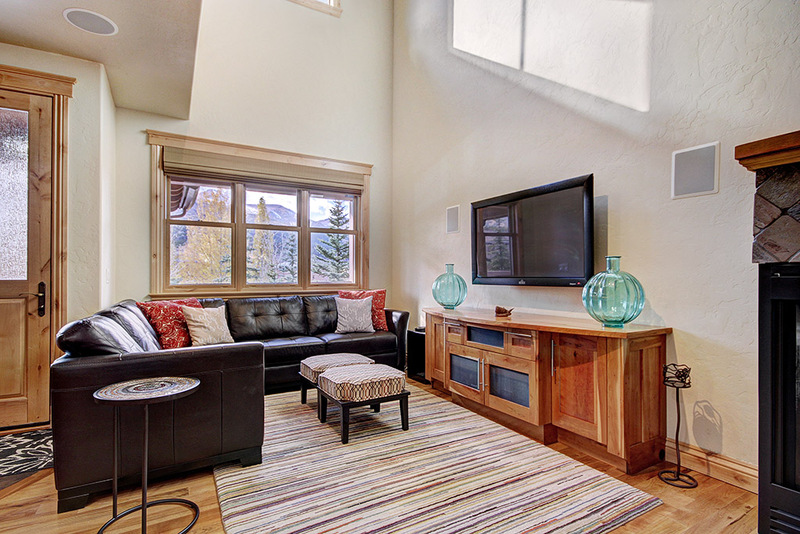 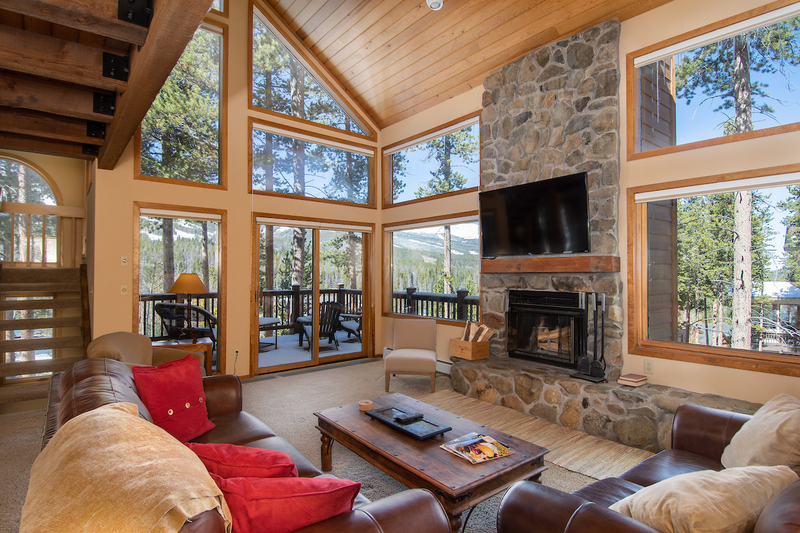 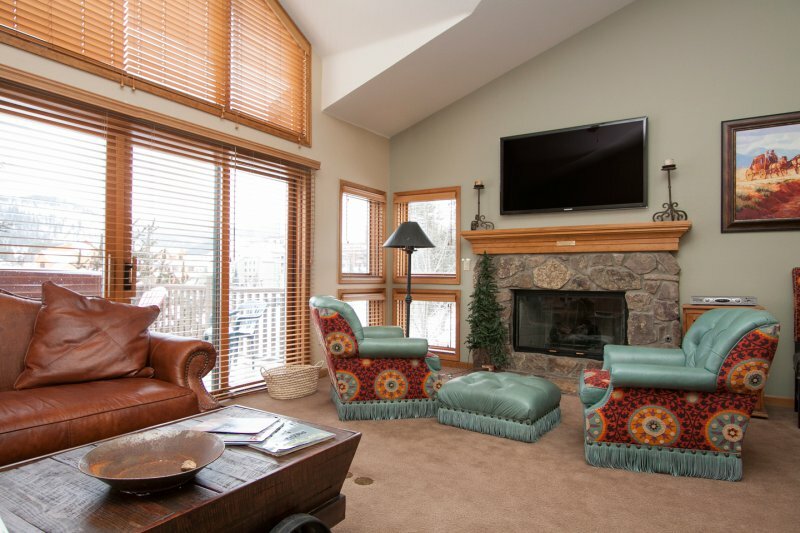 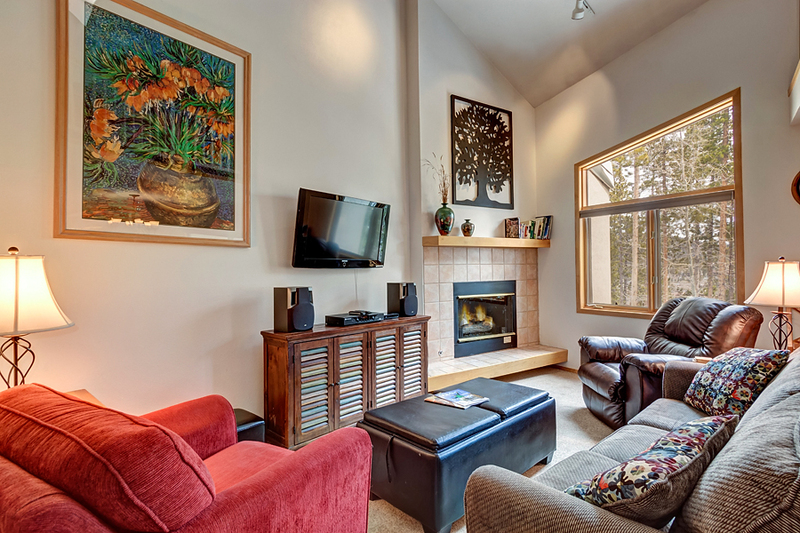 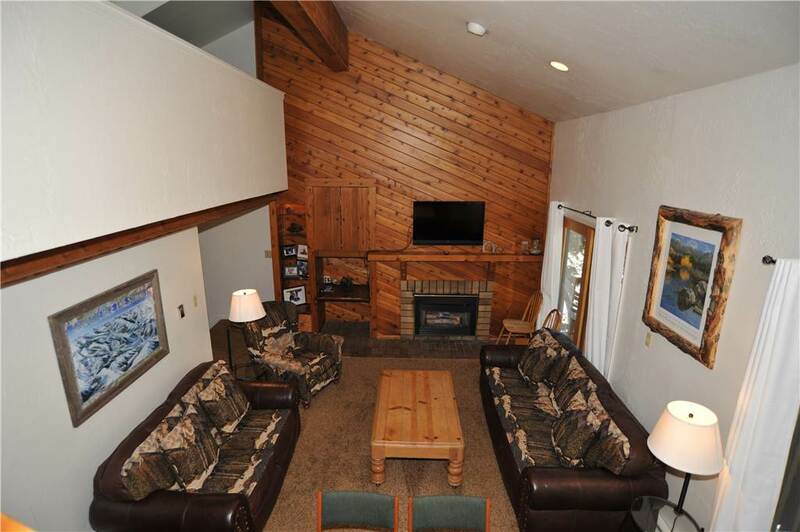 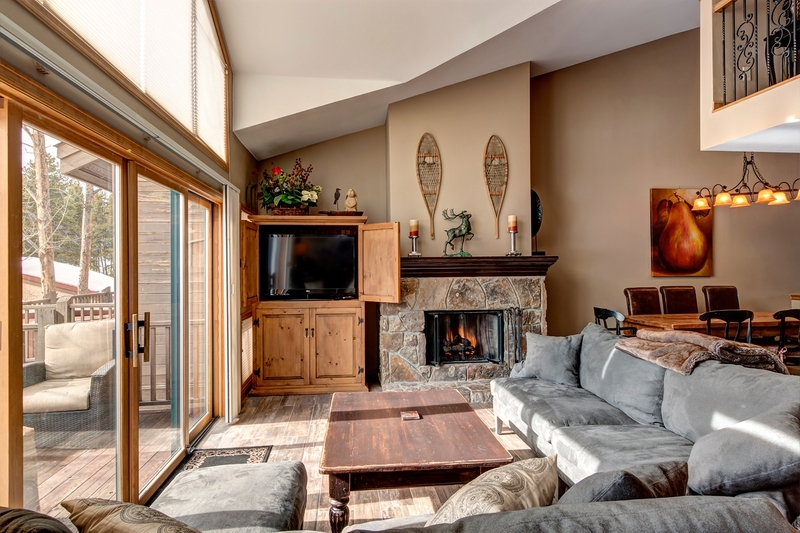 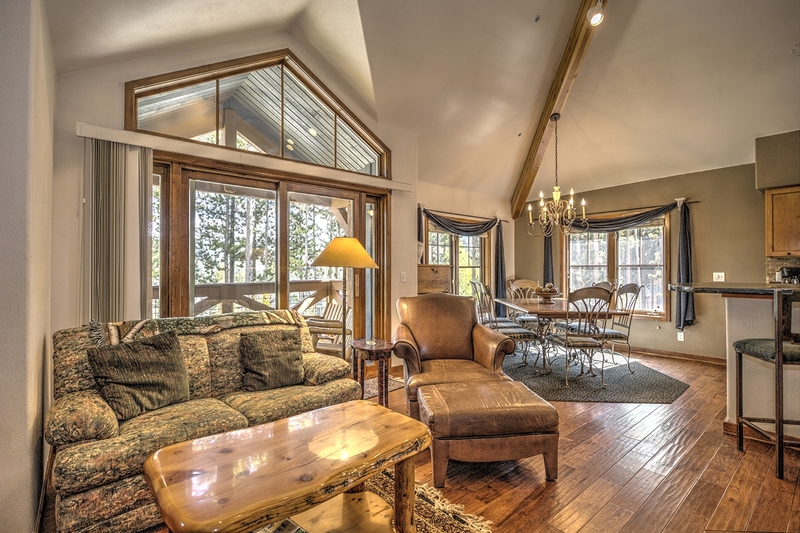 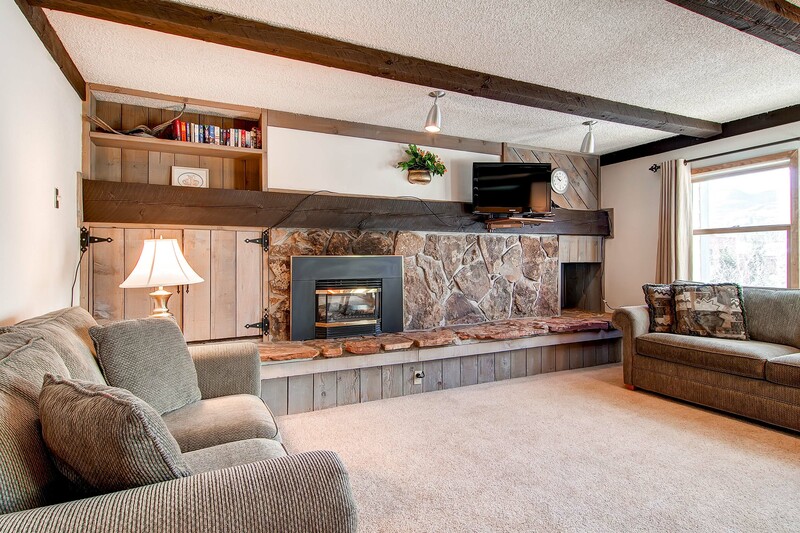 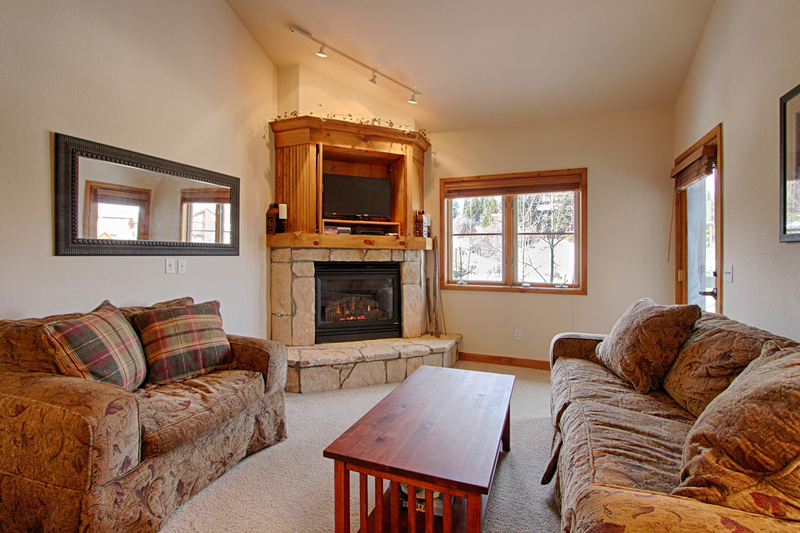 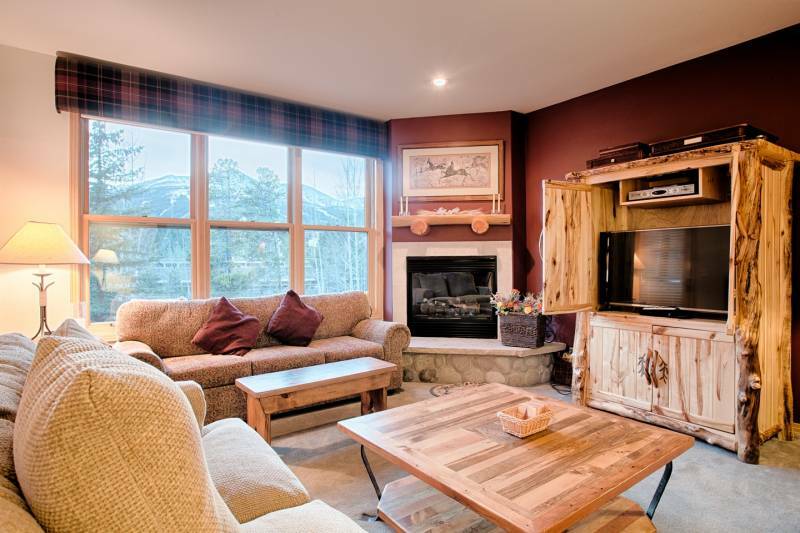 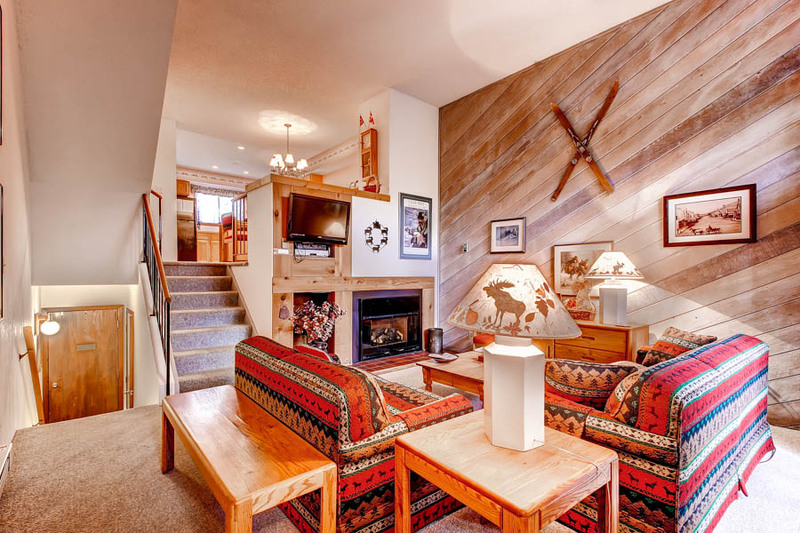 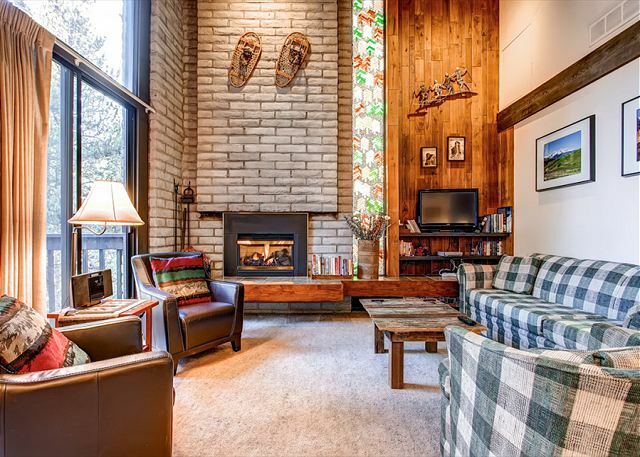 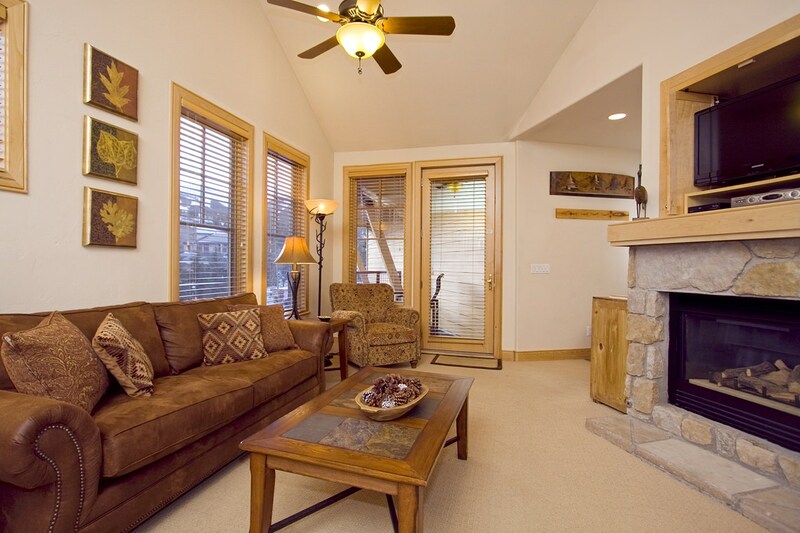 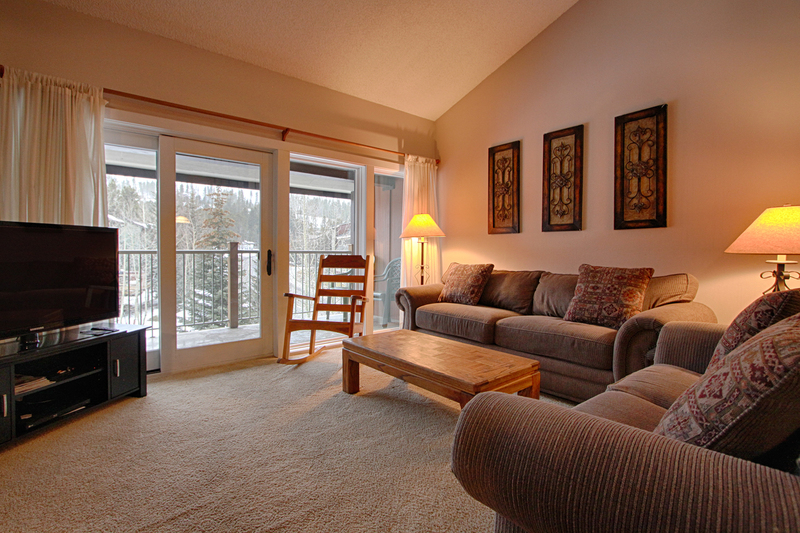 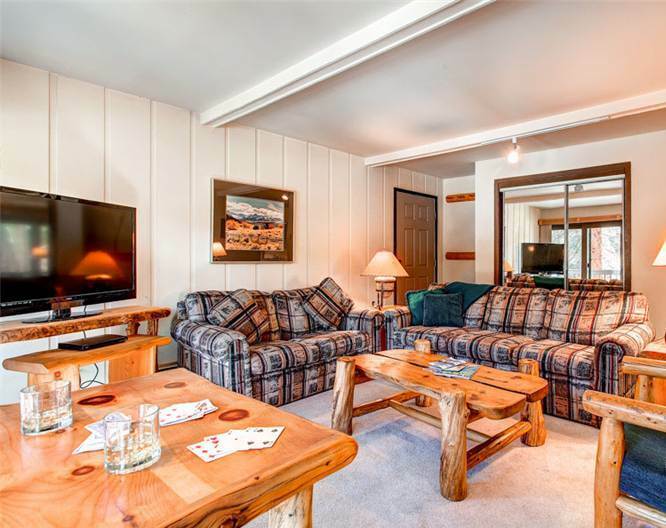 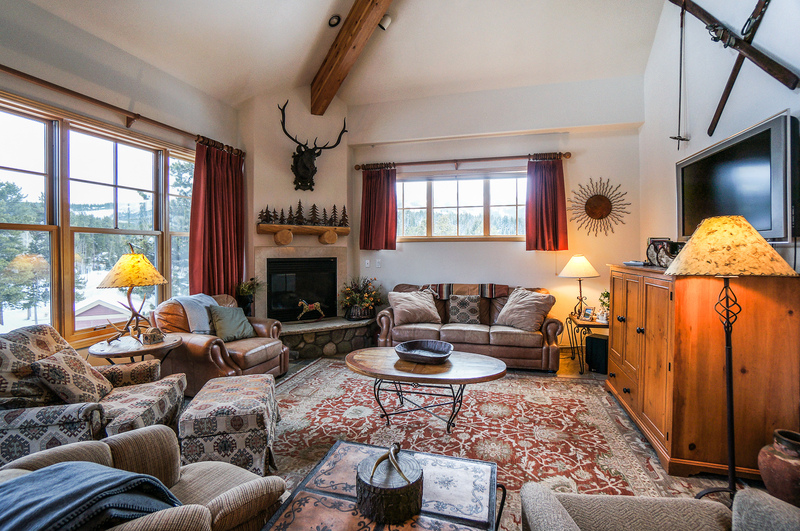 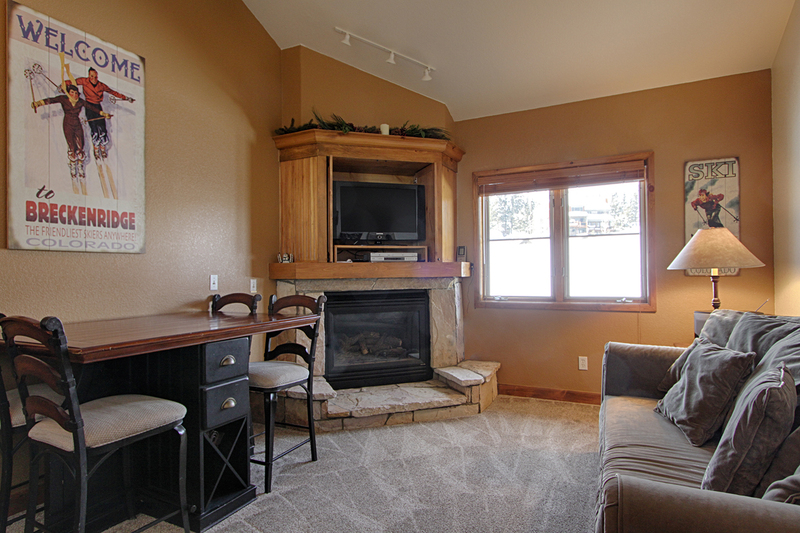 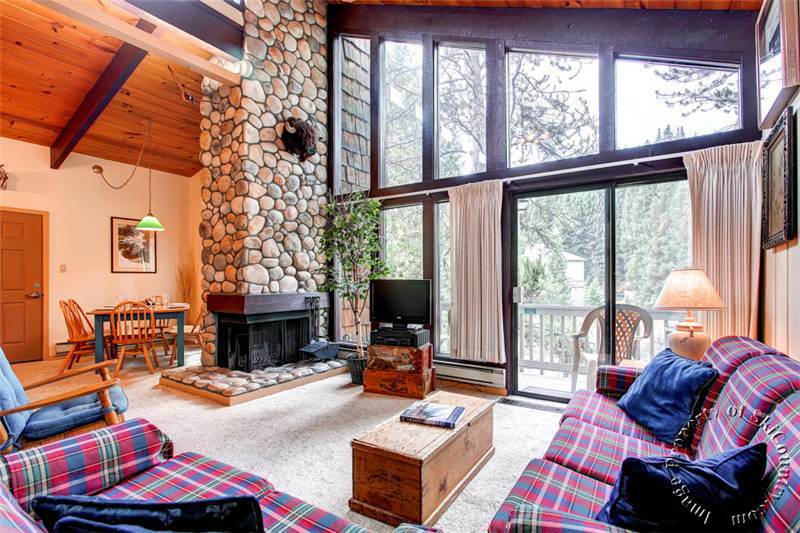 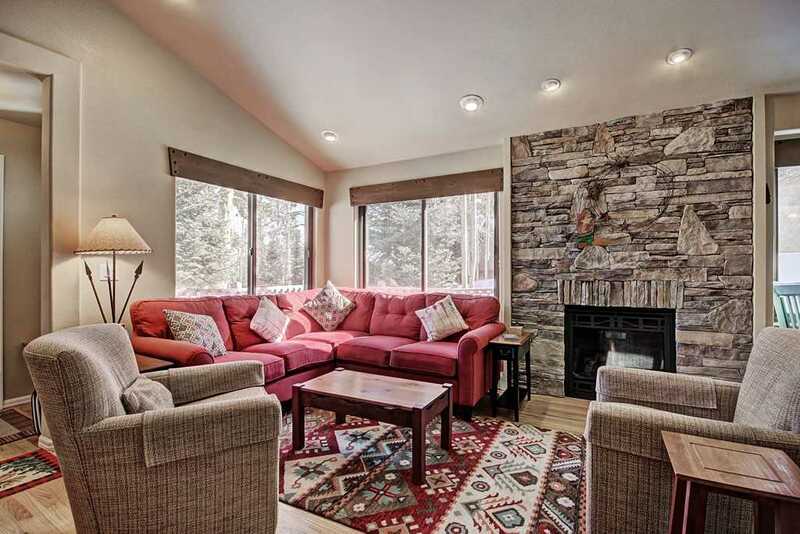 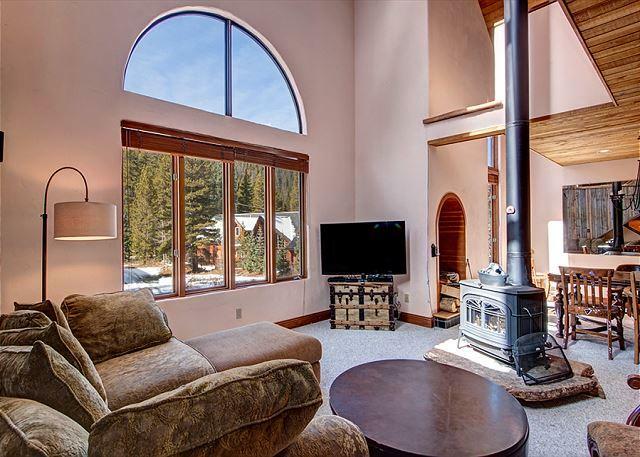 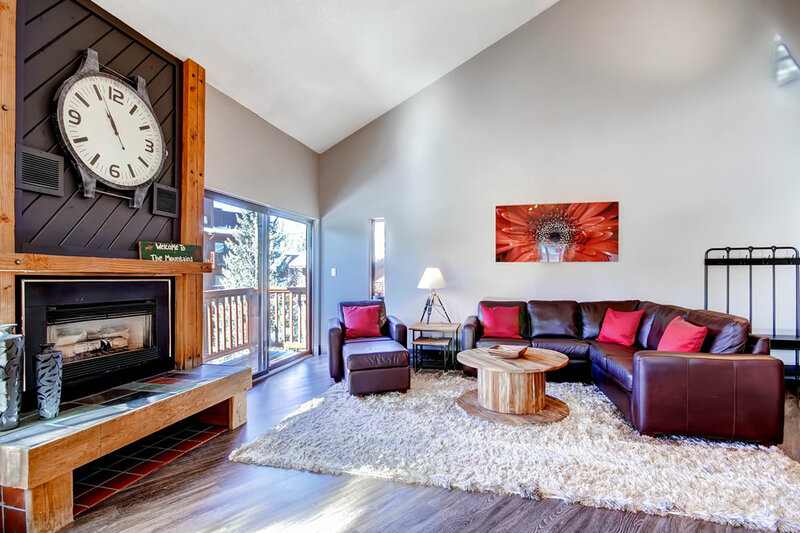 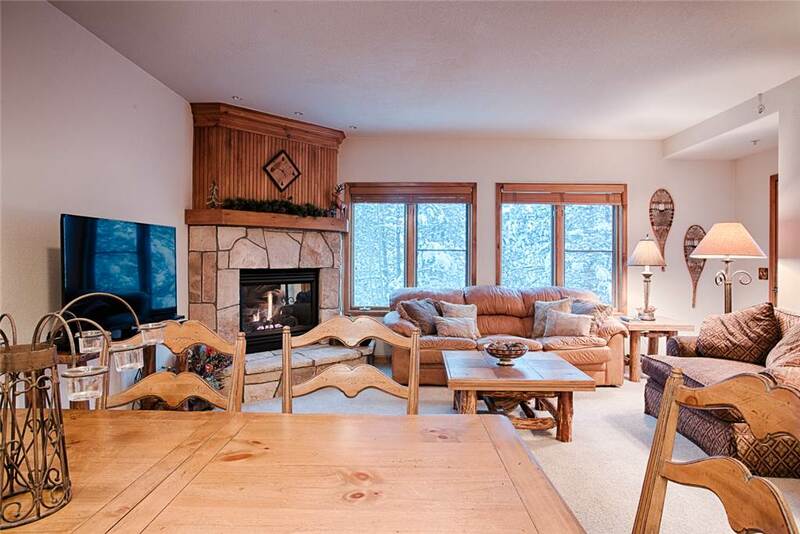 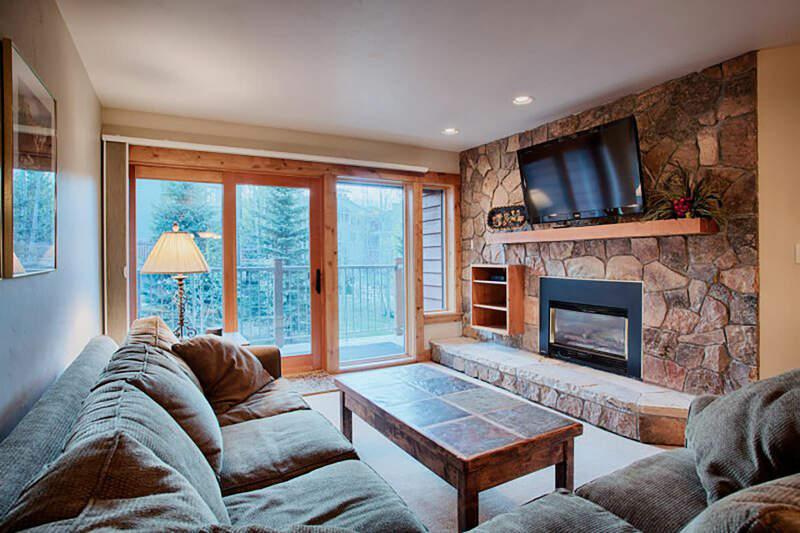 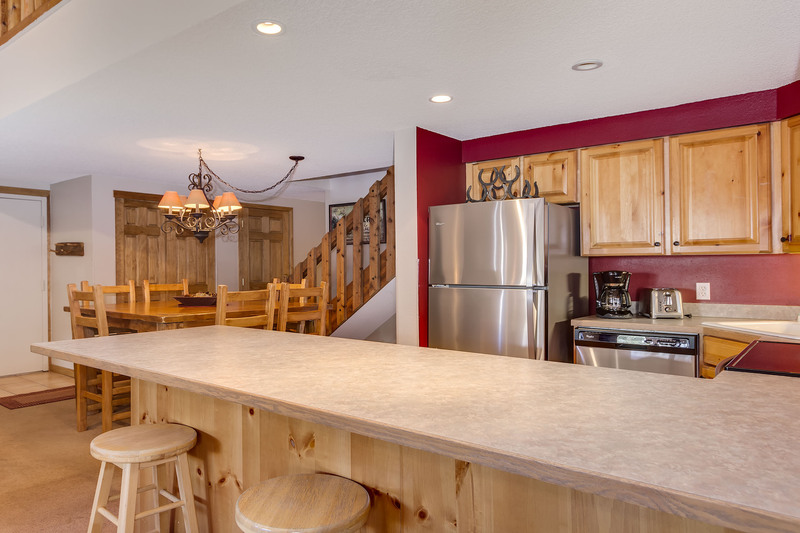 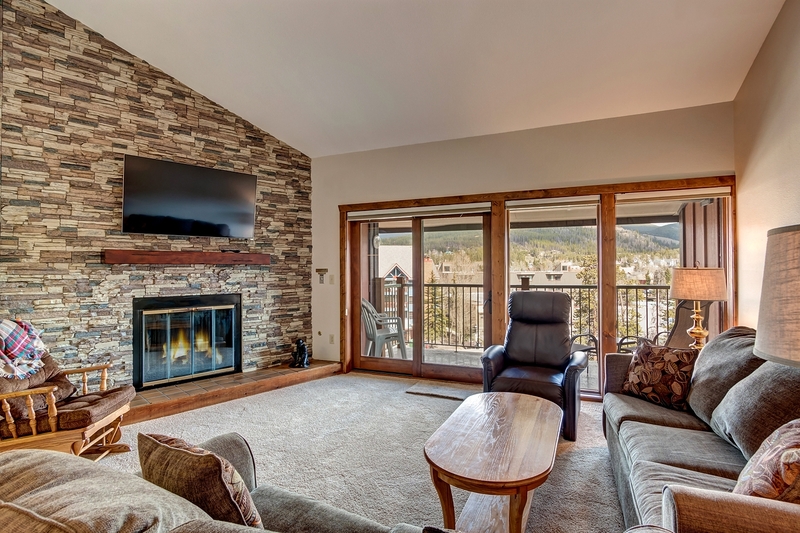 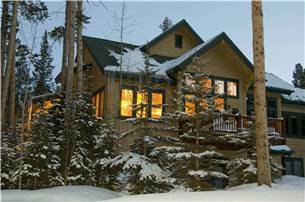 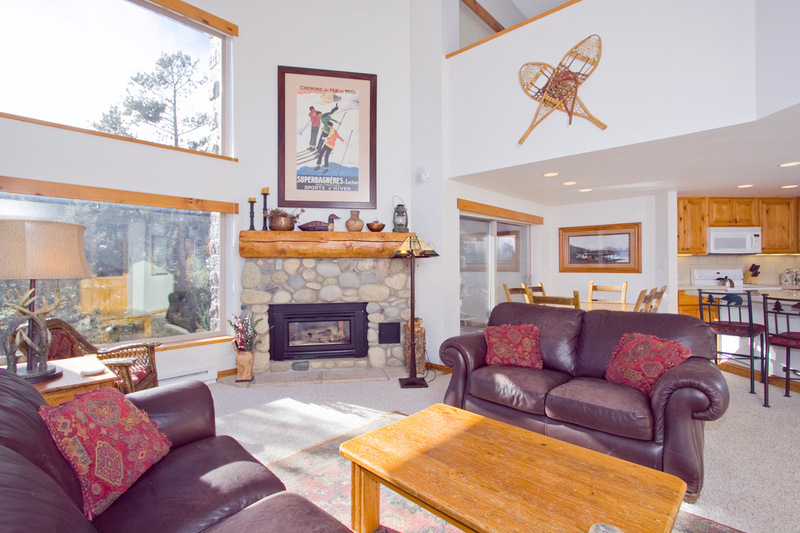 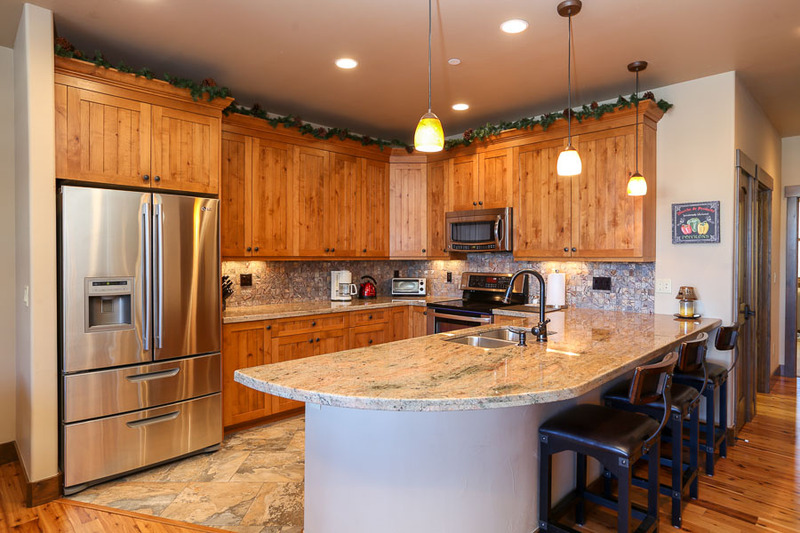 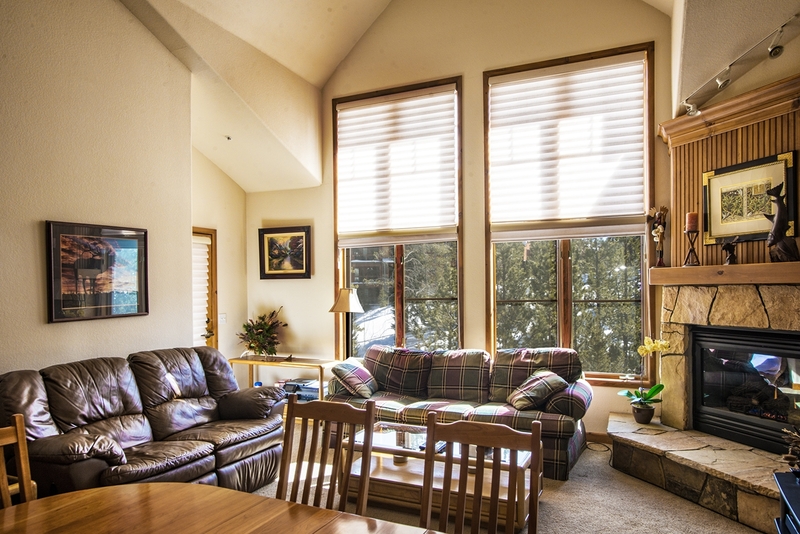 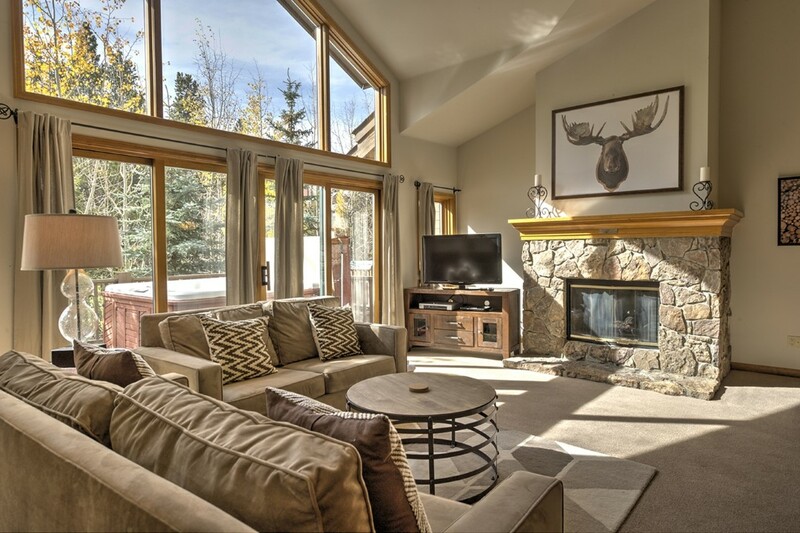 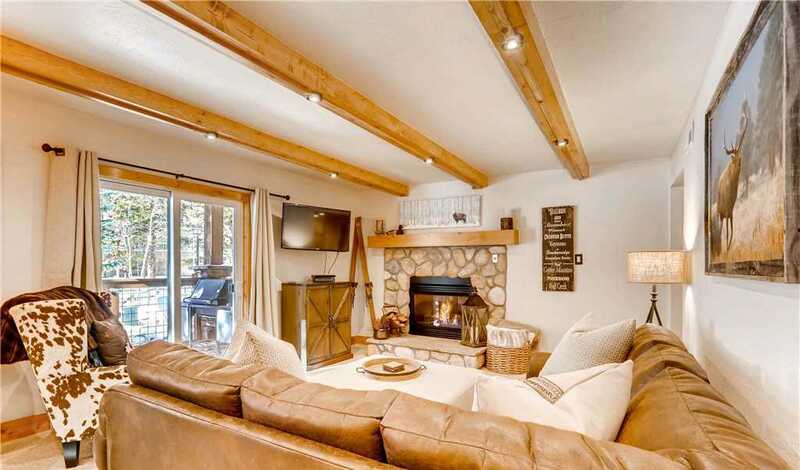 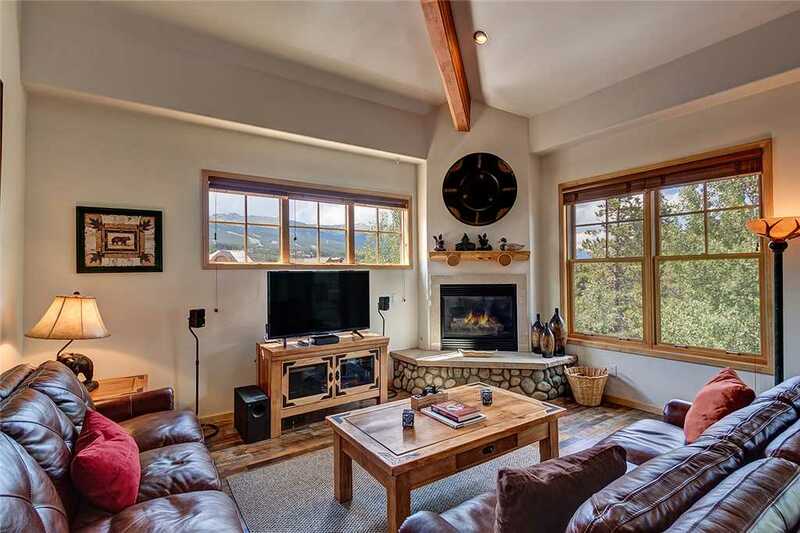 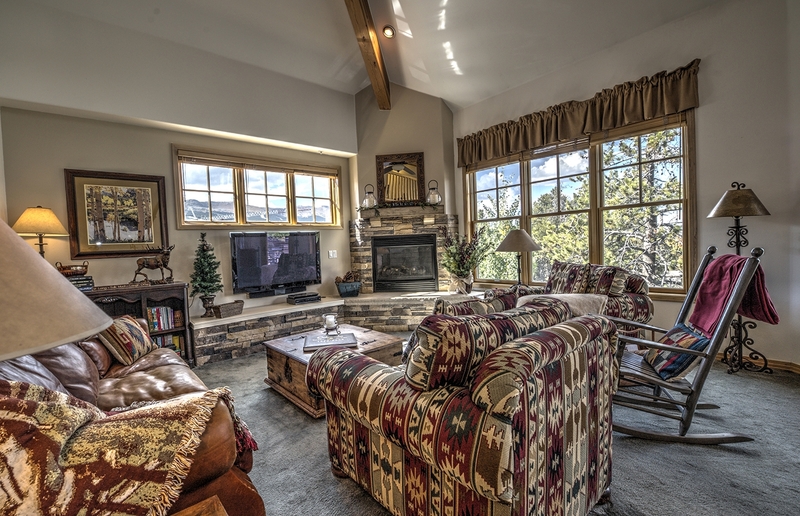 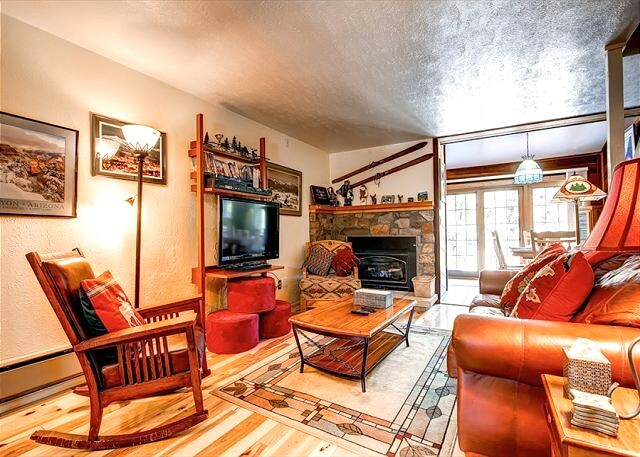 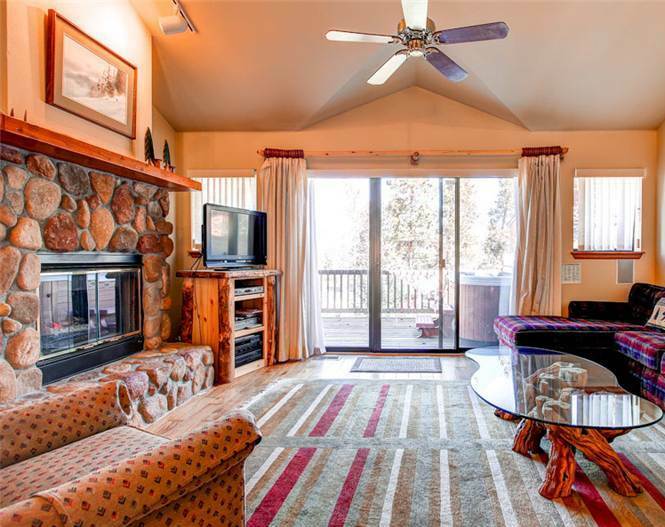 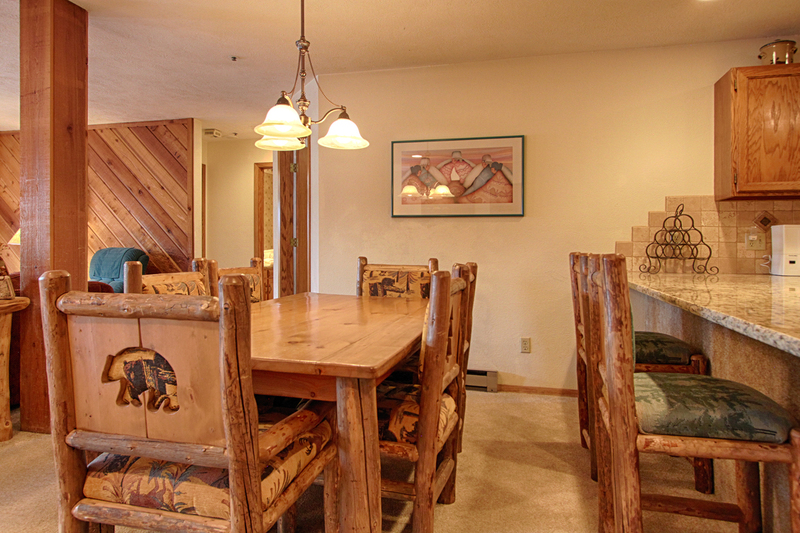 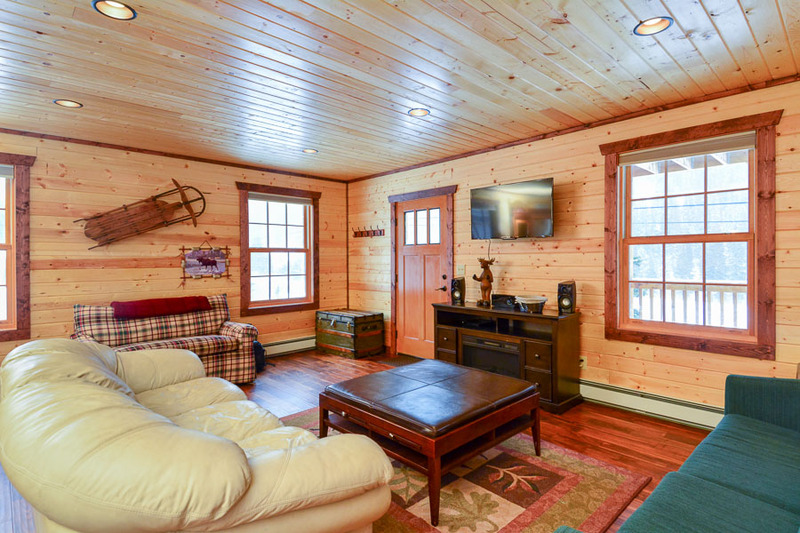 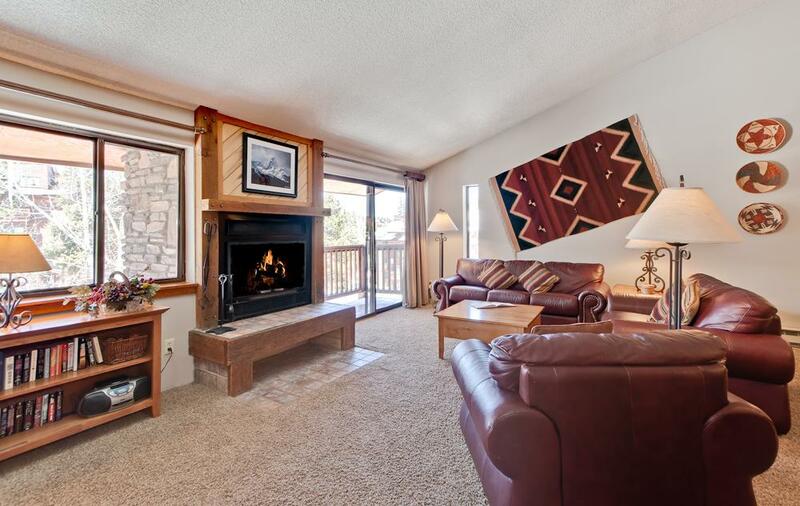 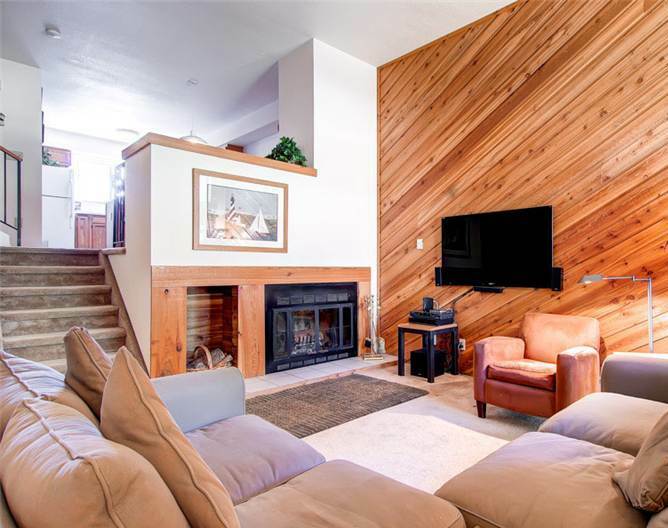 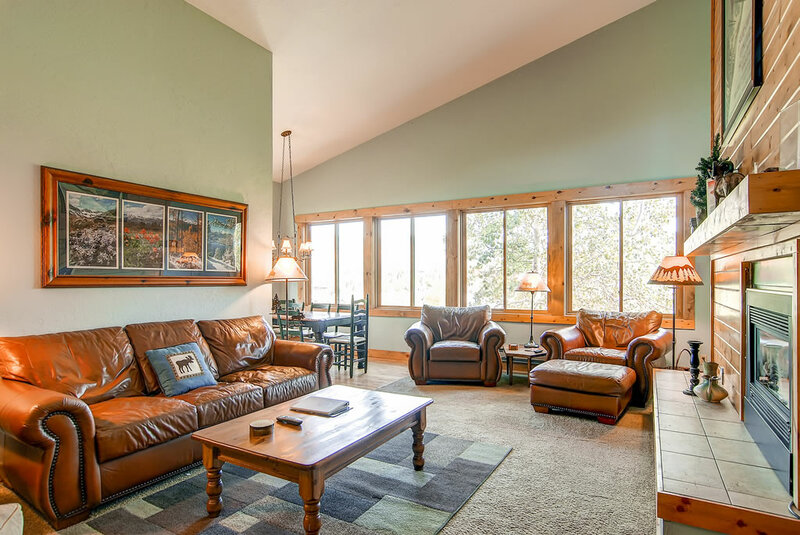 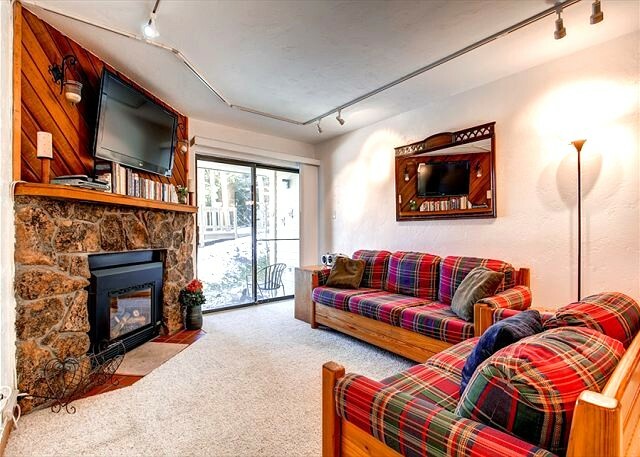 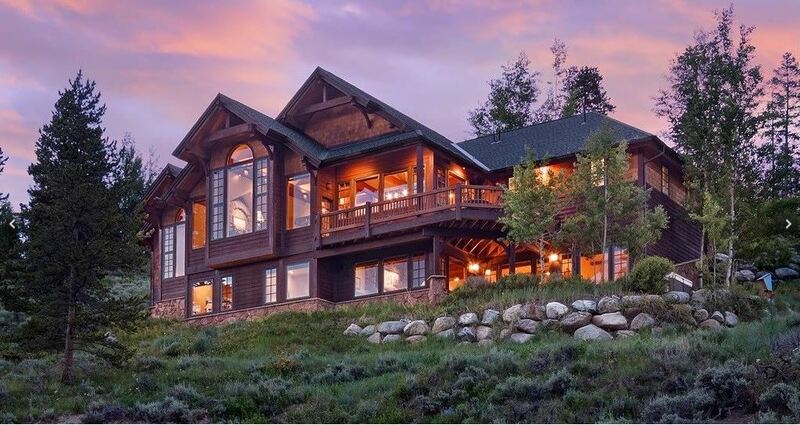 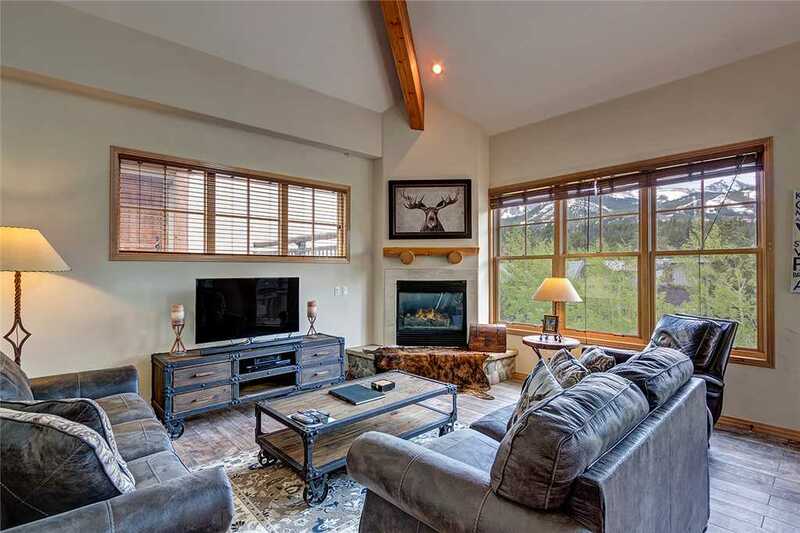 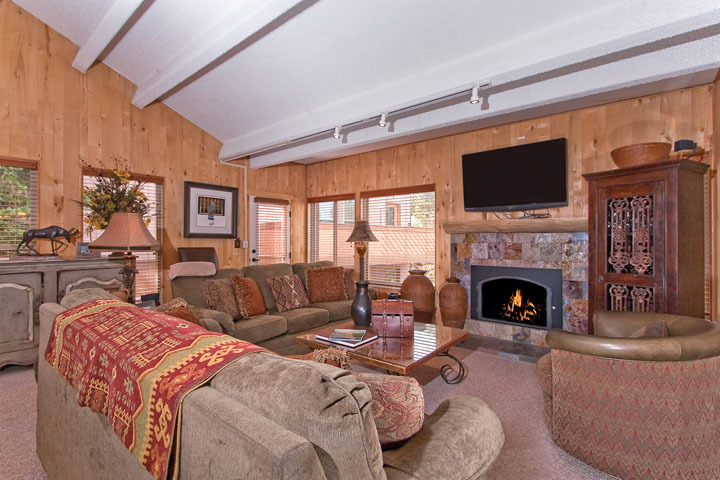 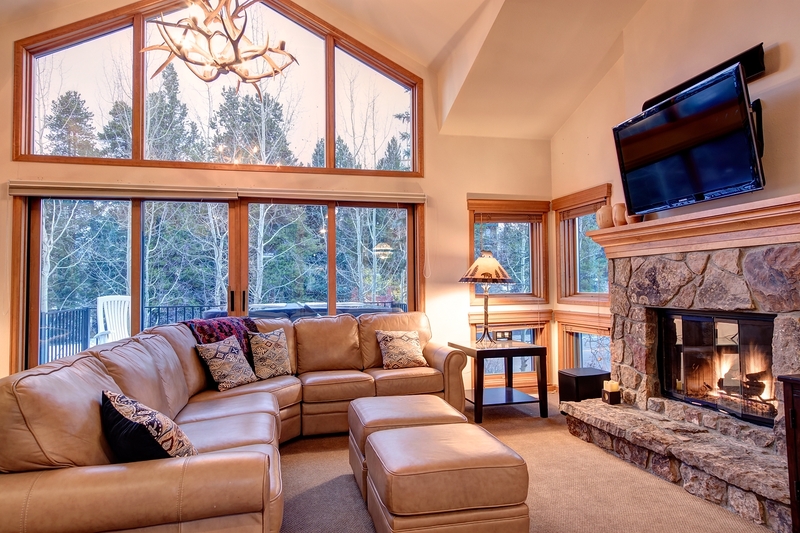 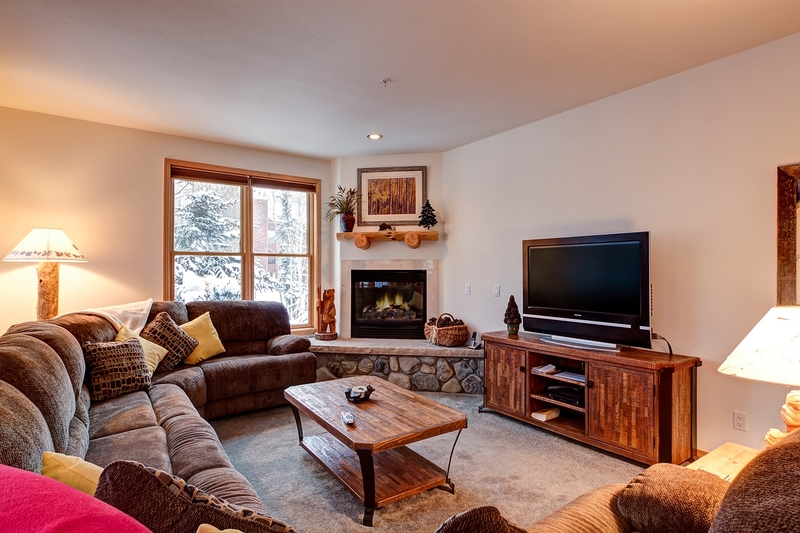 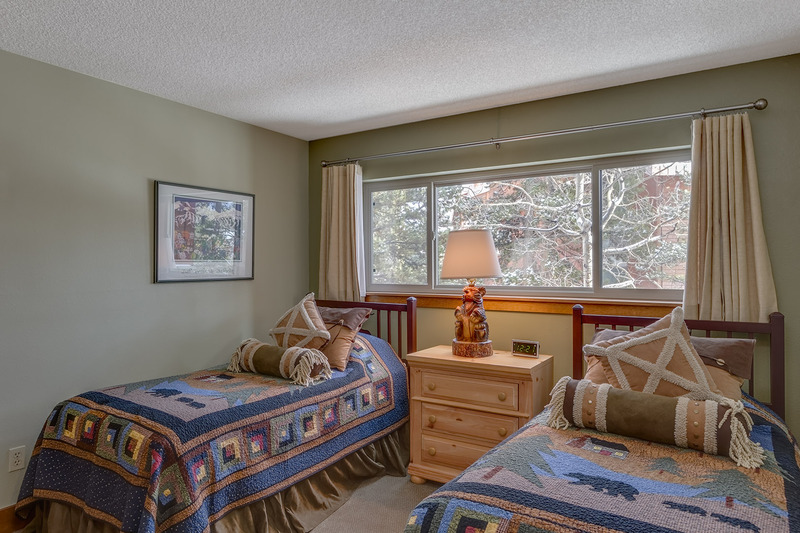 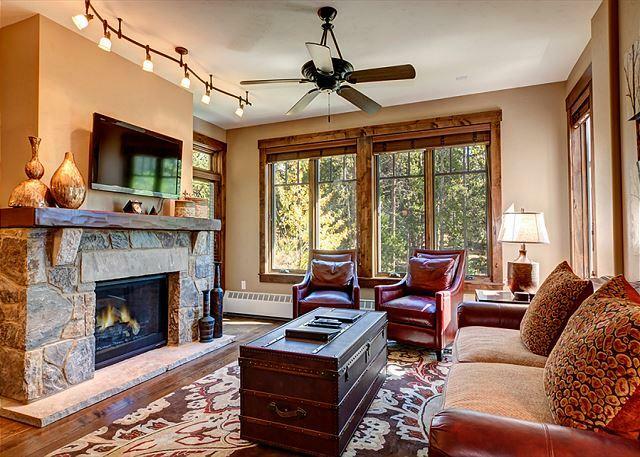 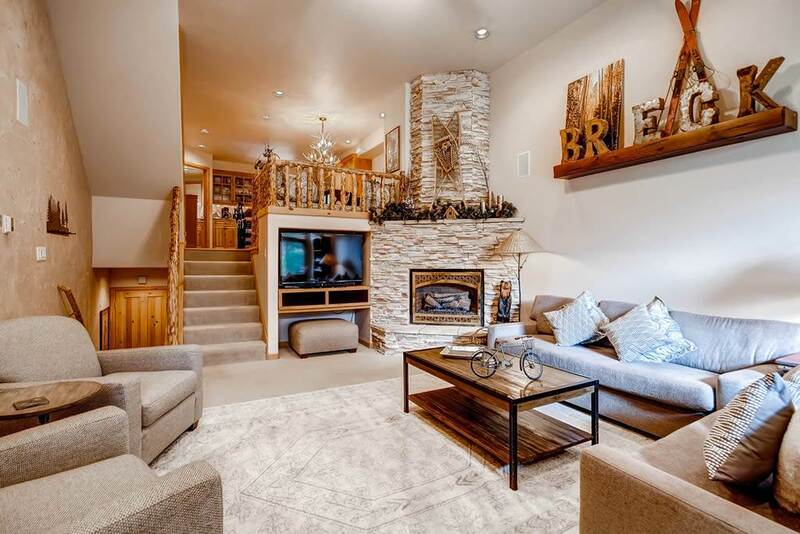 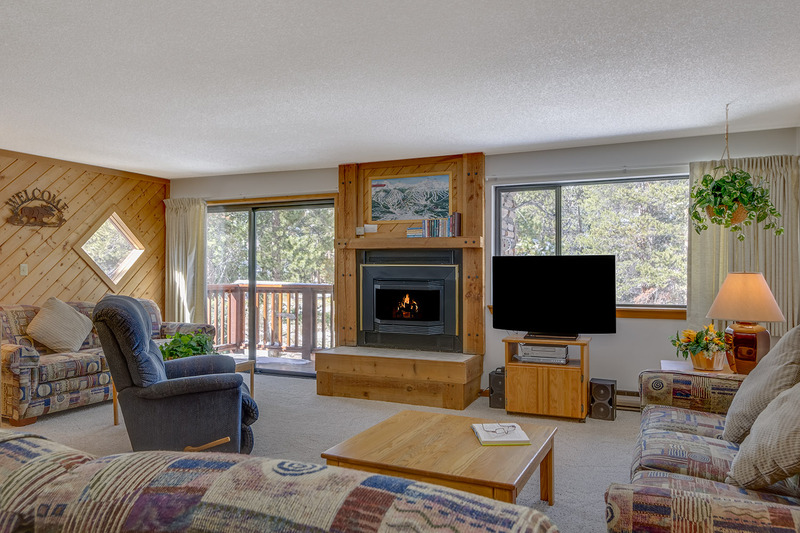 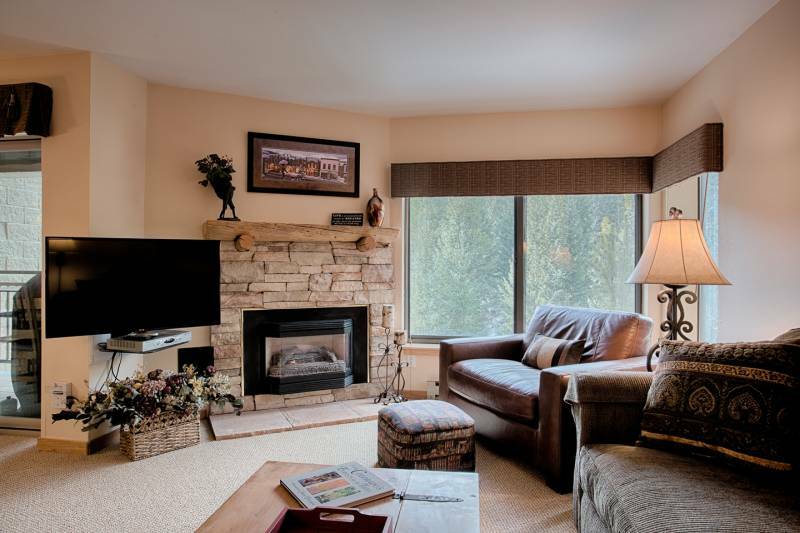 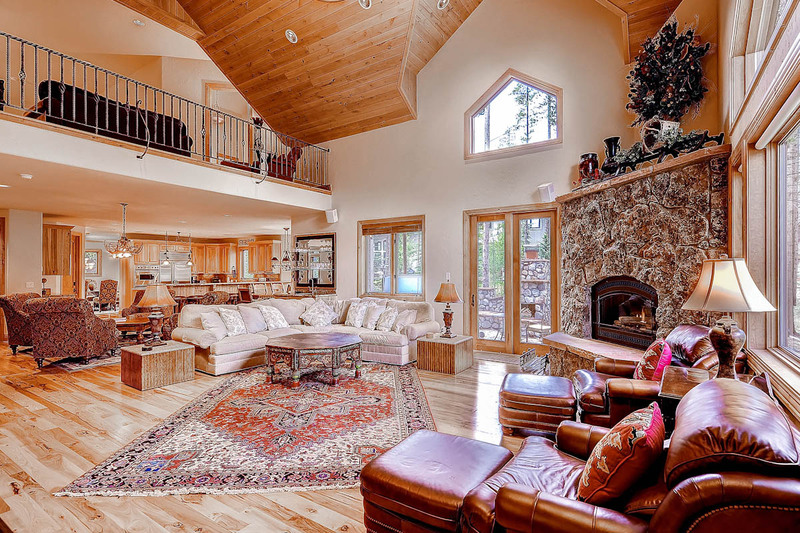 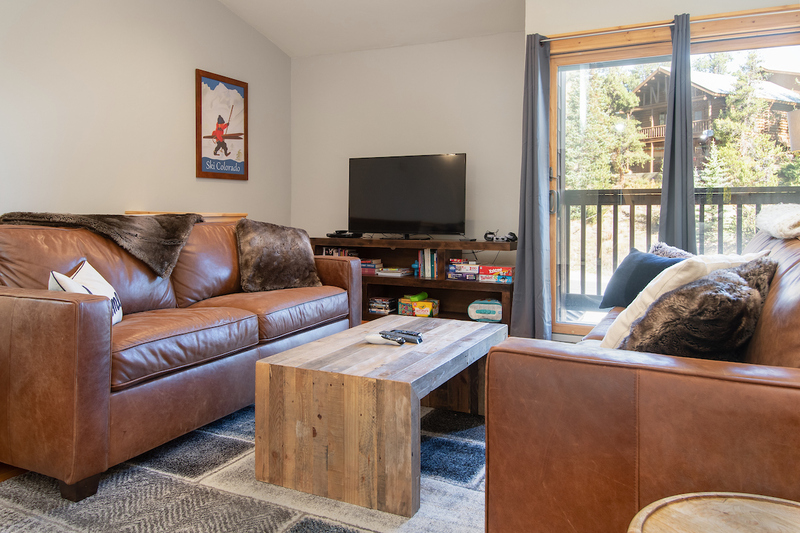 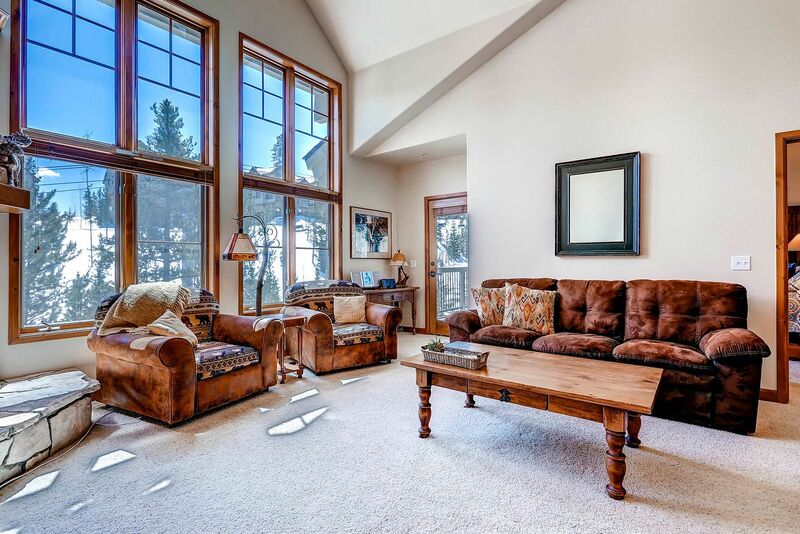 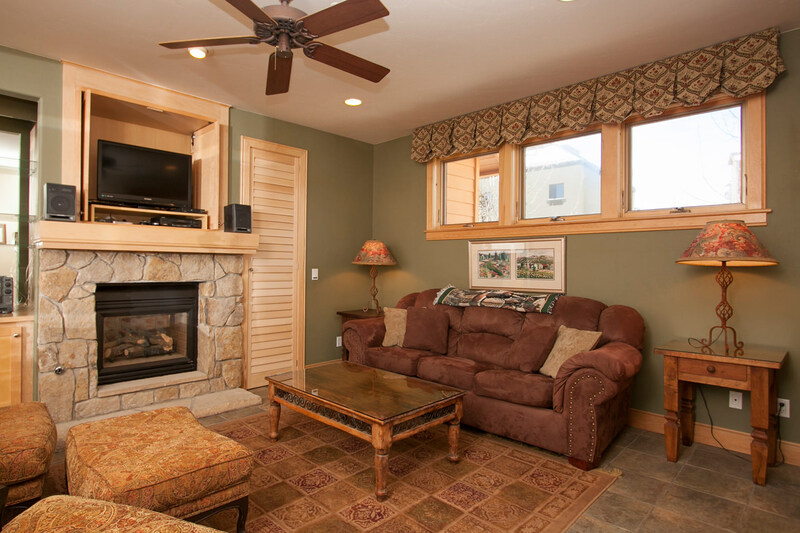 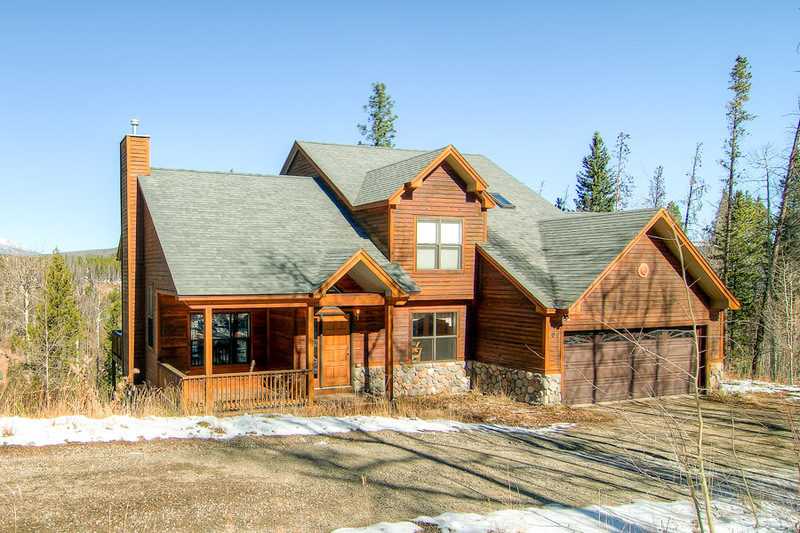 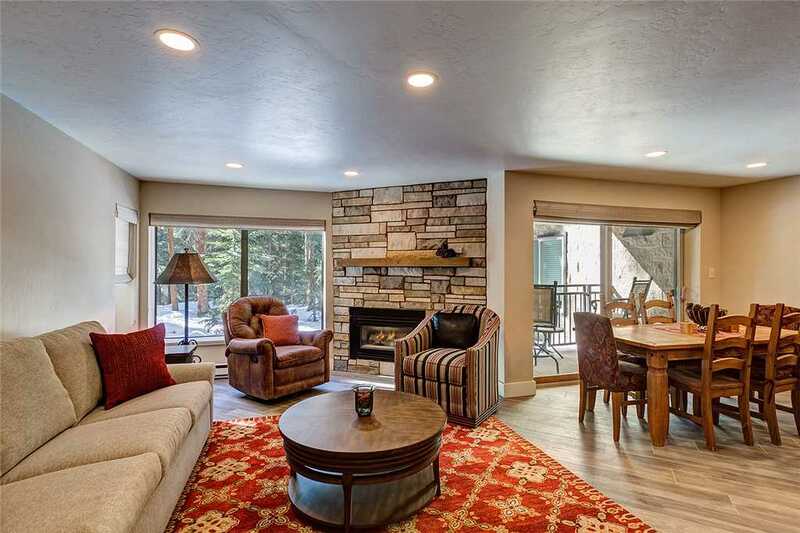 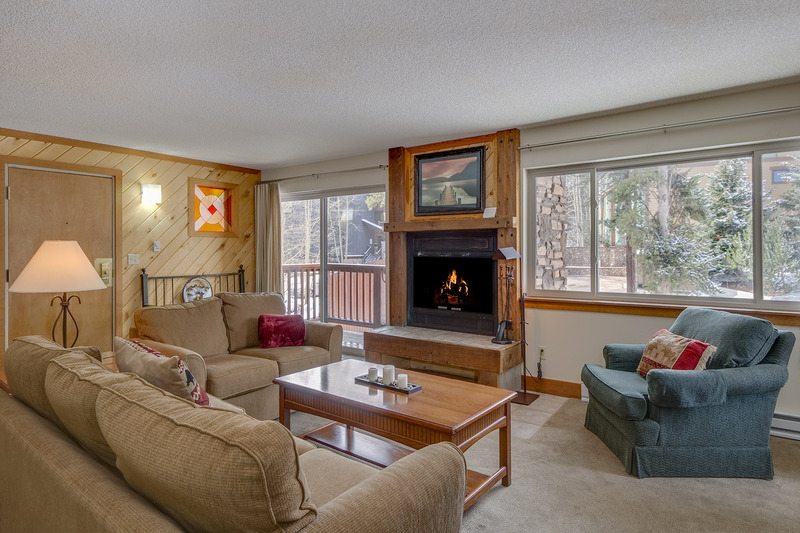 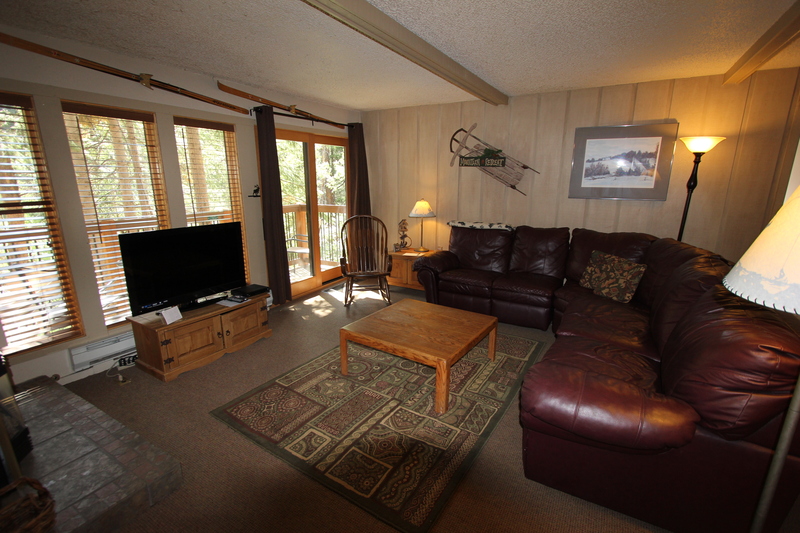 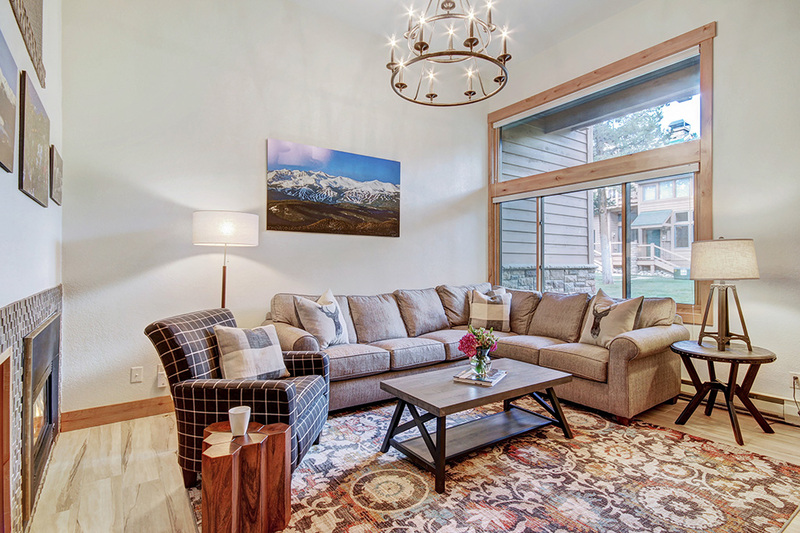 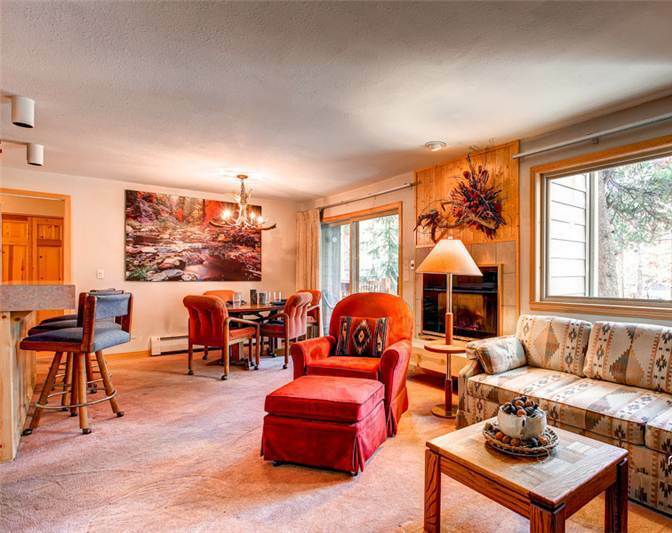 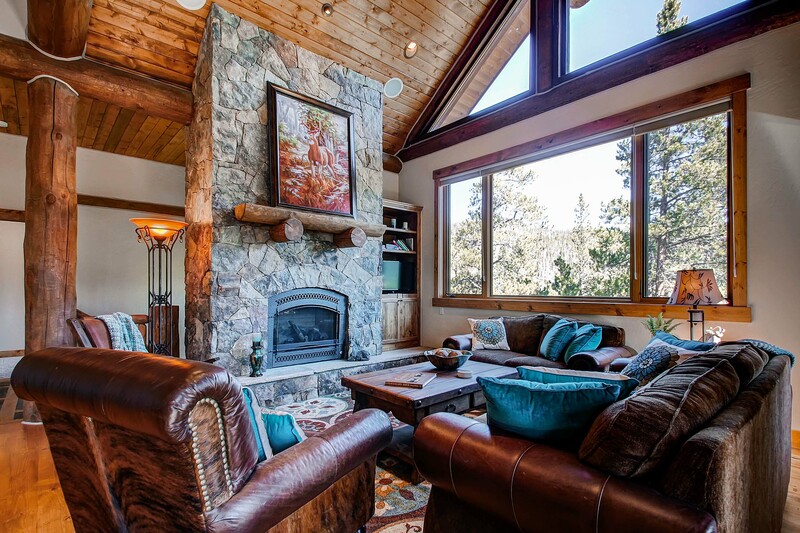 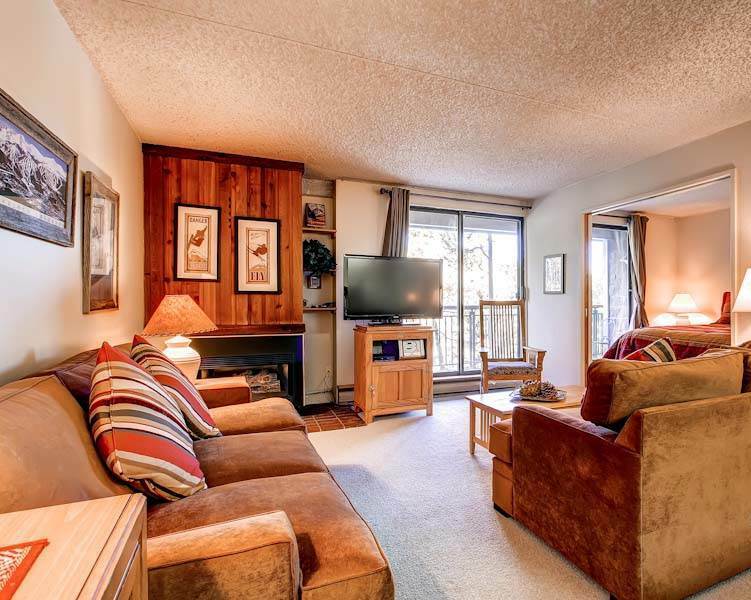 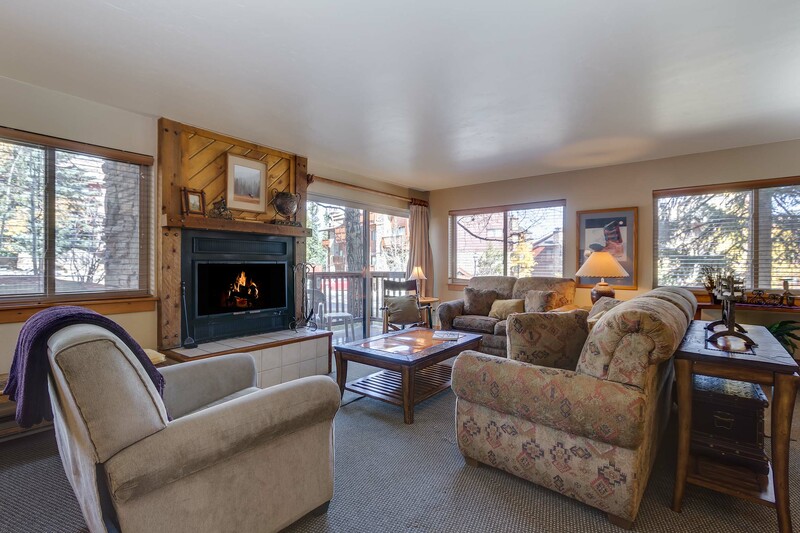 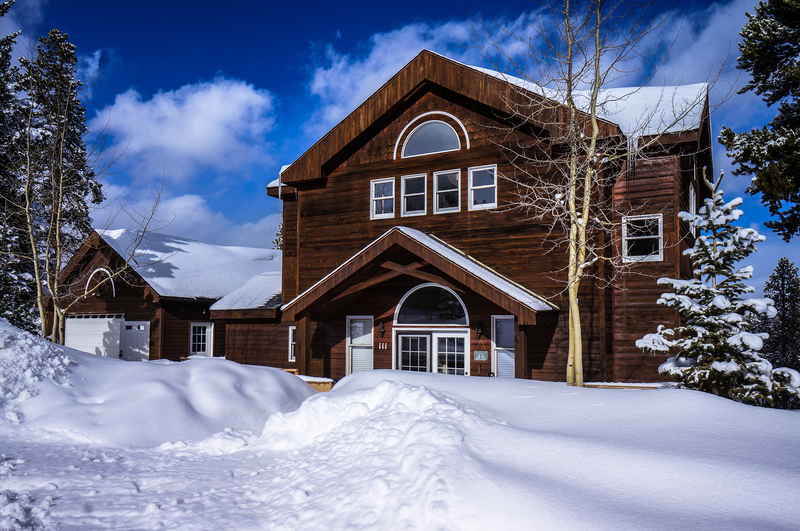 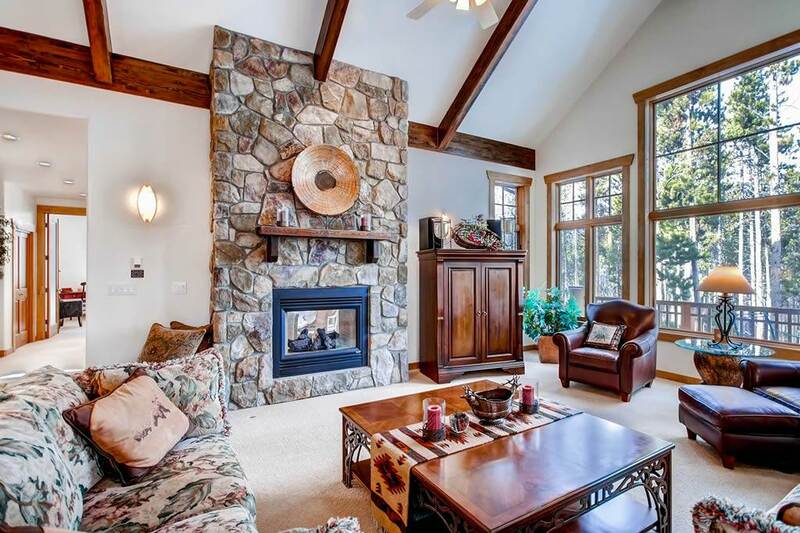 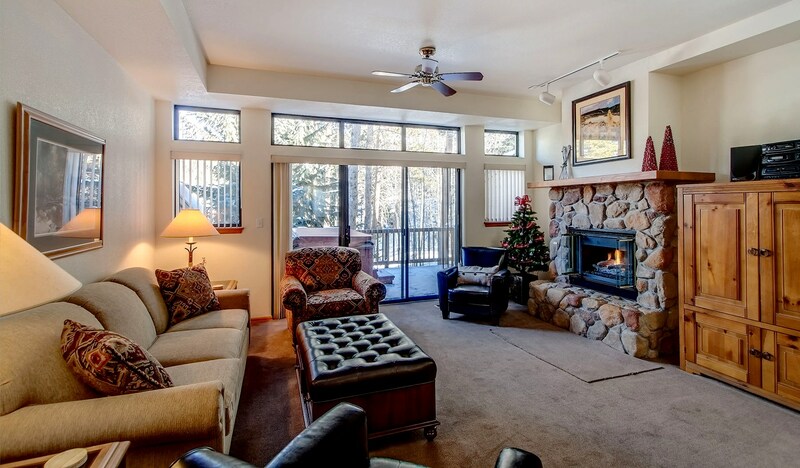 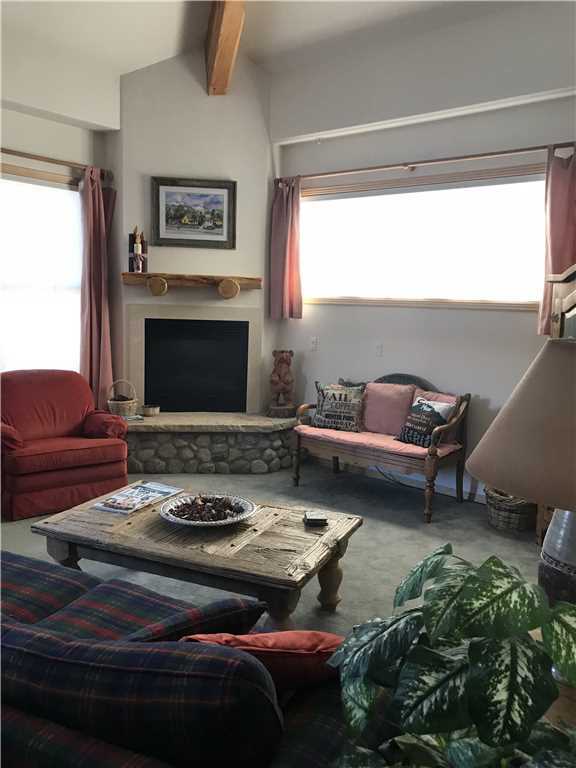 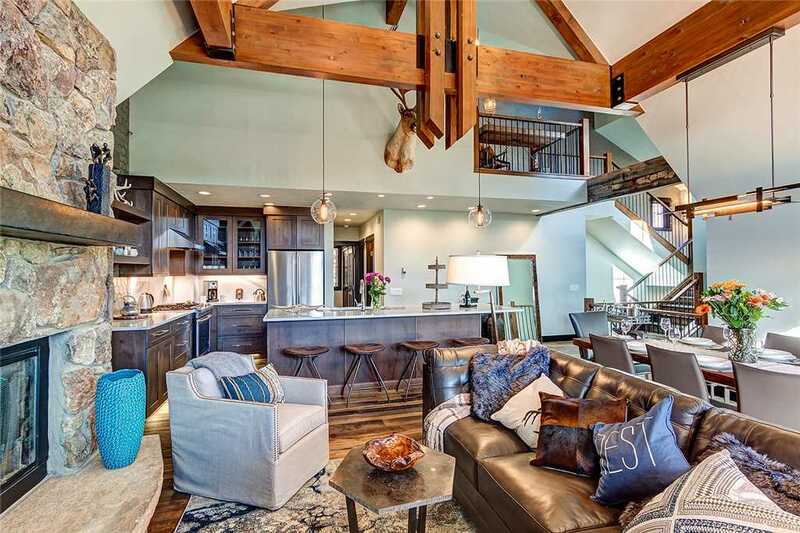 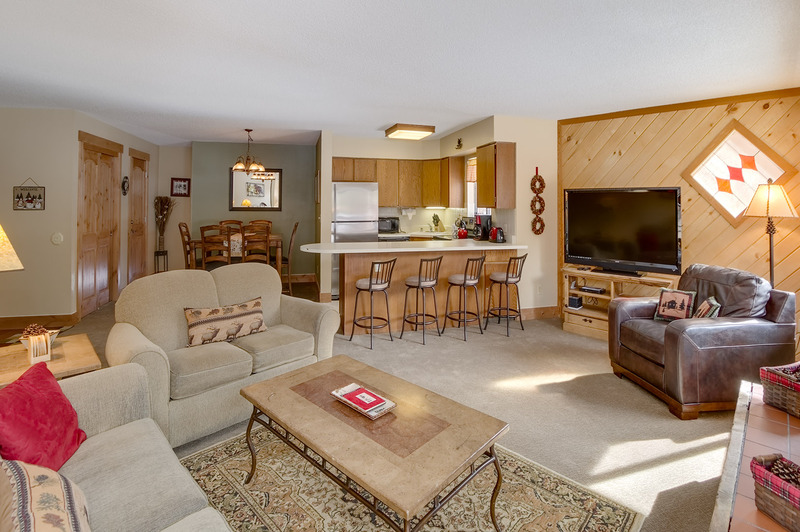 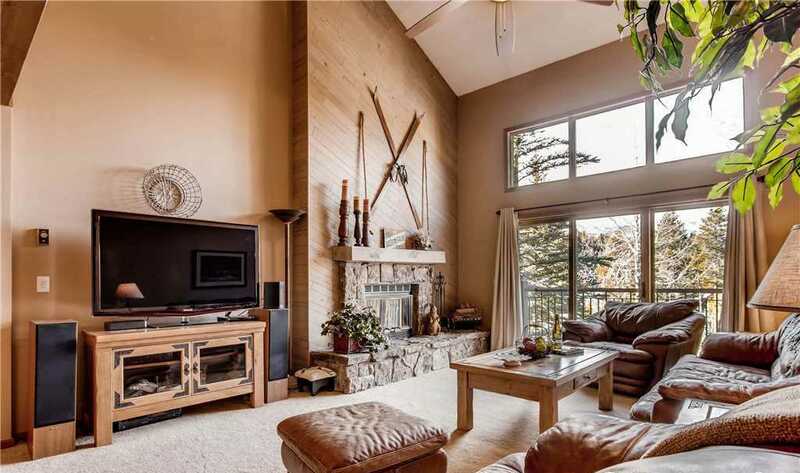 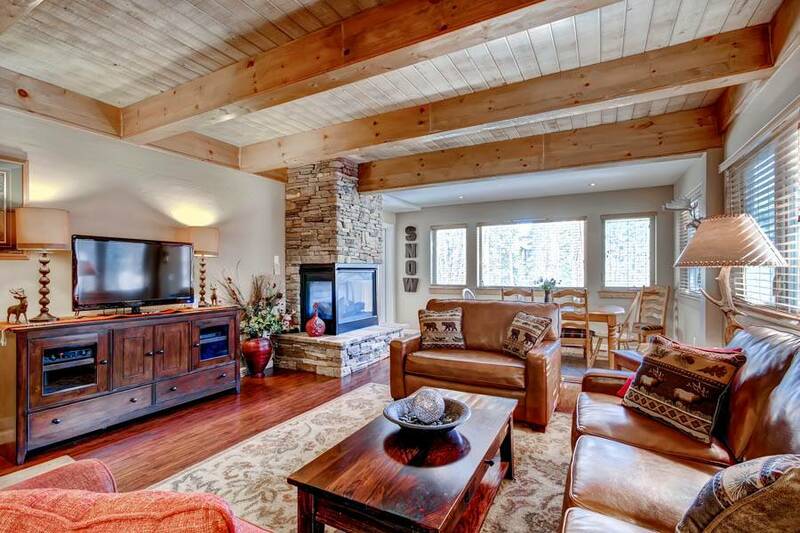 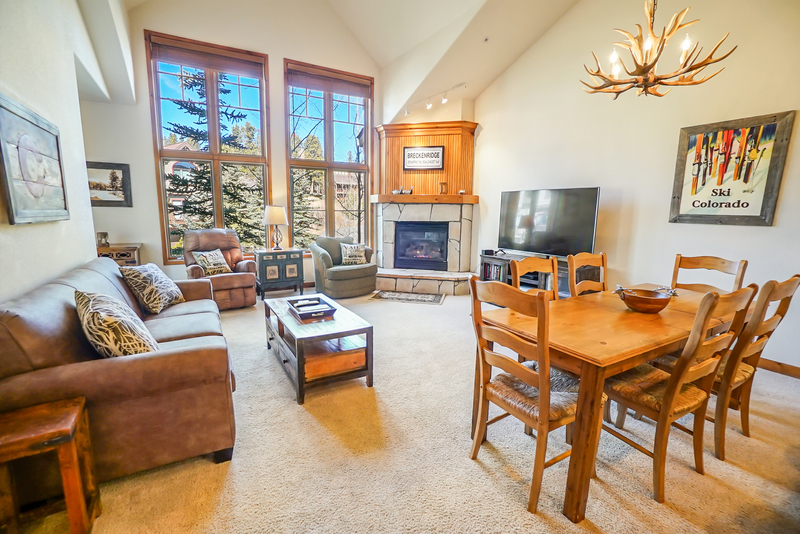 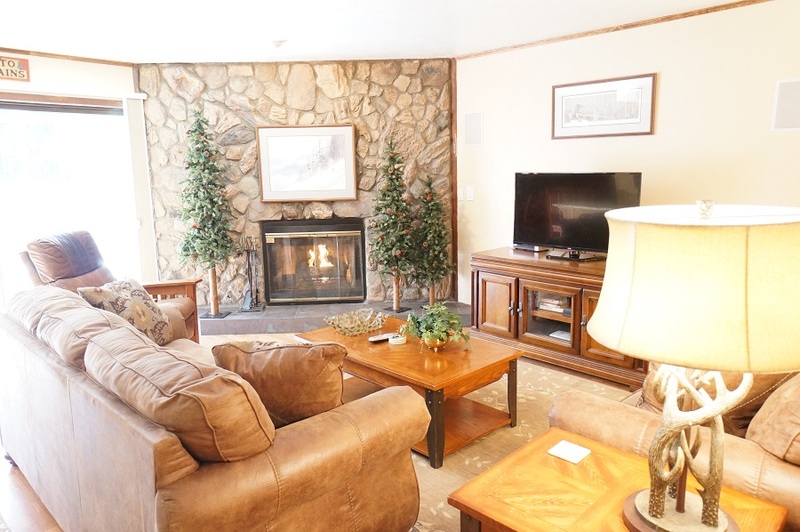 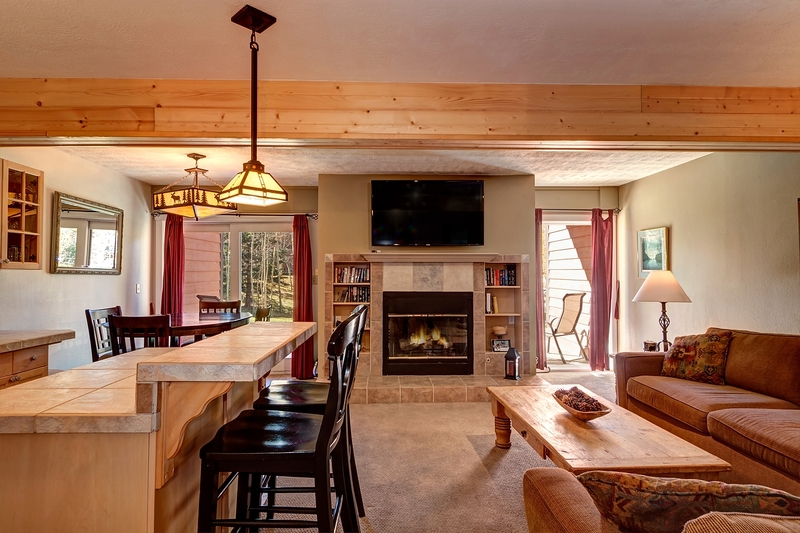 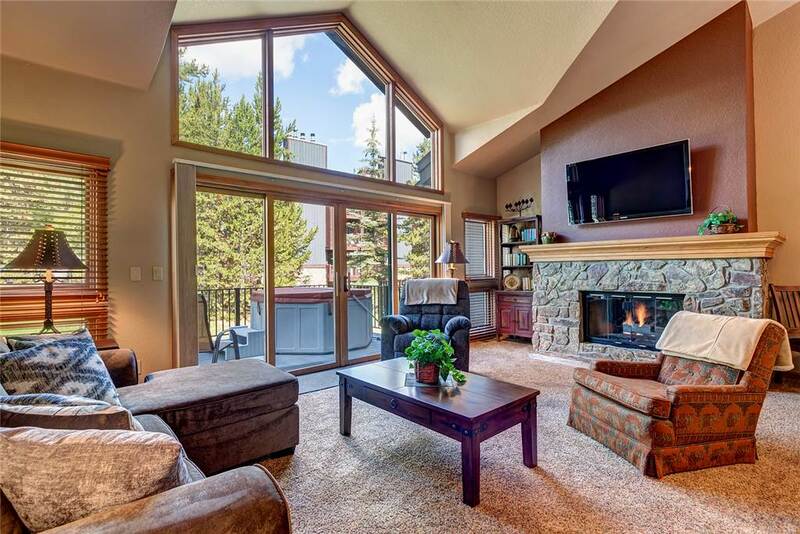 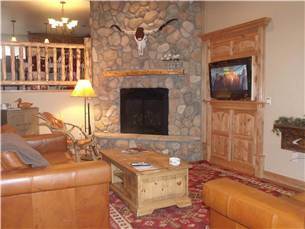 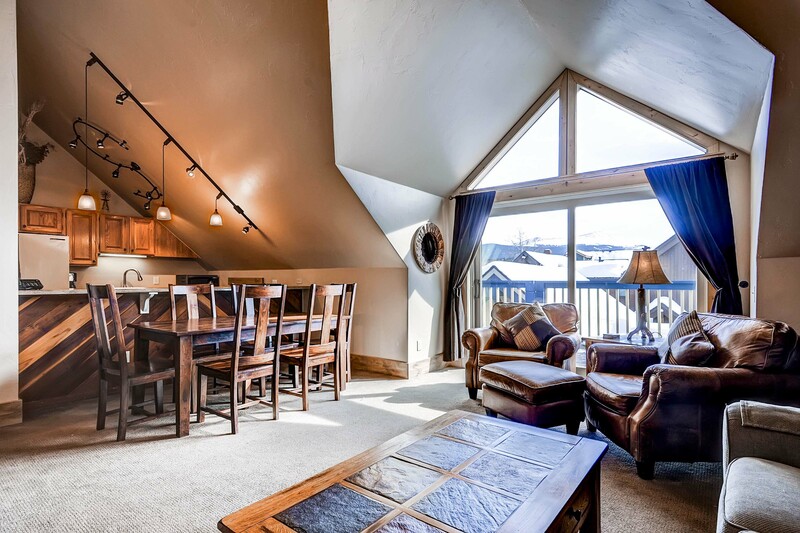 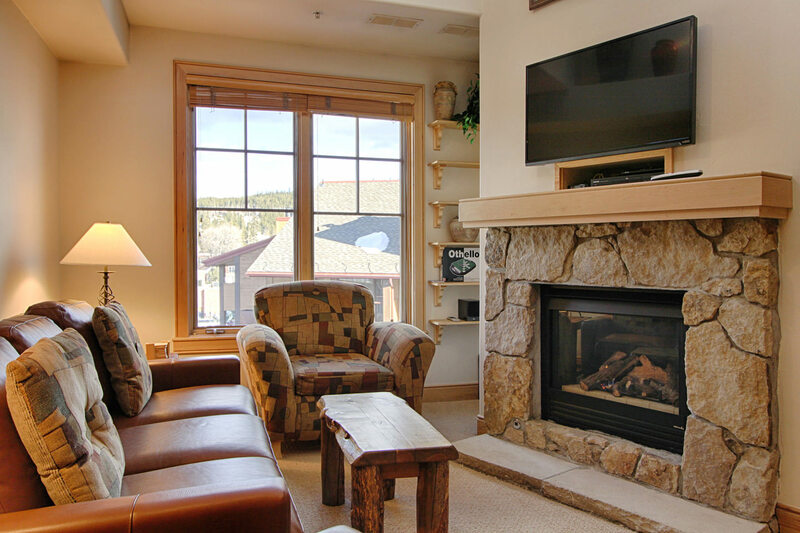 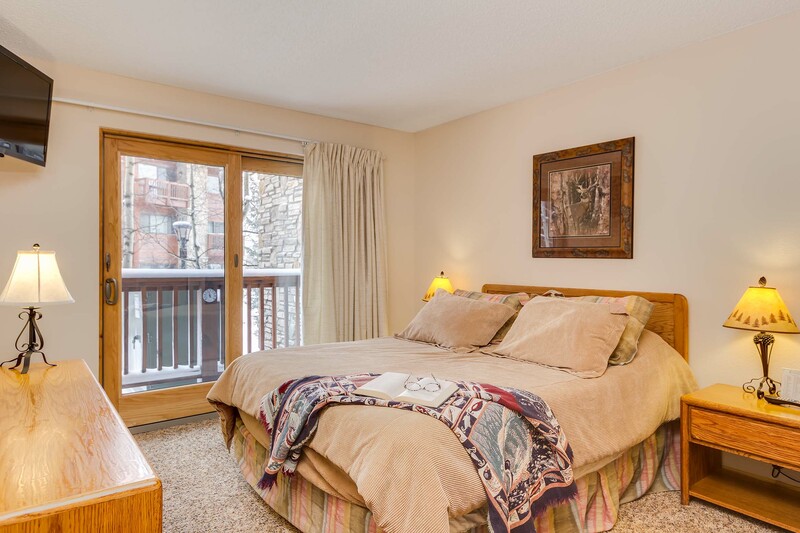 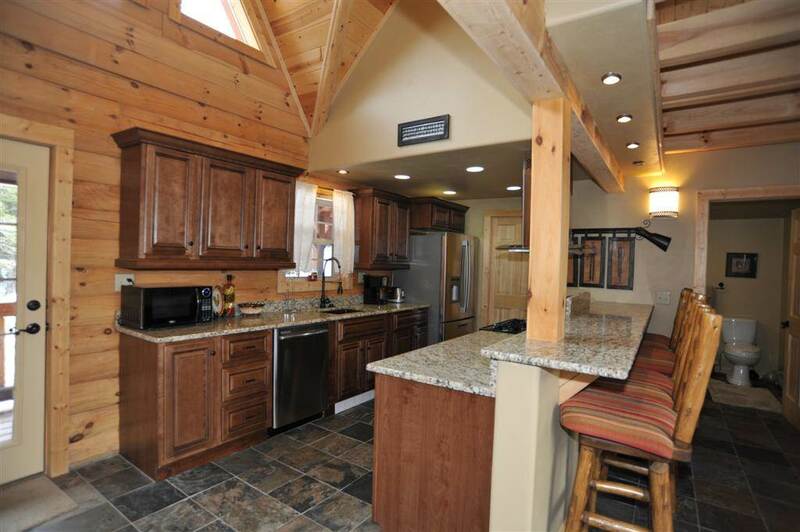 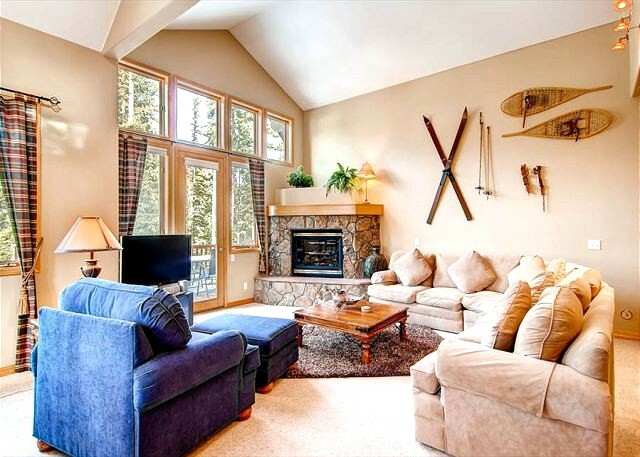 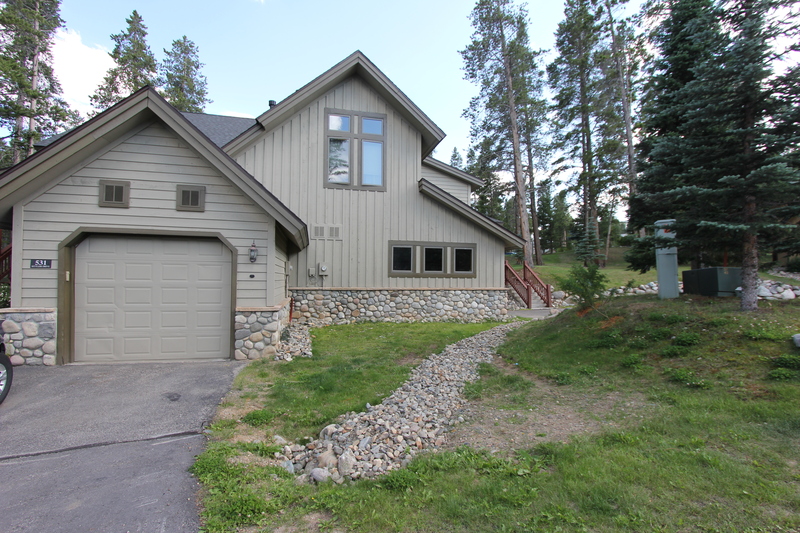 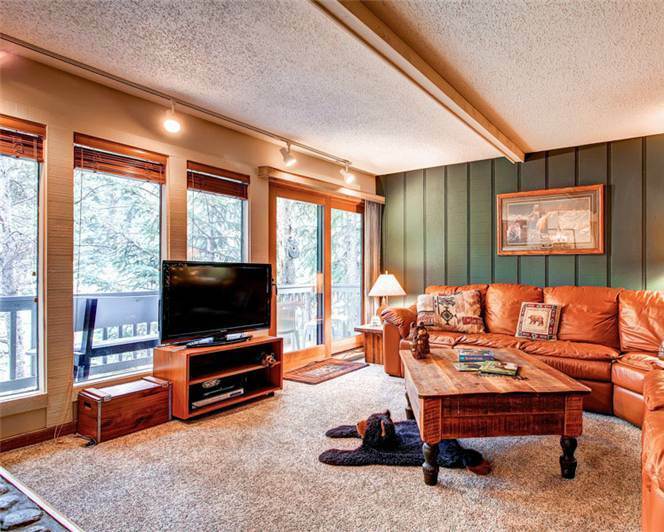 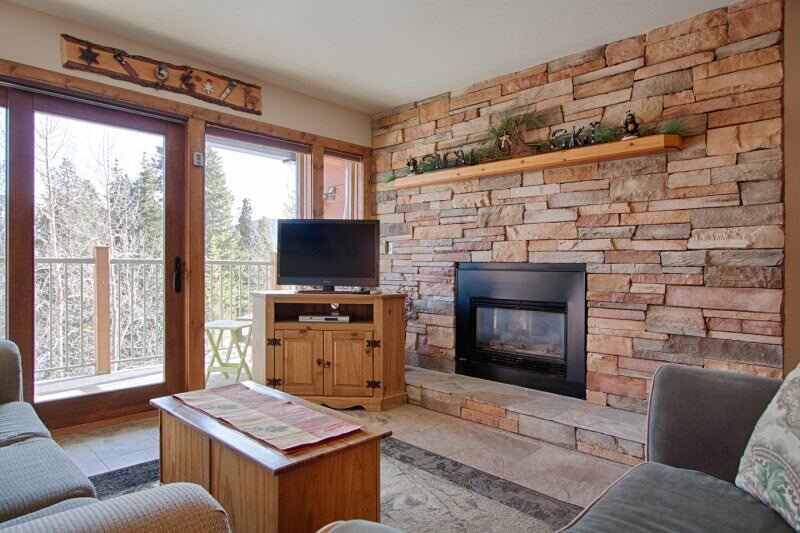 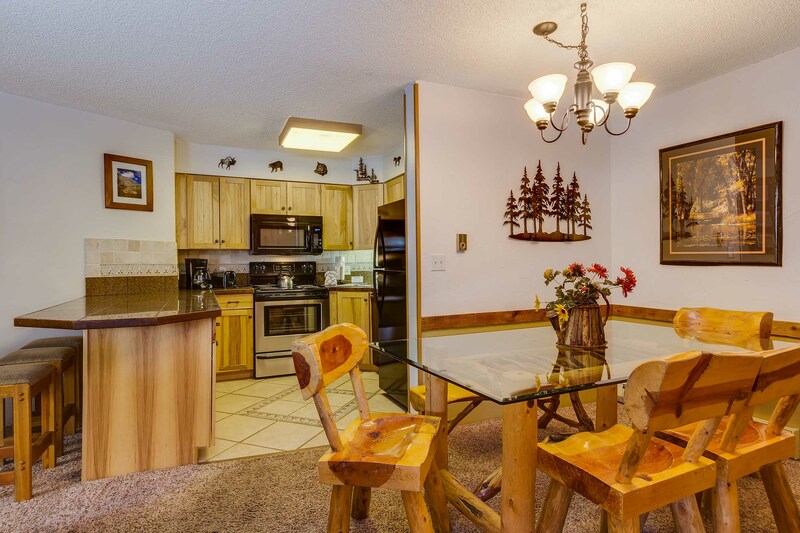 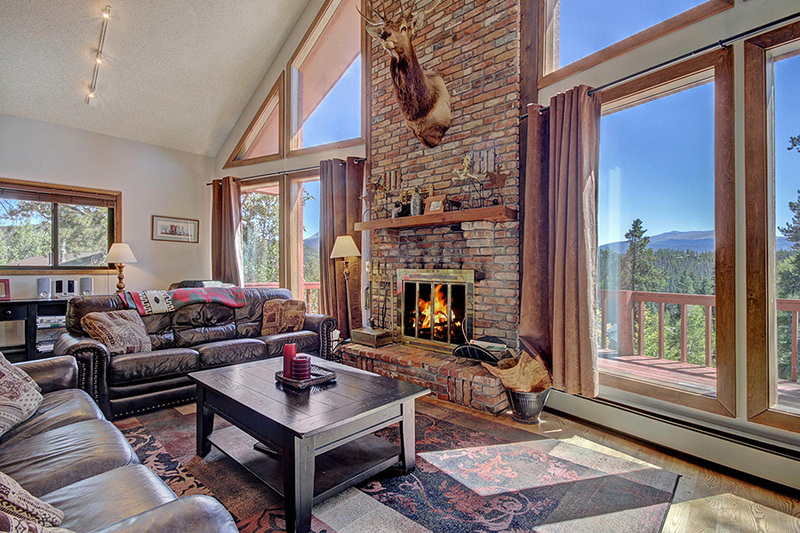 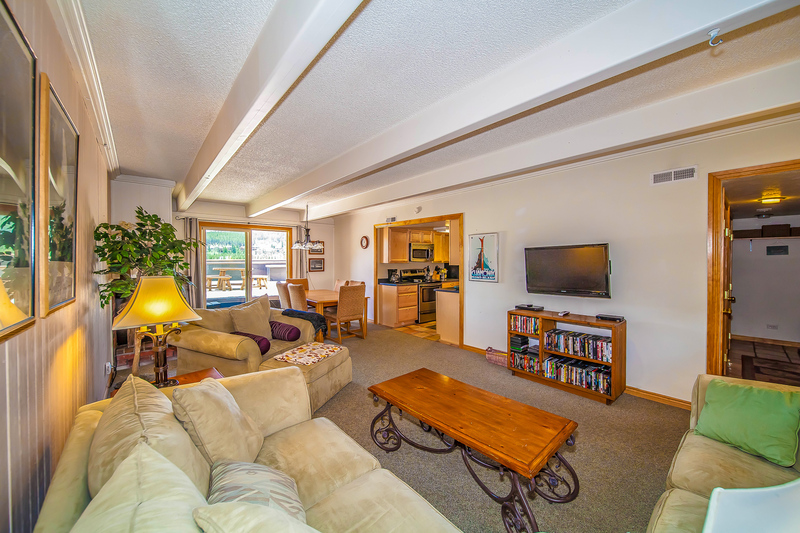 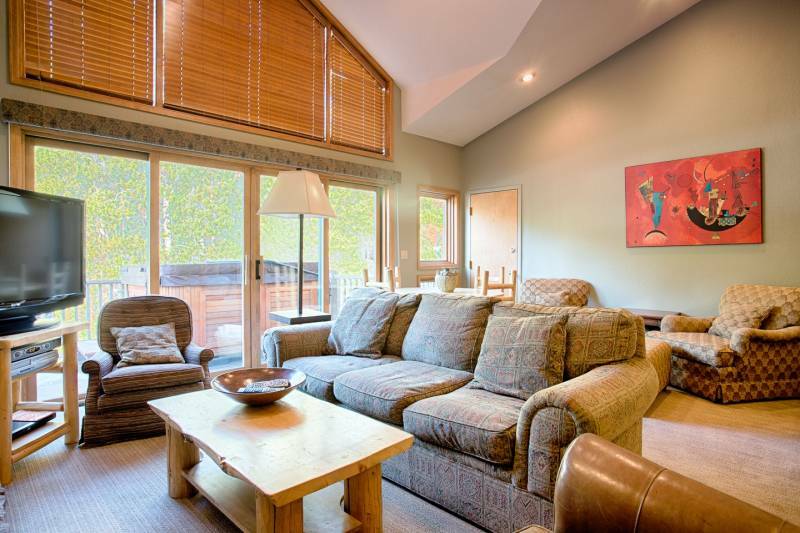 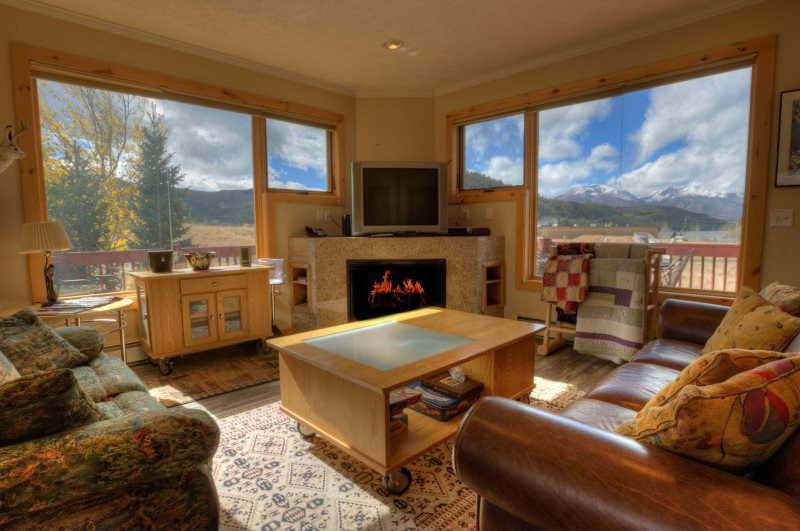 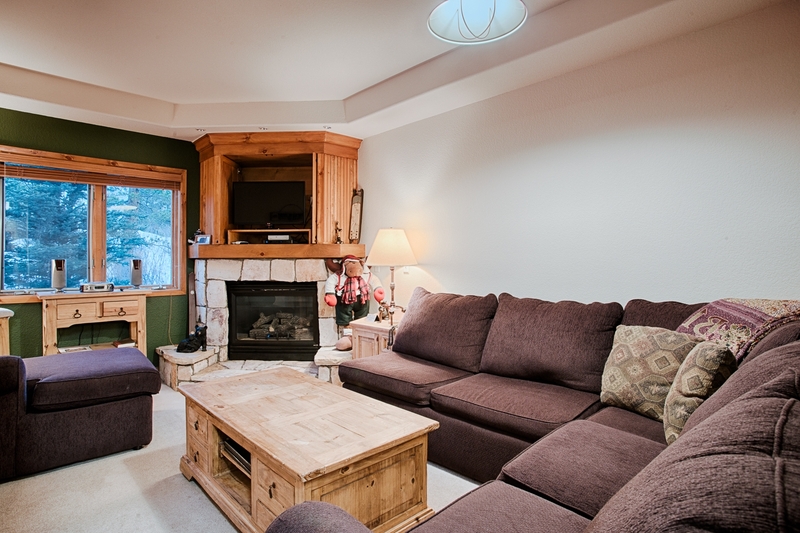 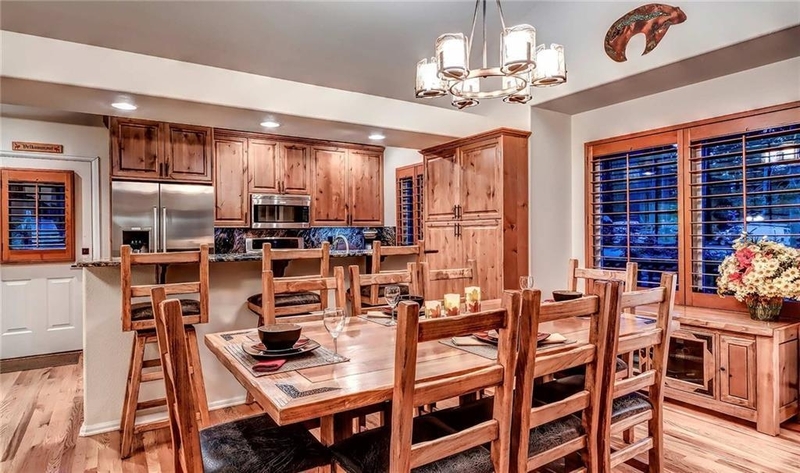 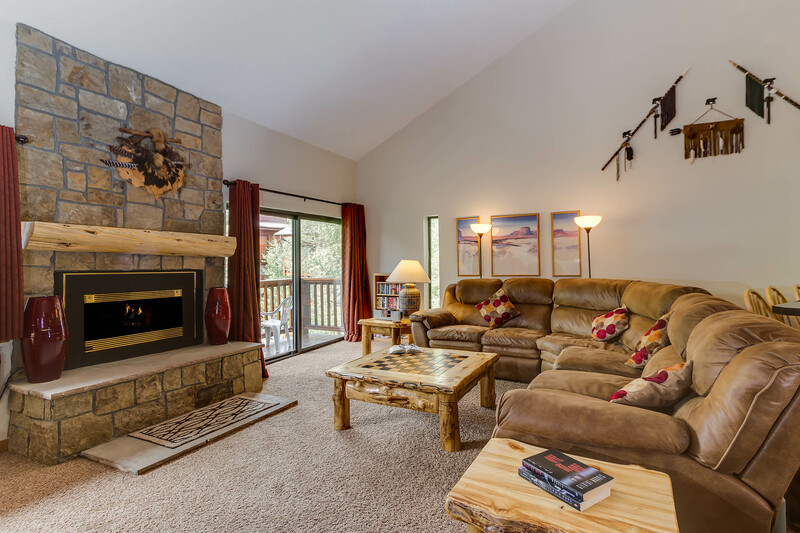 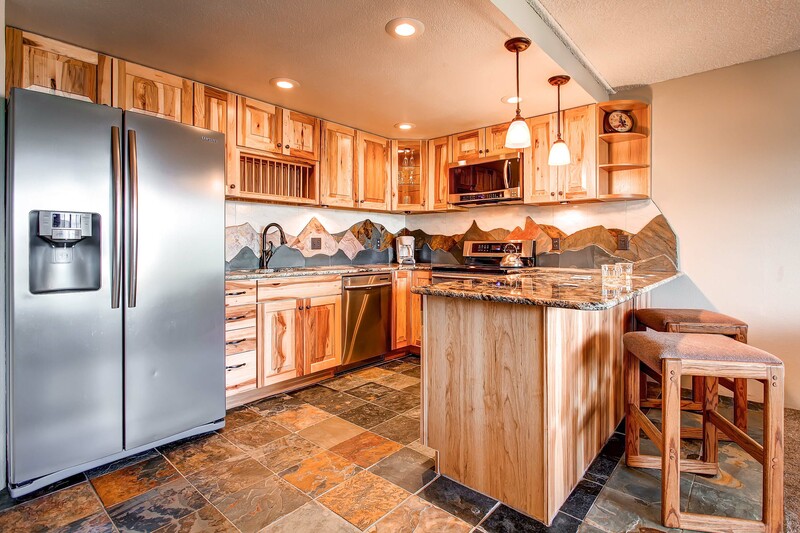 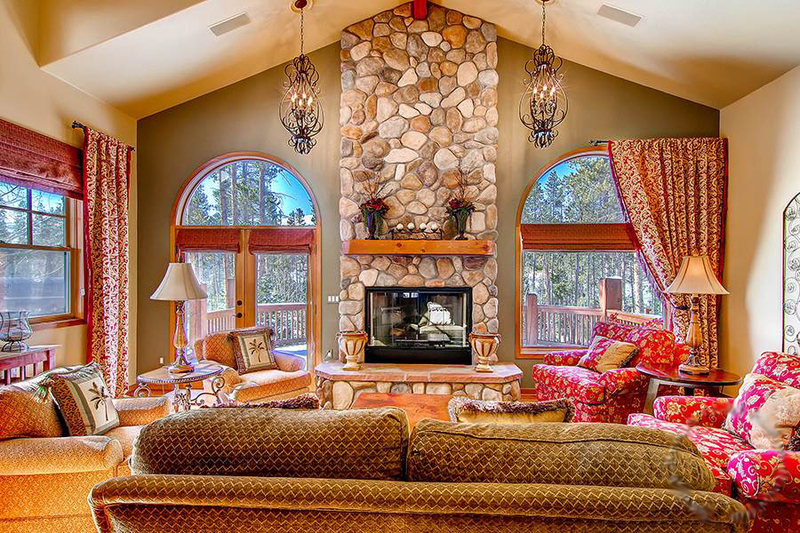 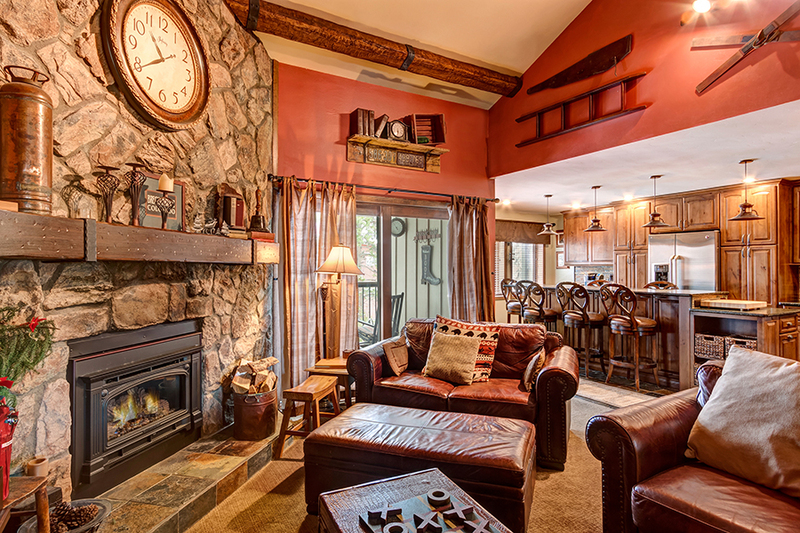 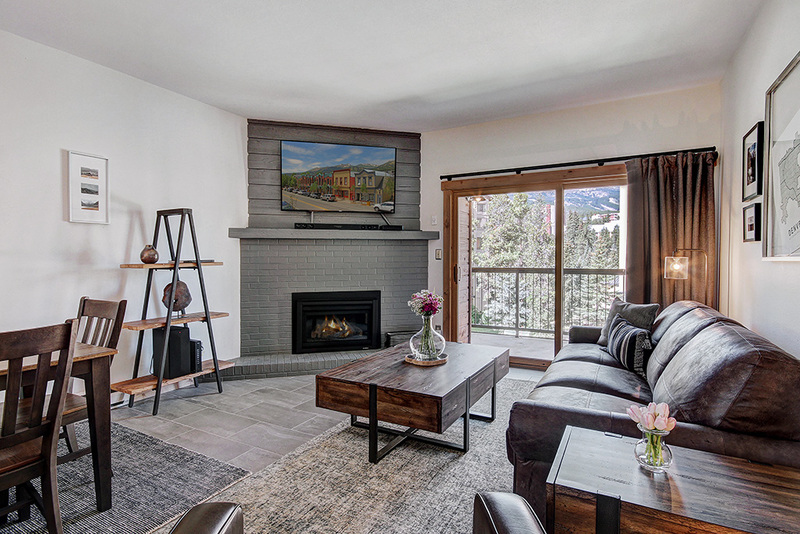 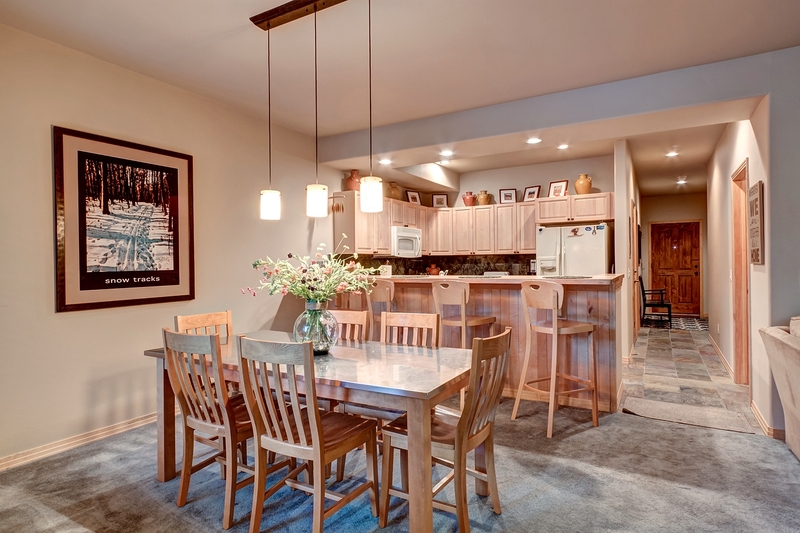 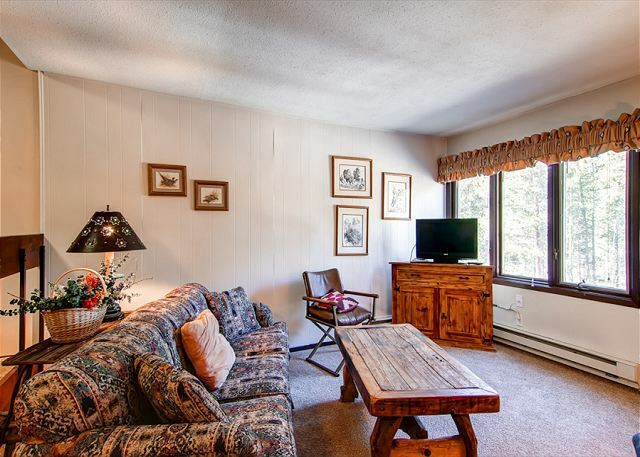 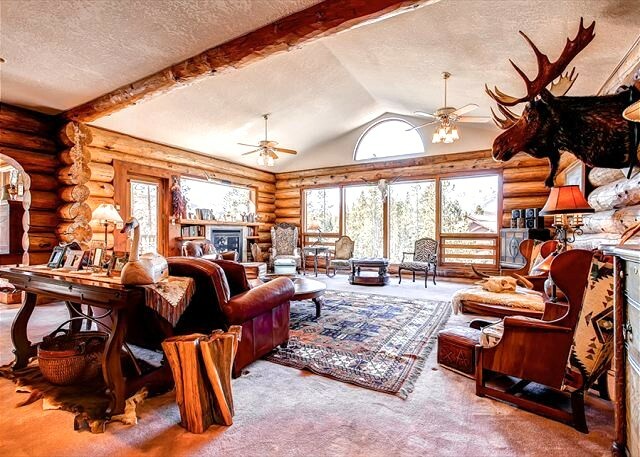 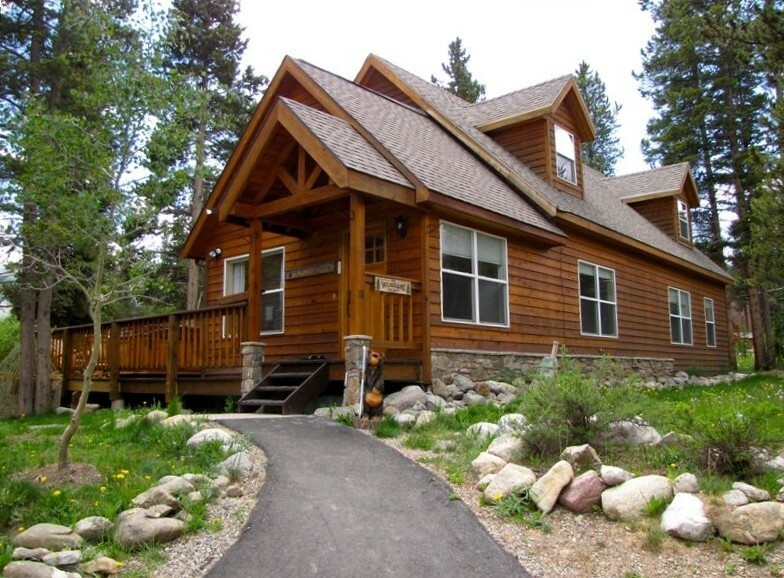 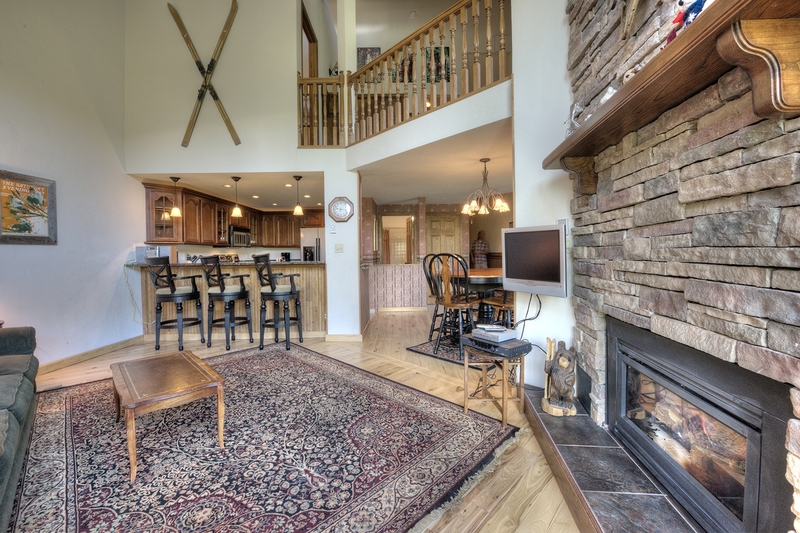 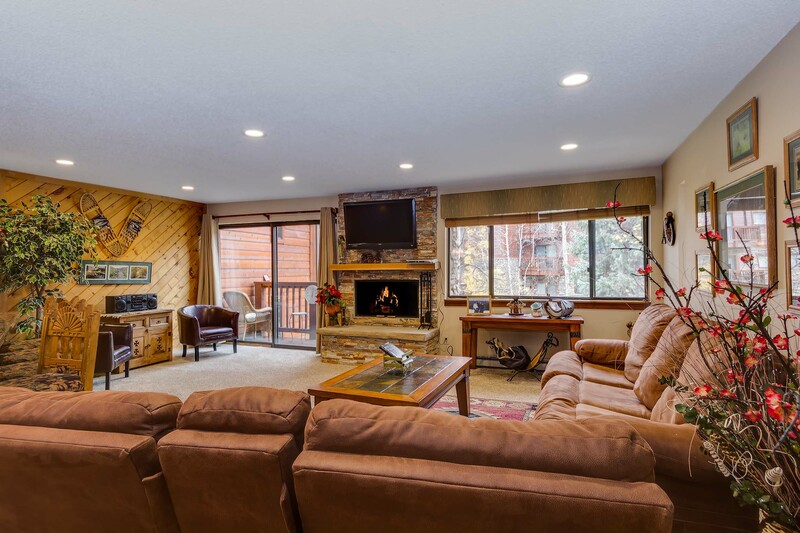 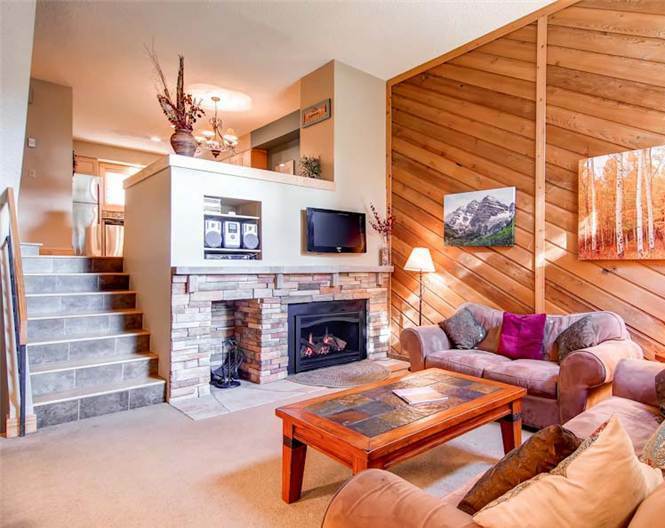 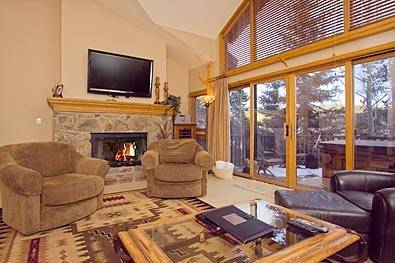 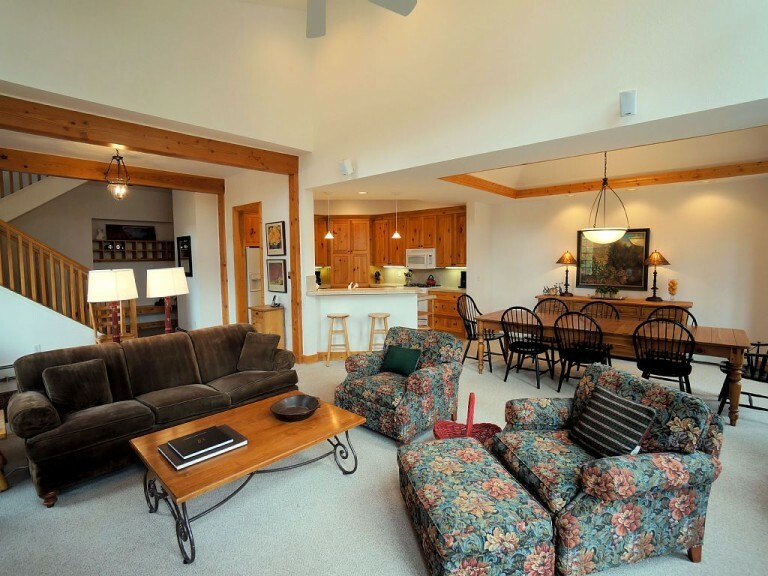 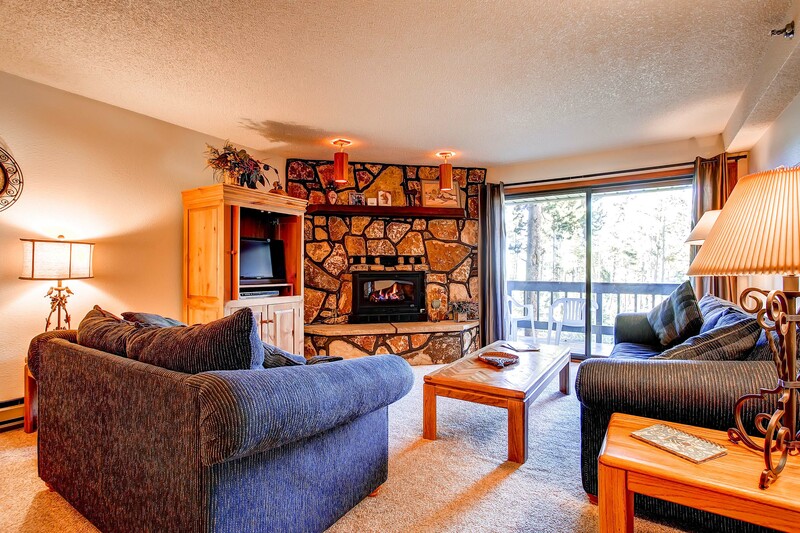 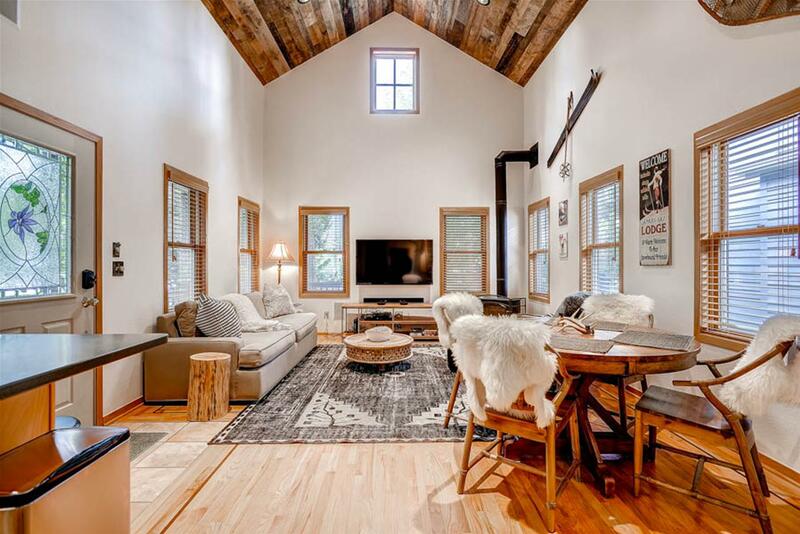 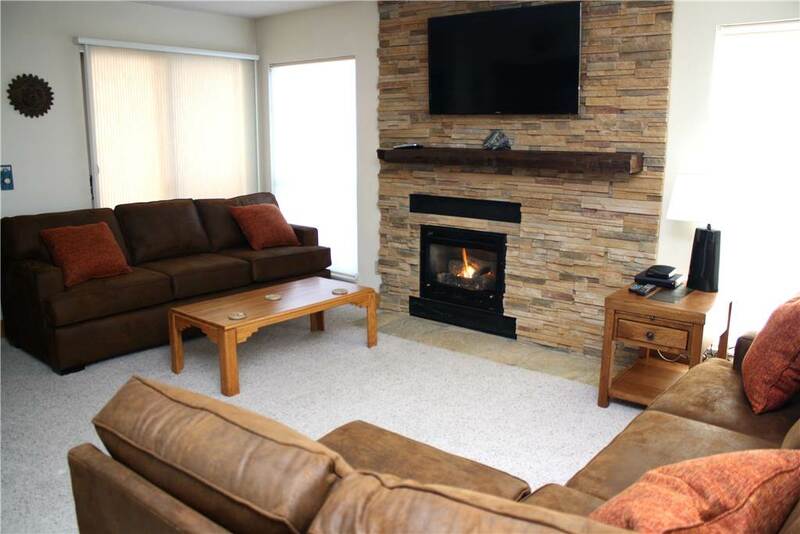 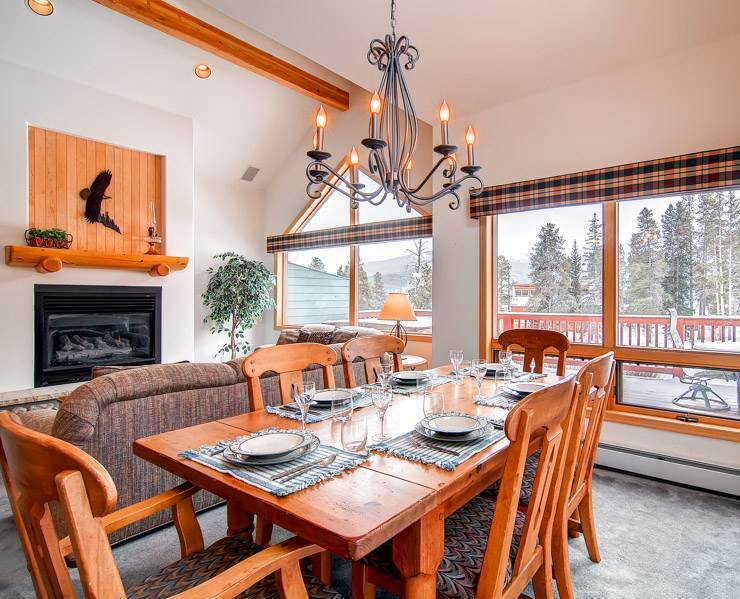 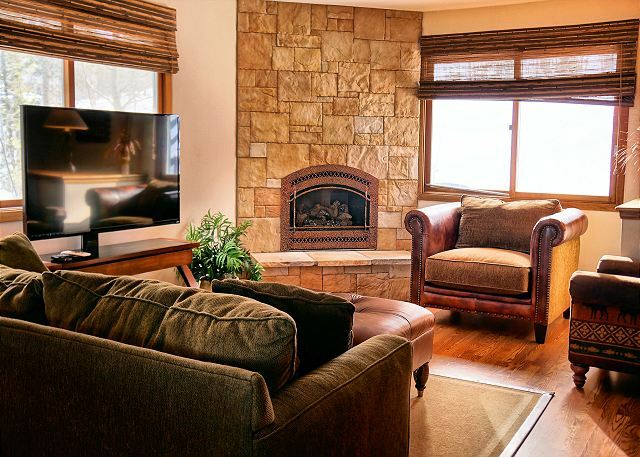 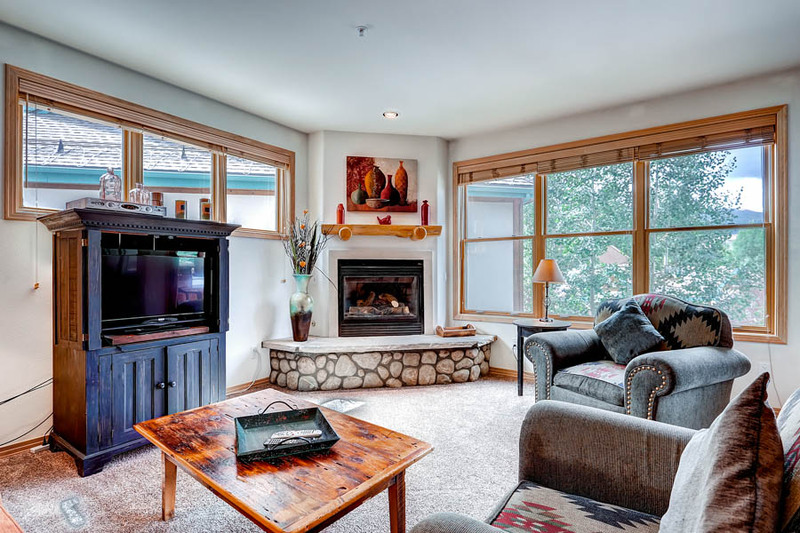 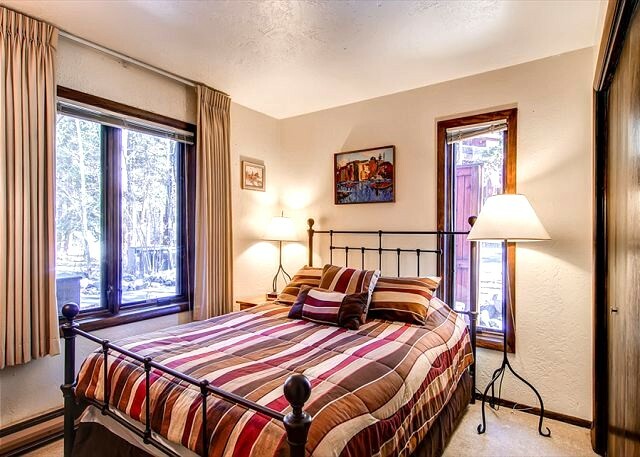 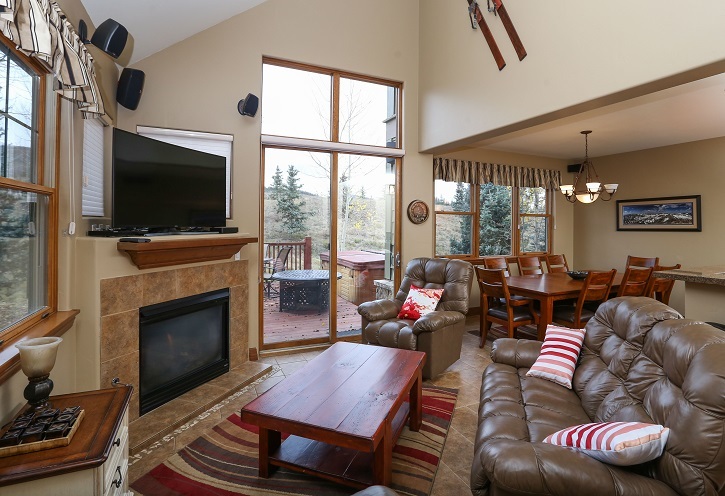 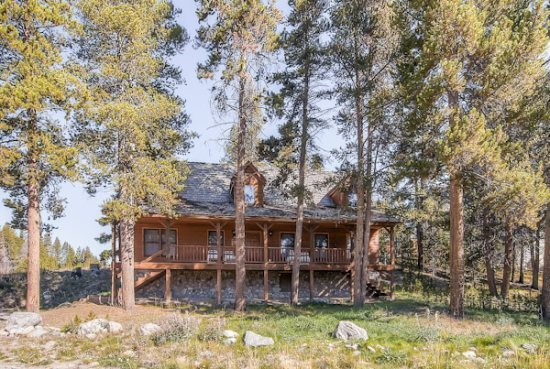 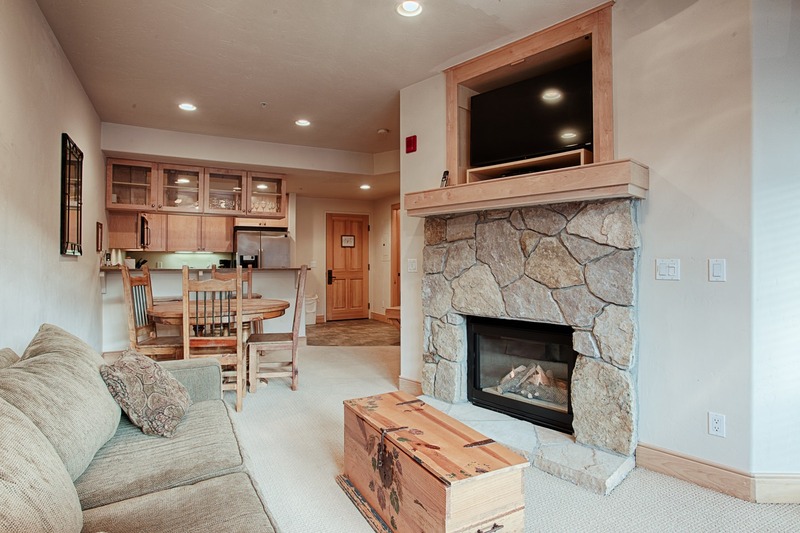 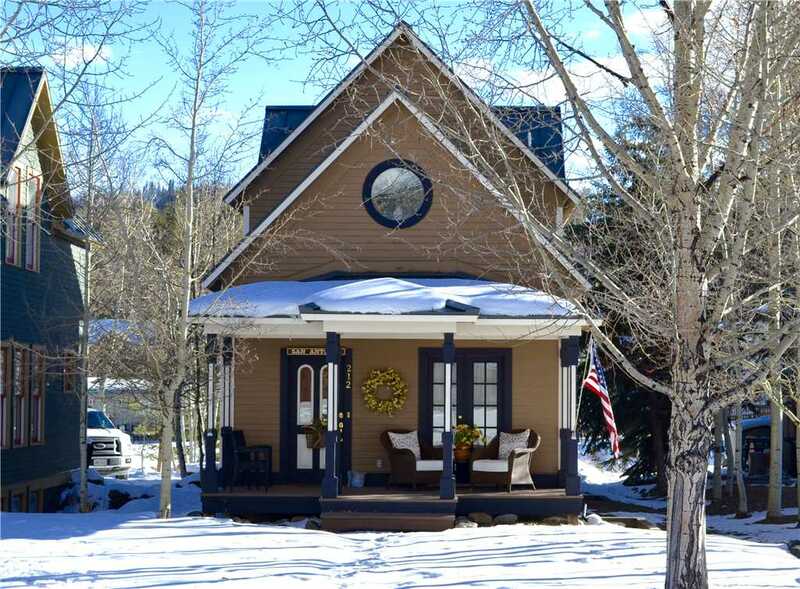 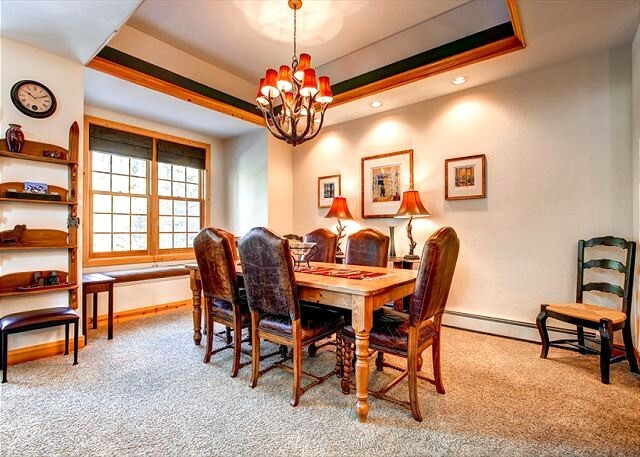 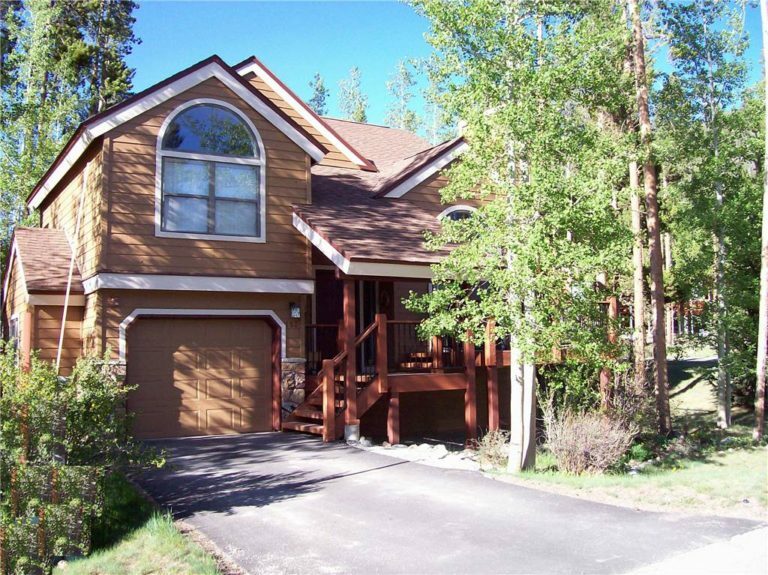 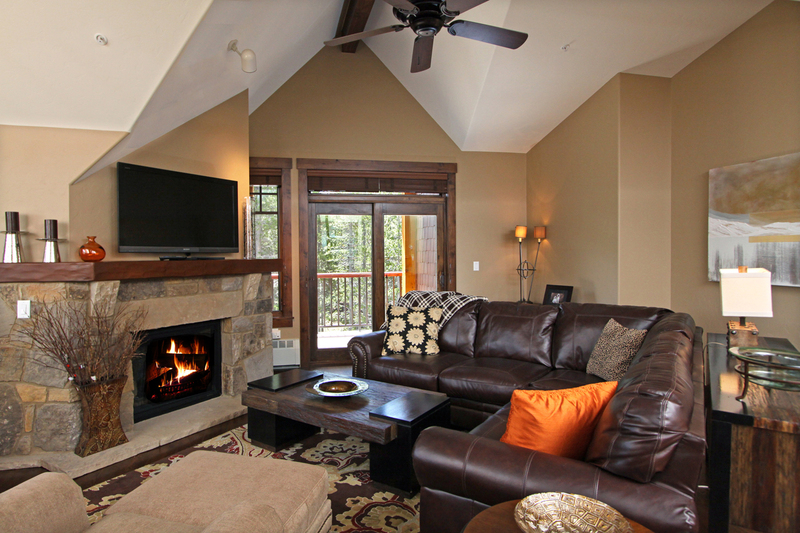 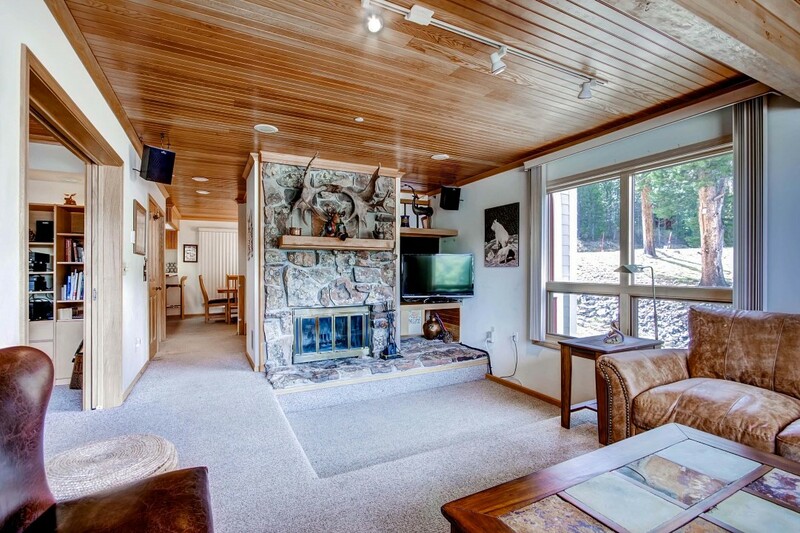 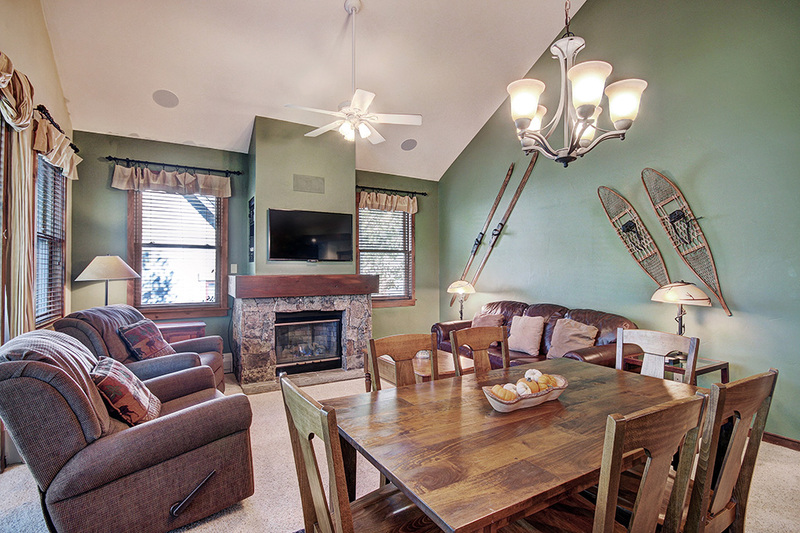 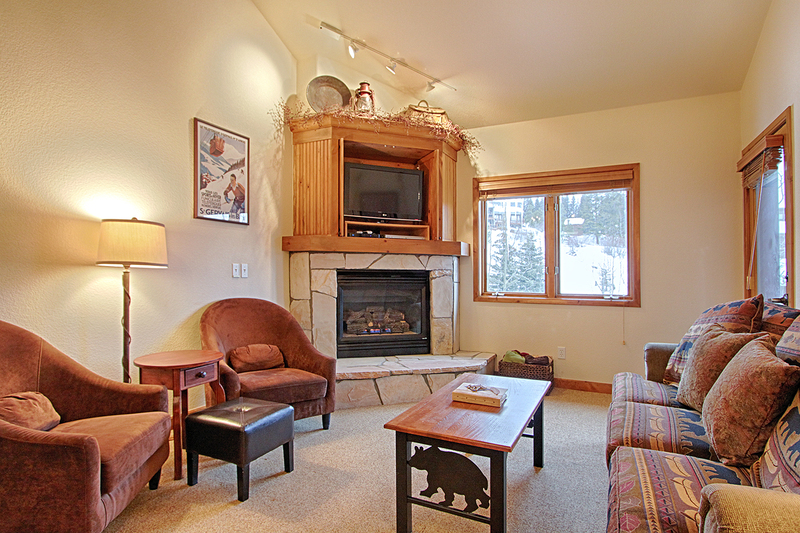 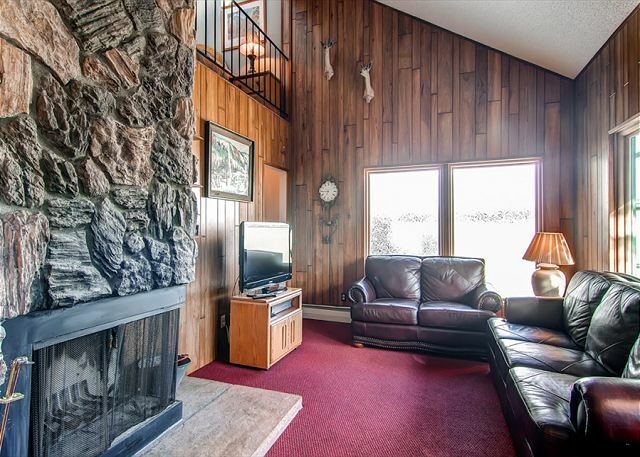 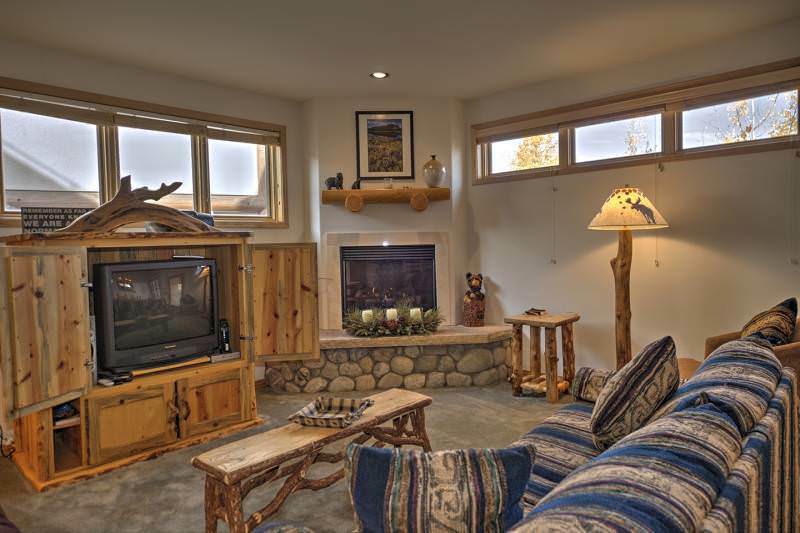 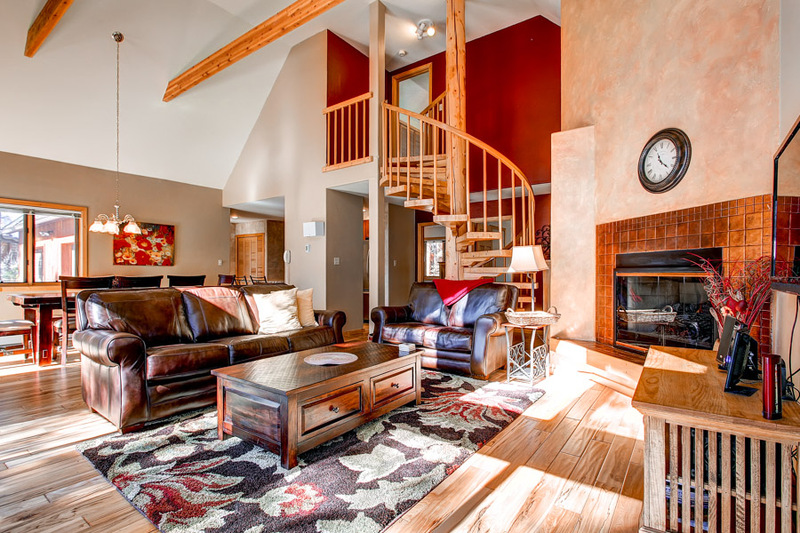 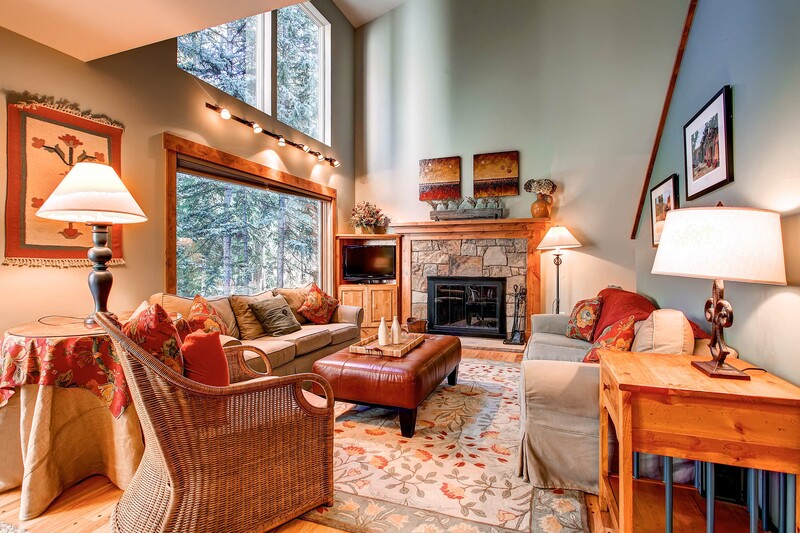 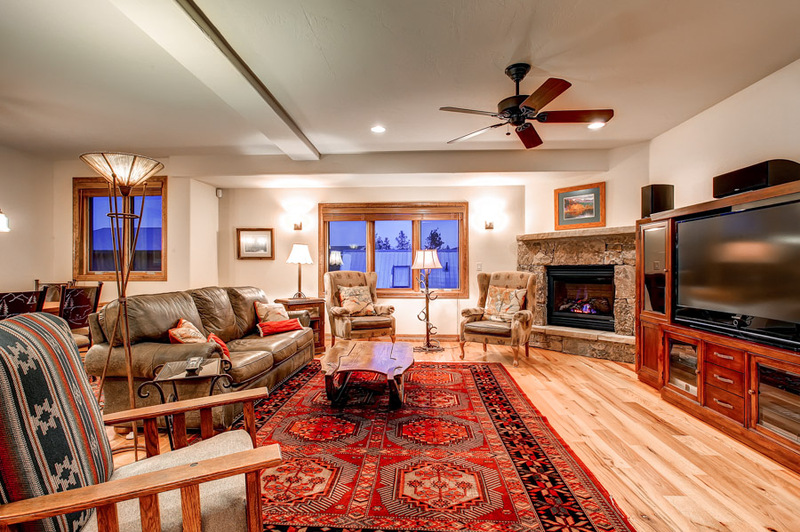 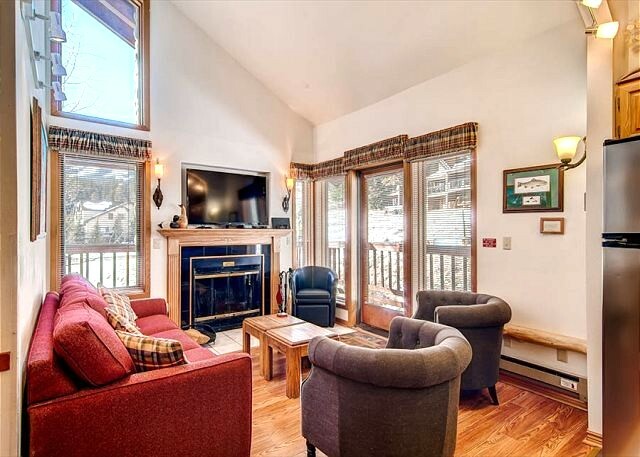 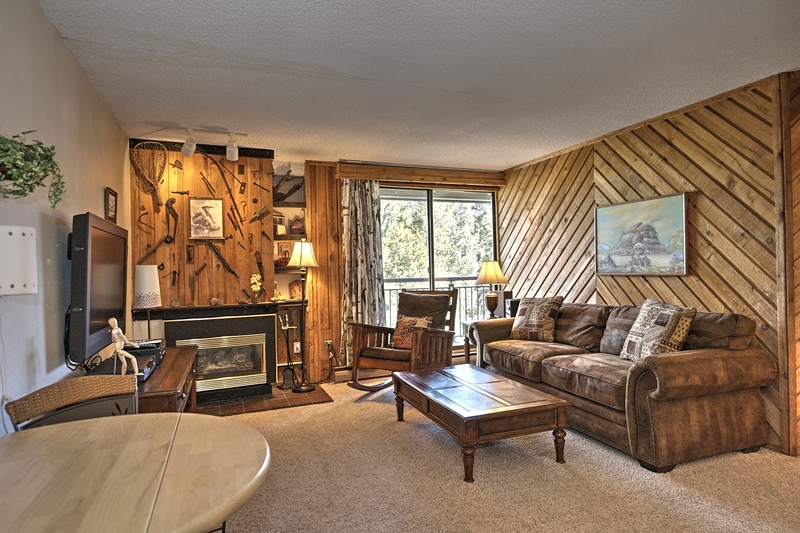 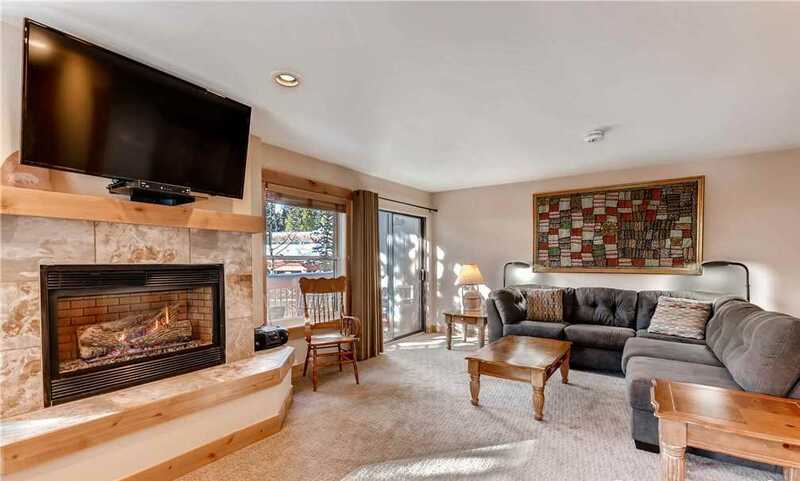 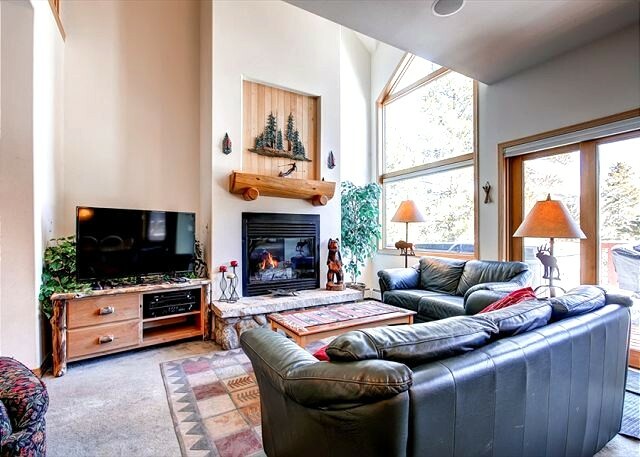 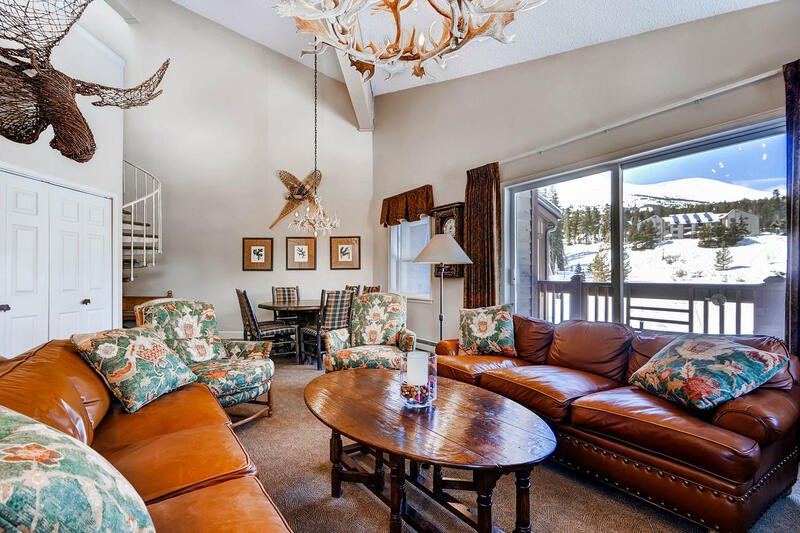 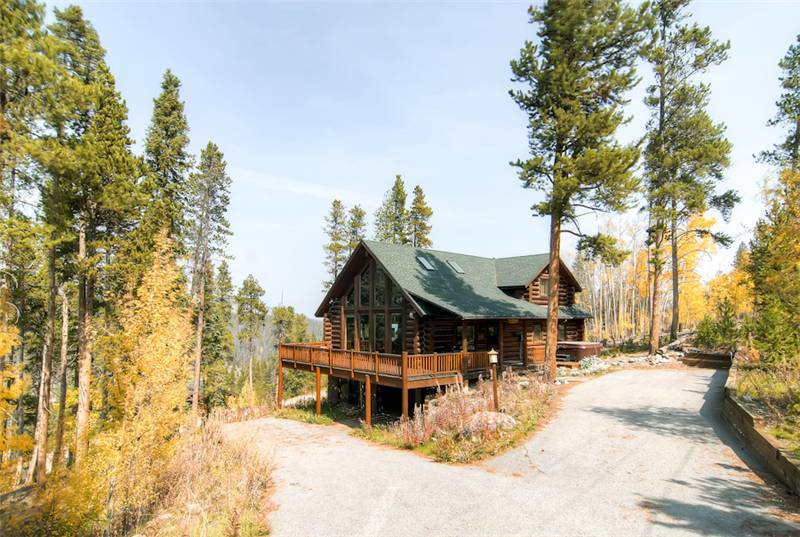 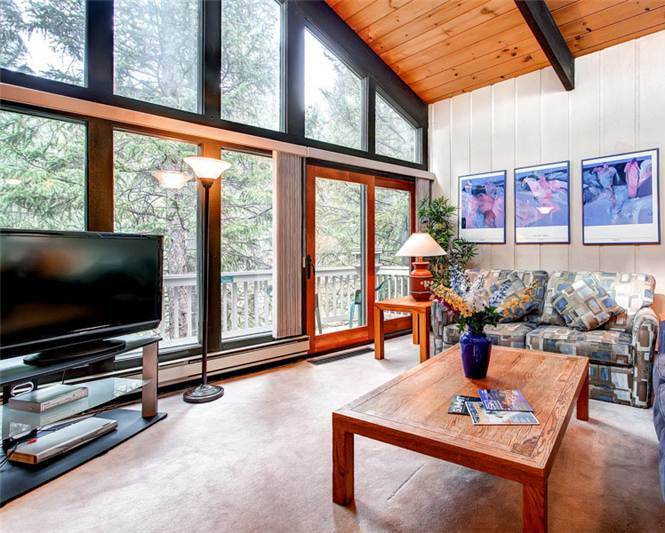 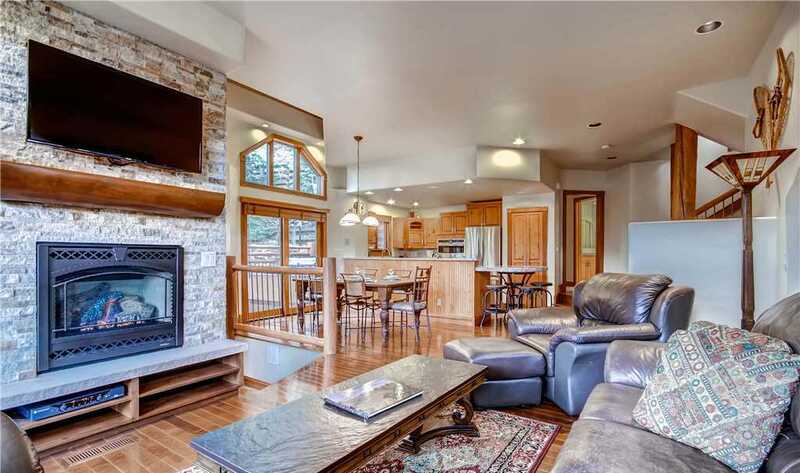 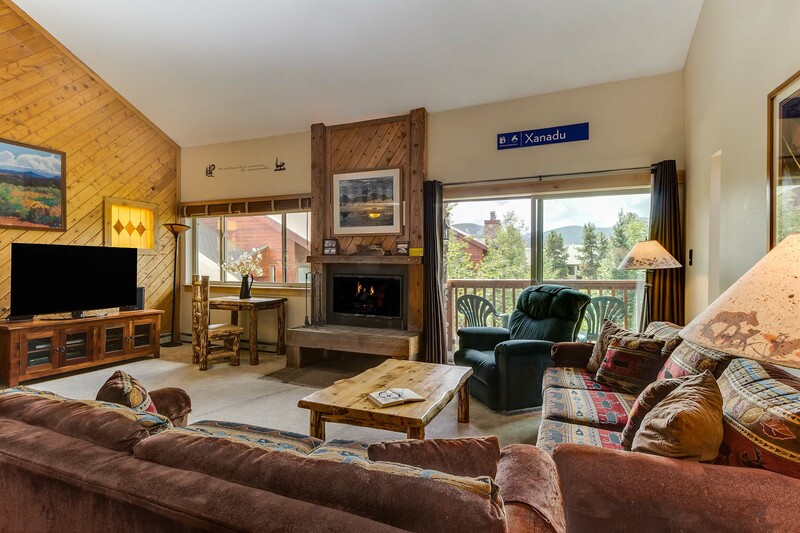 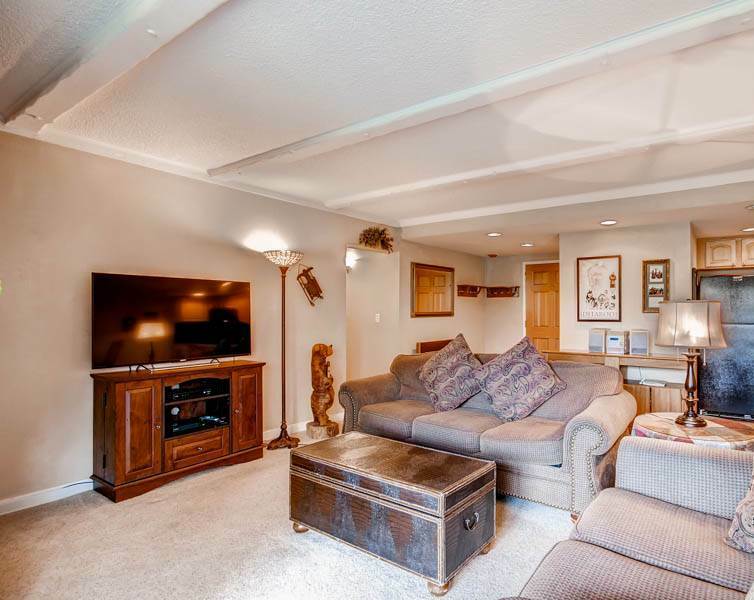 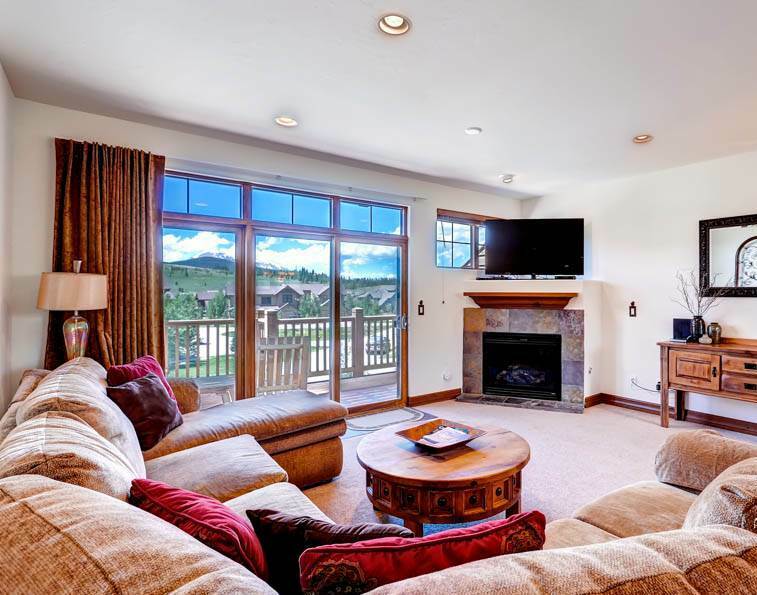 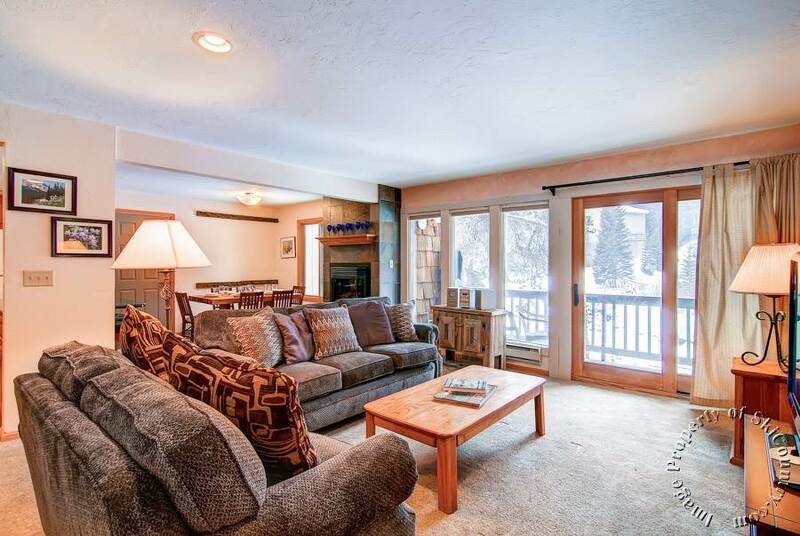 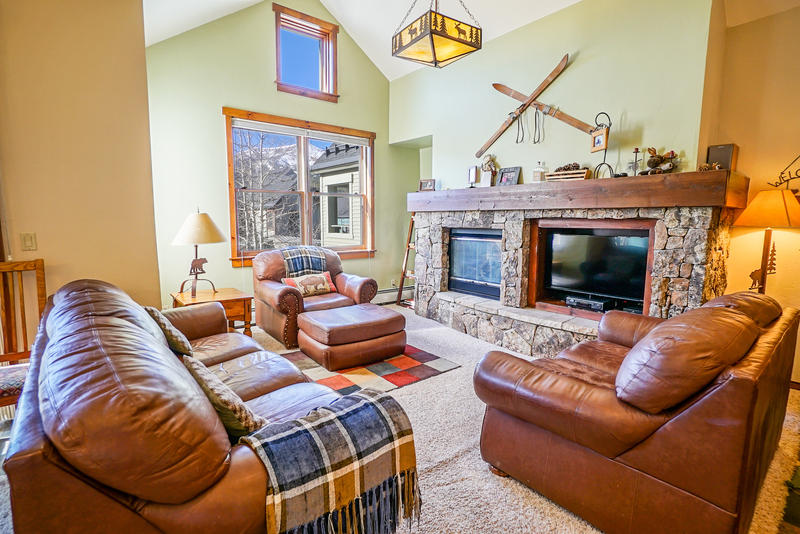 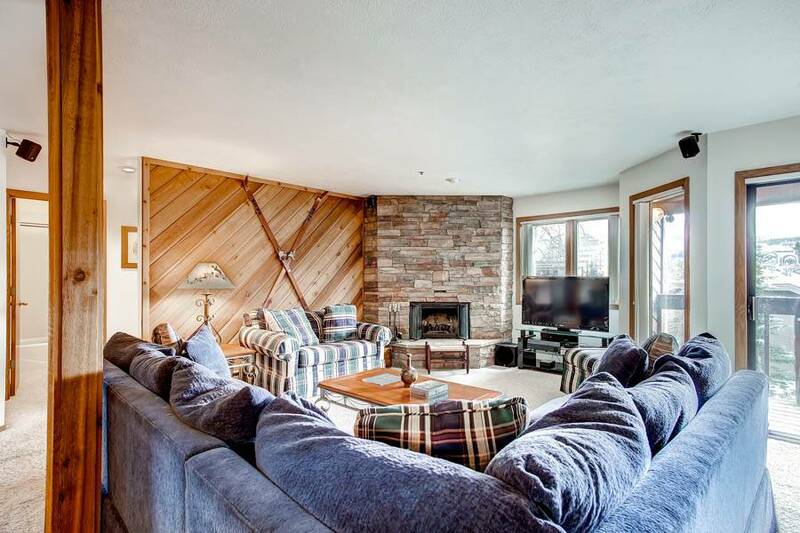 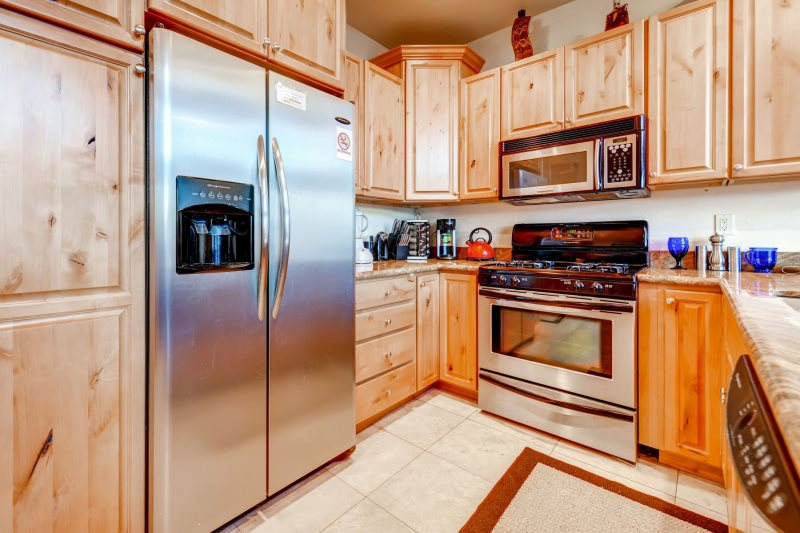 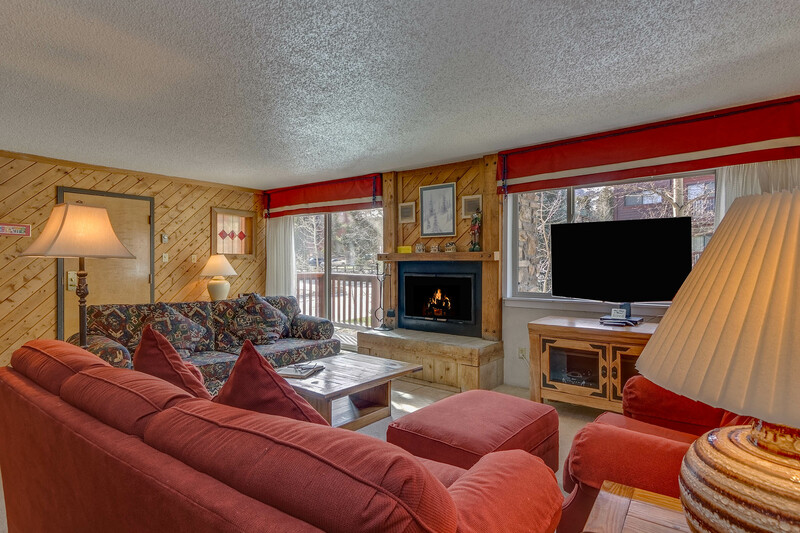 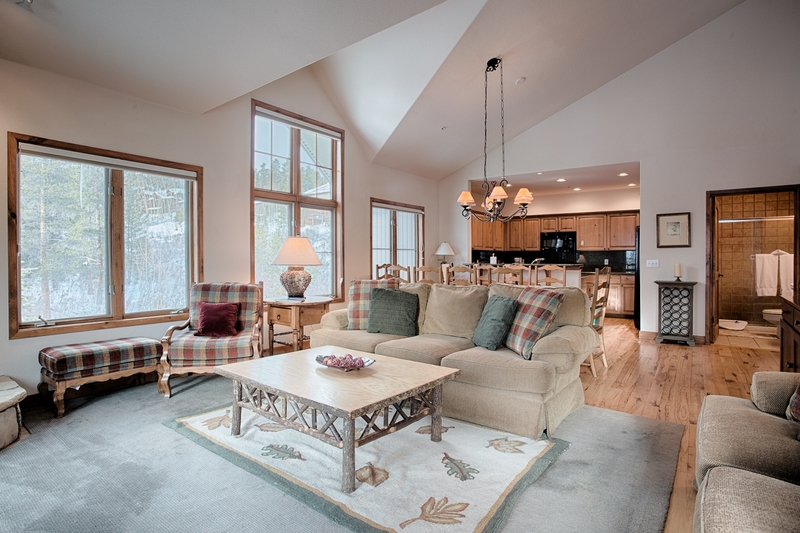 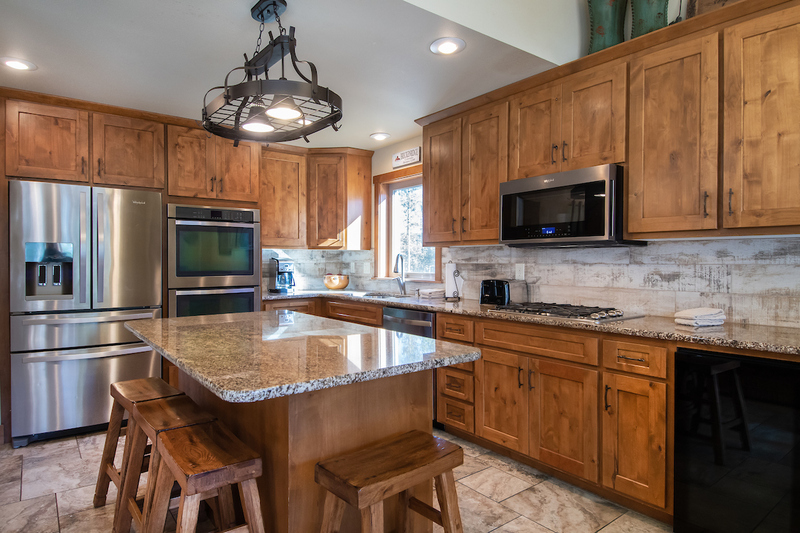 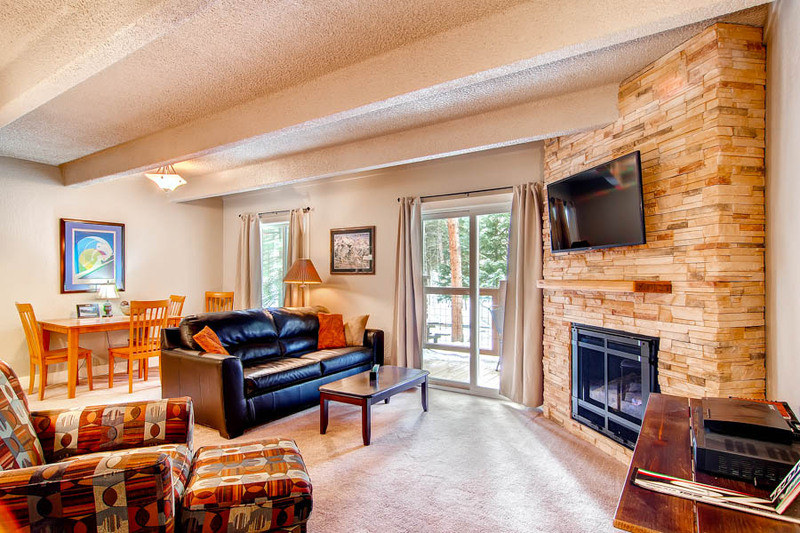 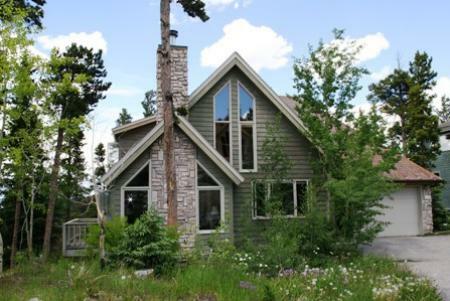 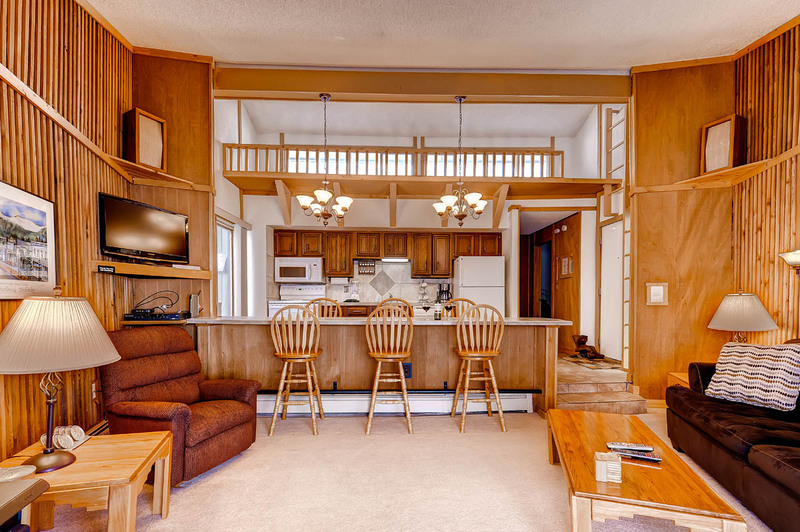 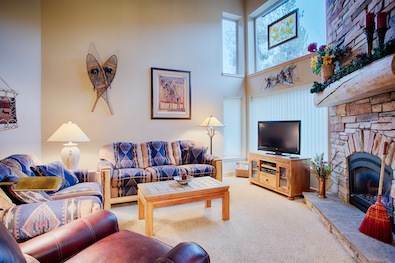 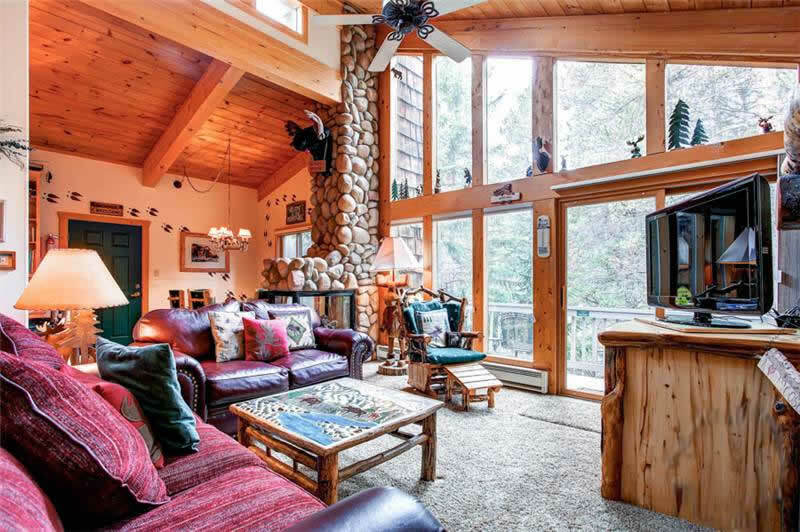 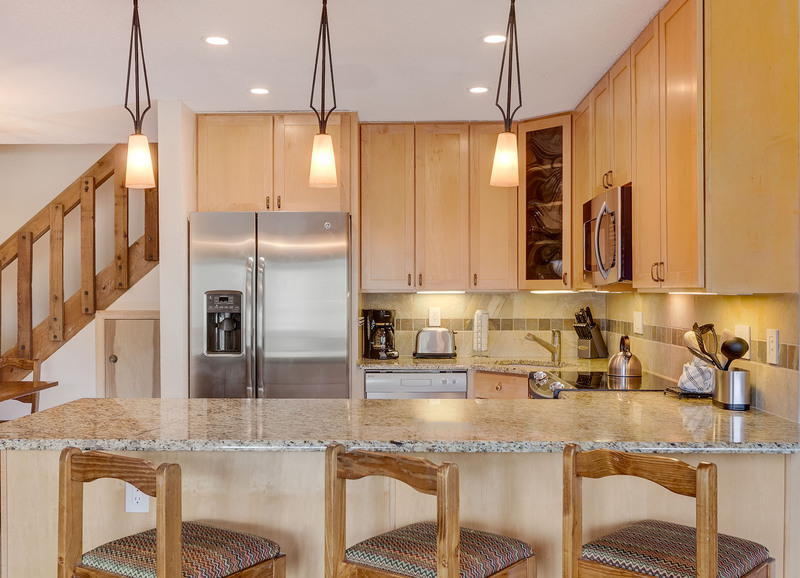 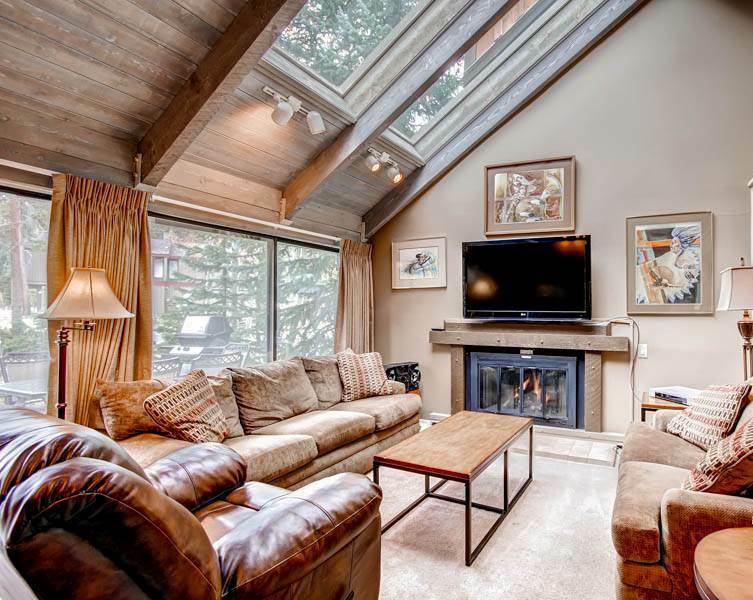 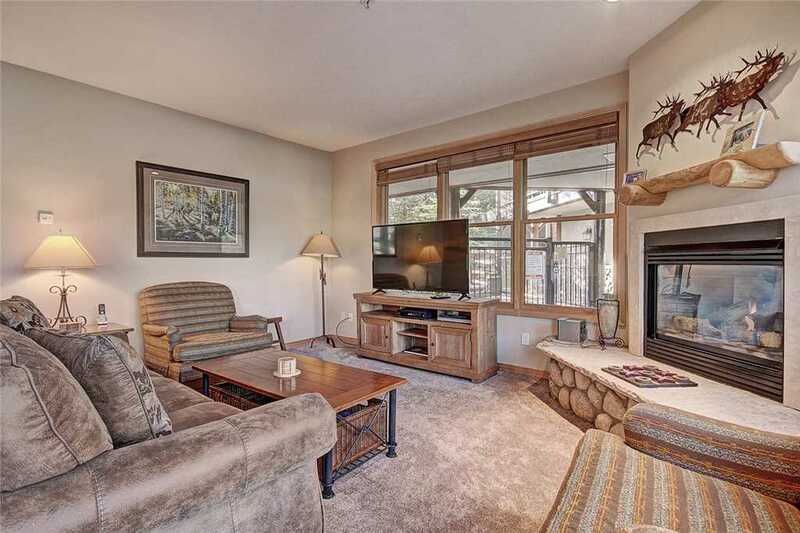 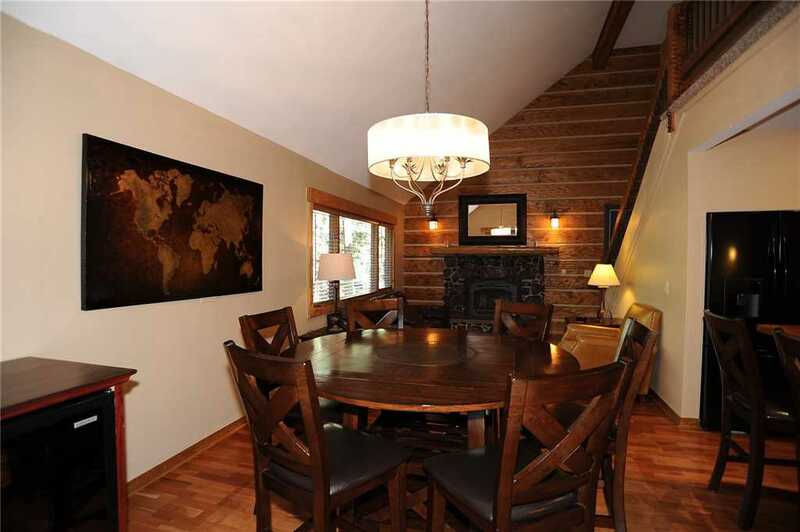 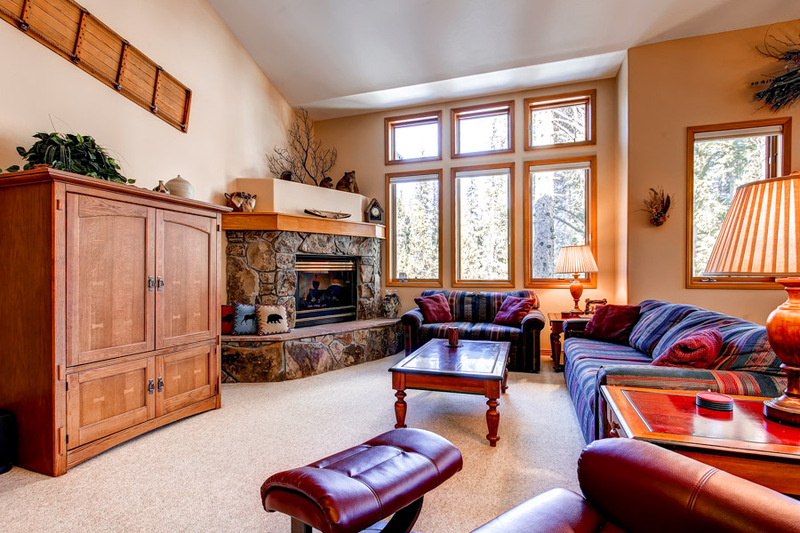 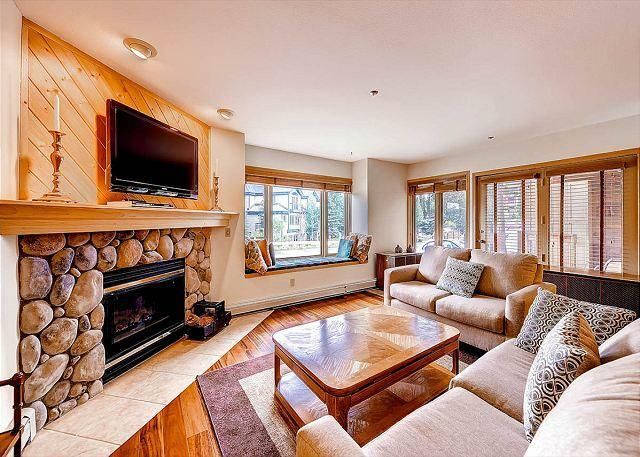 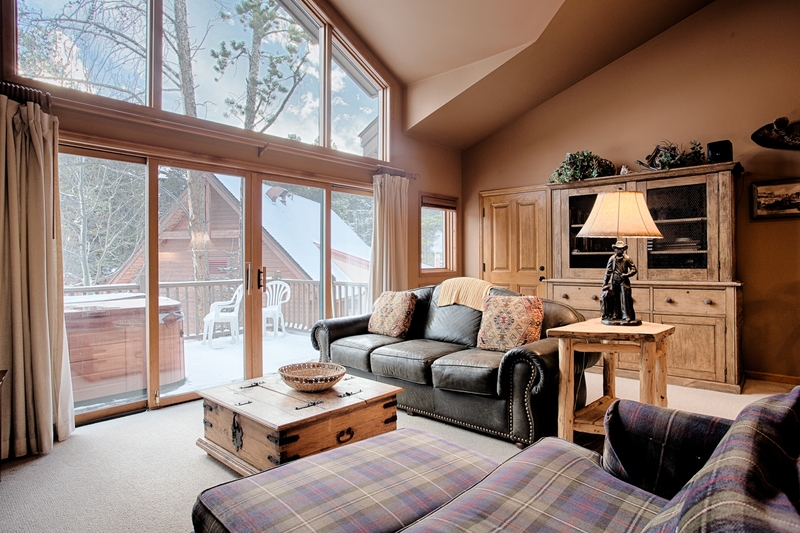 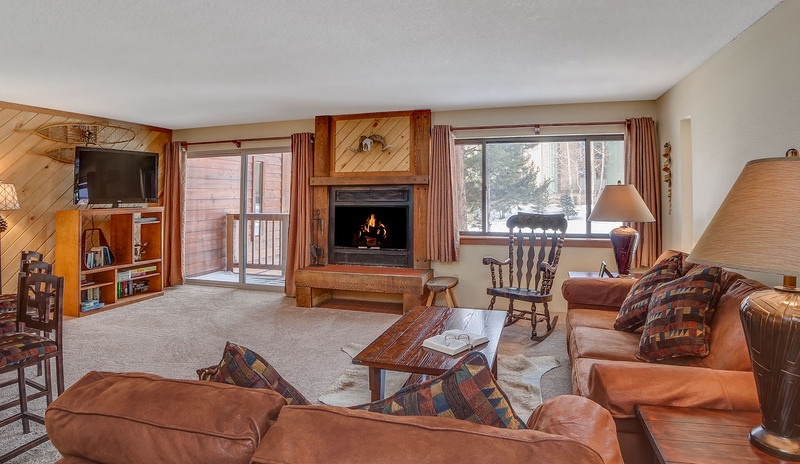 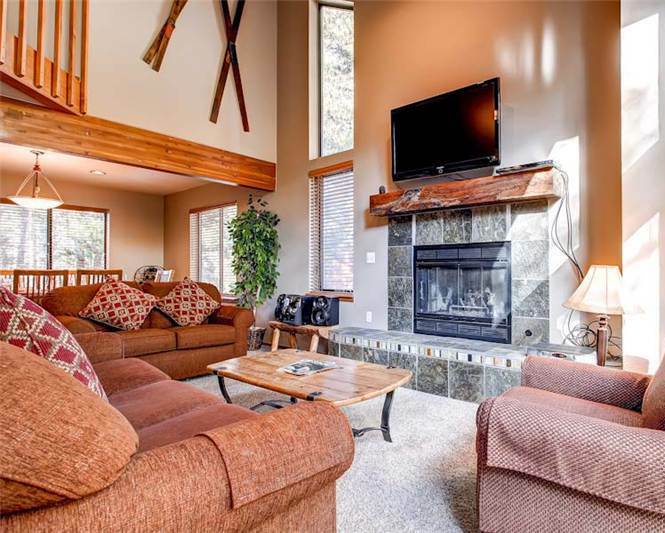 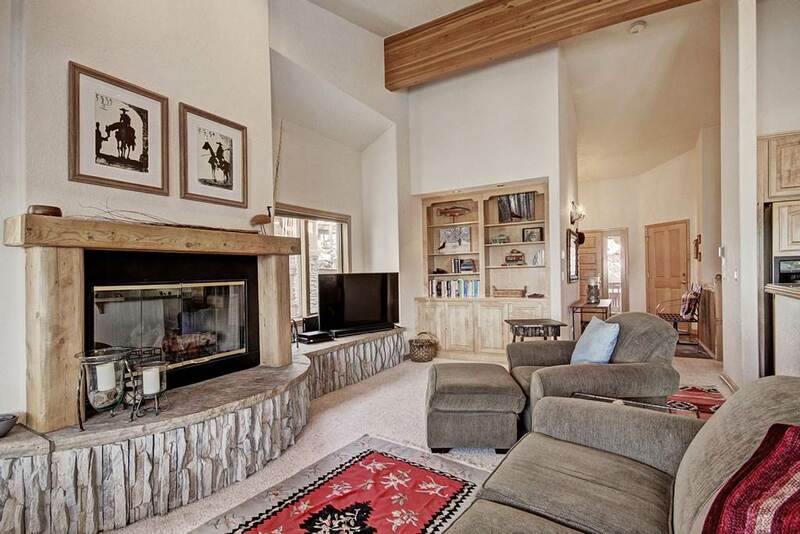 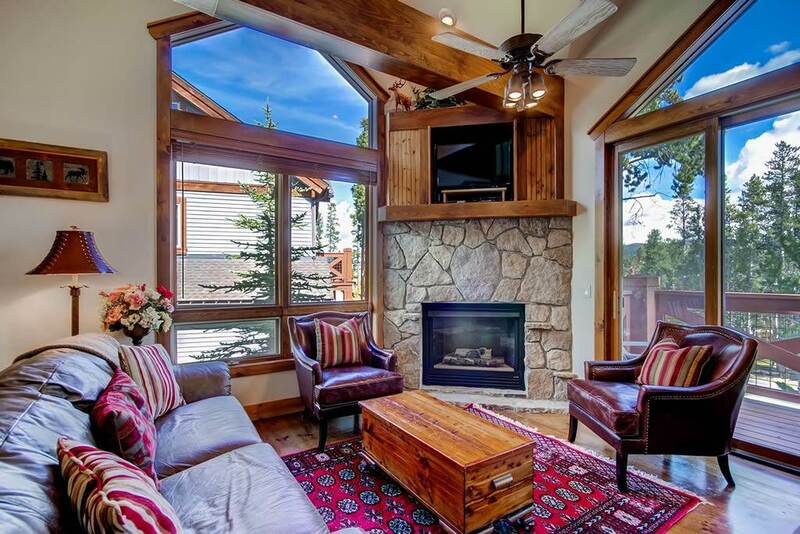 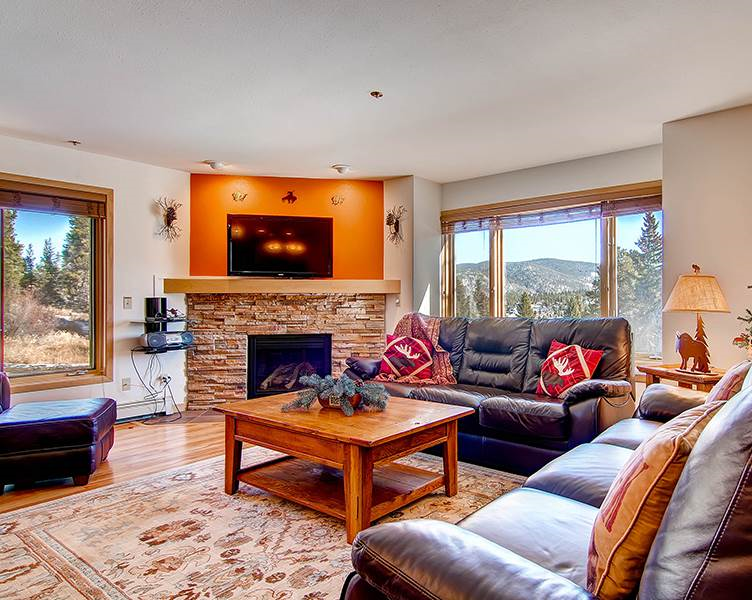 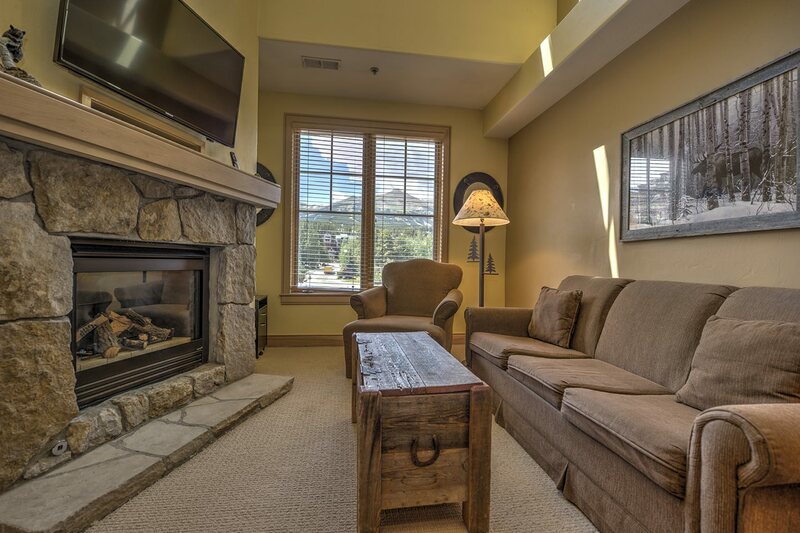 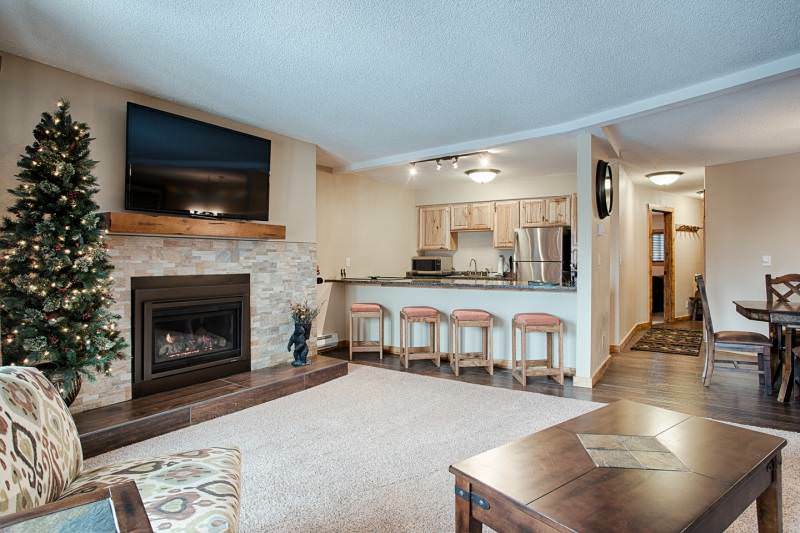 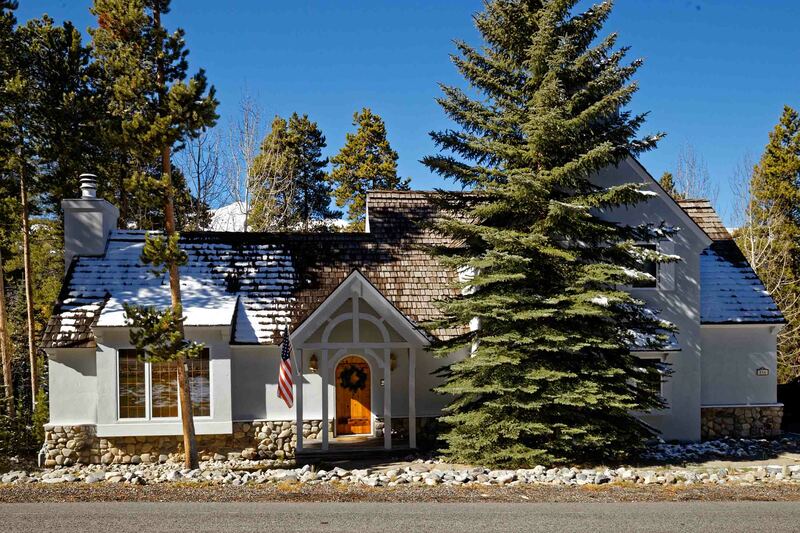 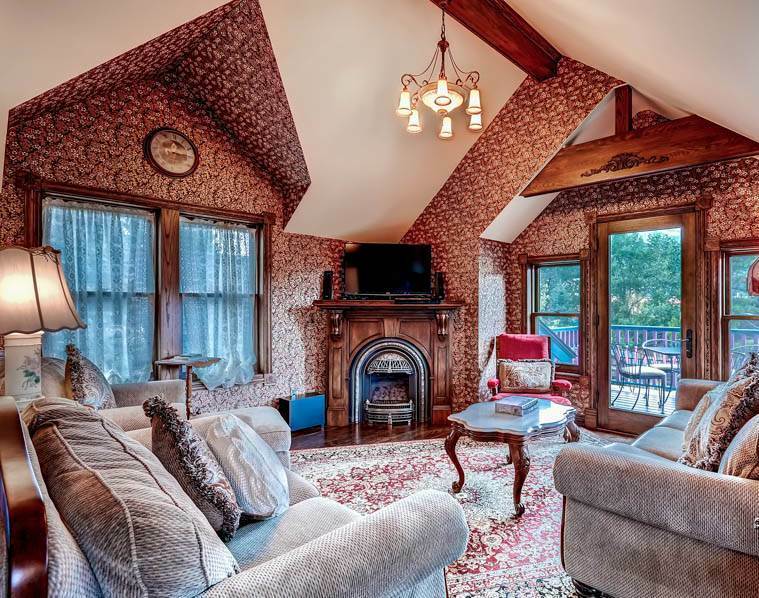 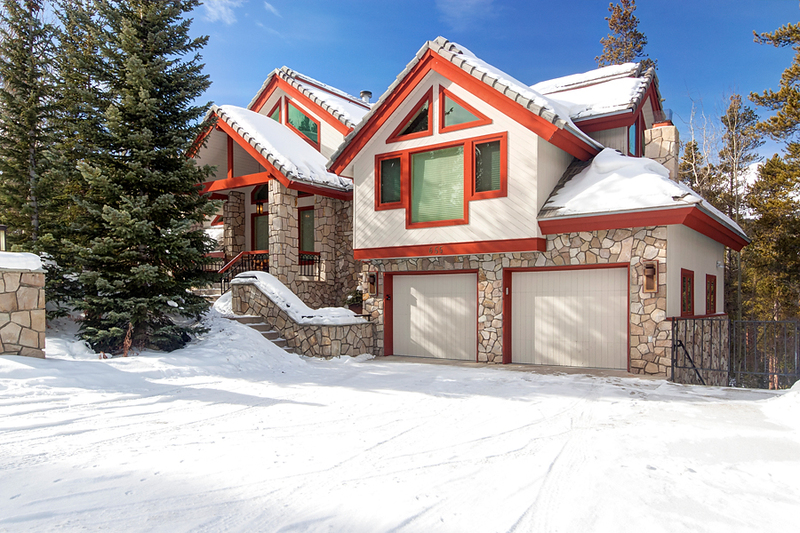 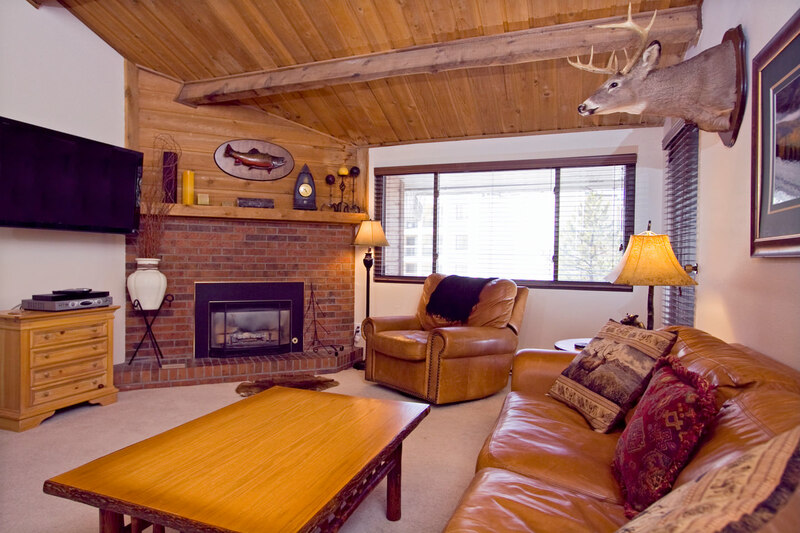 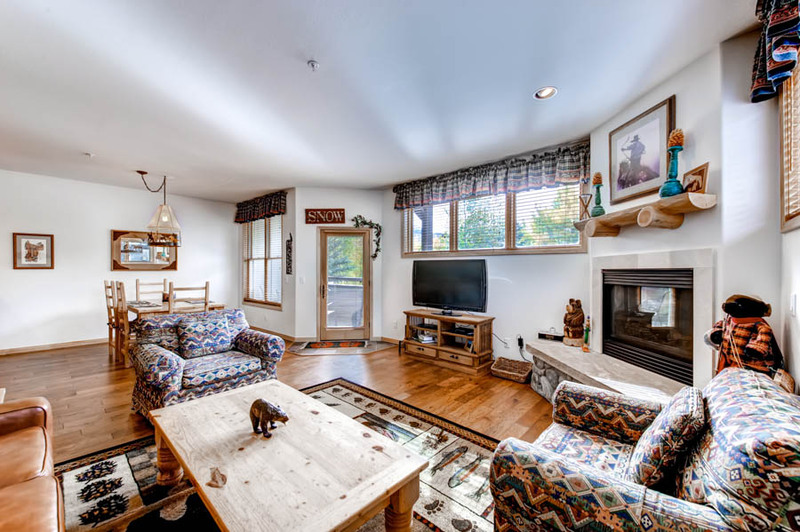 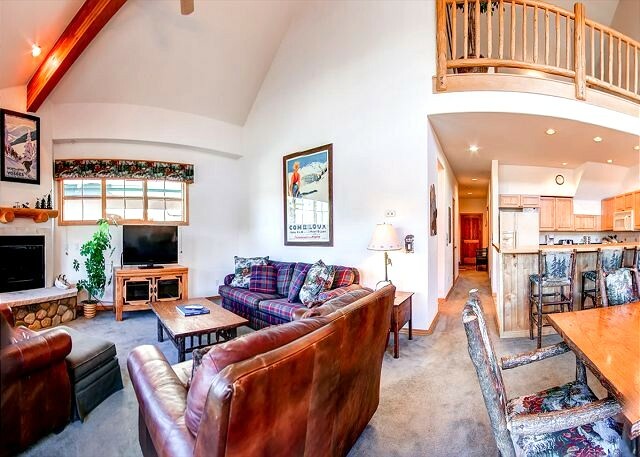 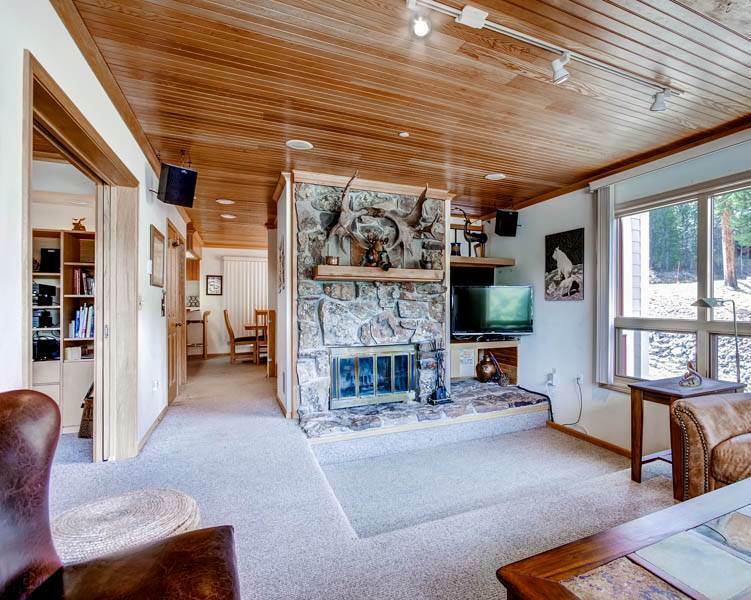 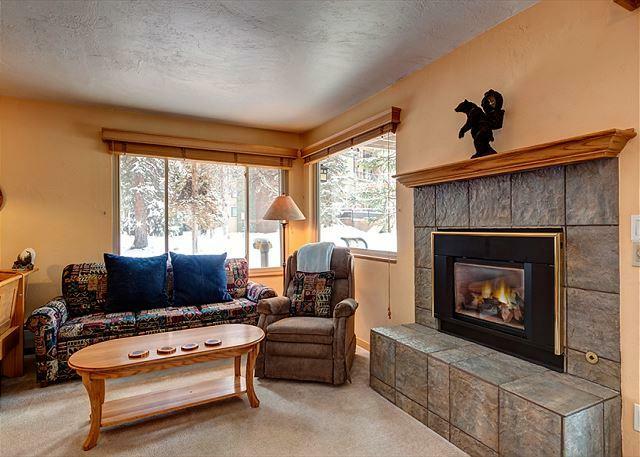 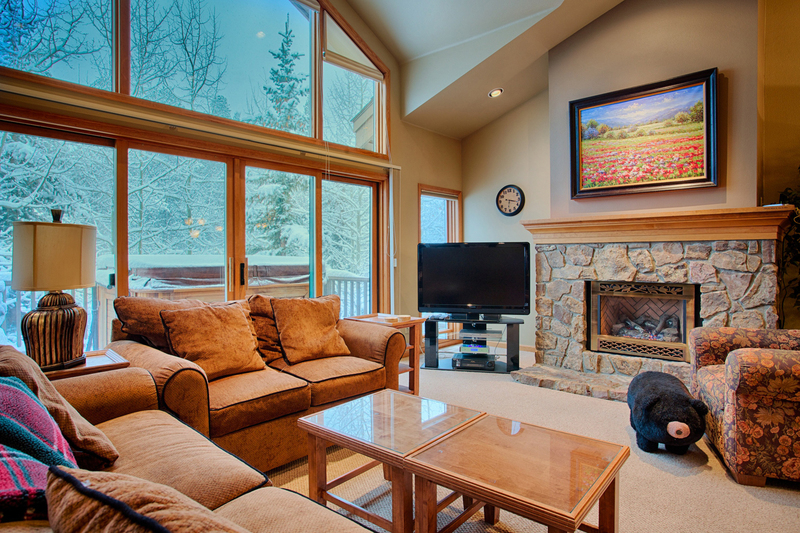 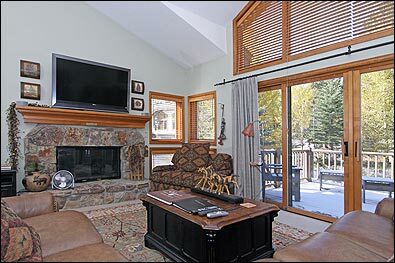 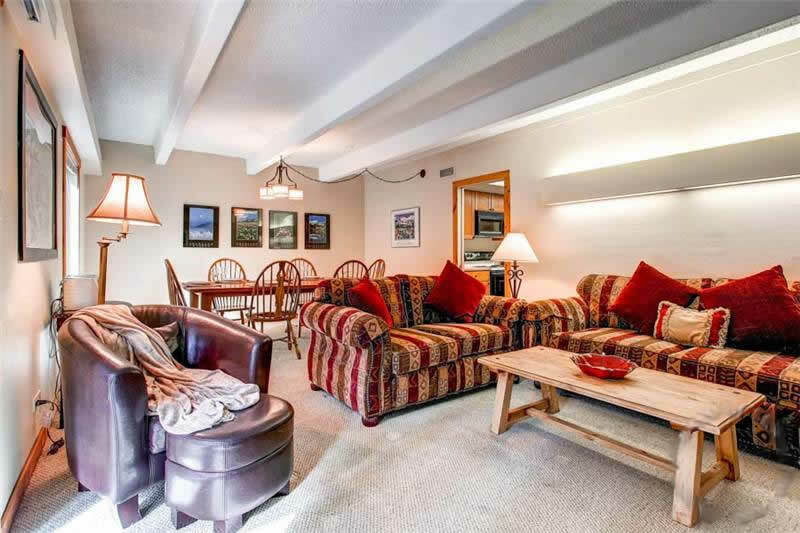 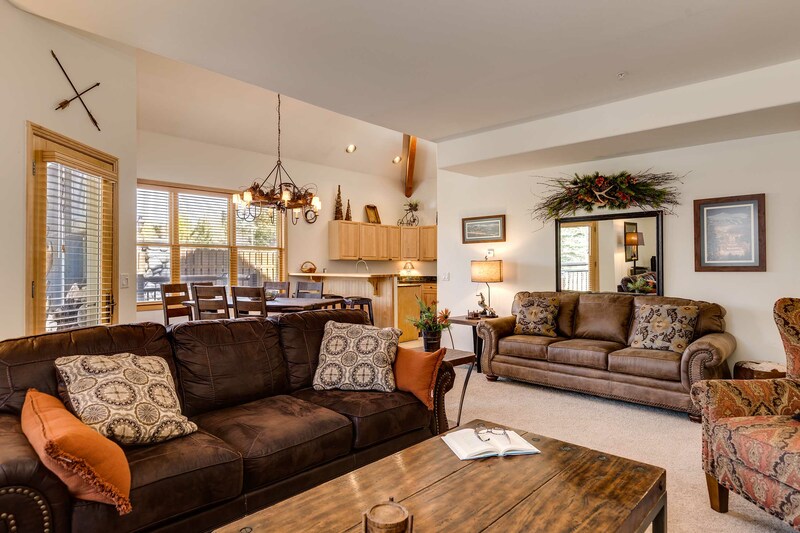 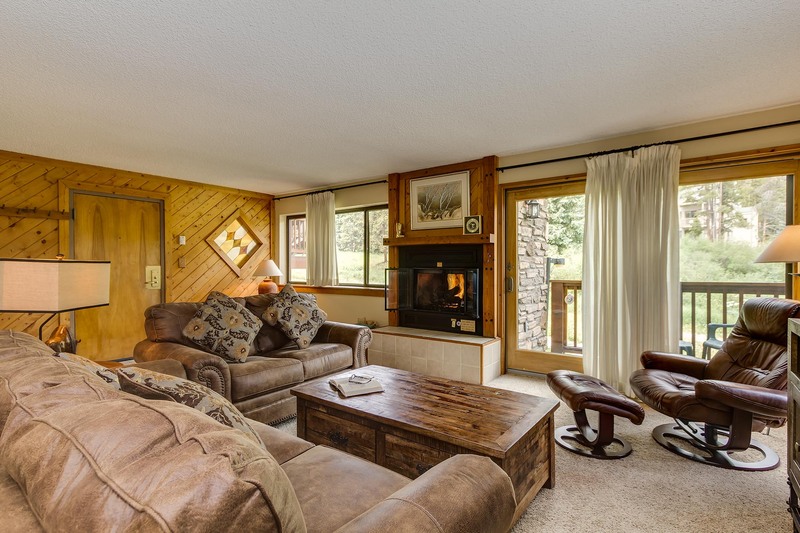 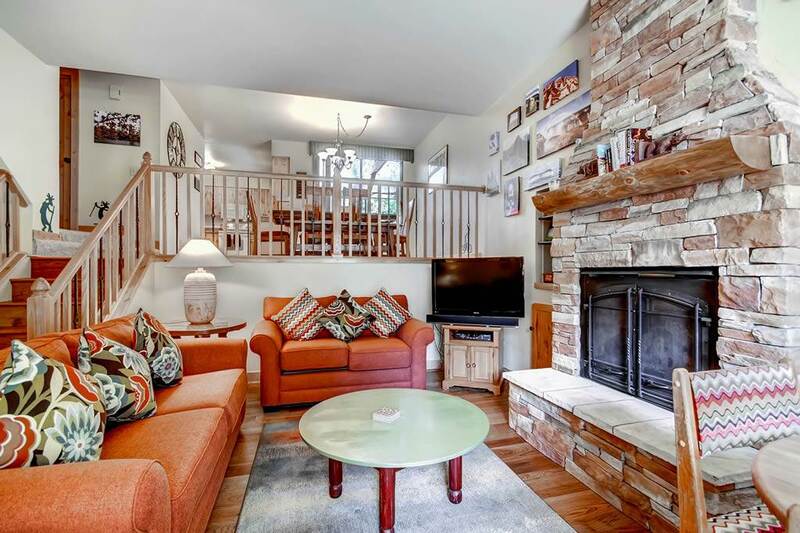 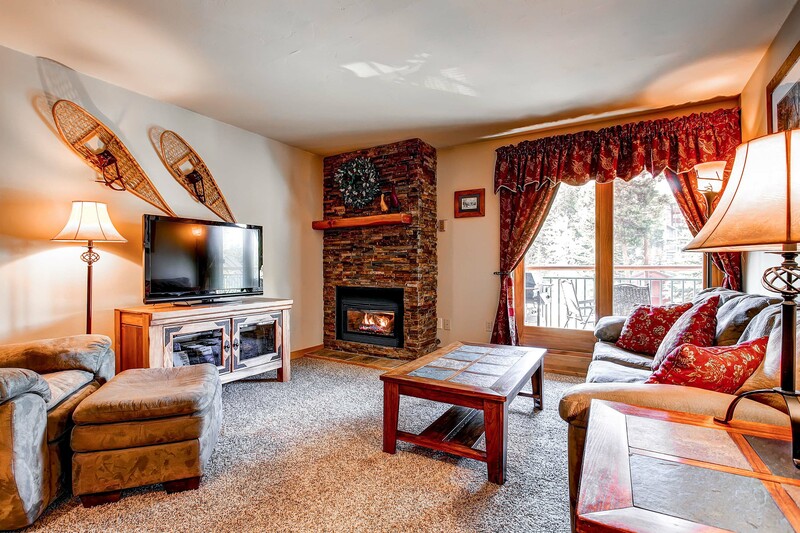 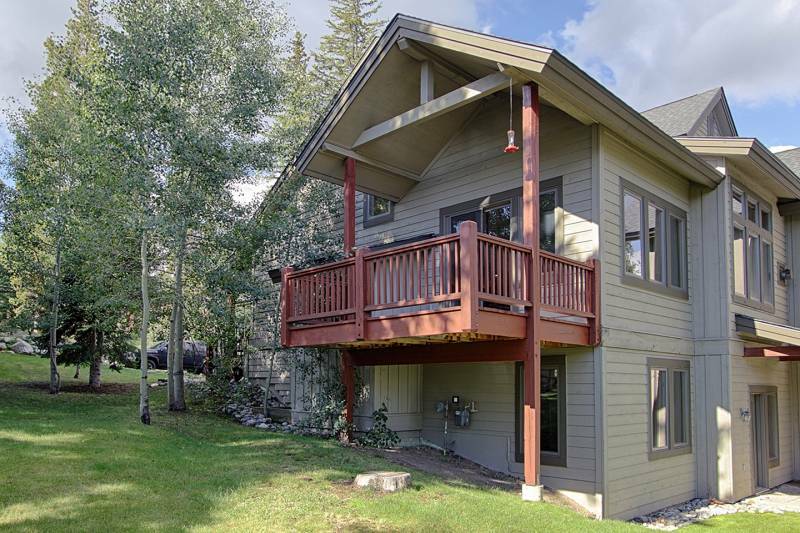 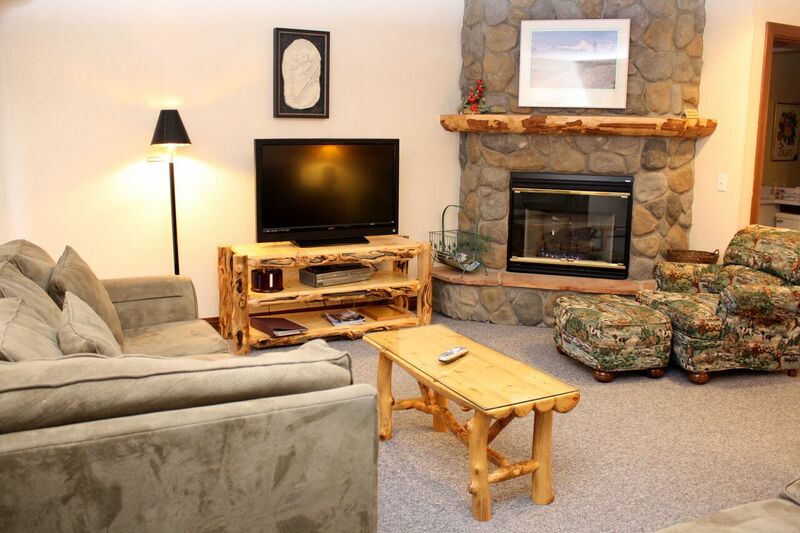 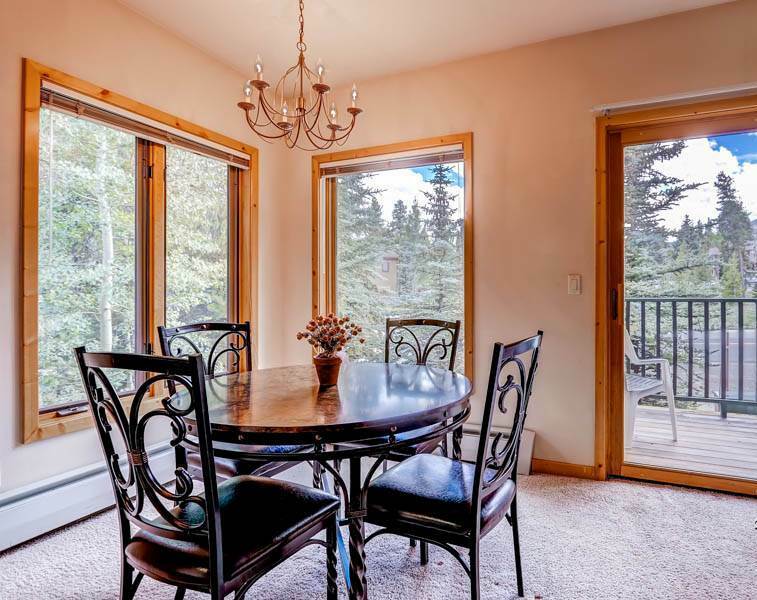 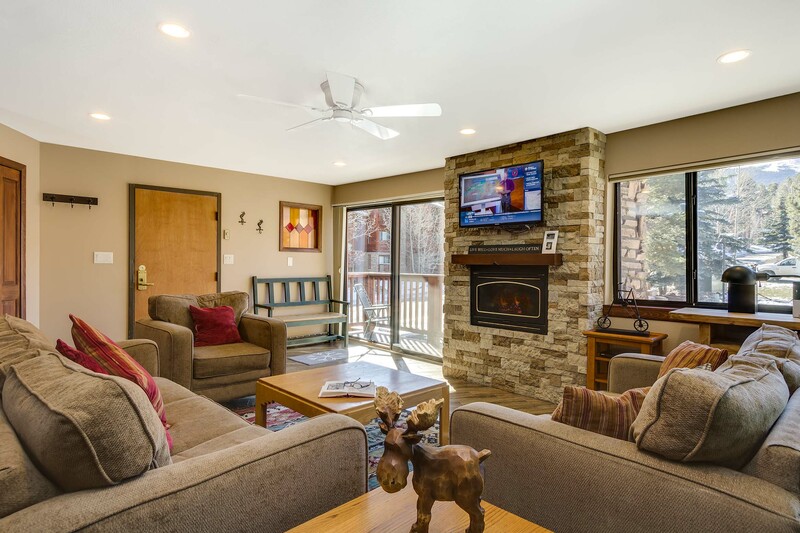 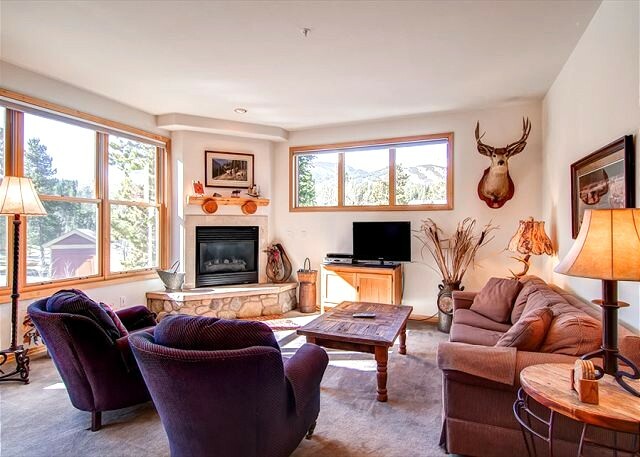 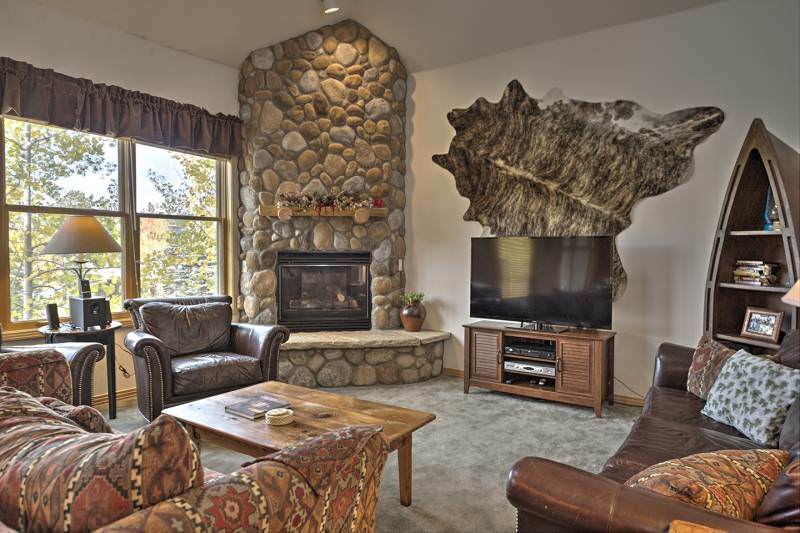 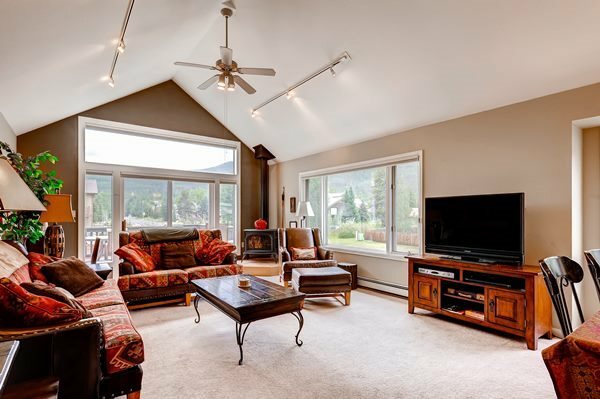 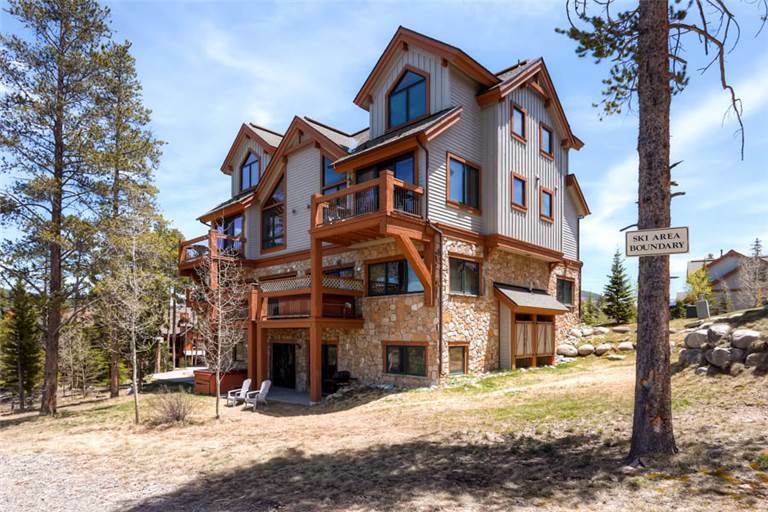 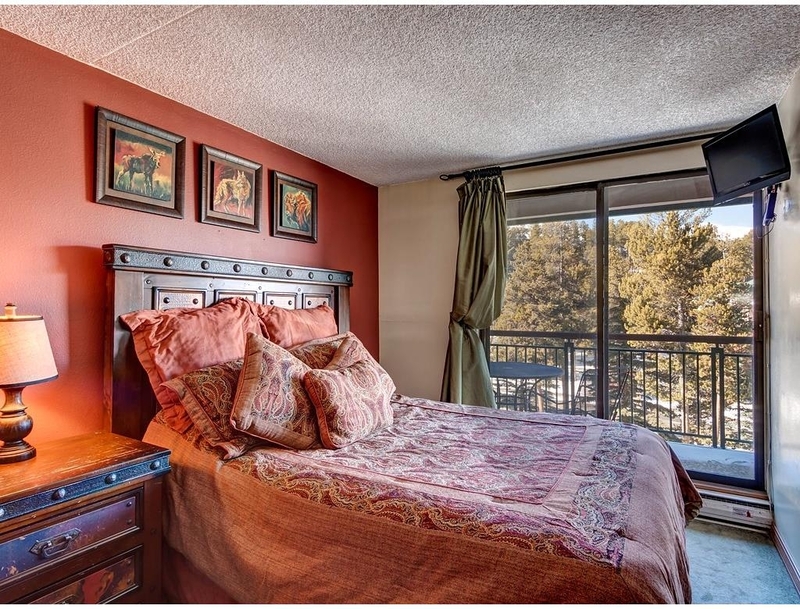 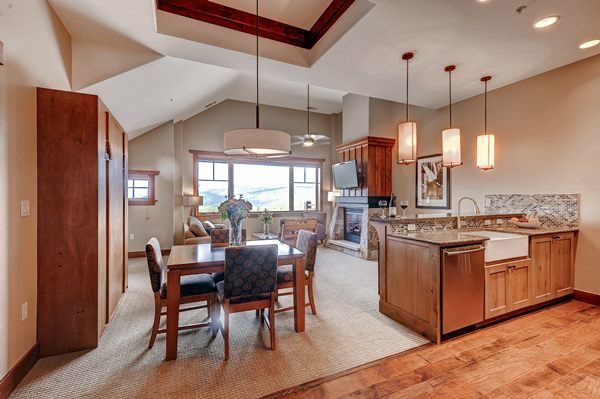 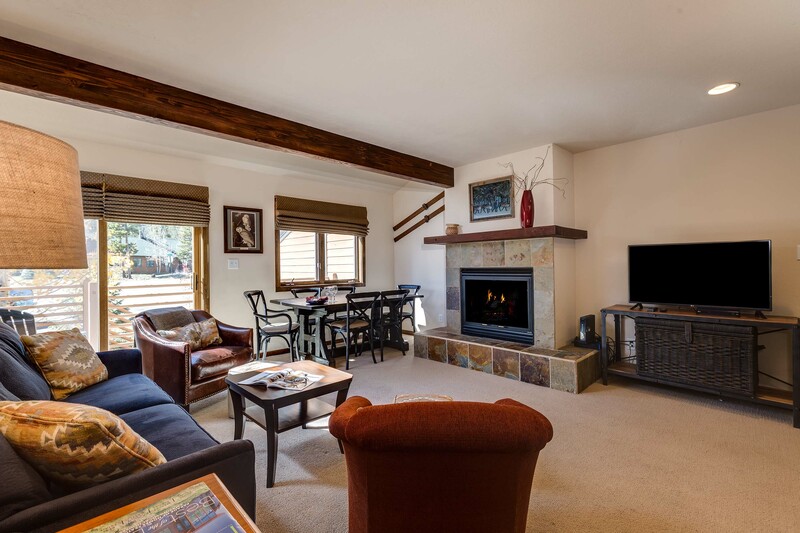 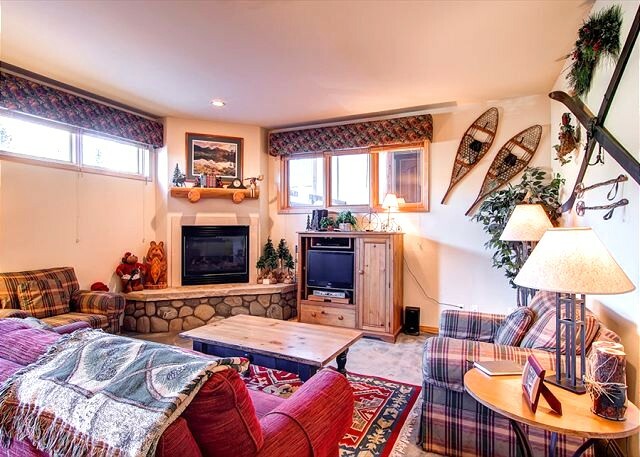 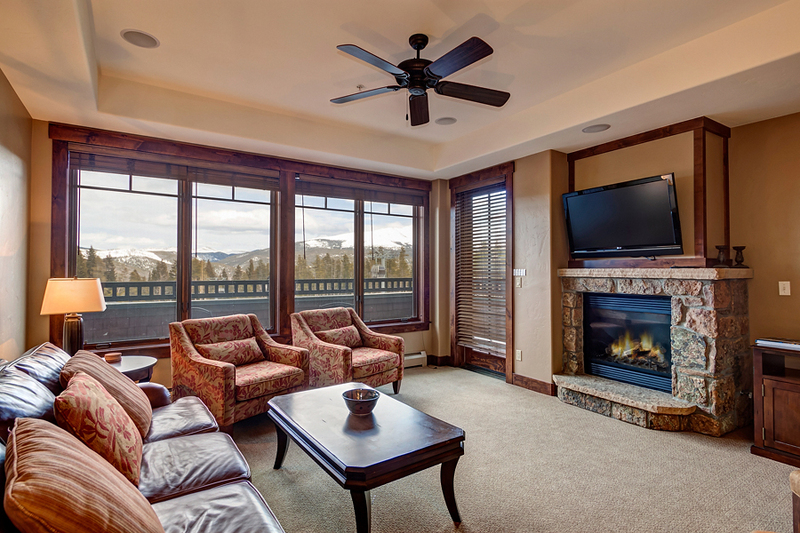 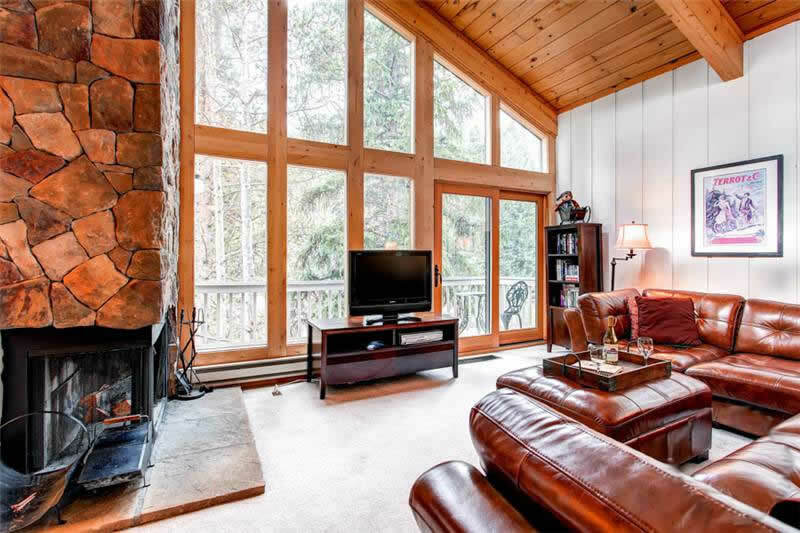 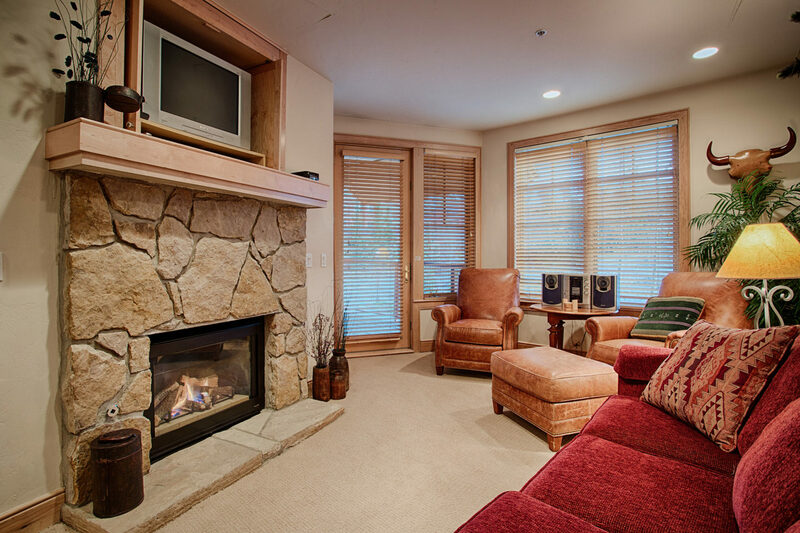 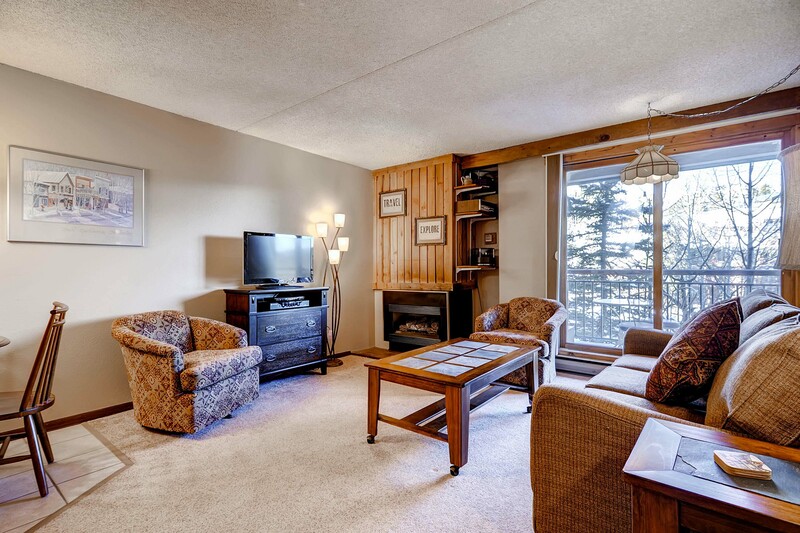 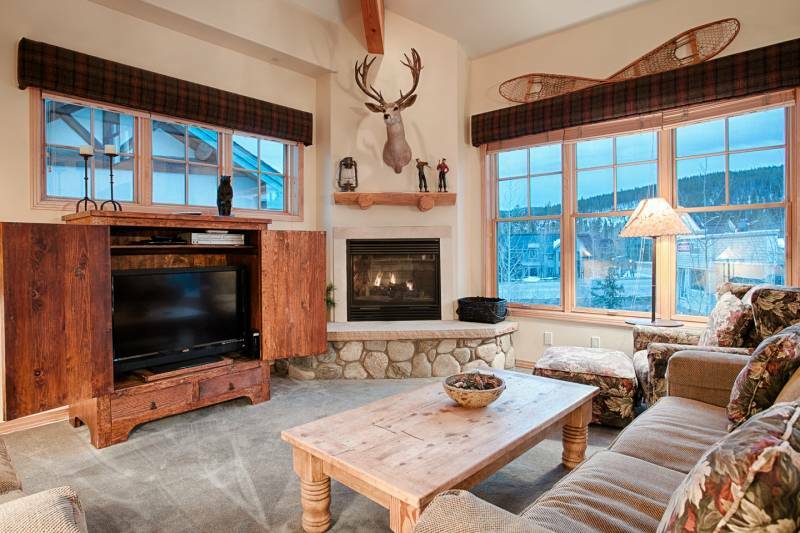 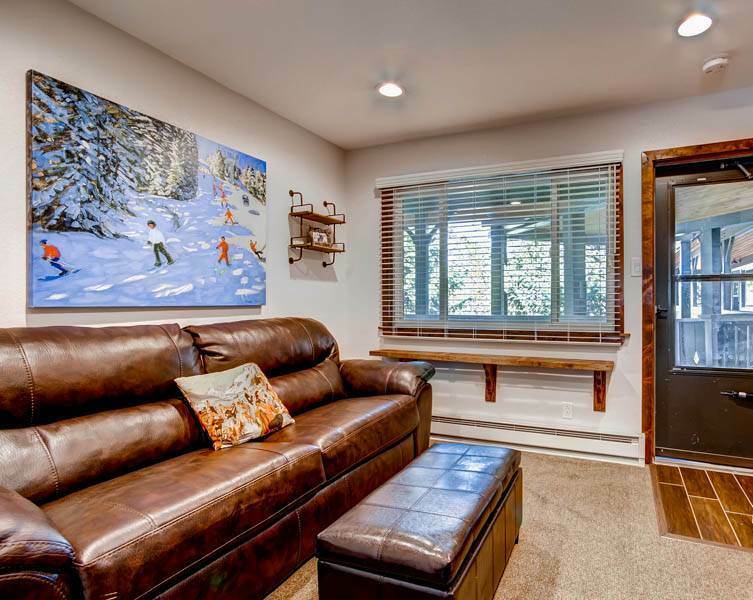 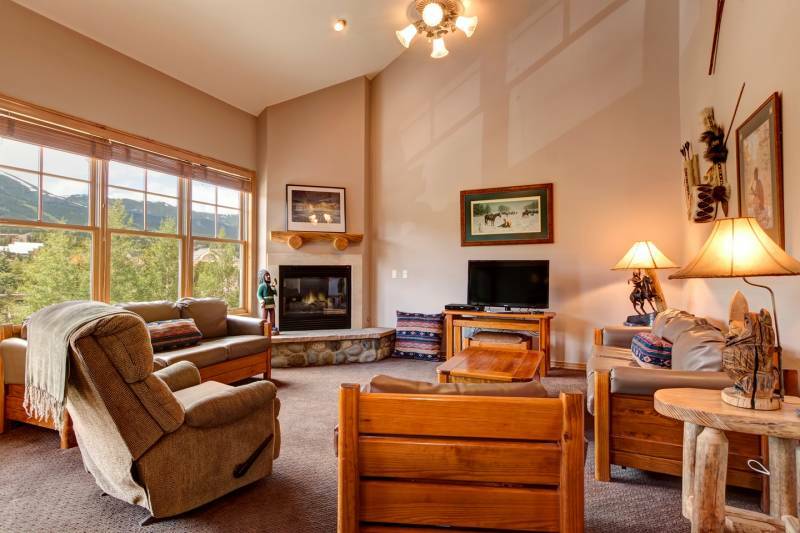 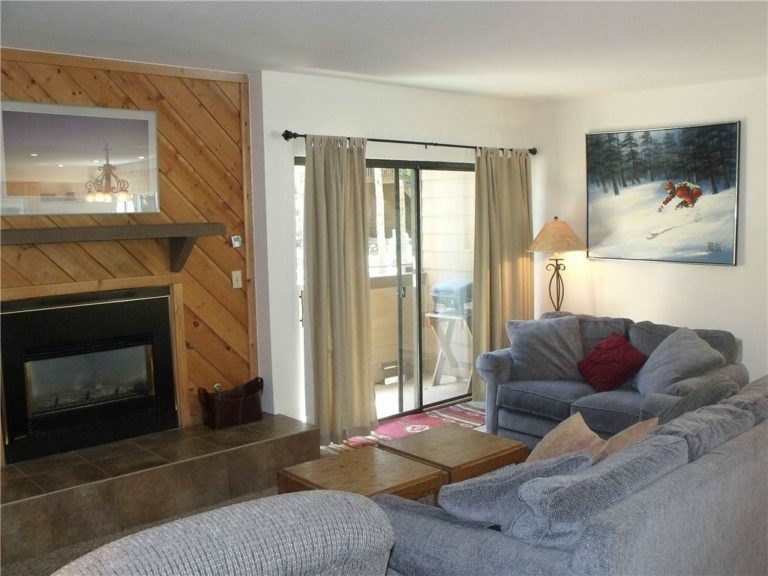 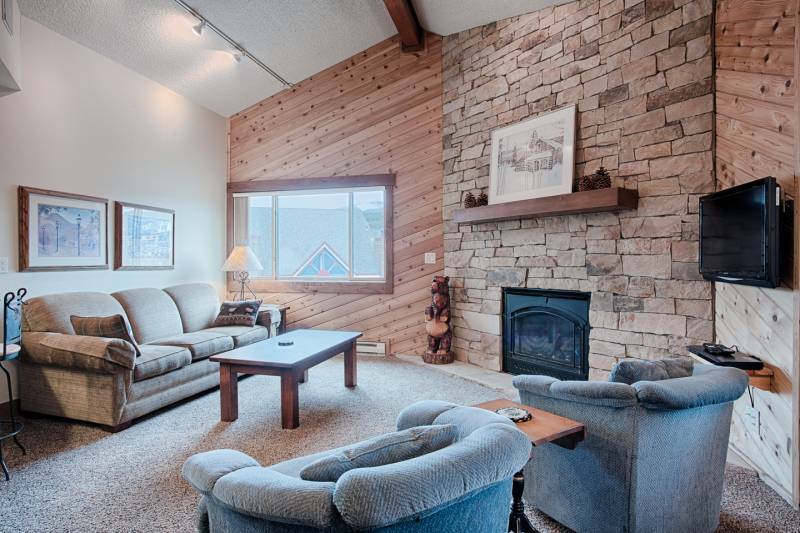 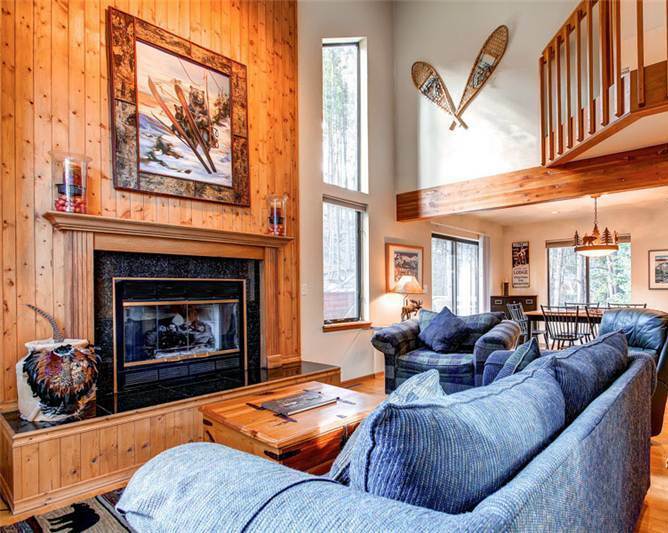 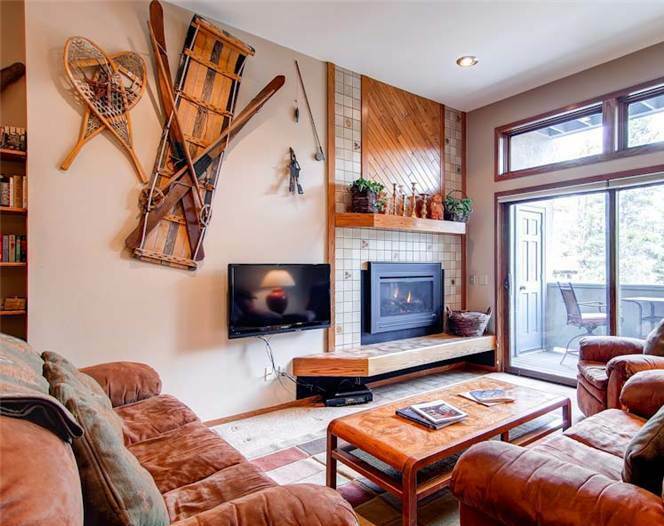 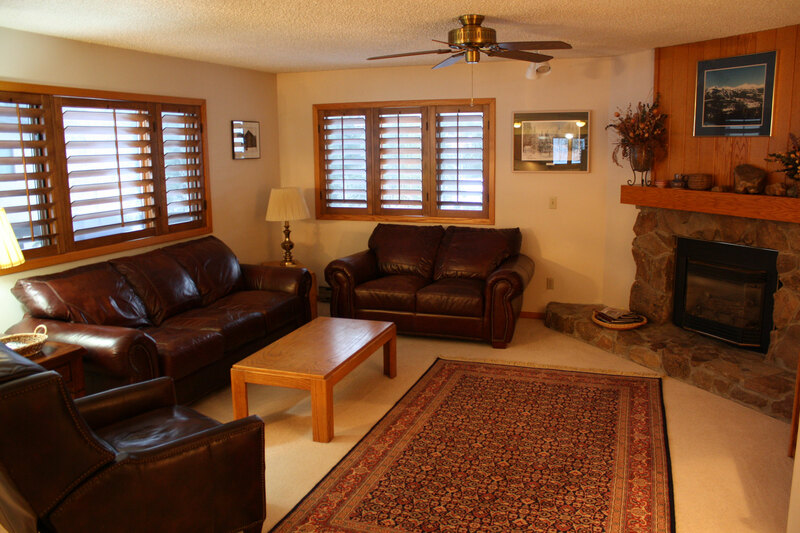 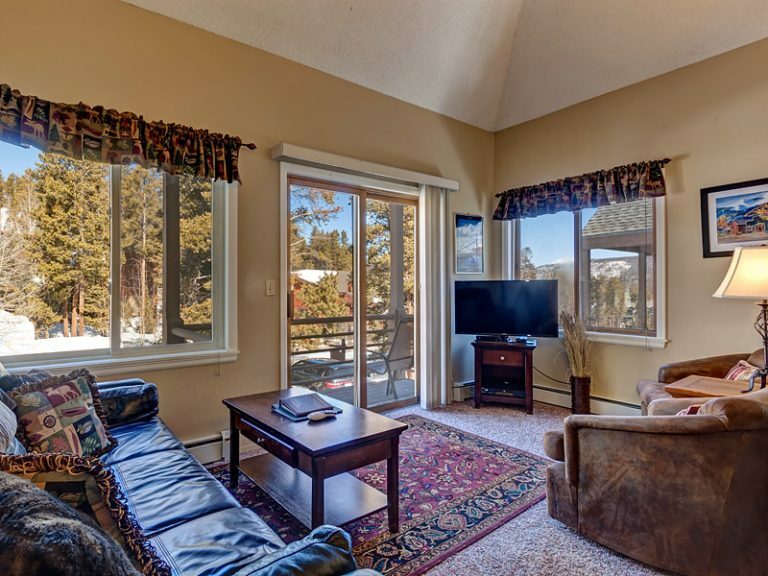 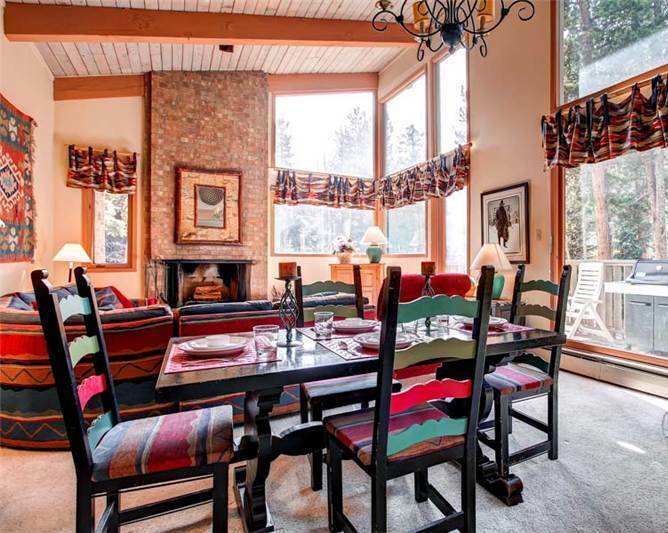 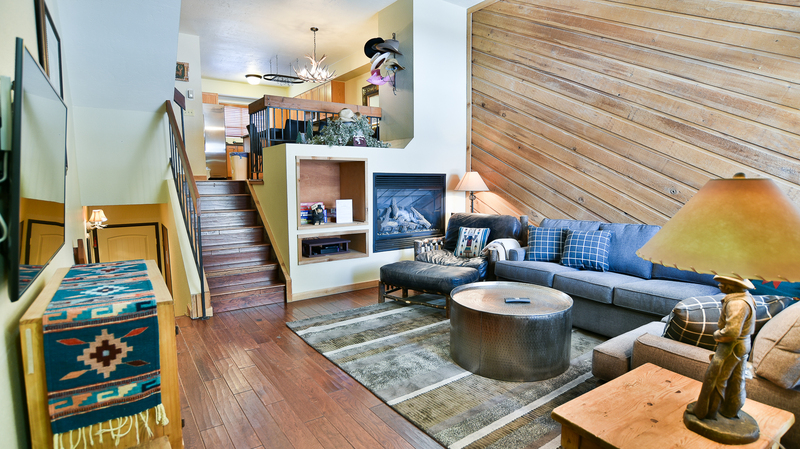 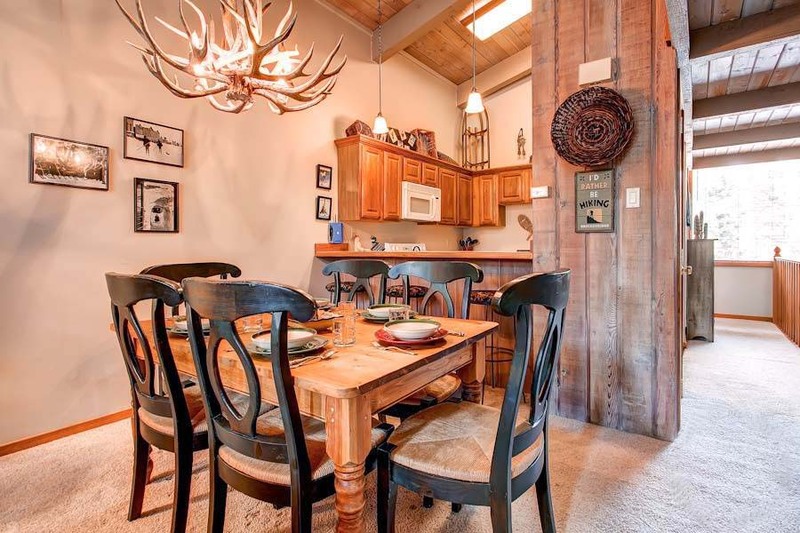 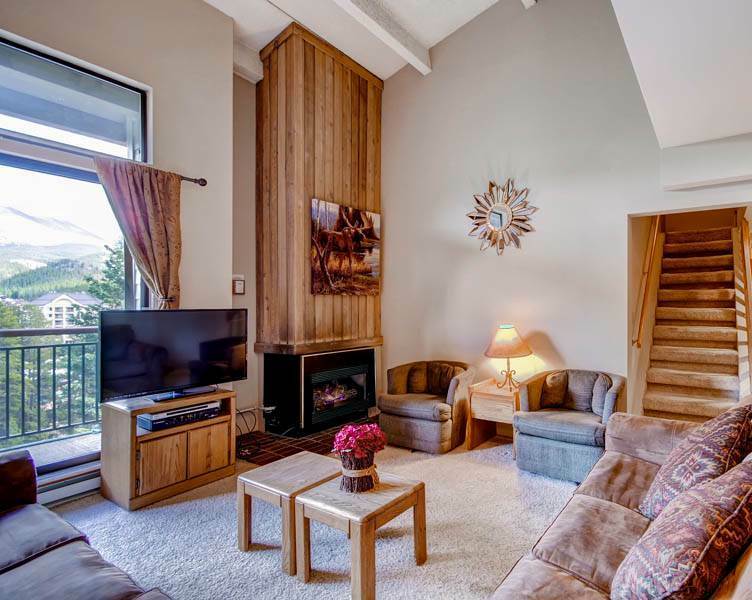 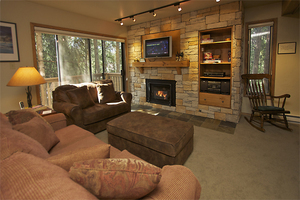 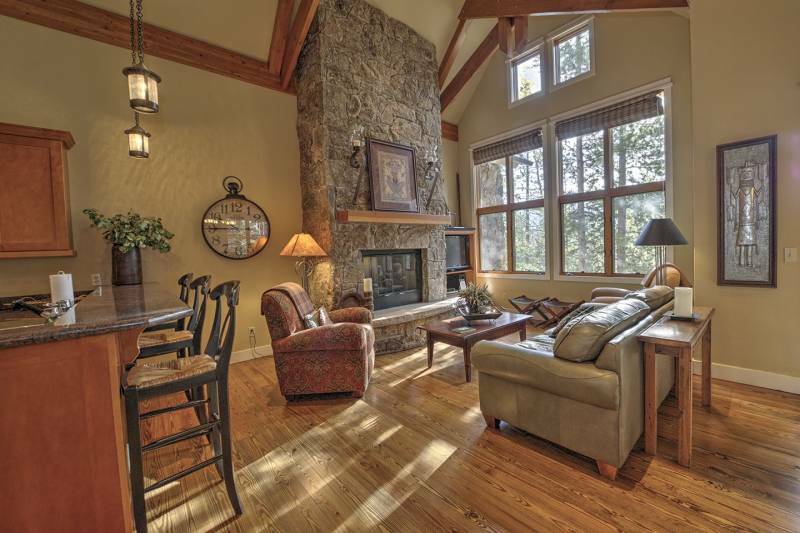 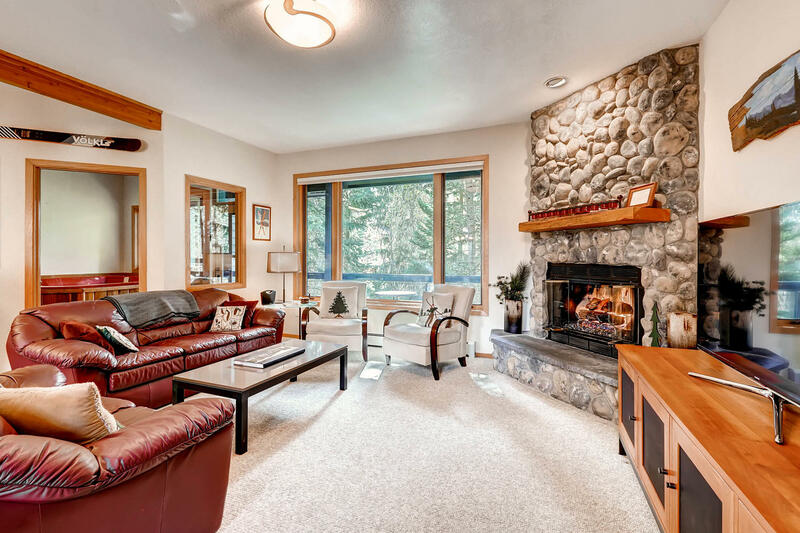 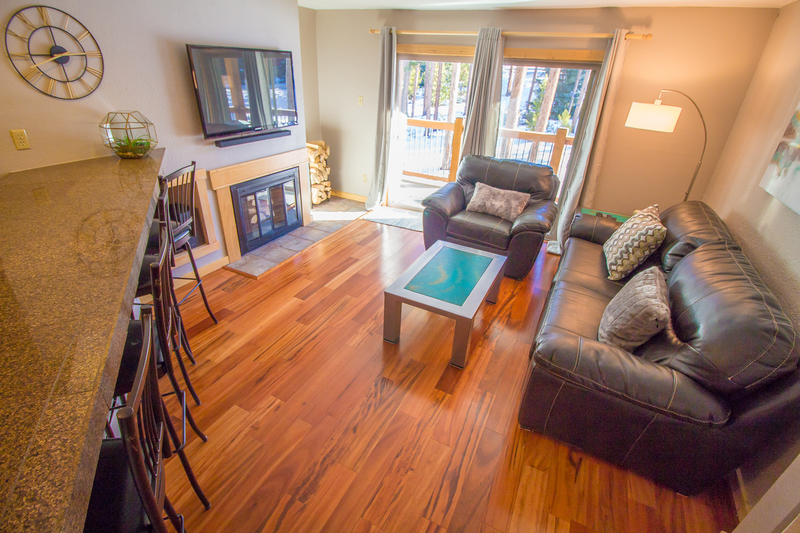 This secluded and spacious cabin in the woods is a wonderful escape for your Breckenridge vacation, yet it stands very accessible at just 3.9 miles to town directly on Ski Hill road on Peak 7. 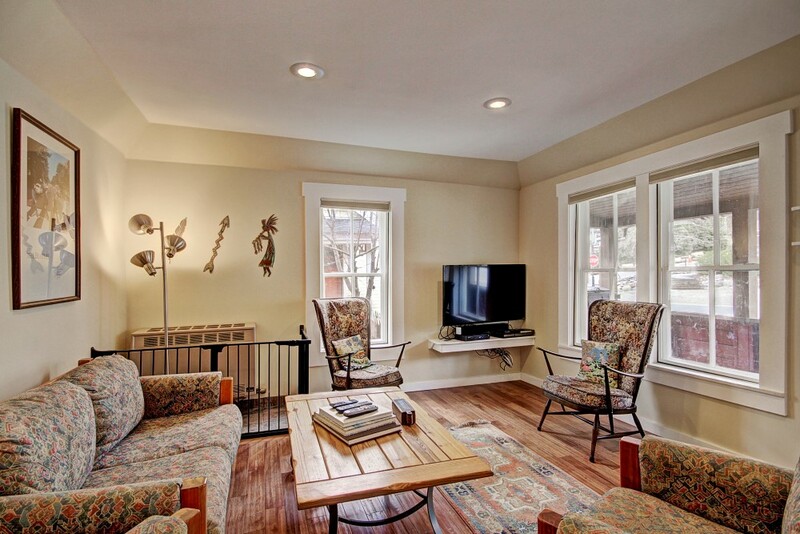 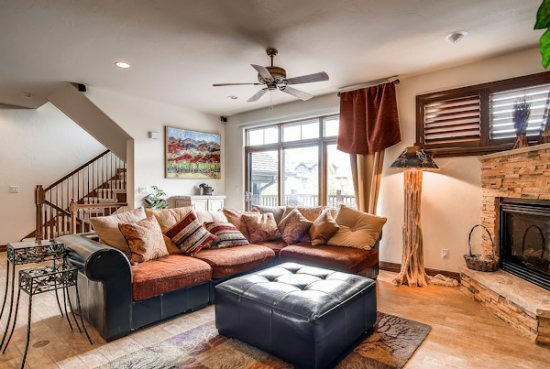 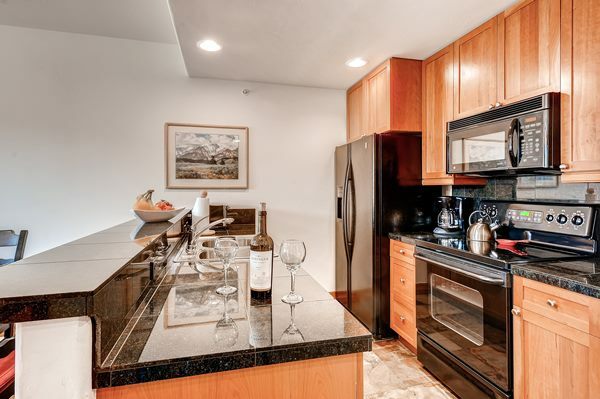 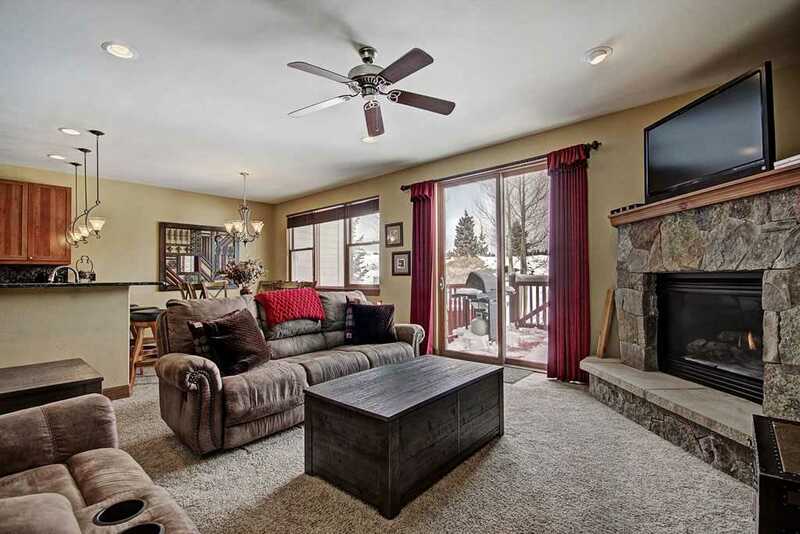 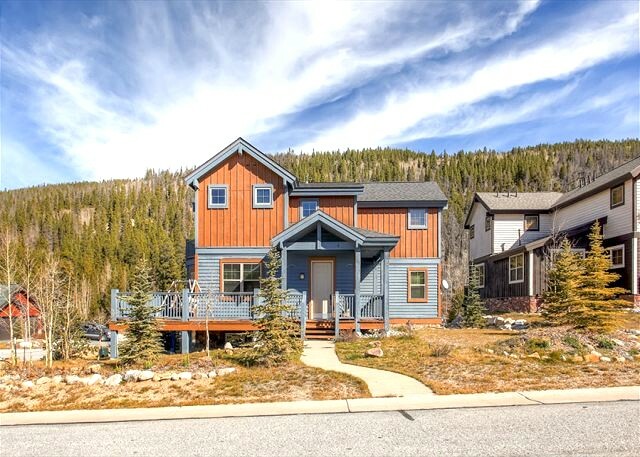 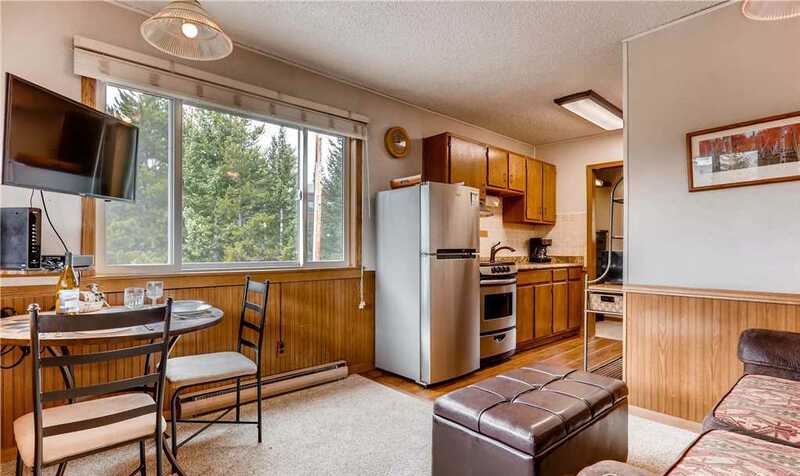 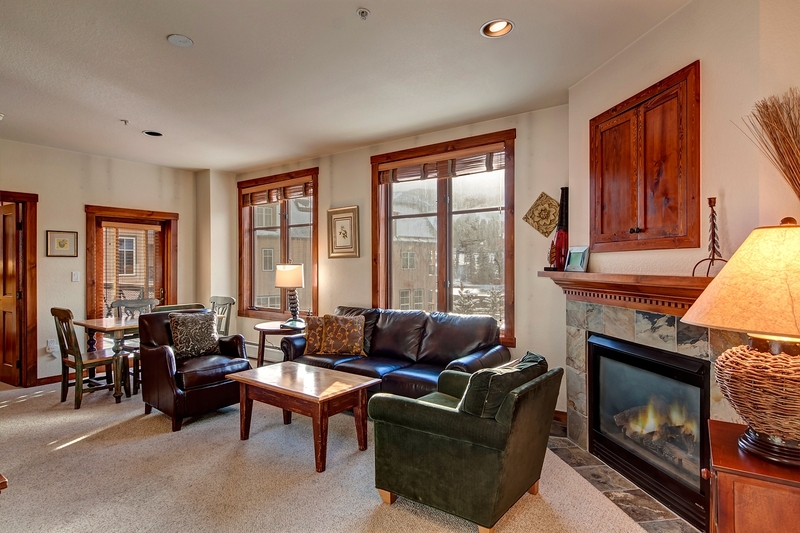 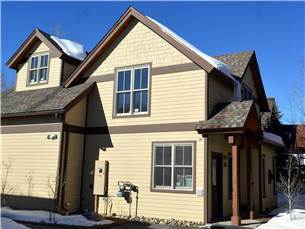 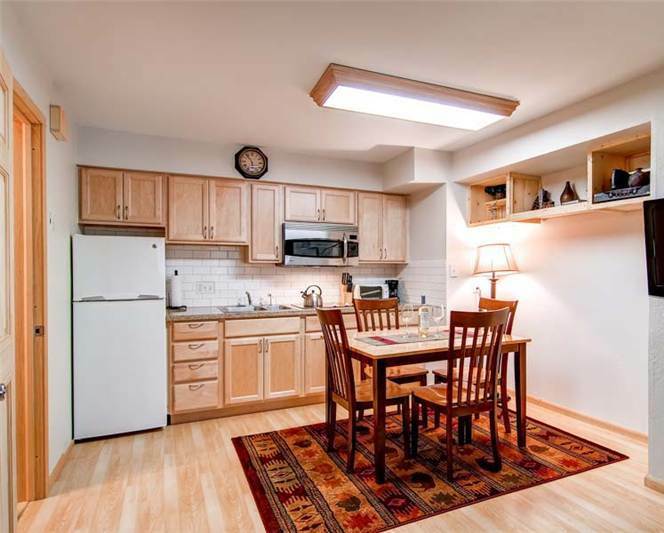 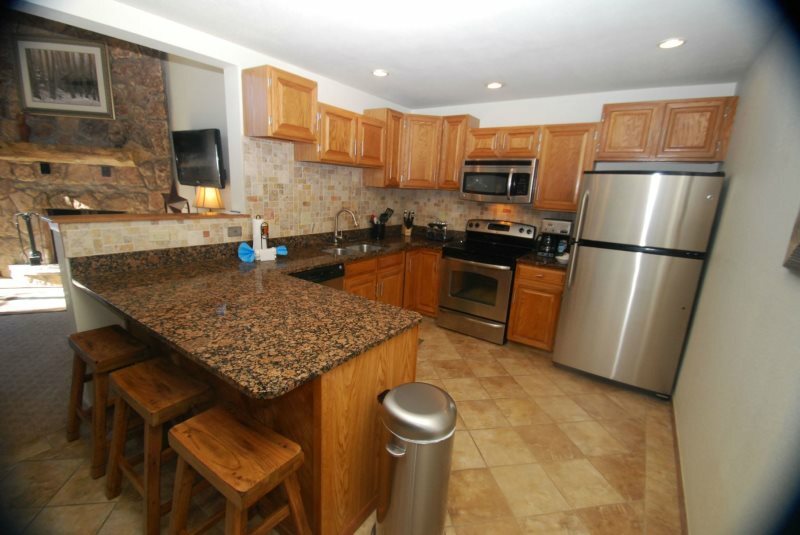 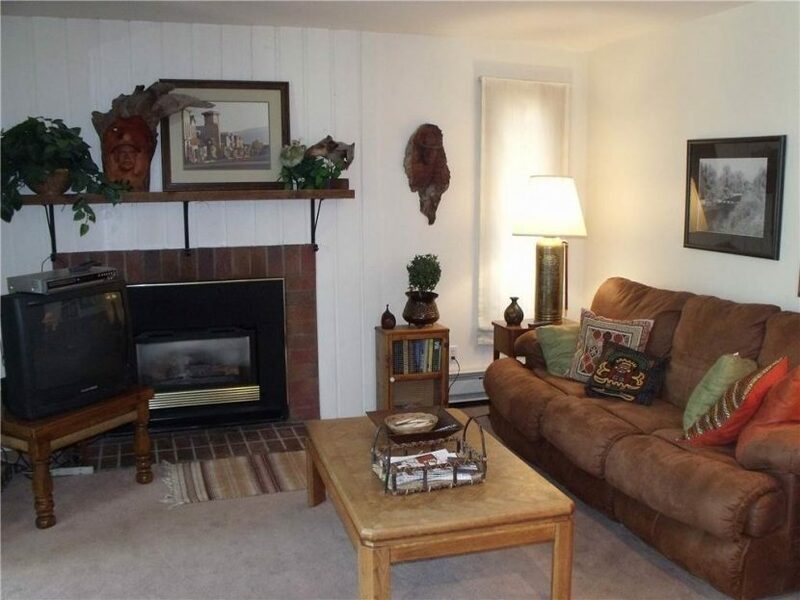 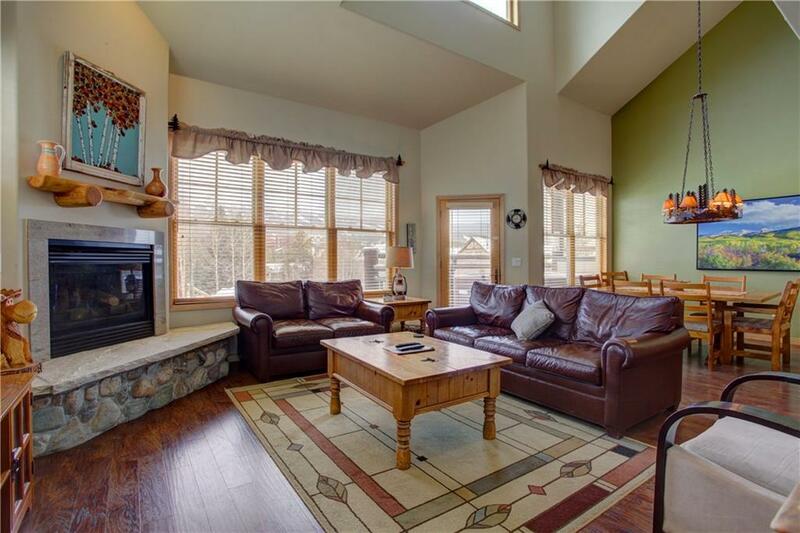 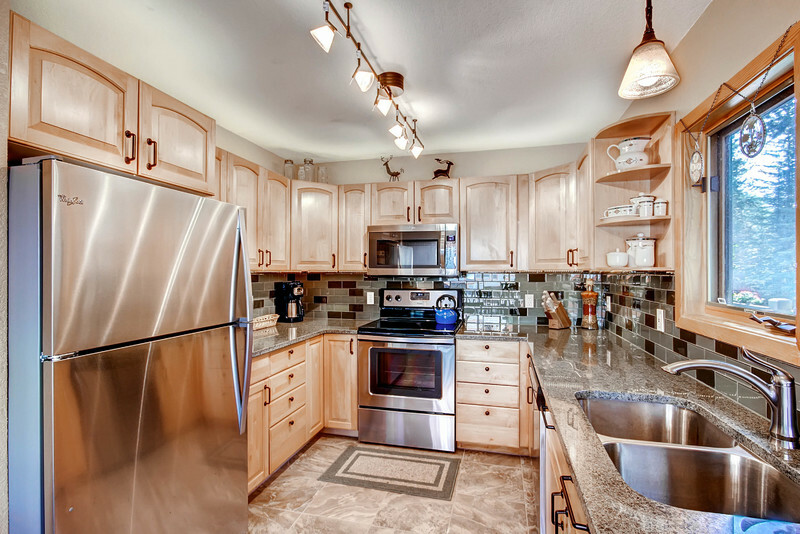 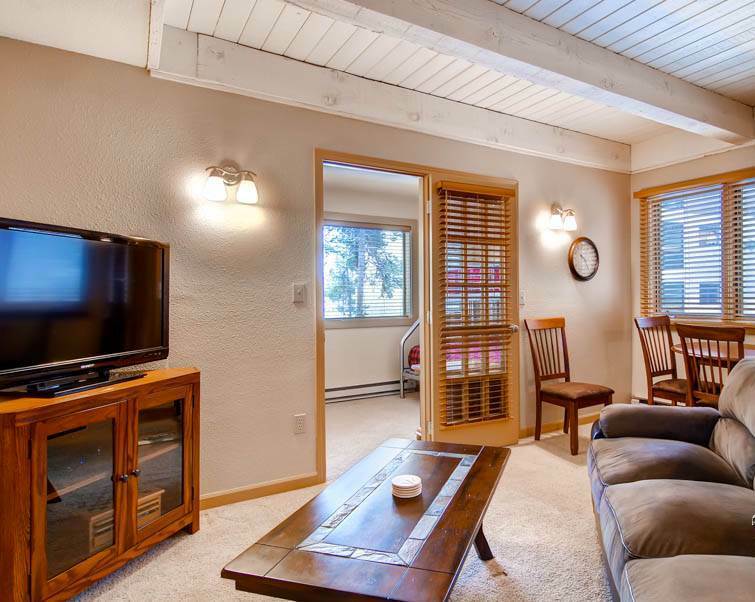 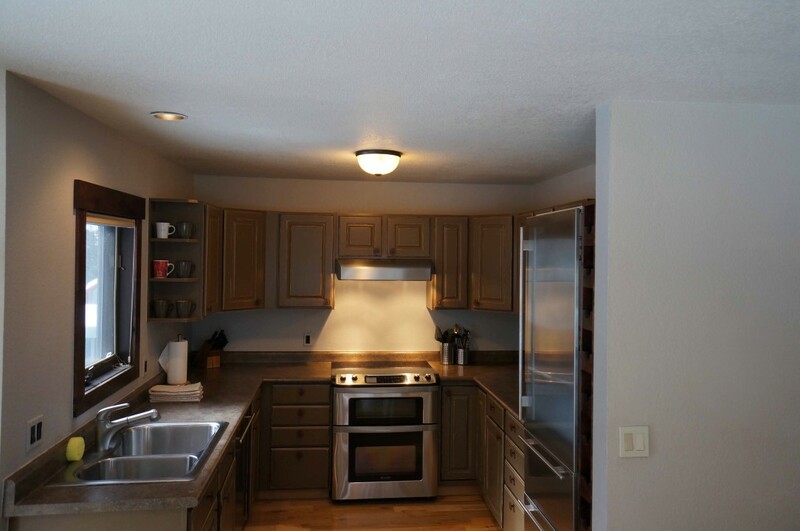 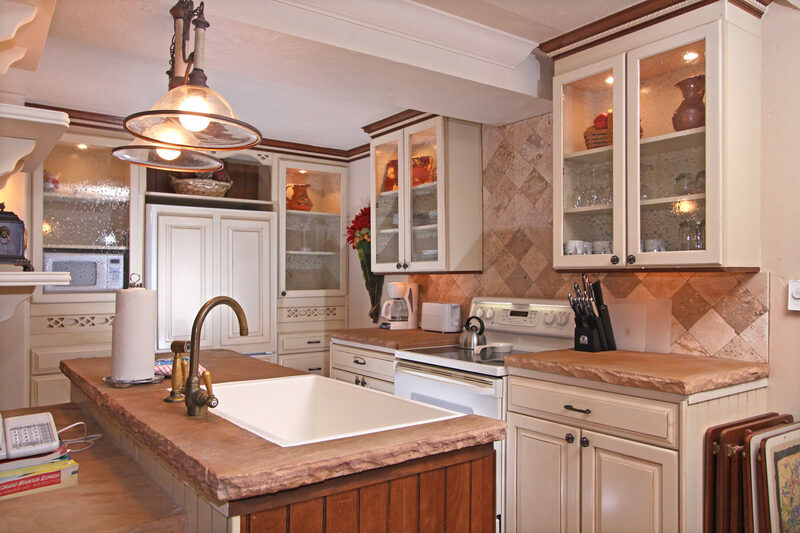 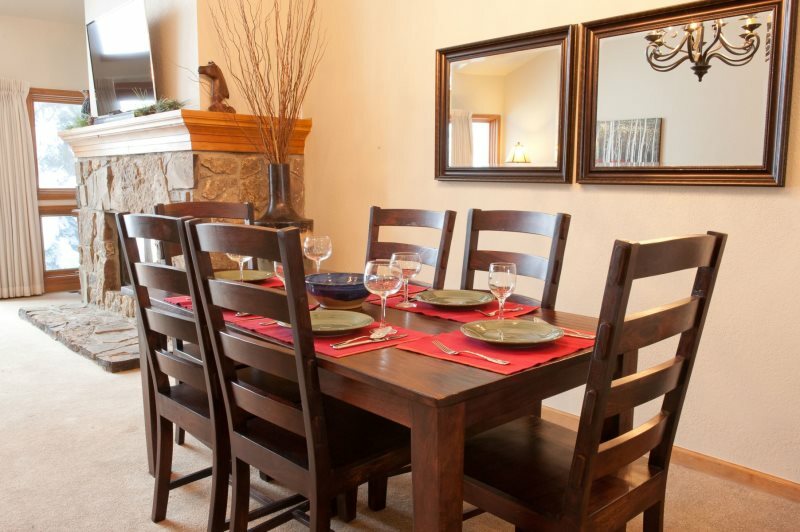 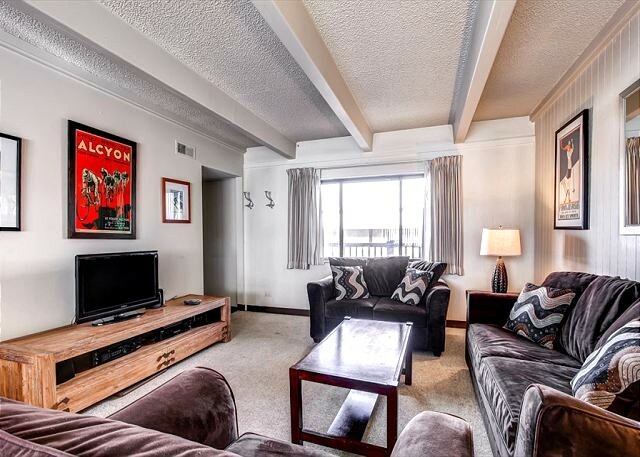 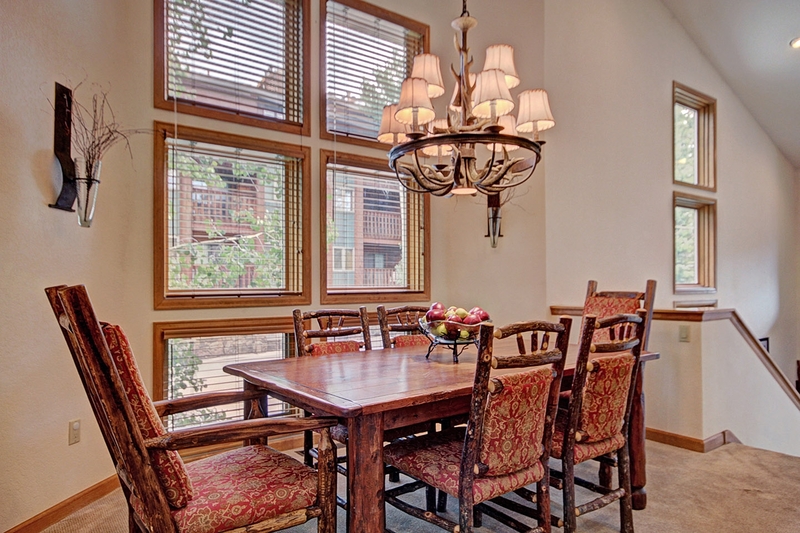 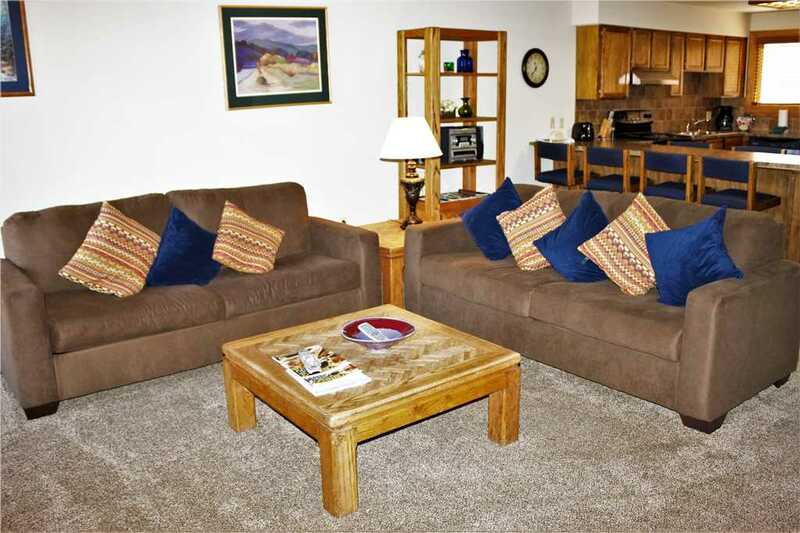 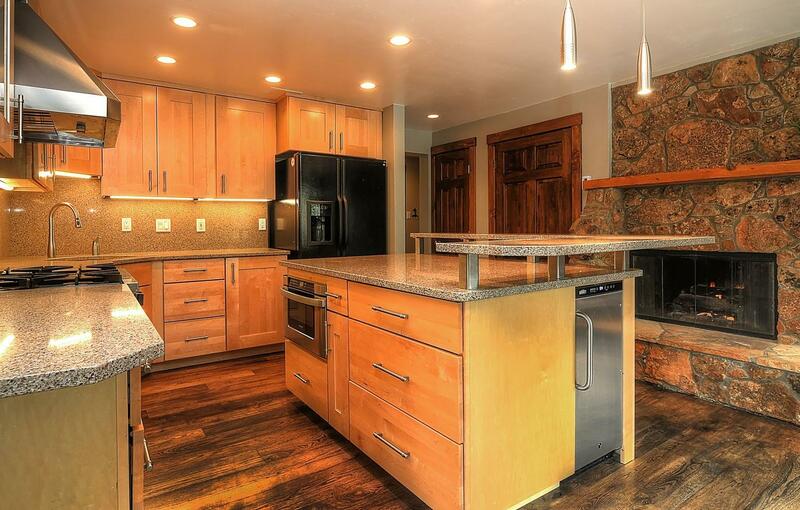 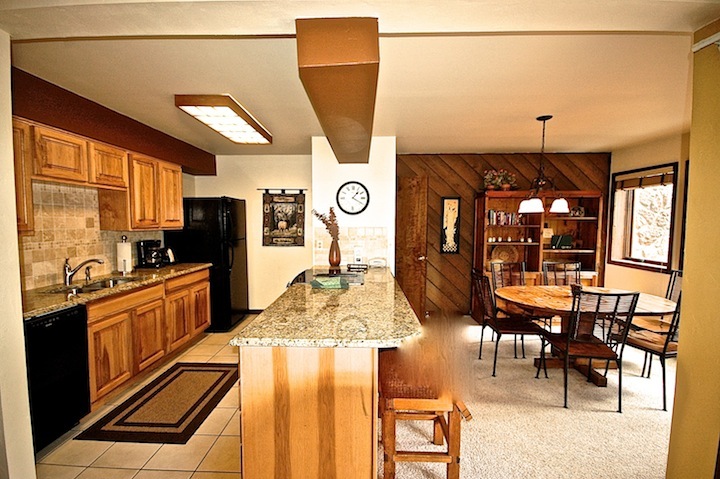 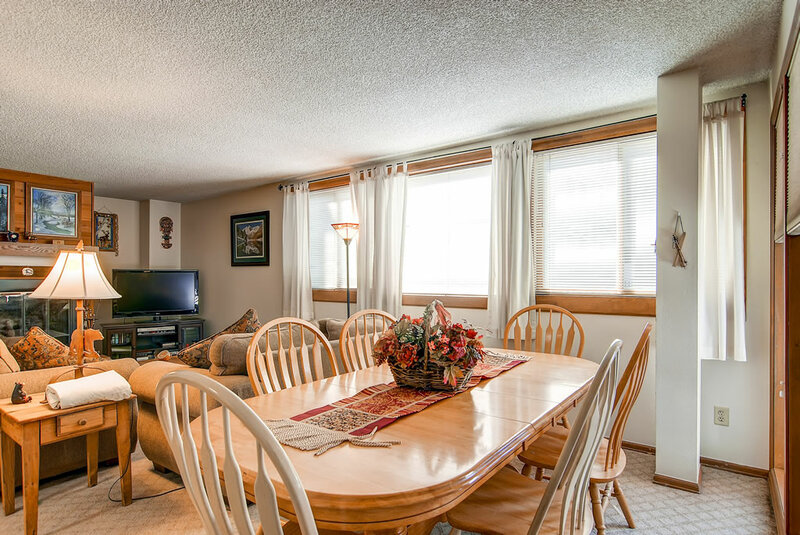 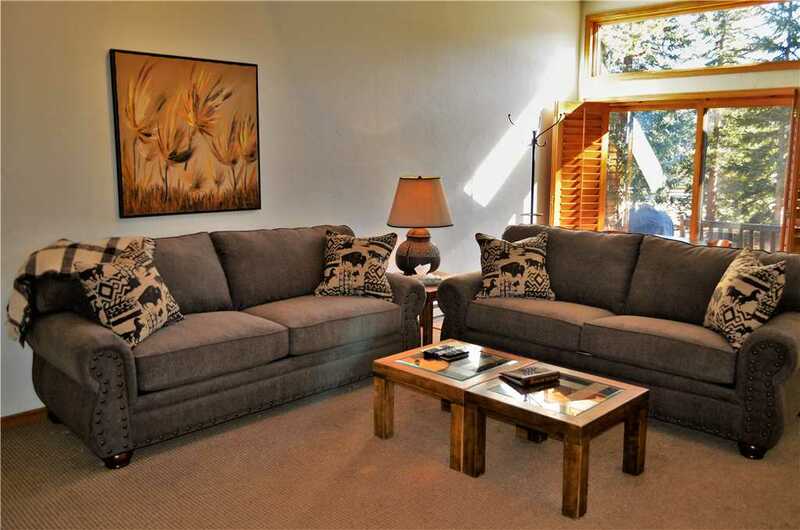 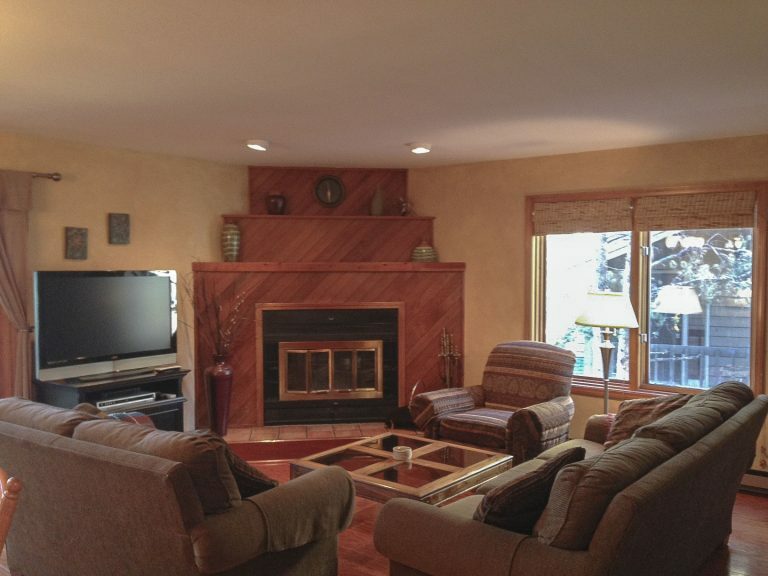 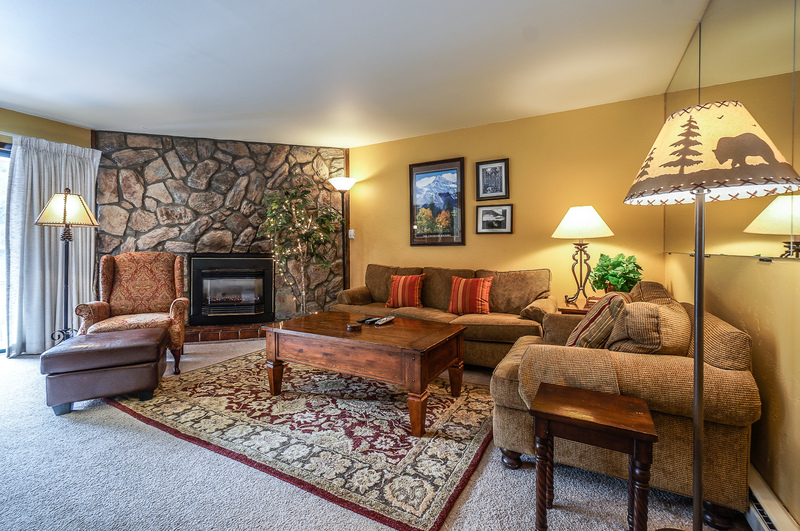 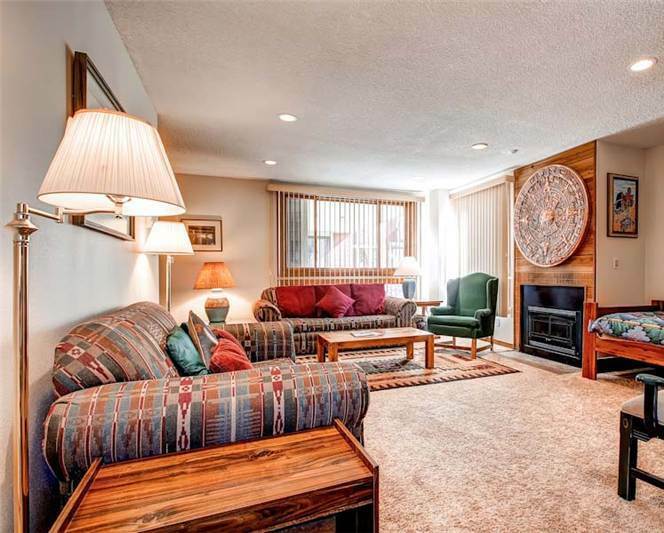 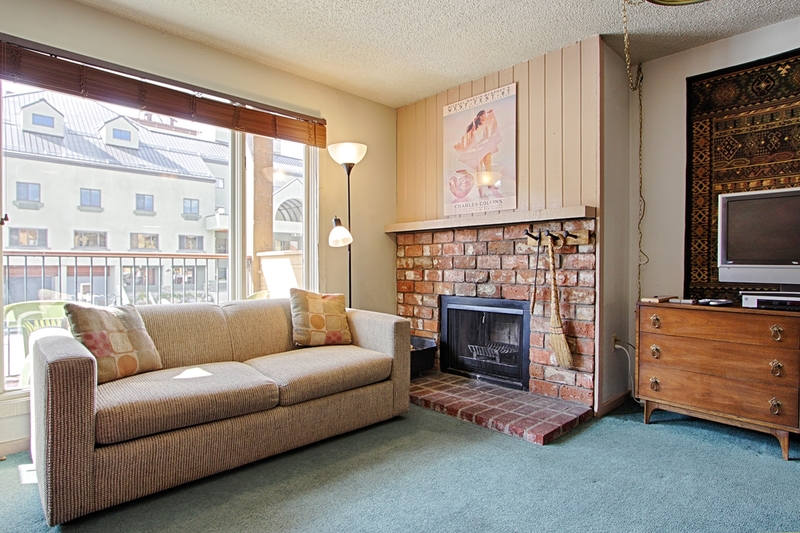 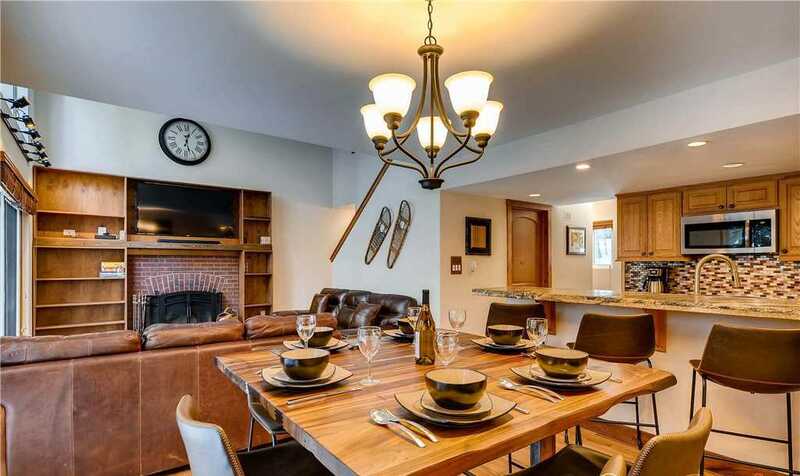 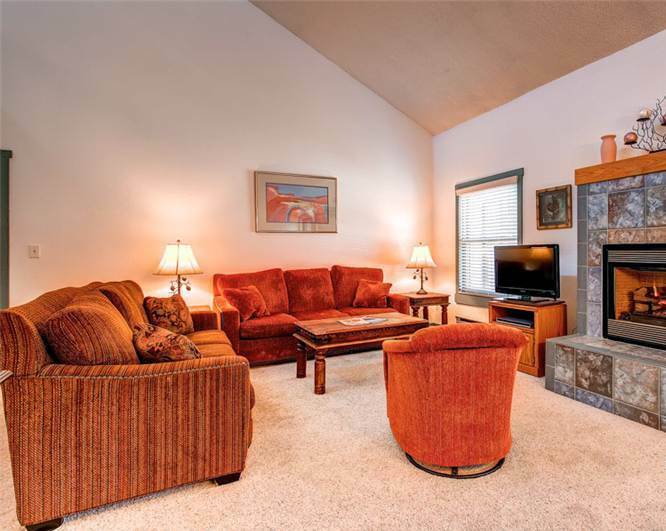 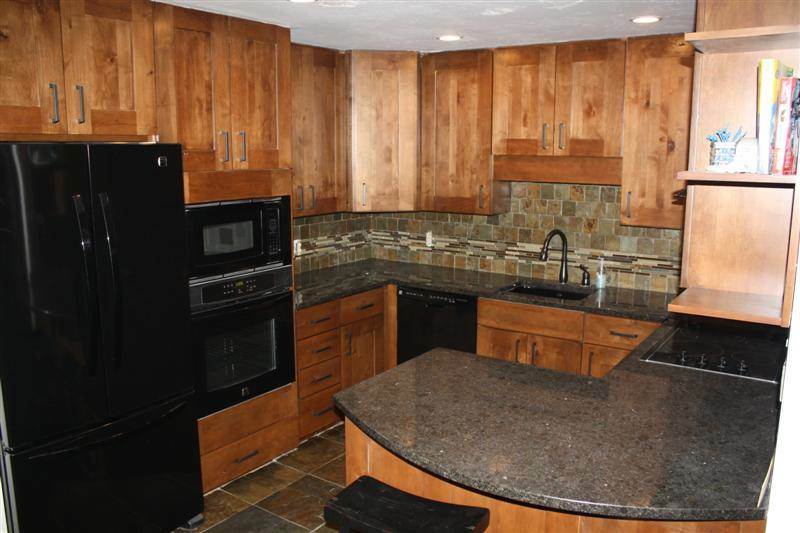 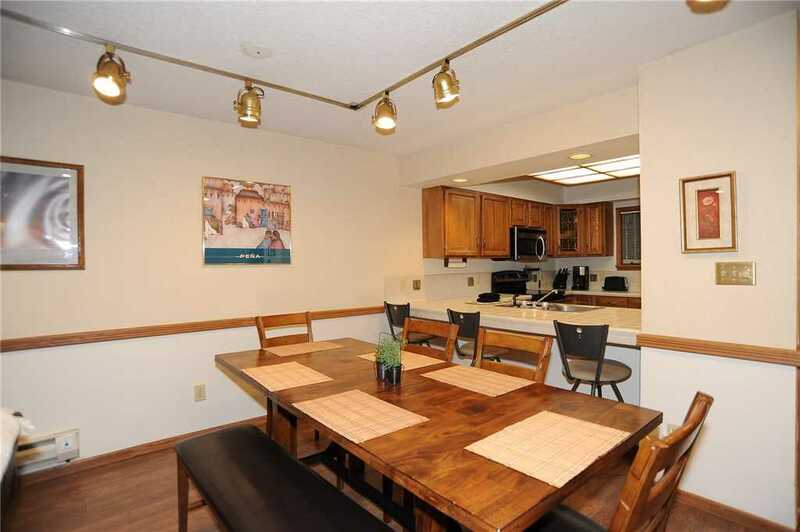 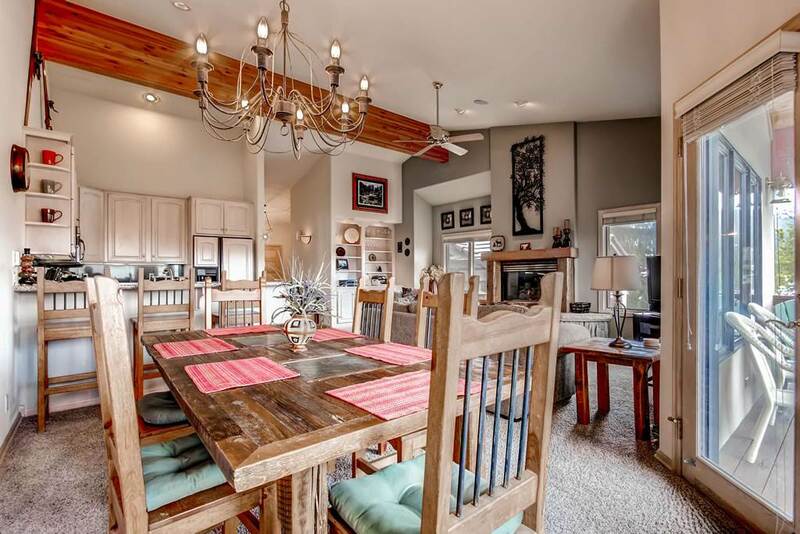 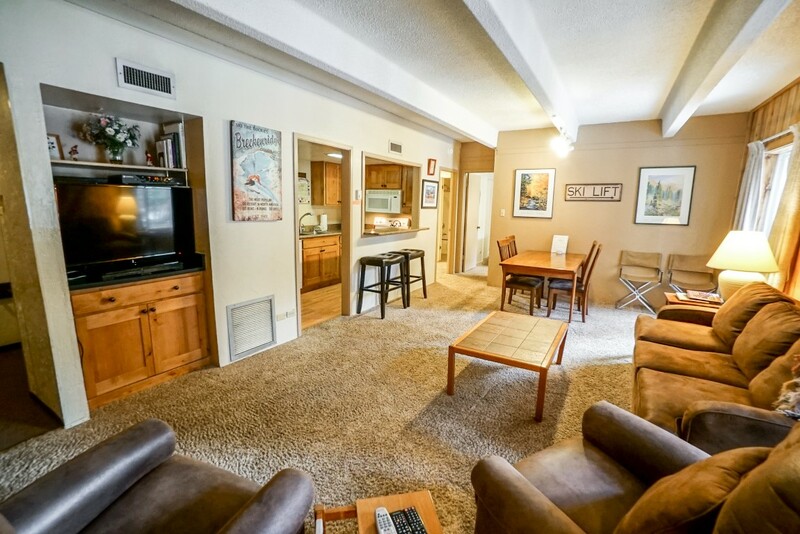 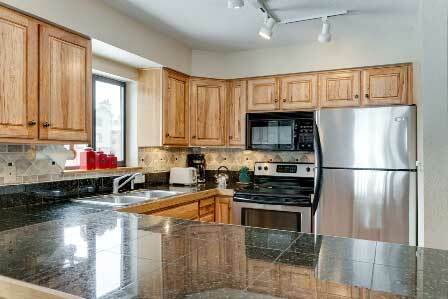 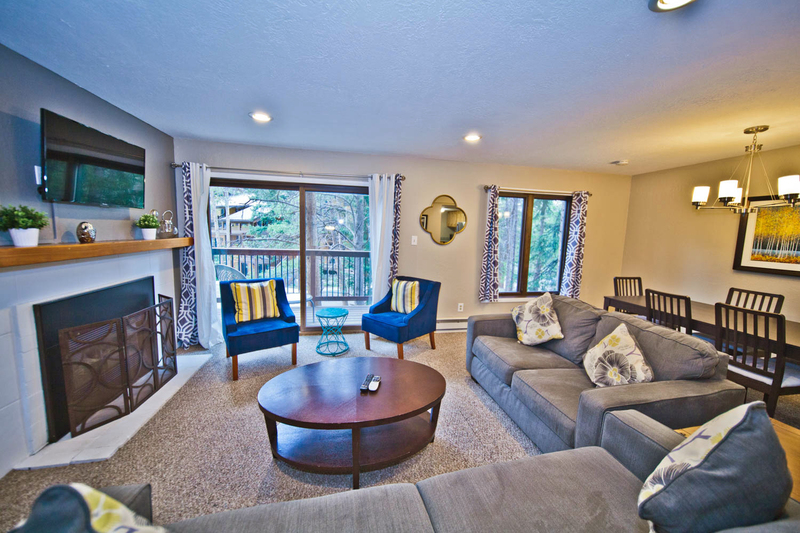 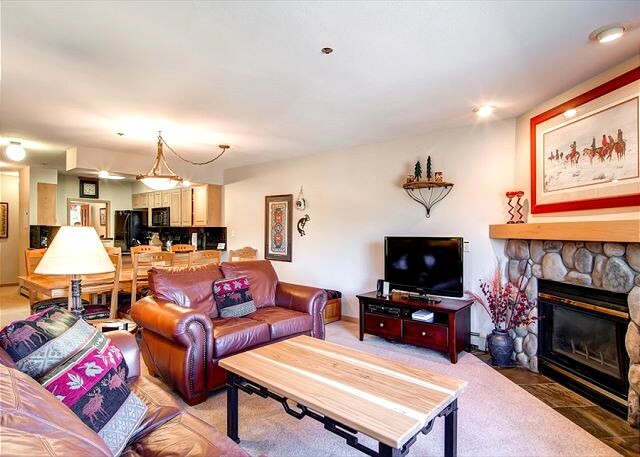 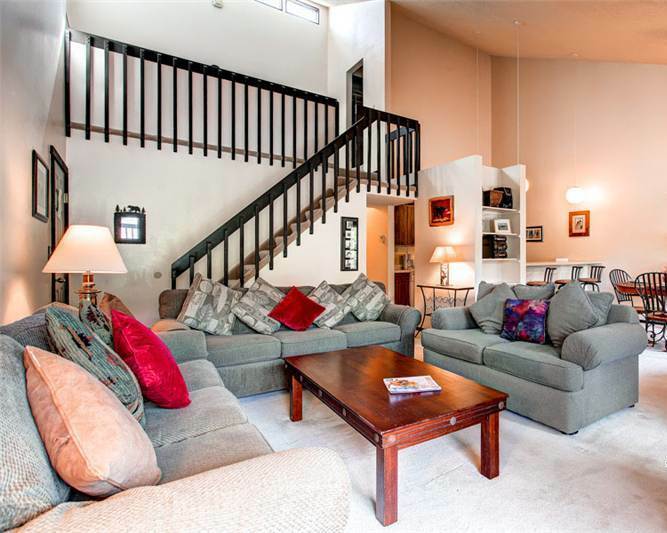 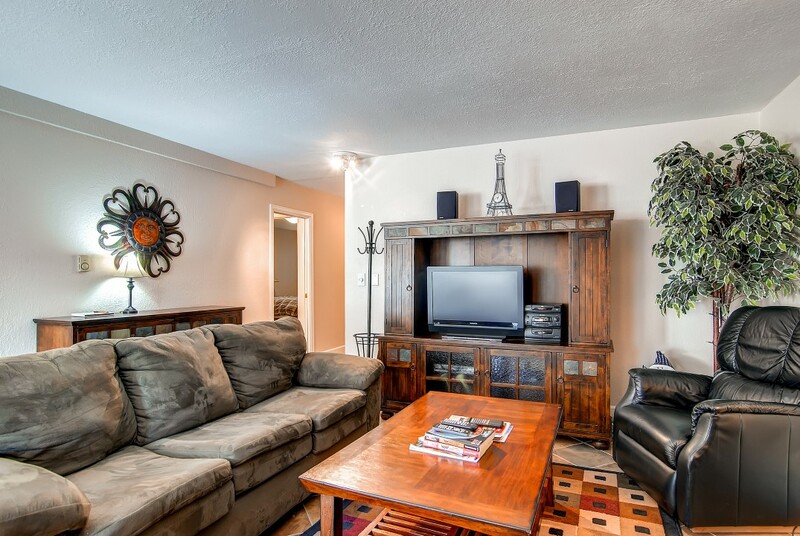 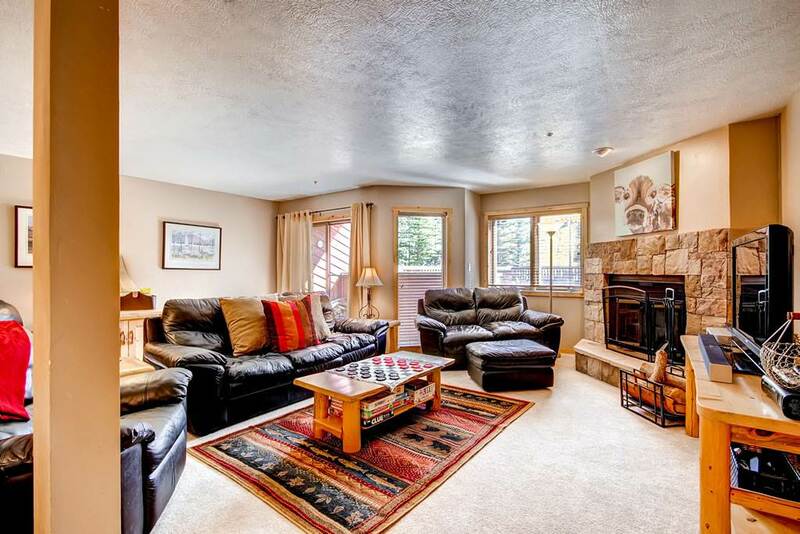 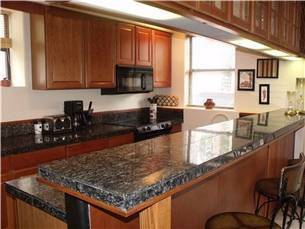 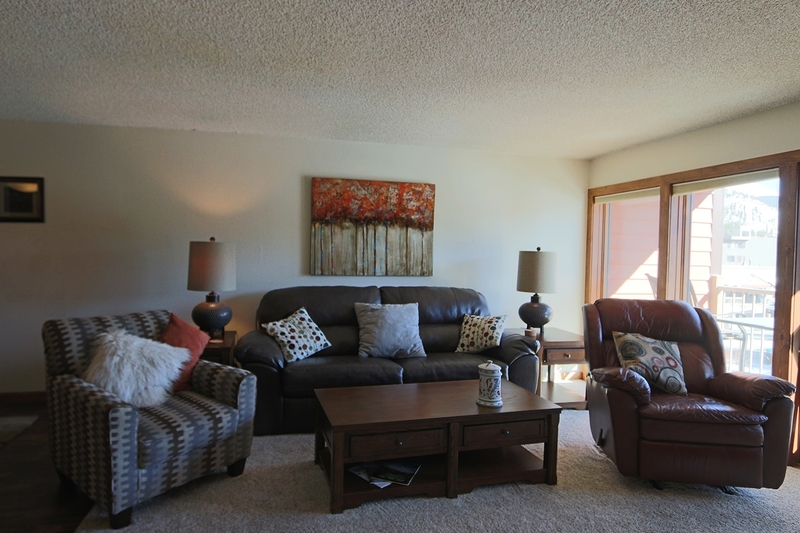 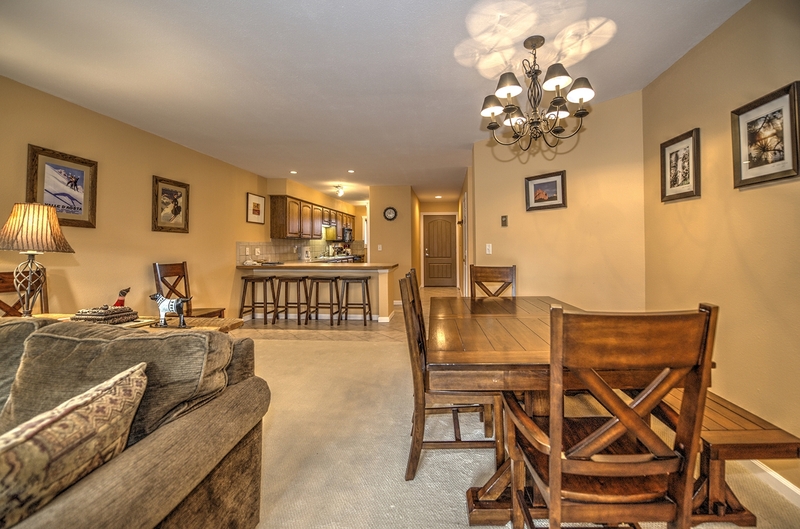 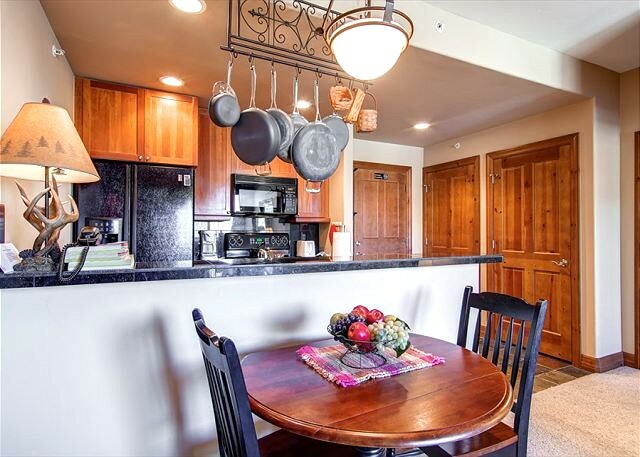 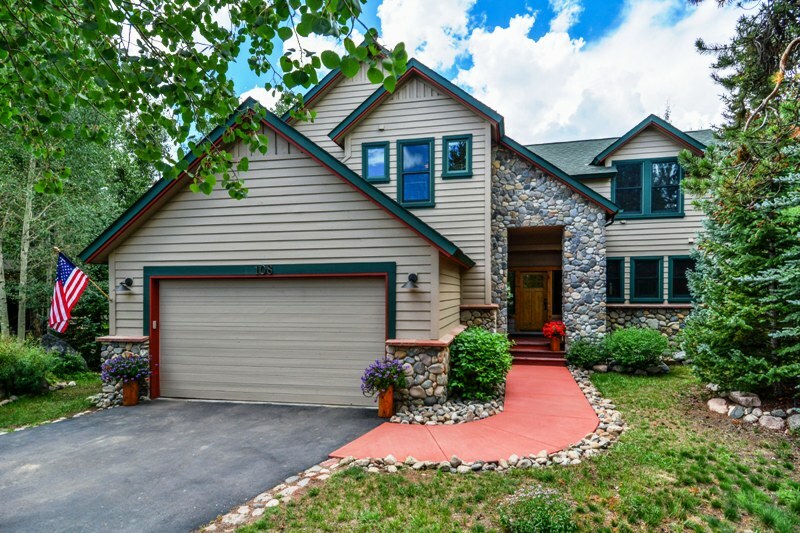 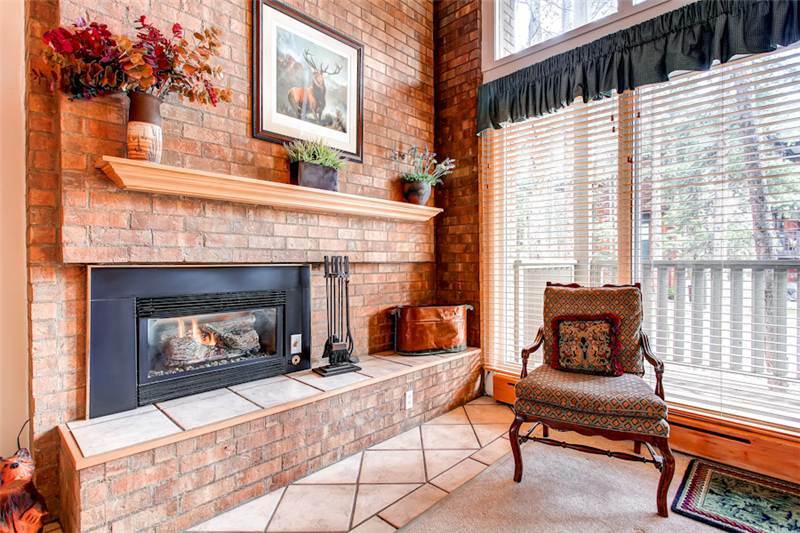 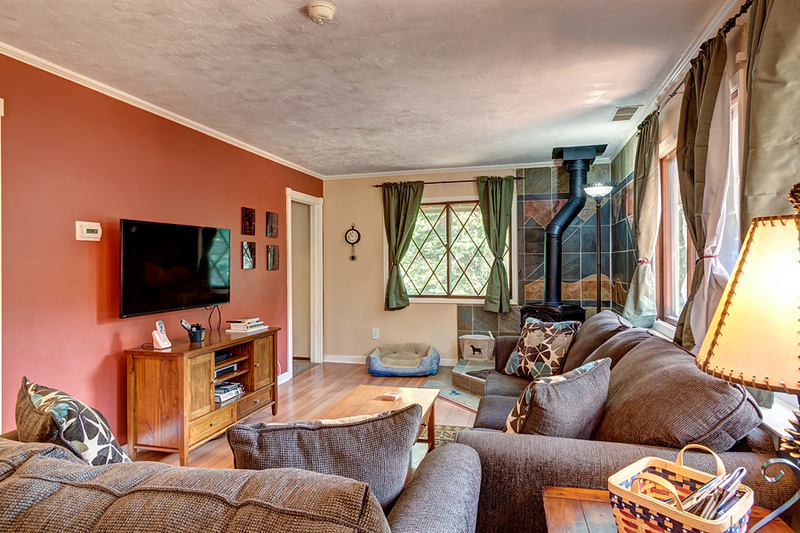 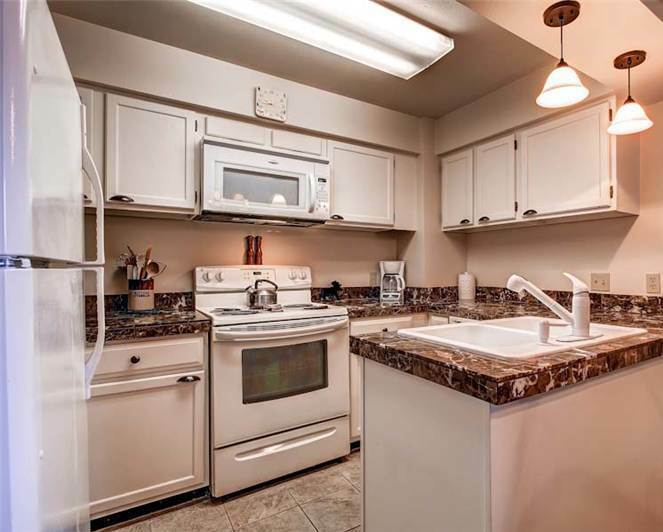 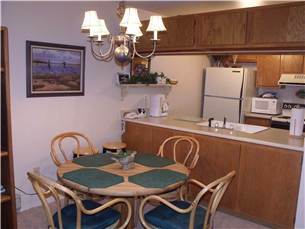 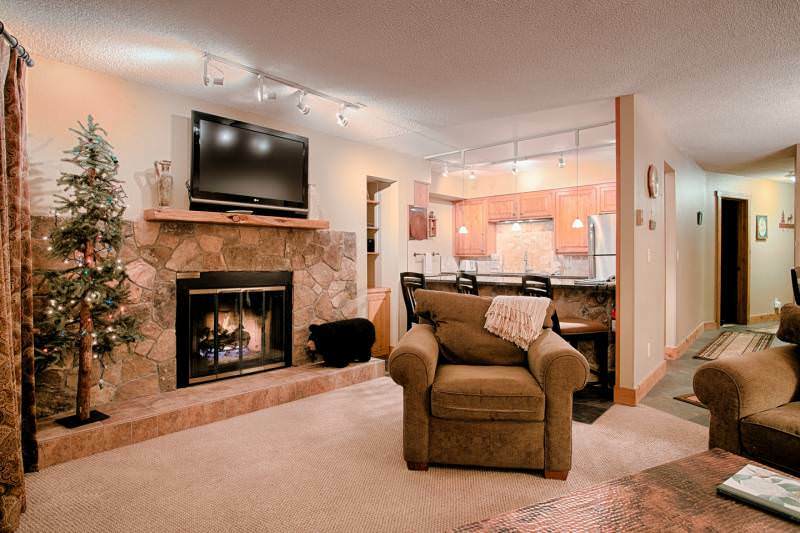 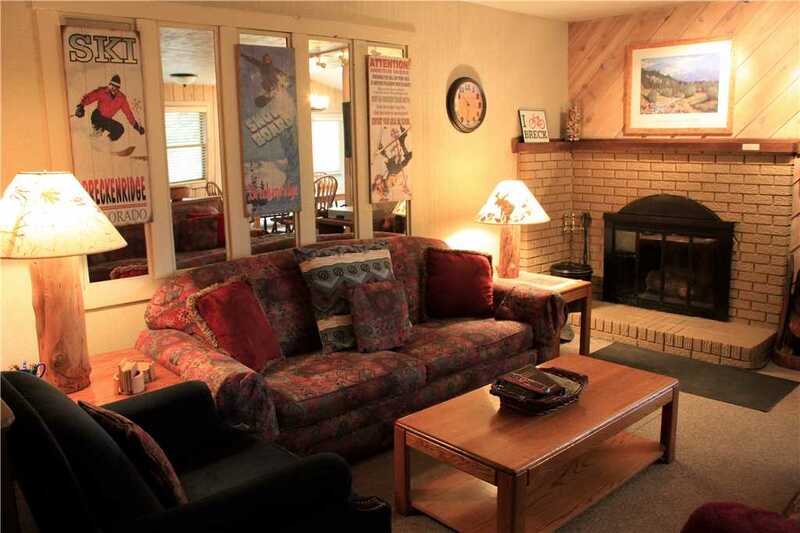 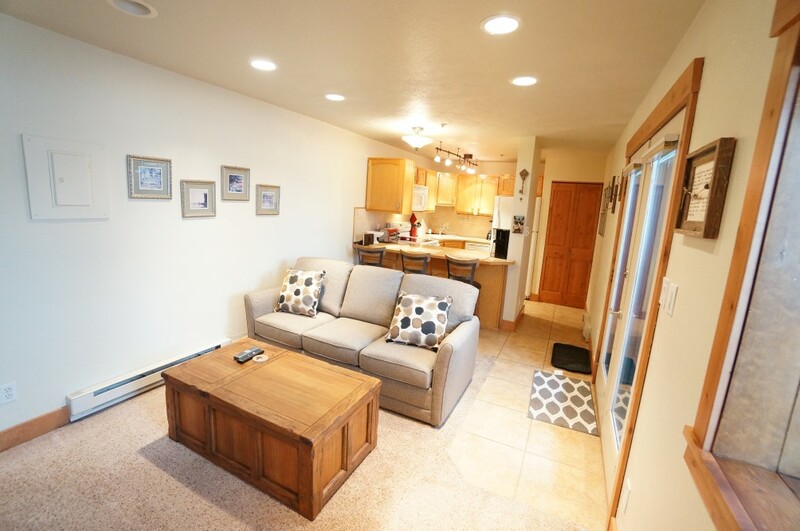 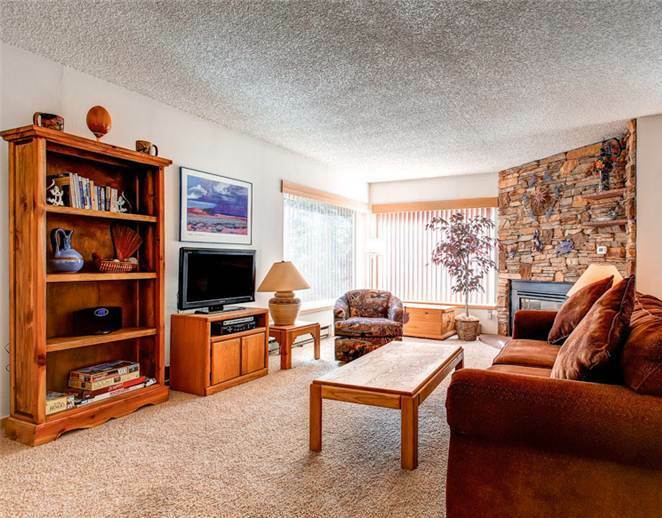 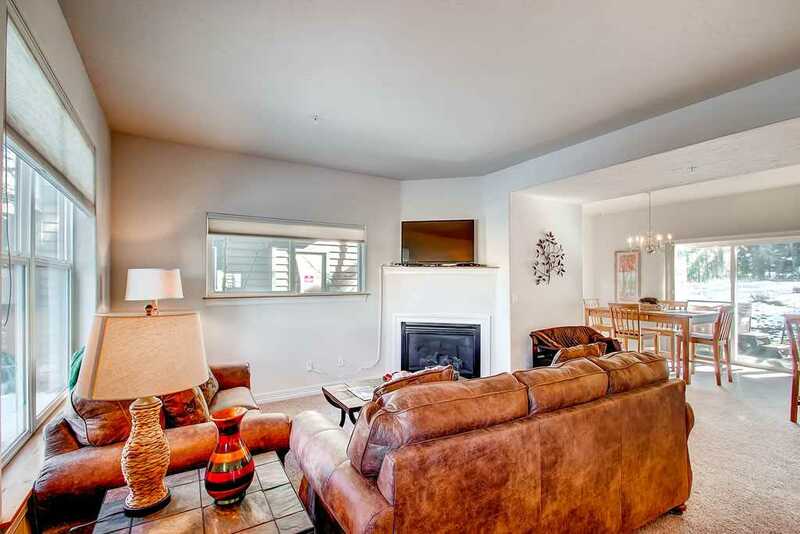 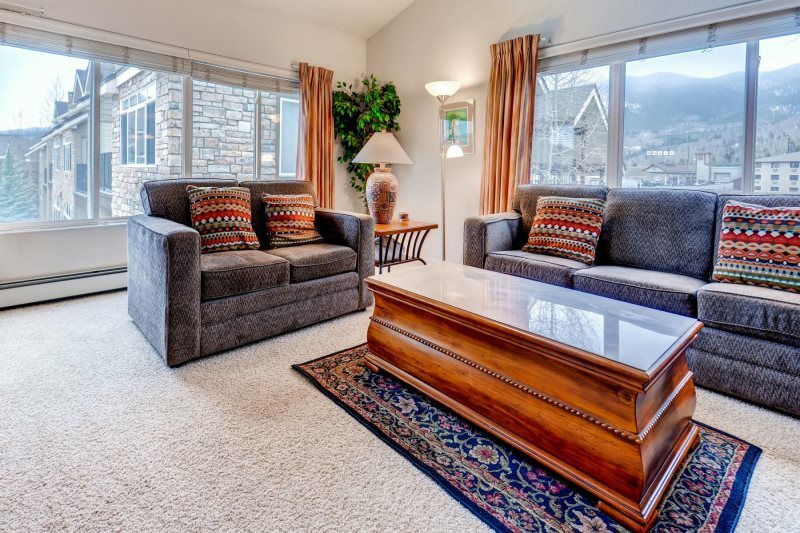 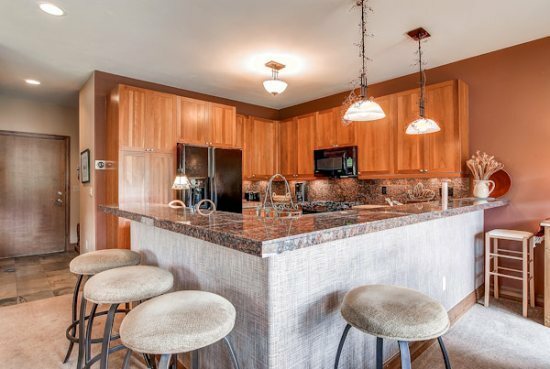 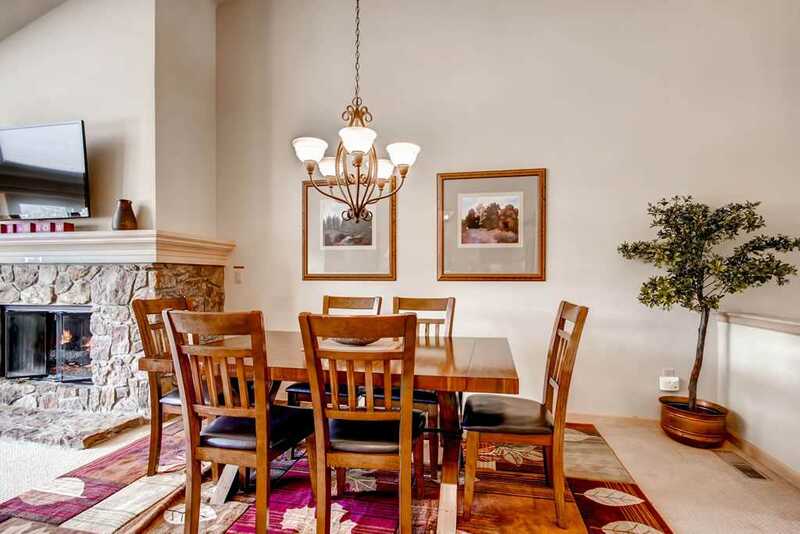 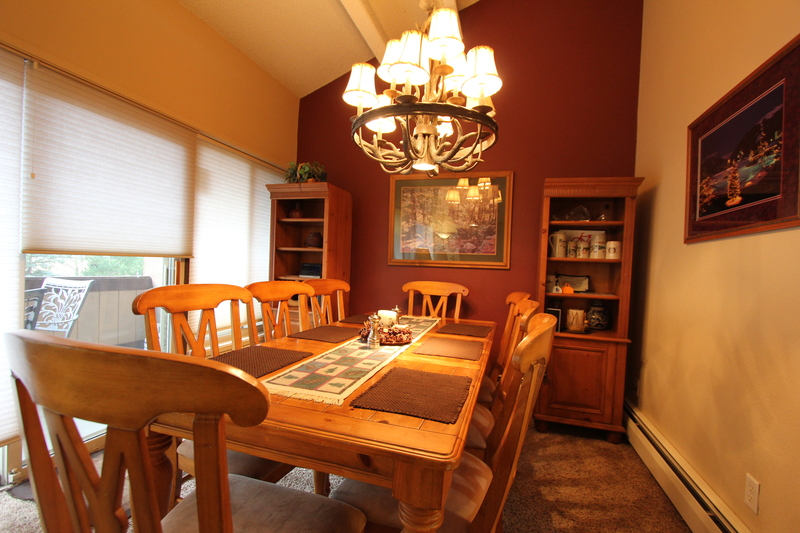 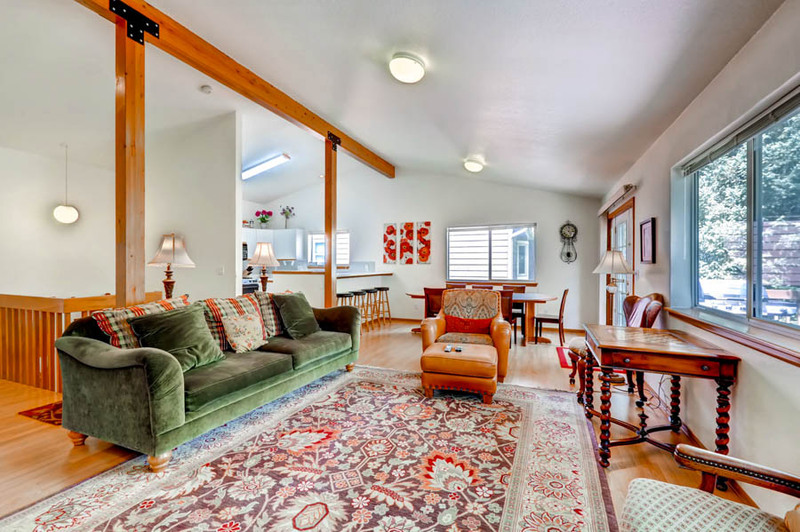 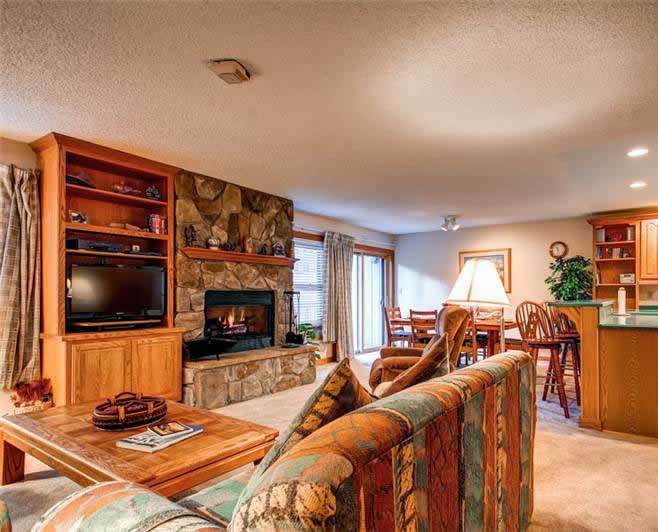 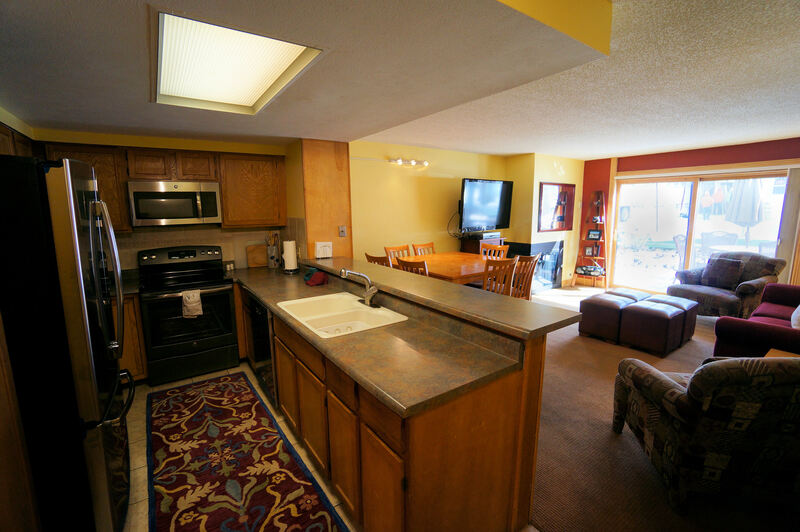 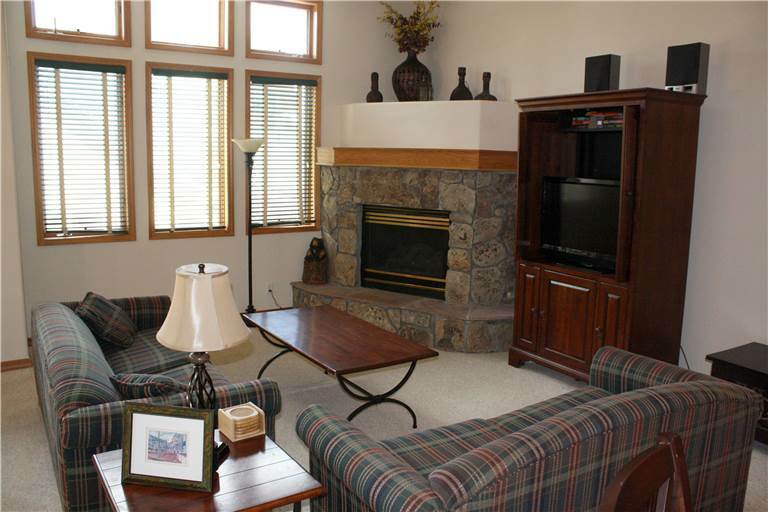 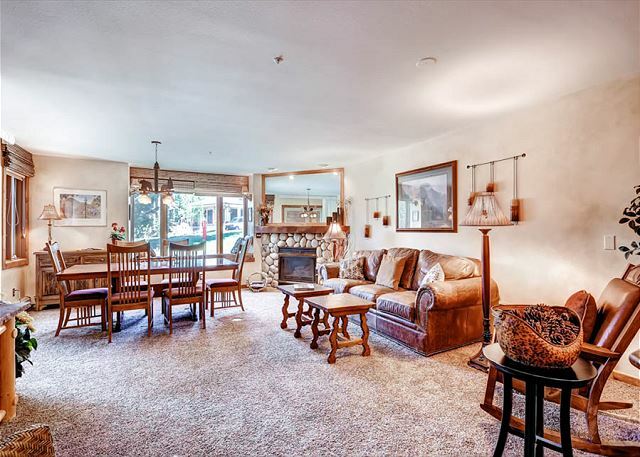 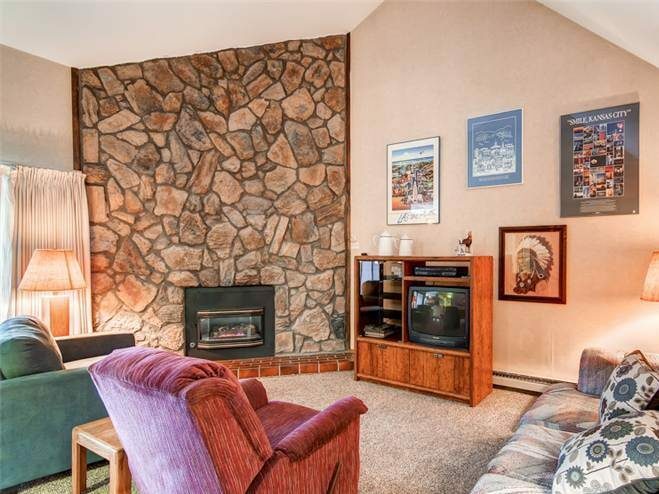 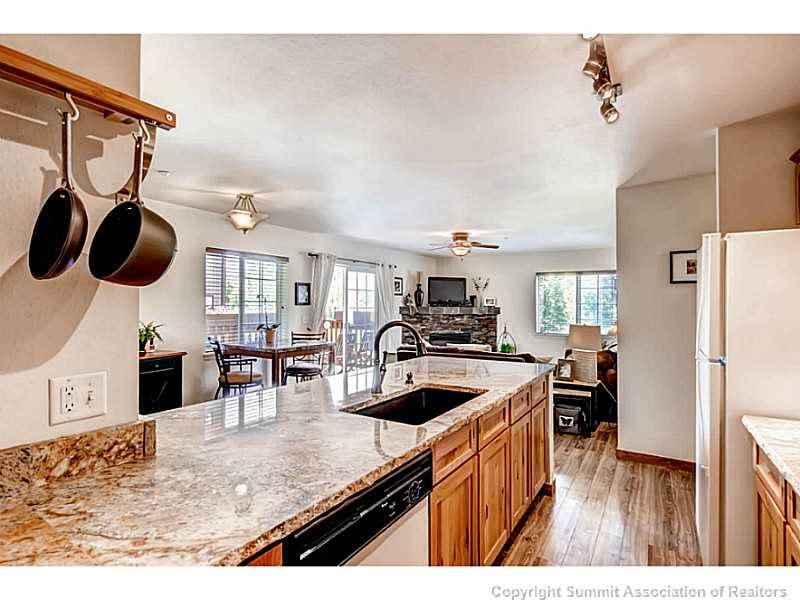 With 3 bedrooms and 2.5 baths, there’s room for a family of 6 to spread out and relax. 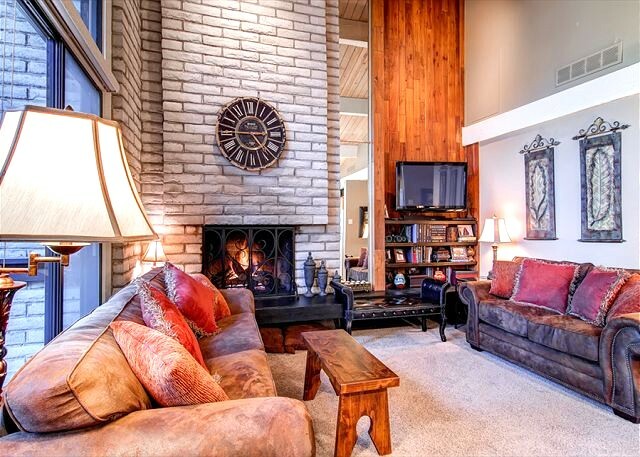 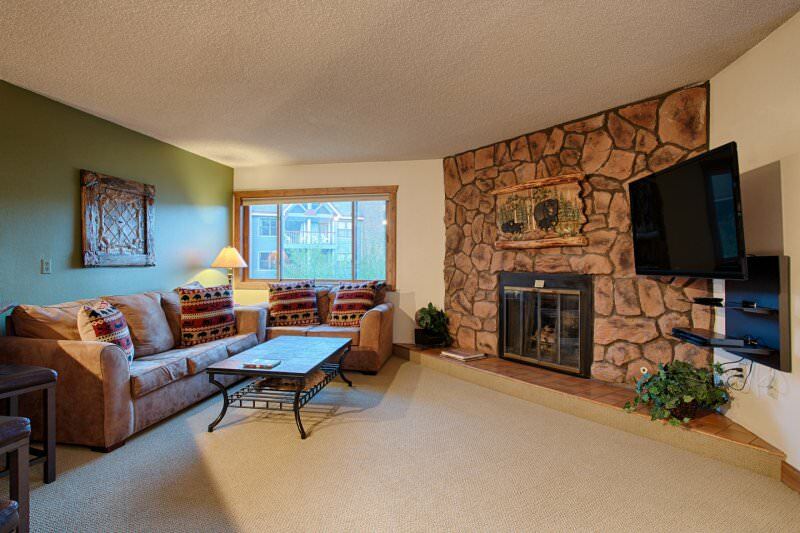 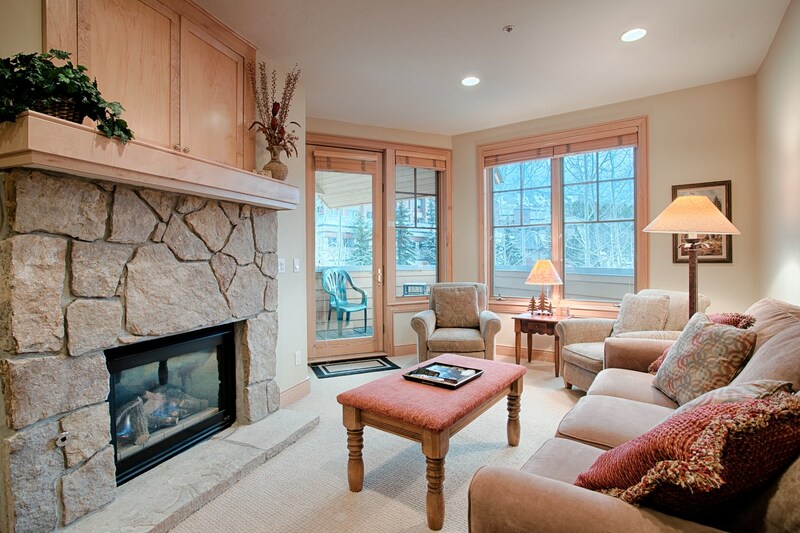 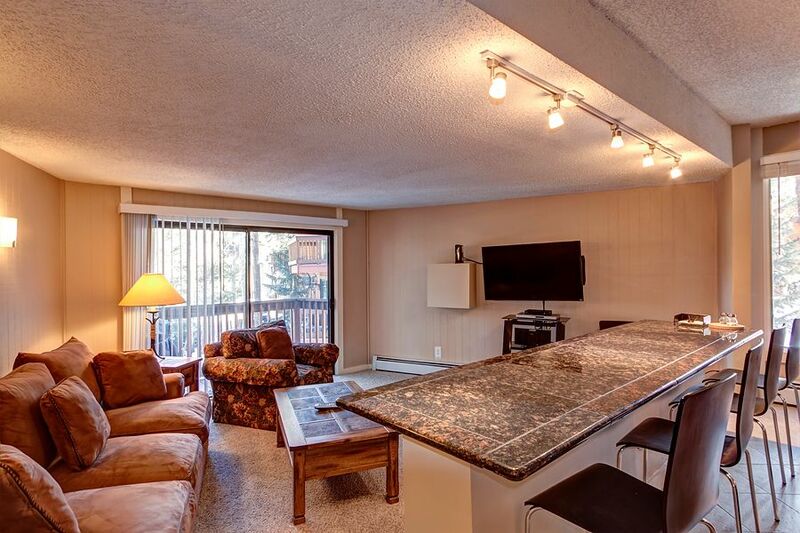 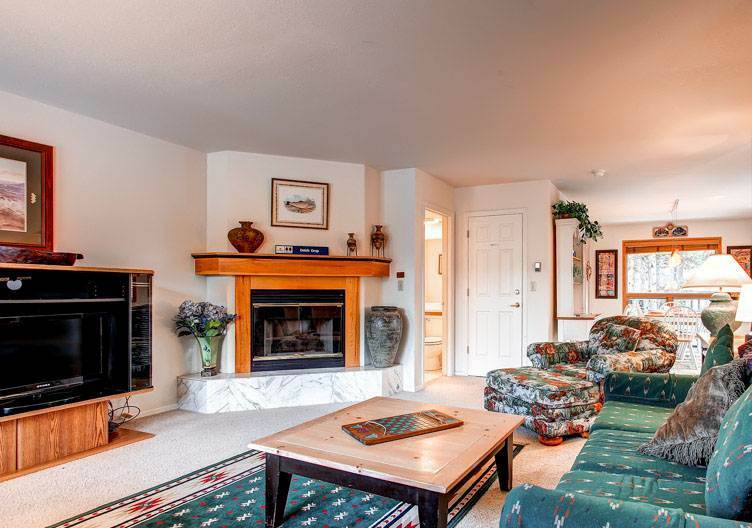 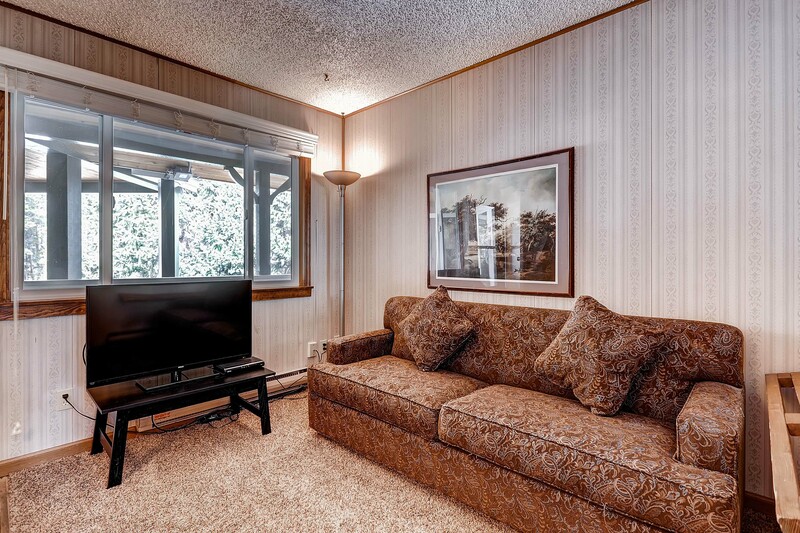 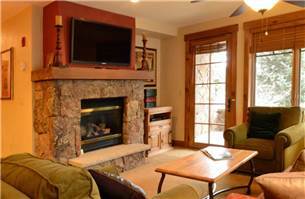 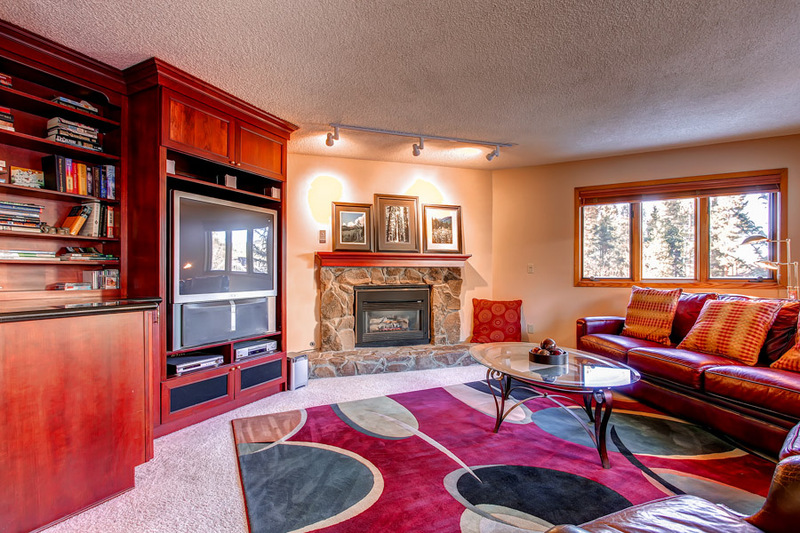 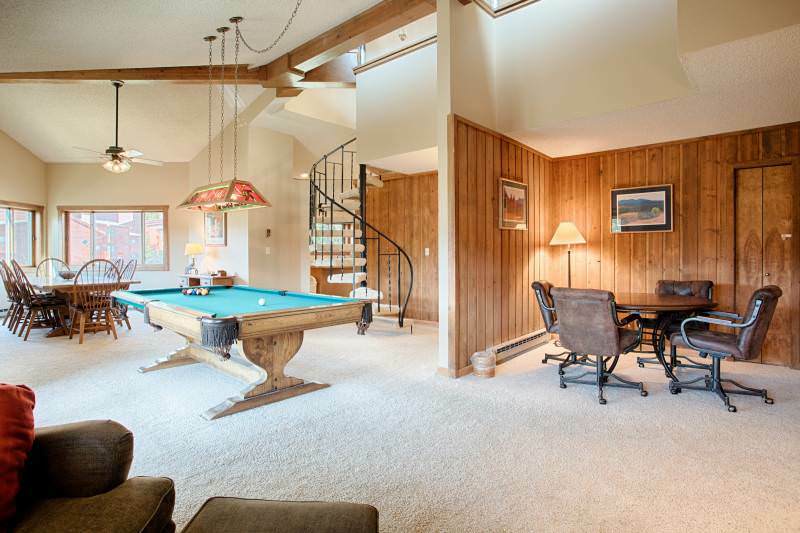 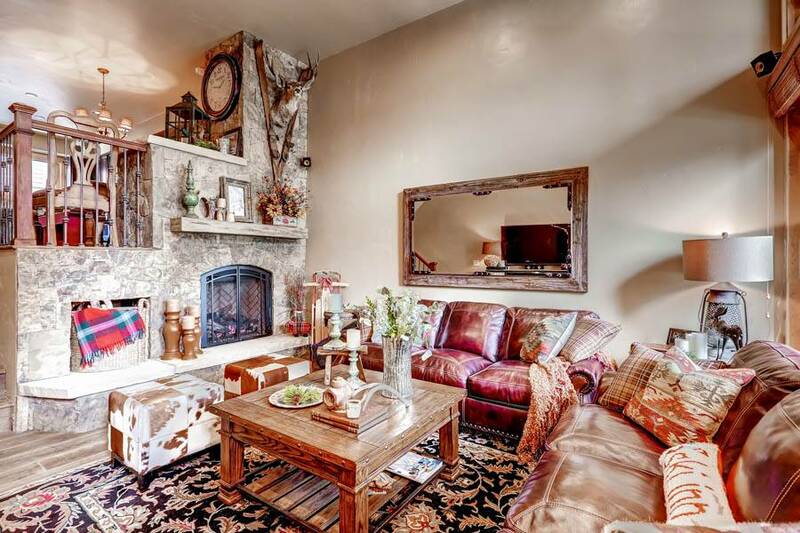 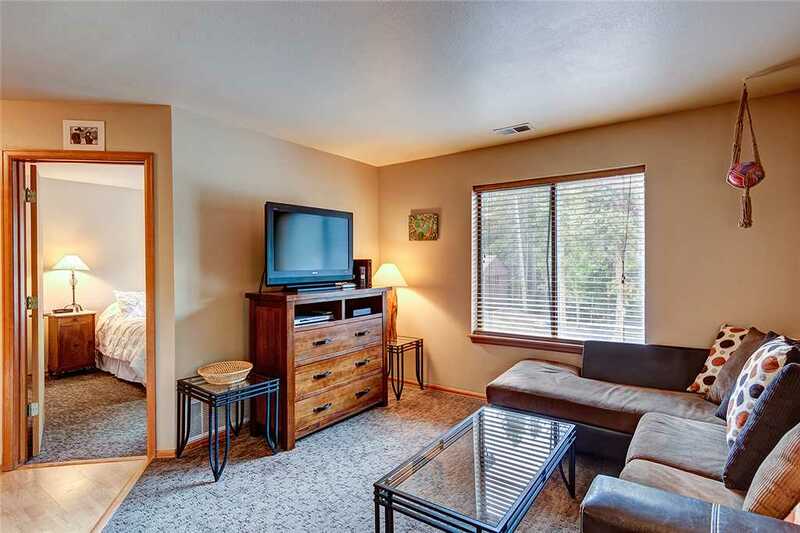 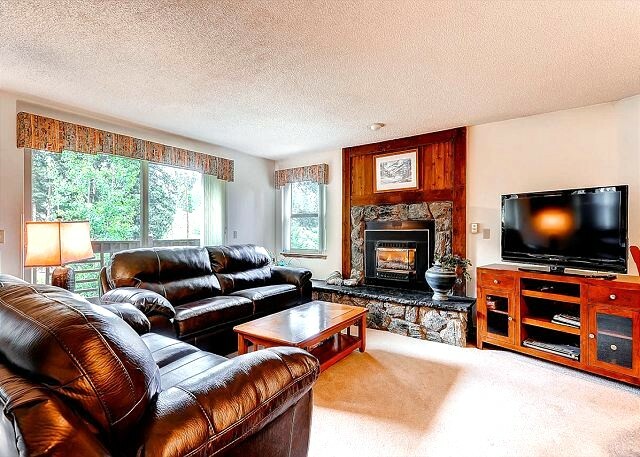 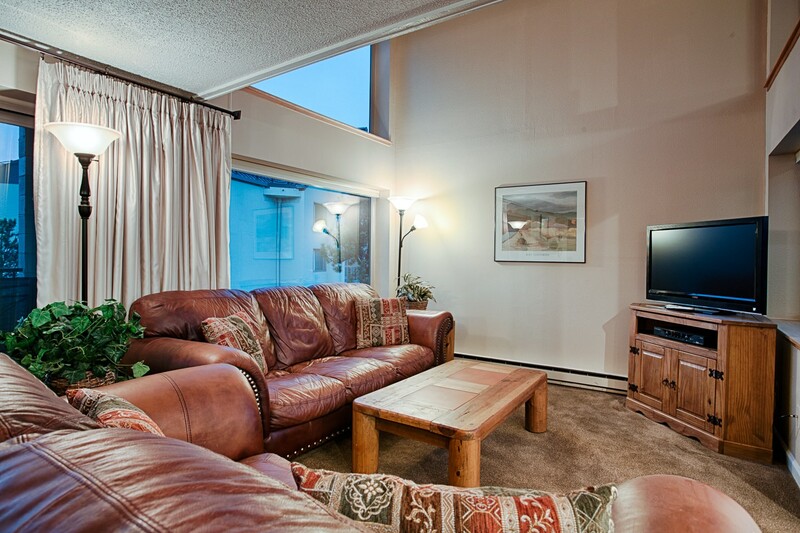 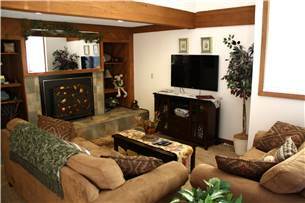 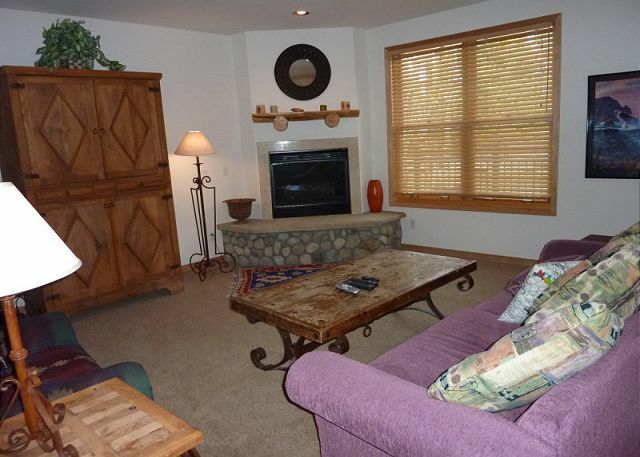 Enter through the front door and you’ll see a nice size living room with large flat screen tv to your right. 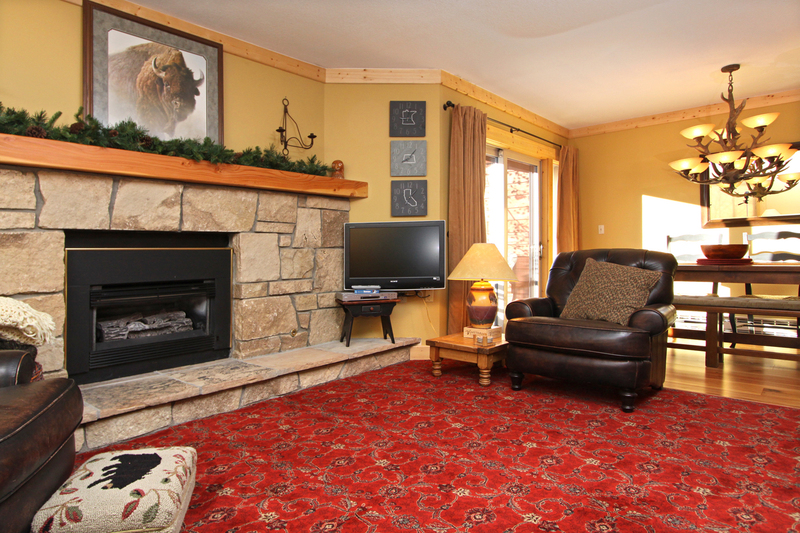 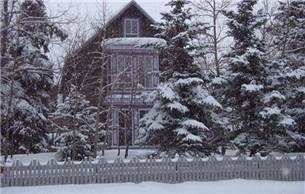 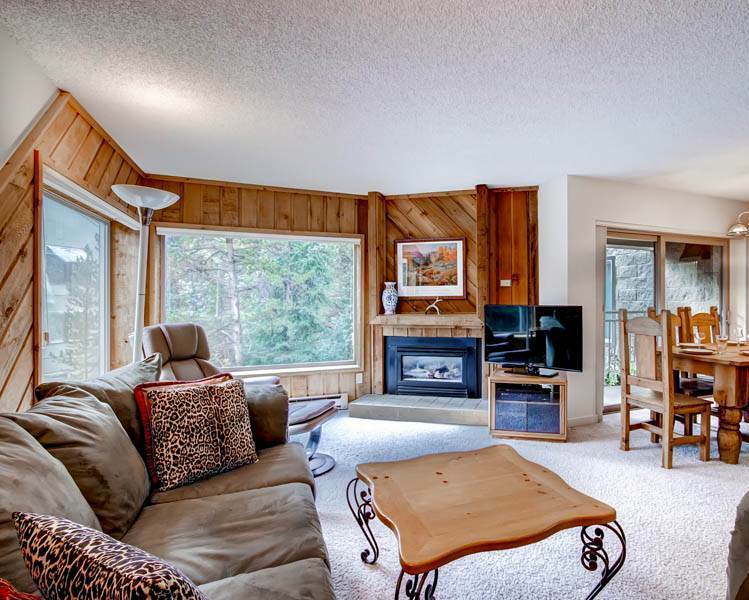 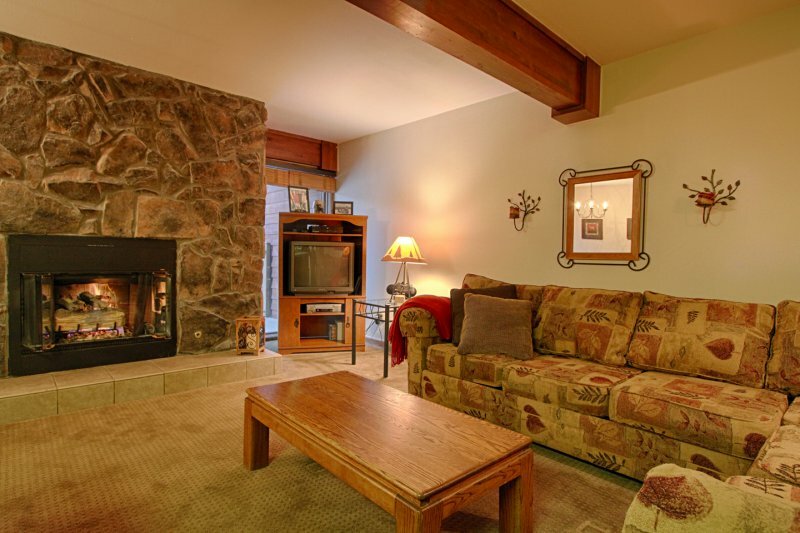 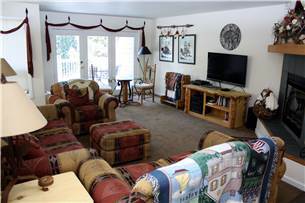 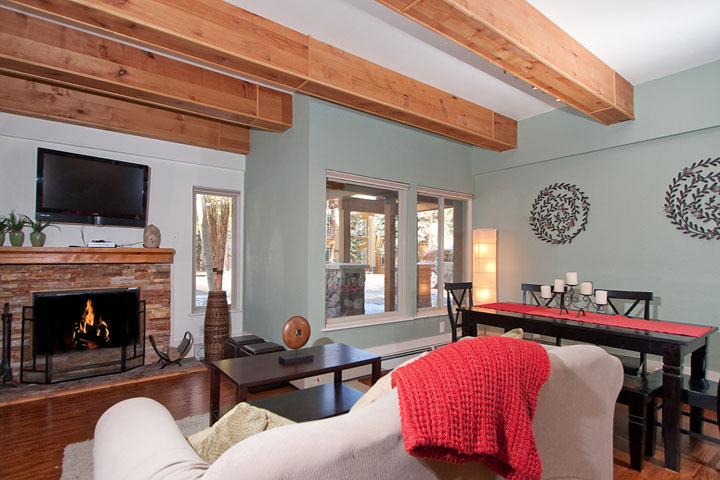 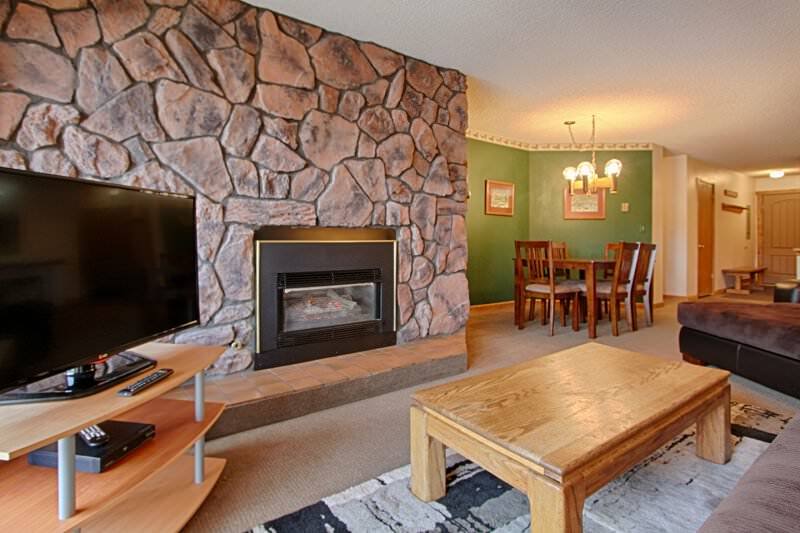 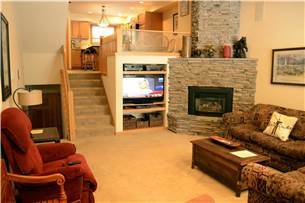 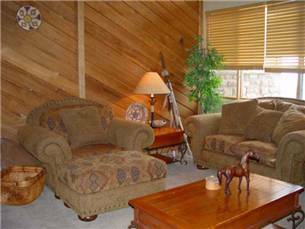 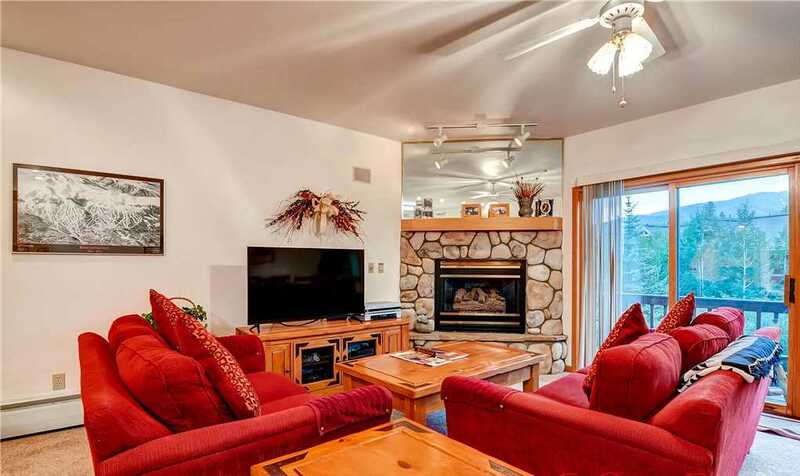 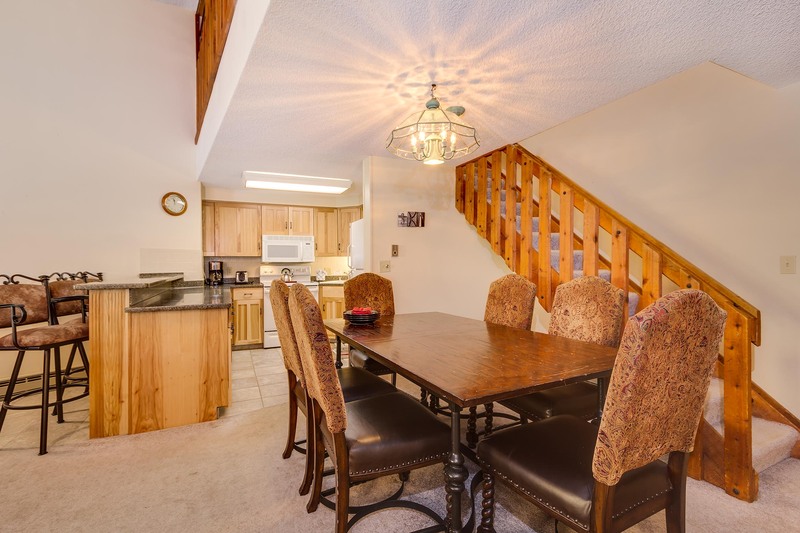 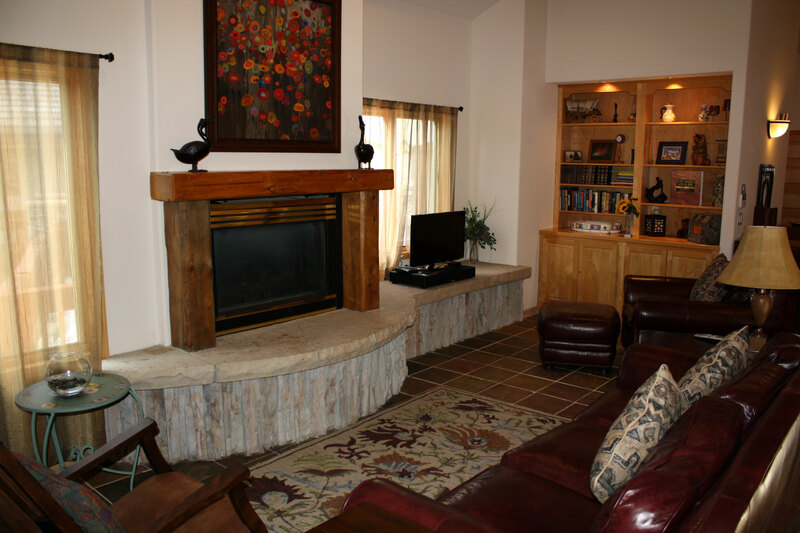 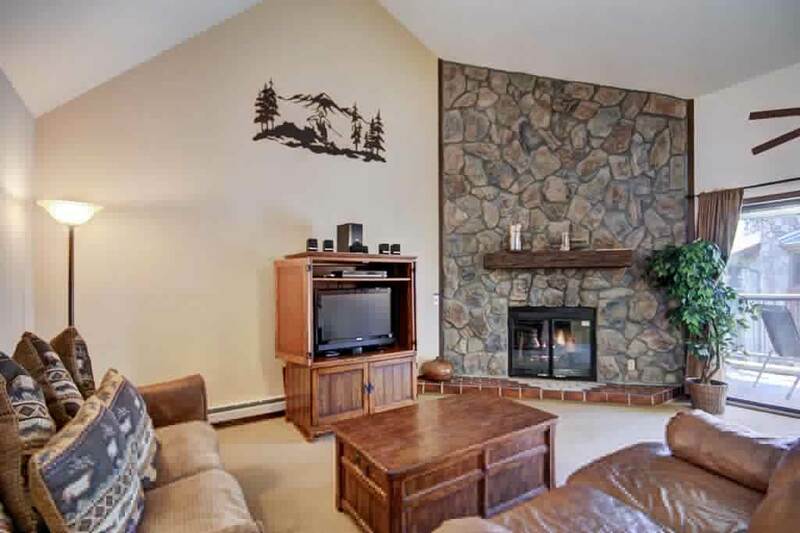 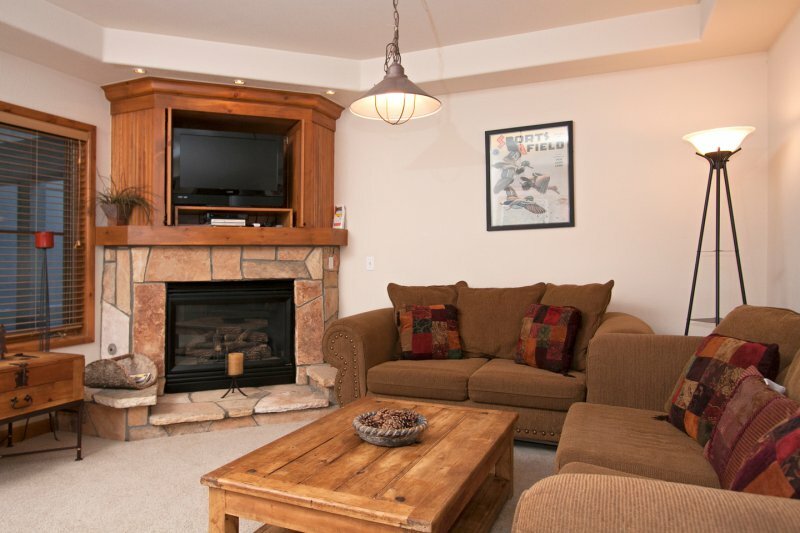 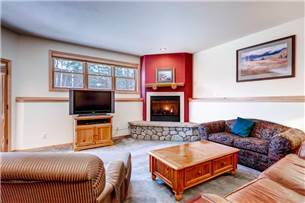 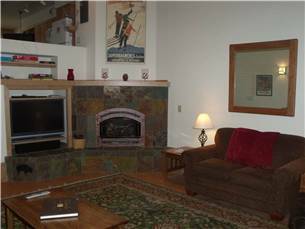 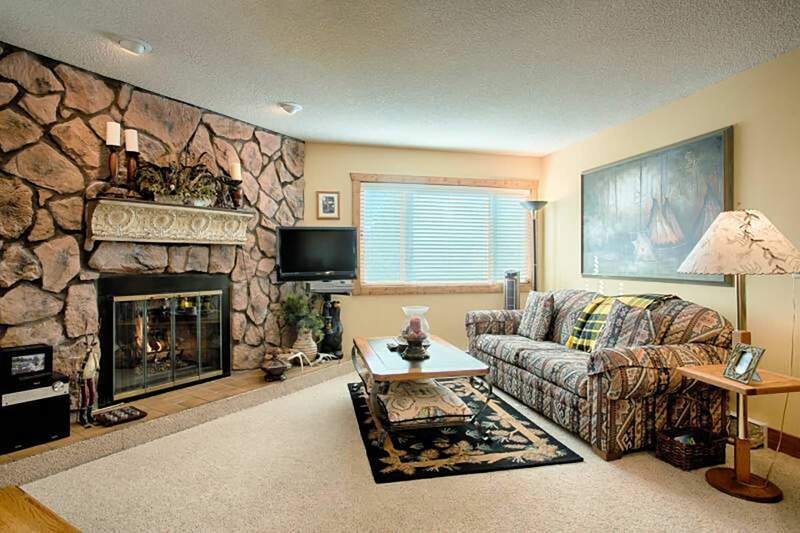 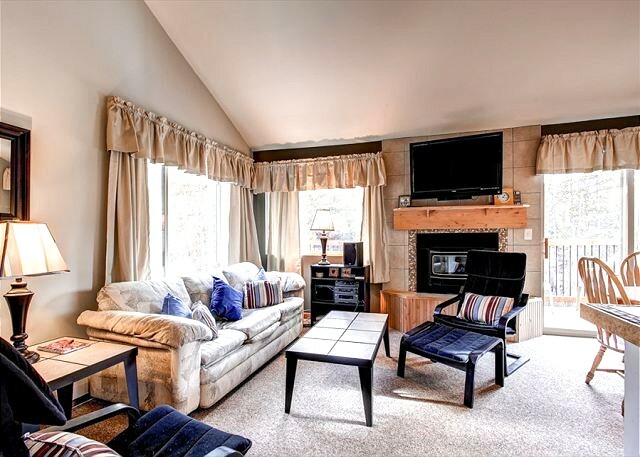 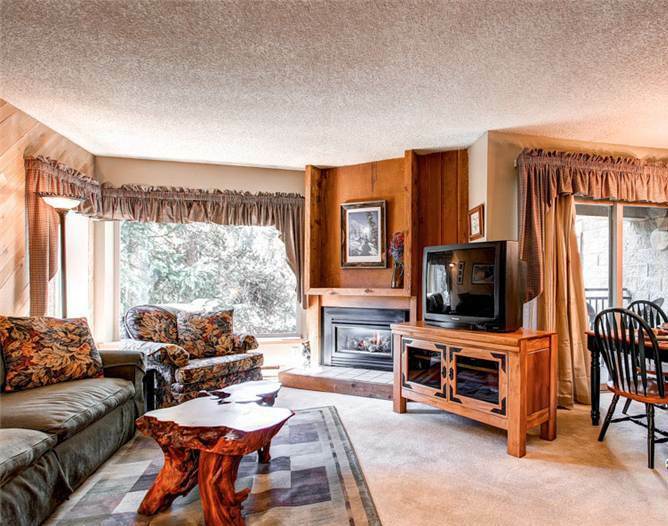 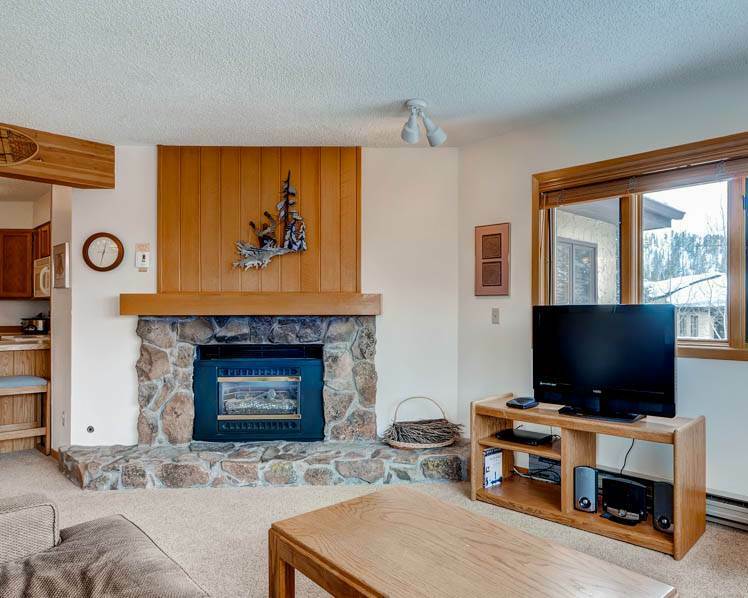 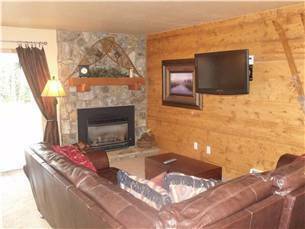 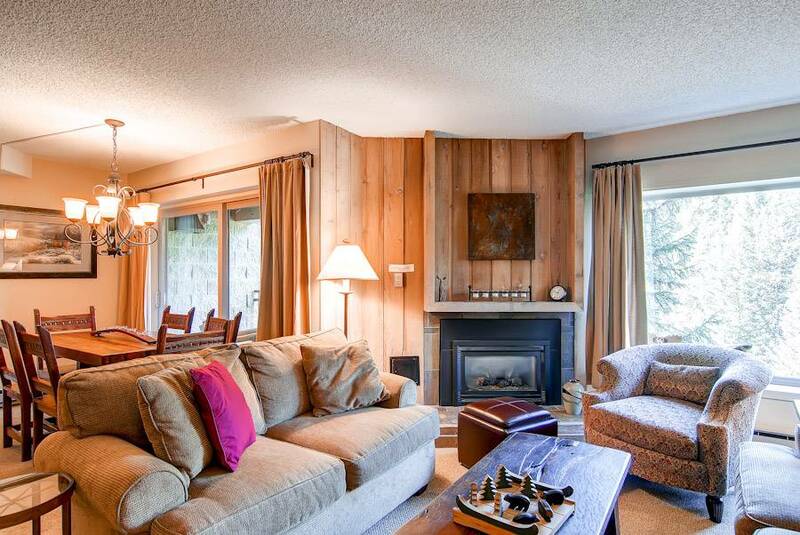 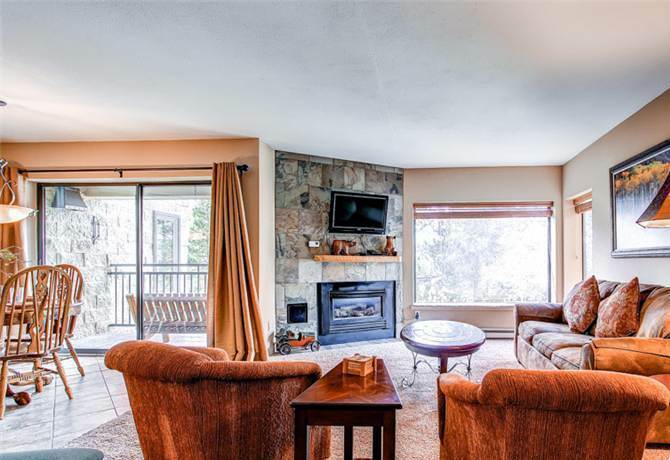 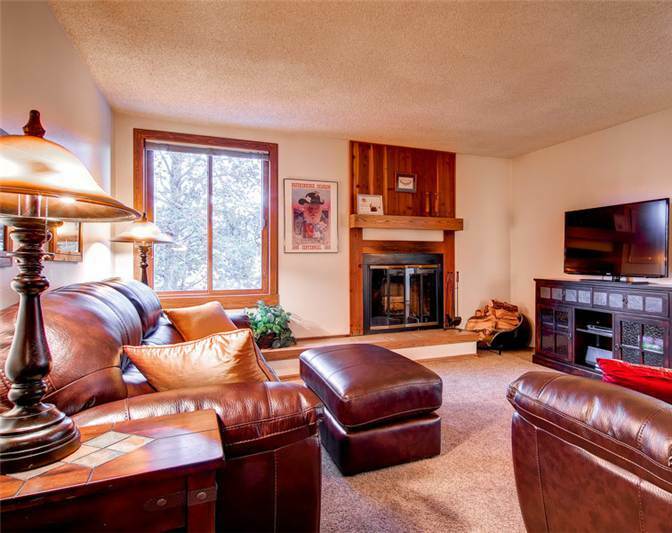 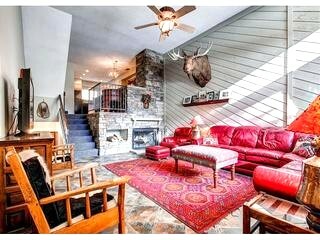 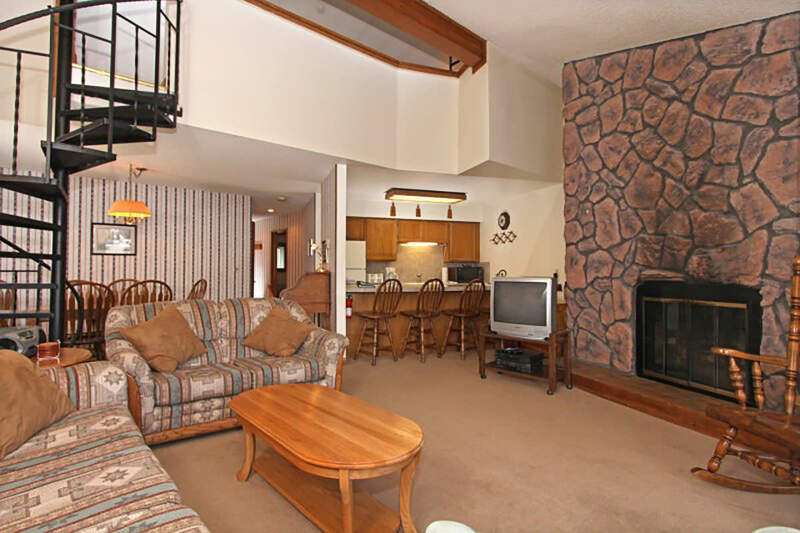 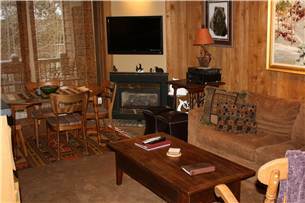 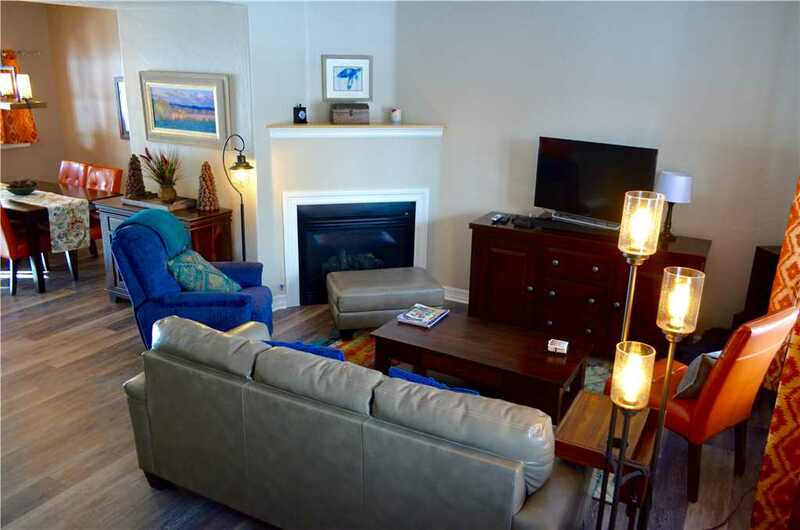 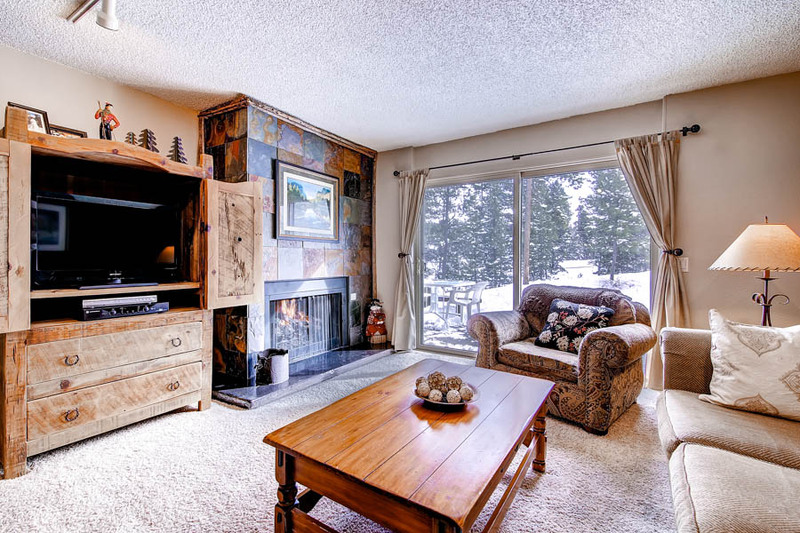 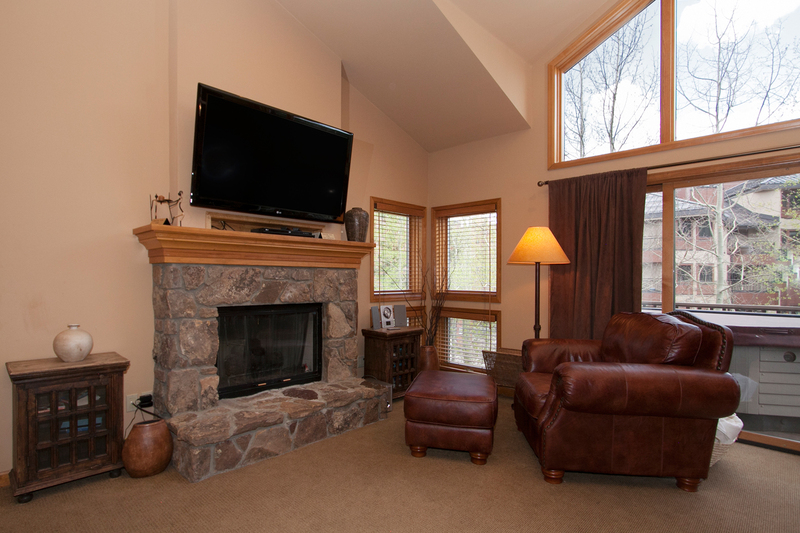 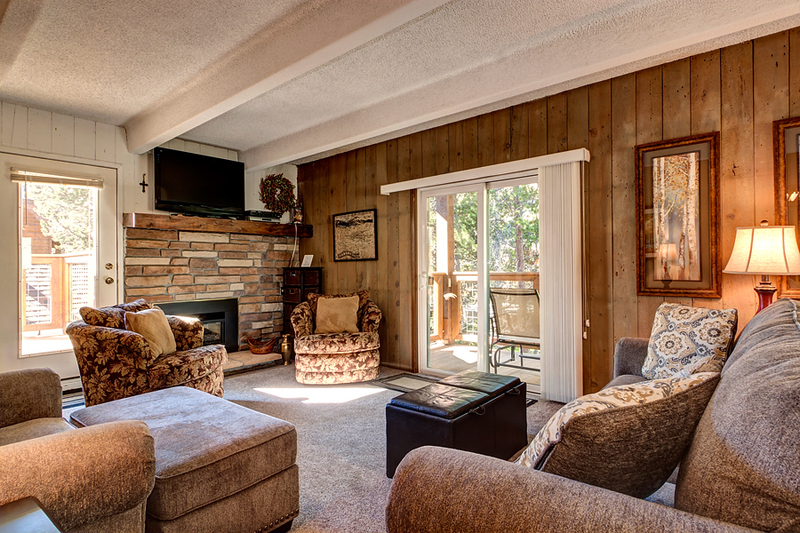 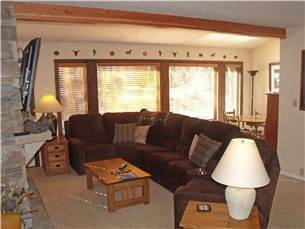 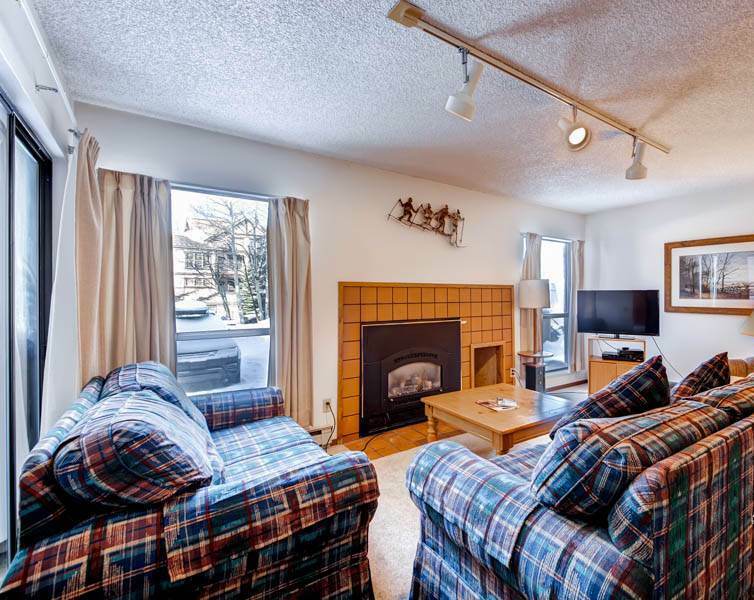 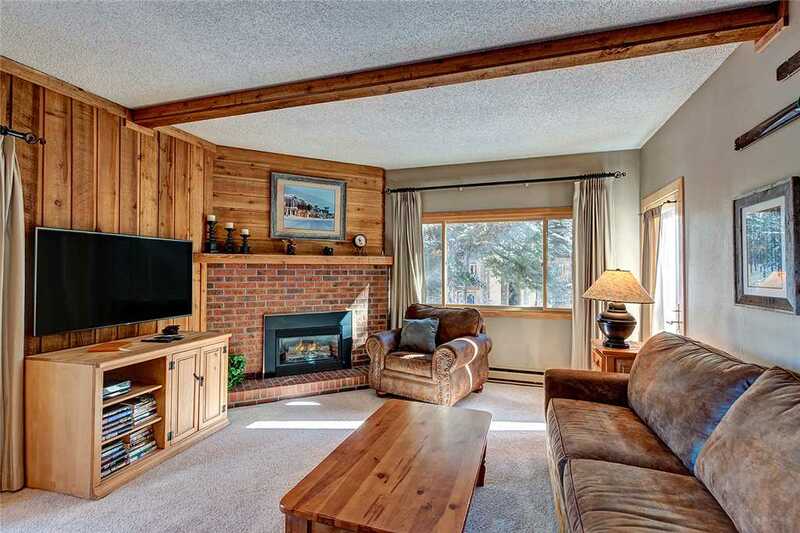 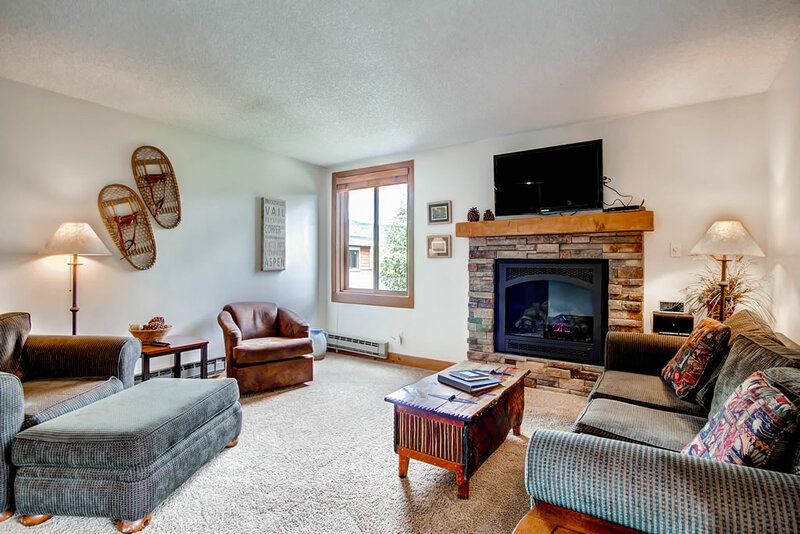 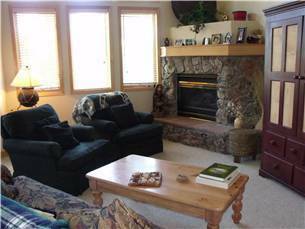 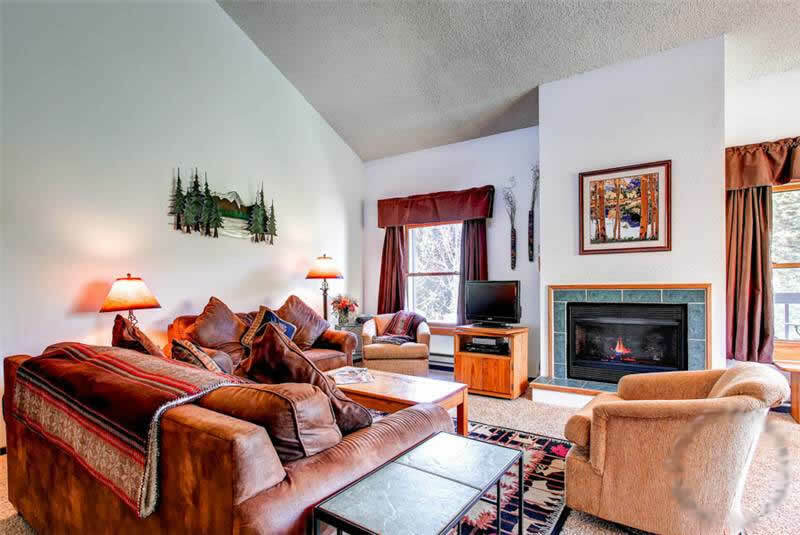 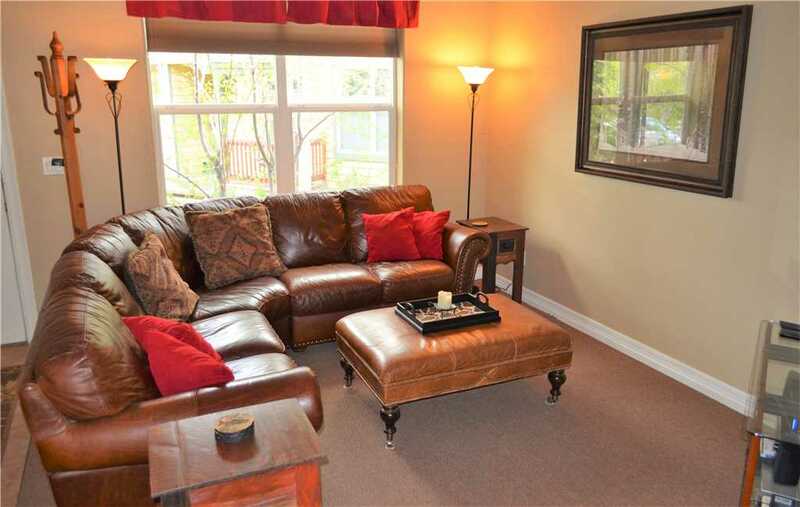 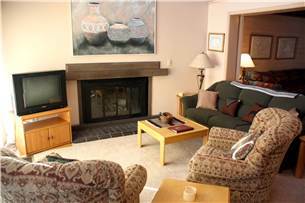 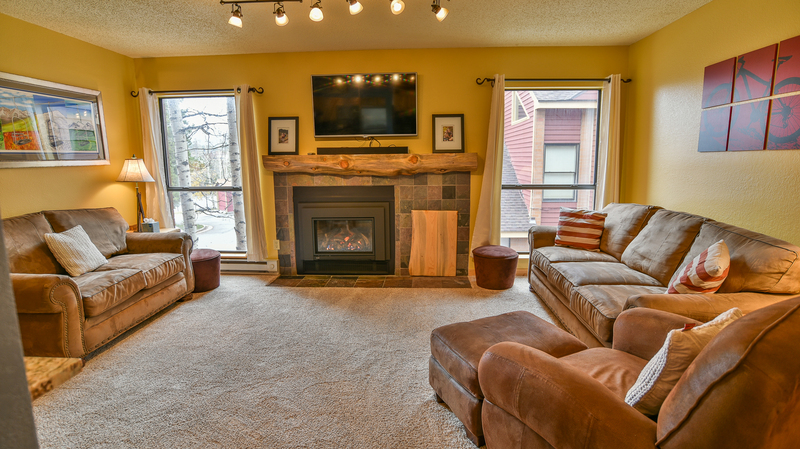 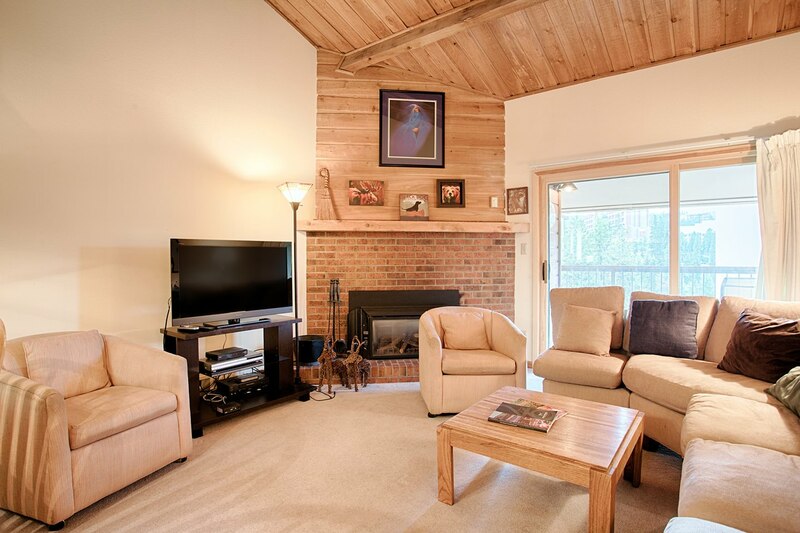 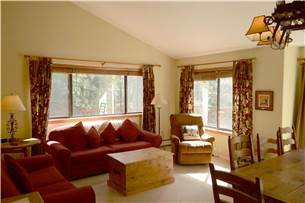 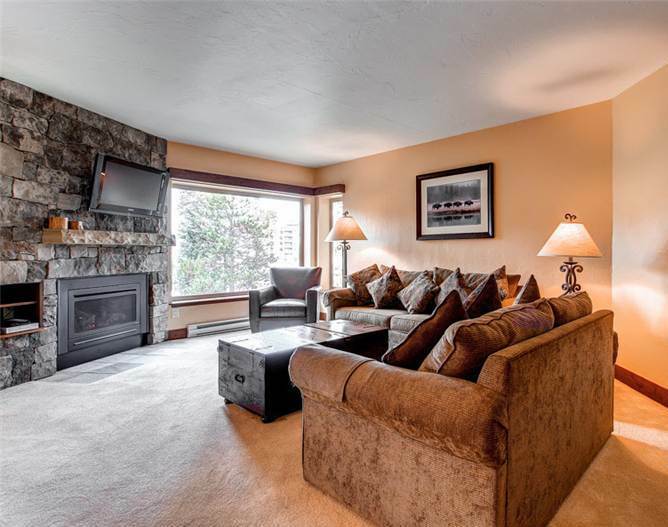 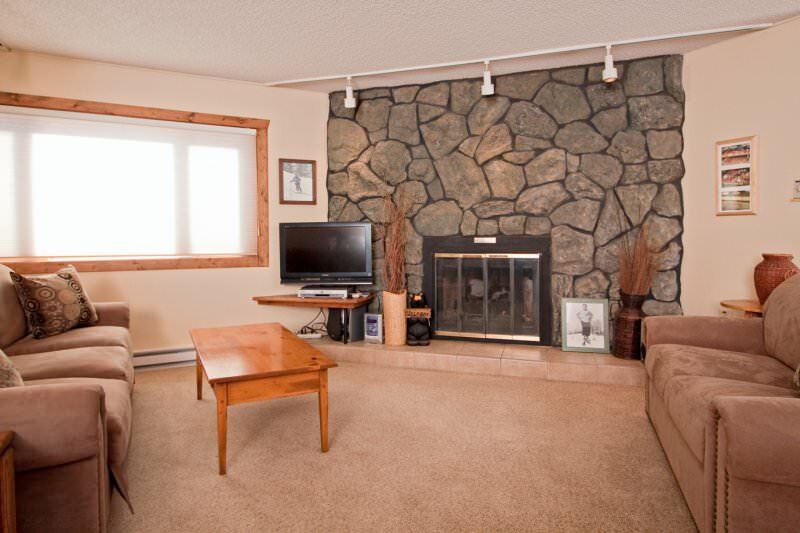 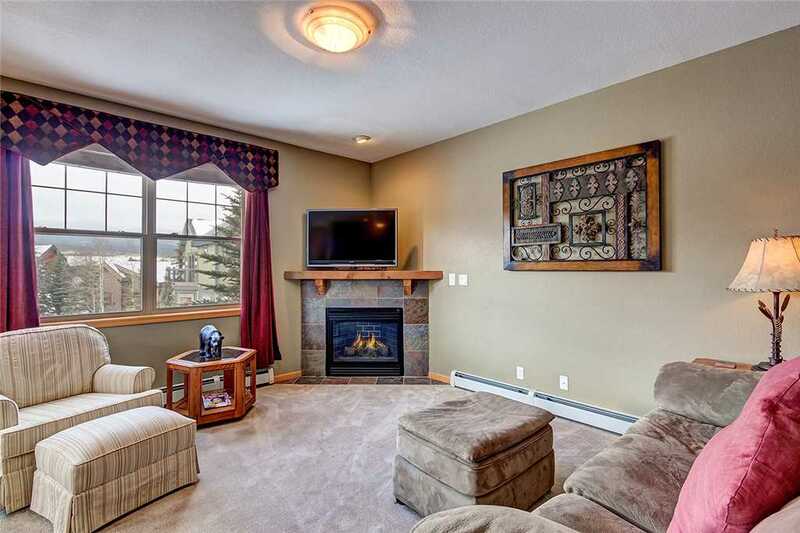 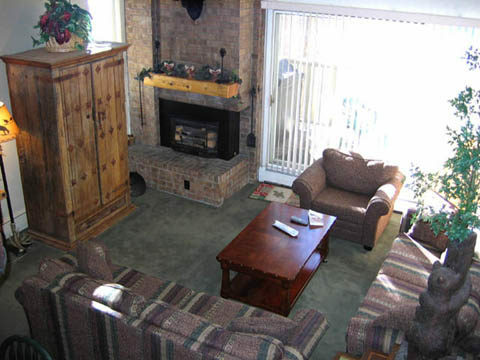 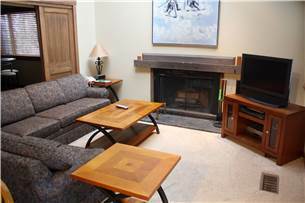 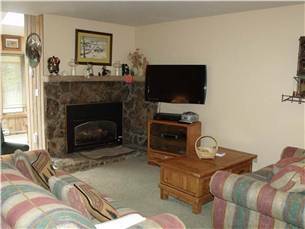 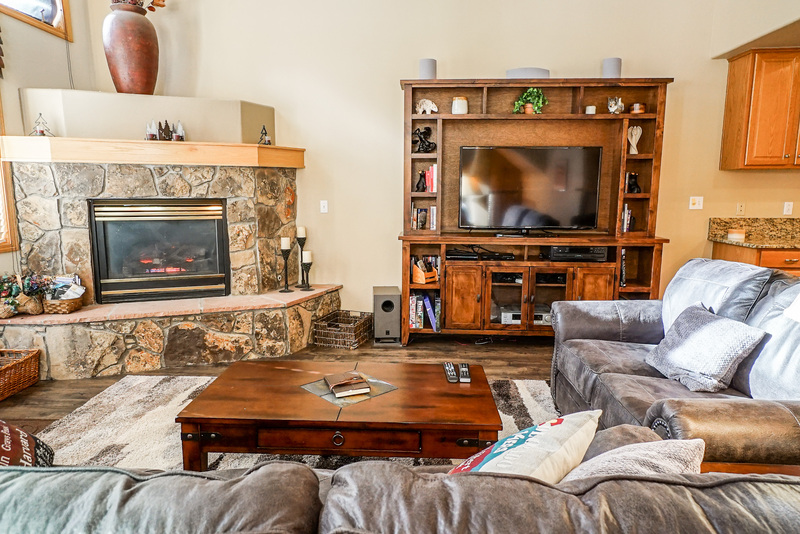 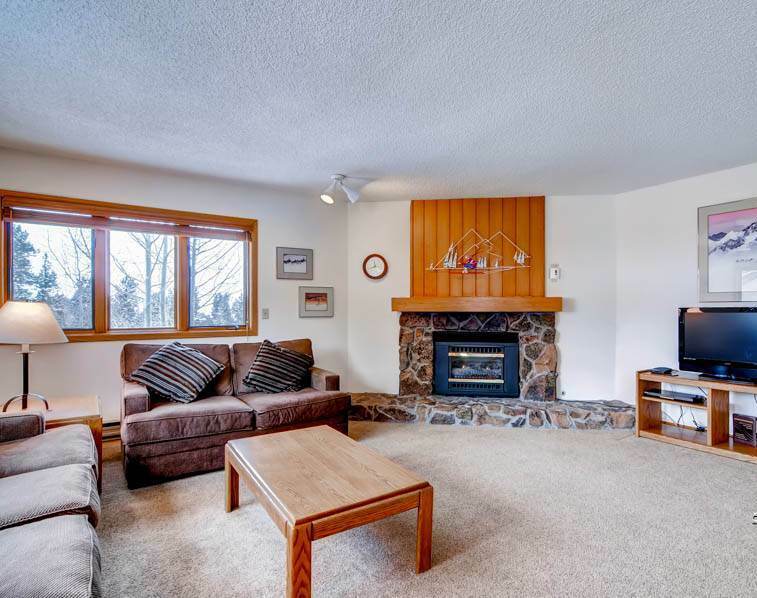 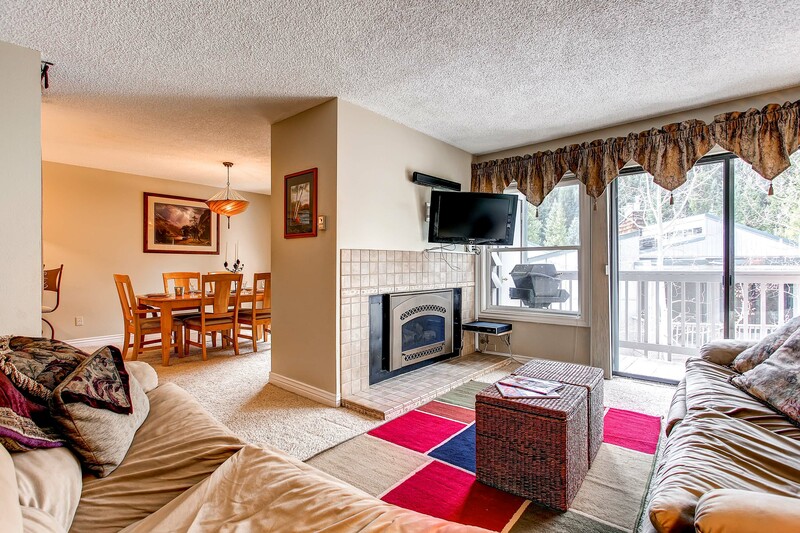 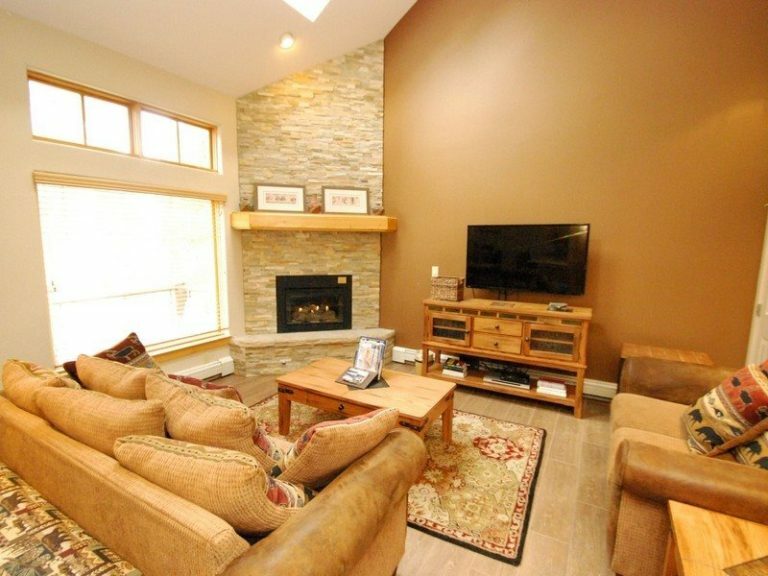 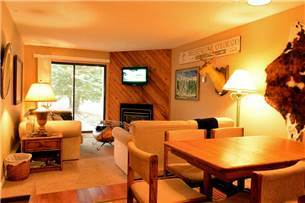 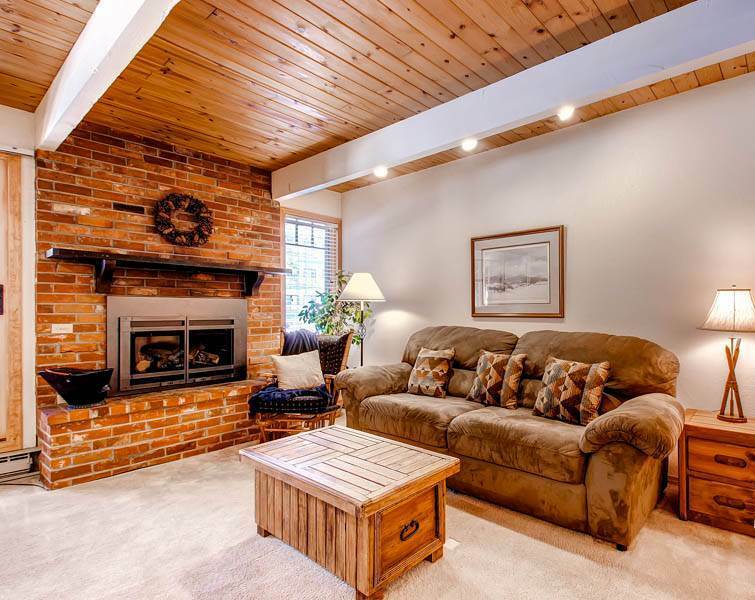 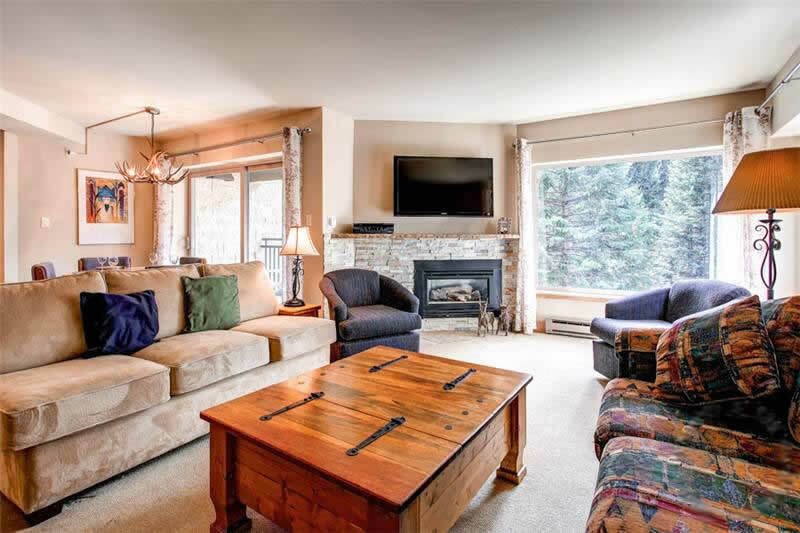 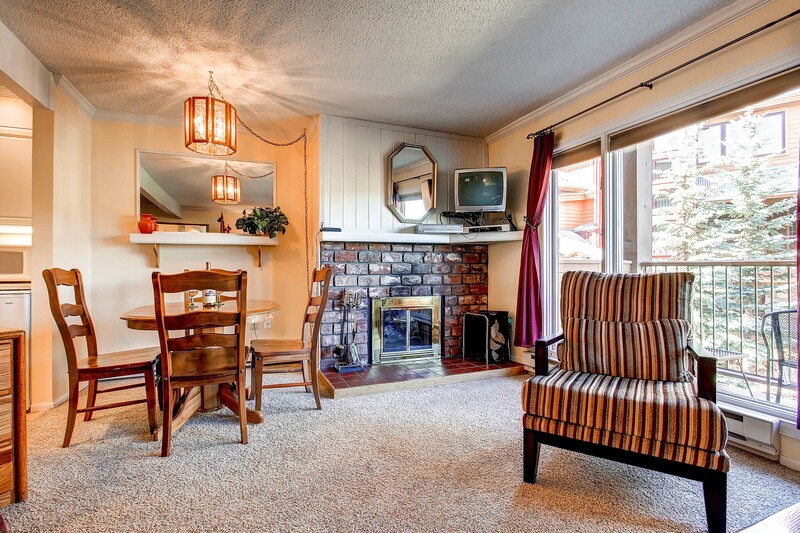 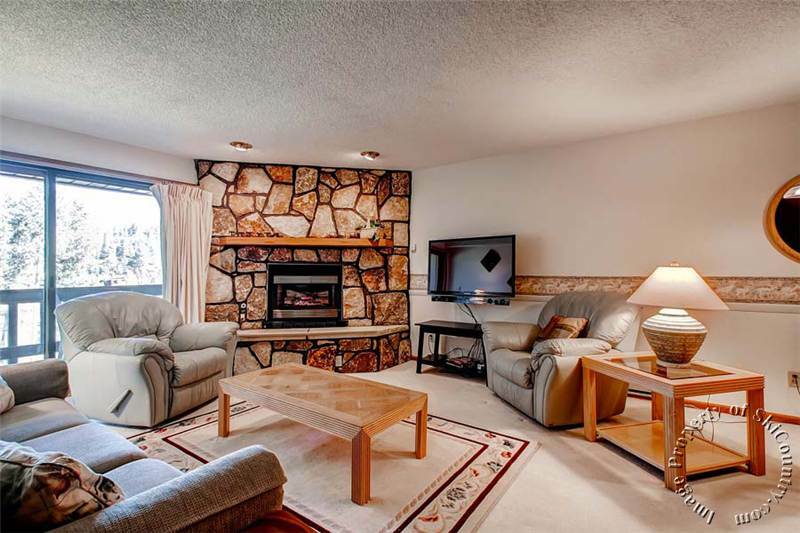 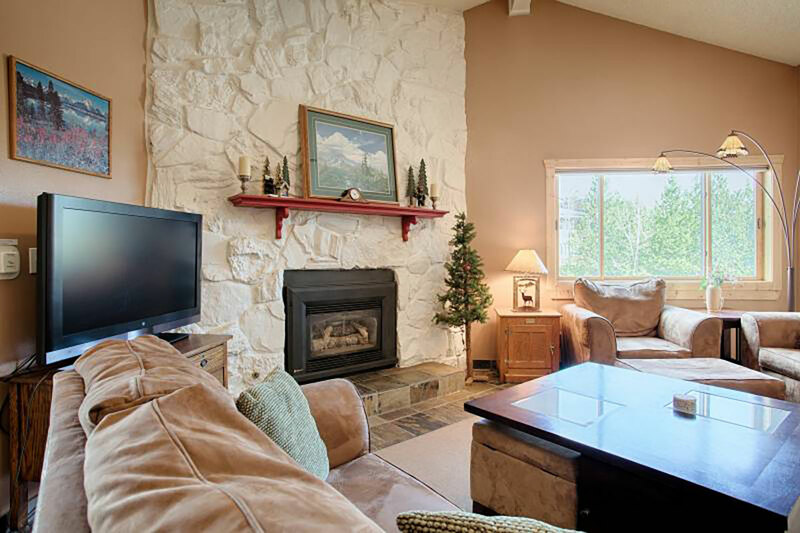 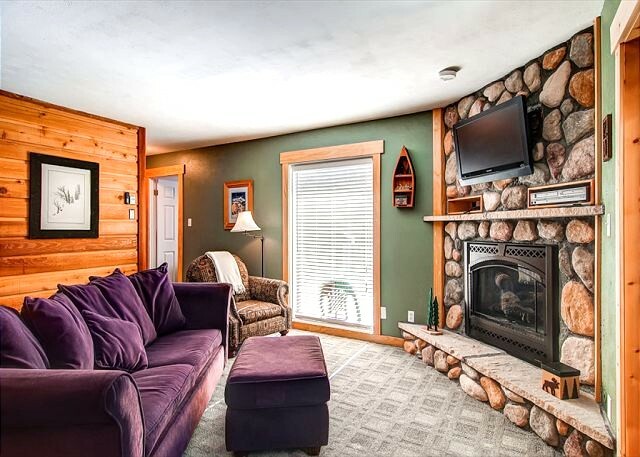 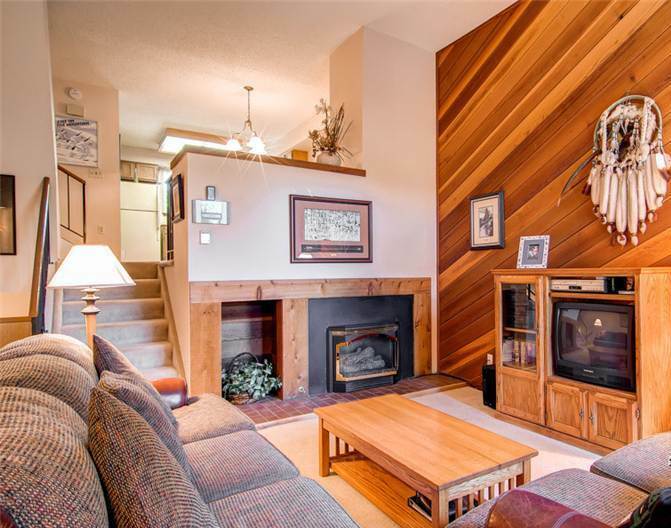 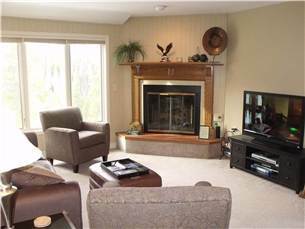 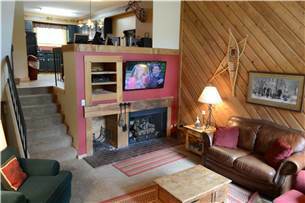 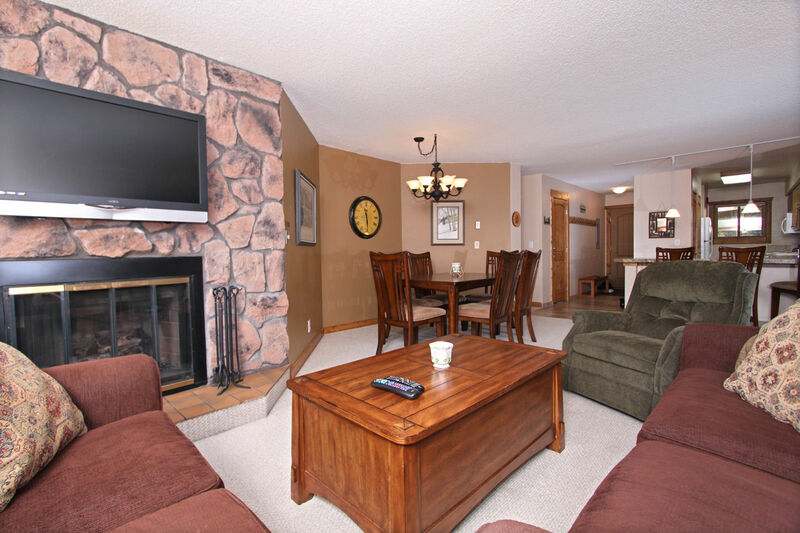 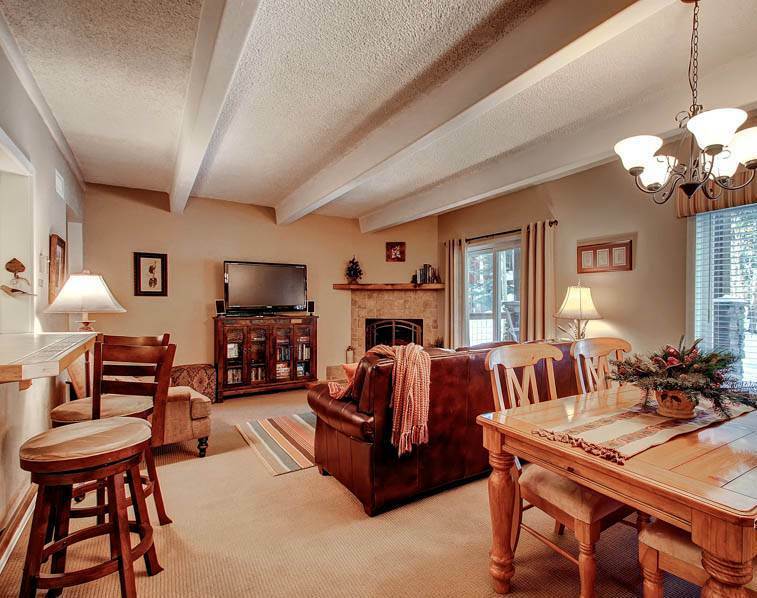 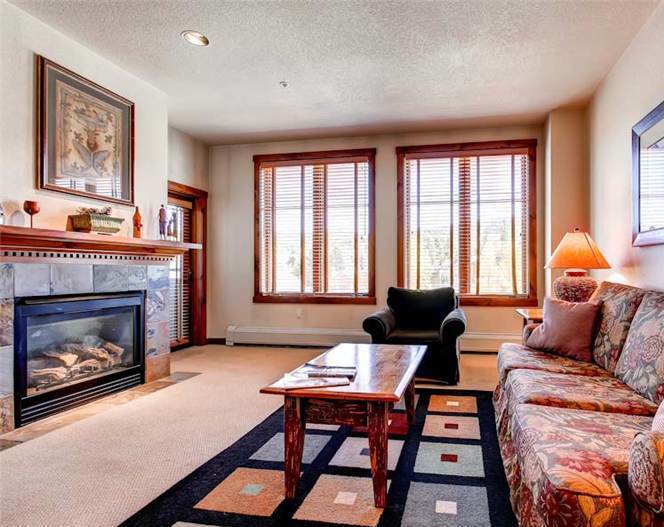 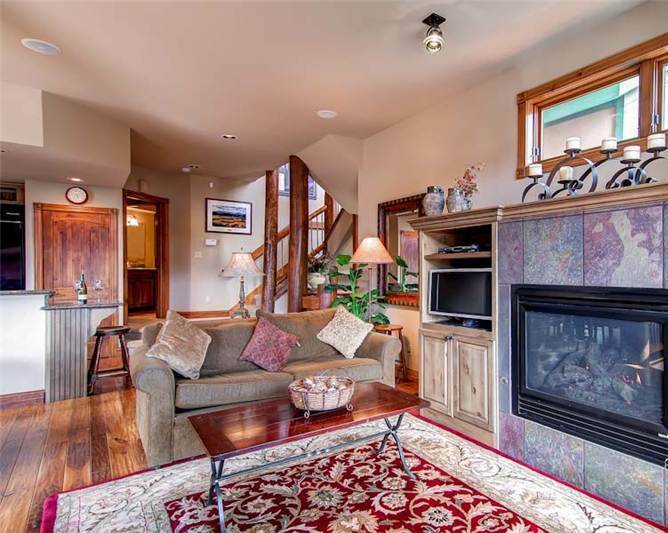 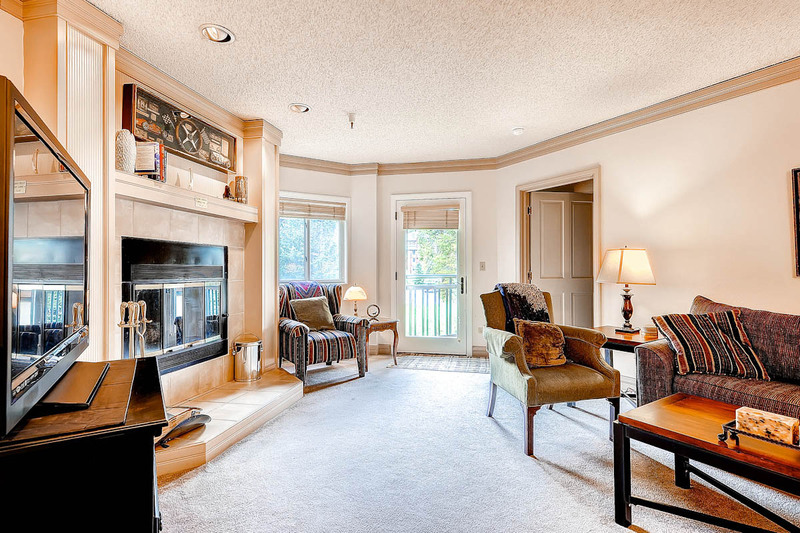 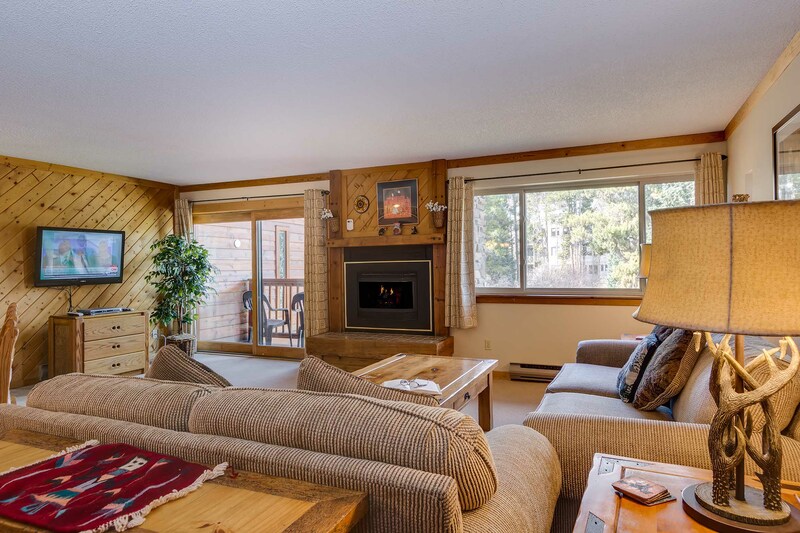 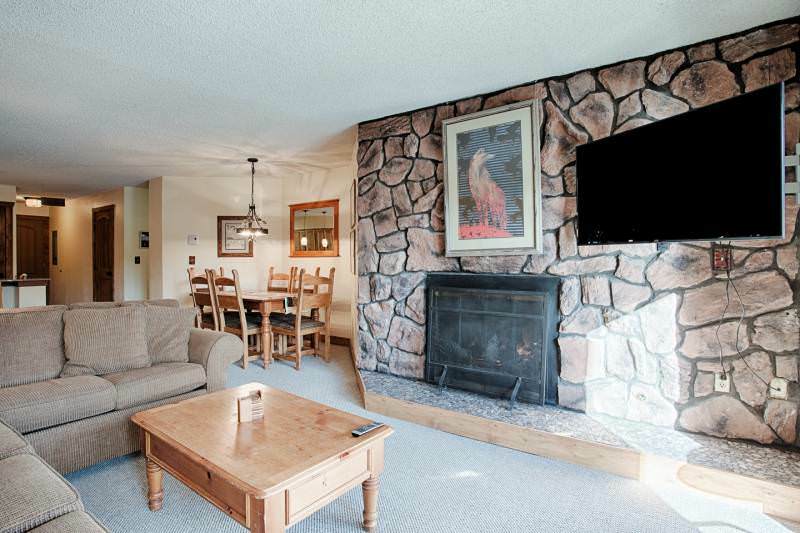 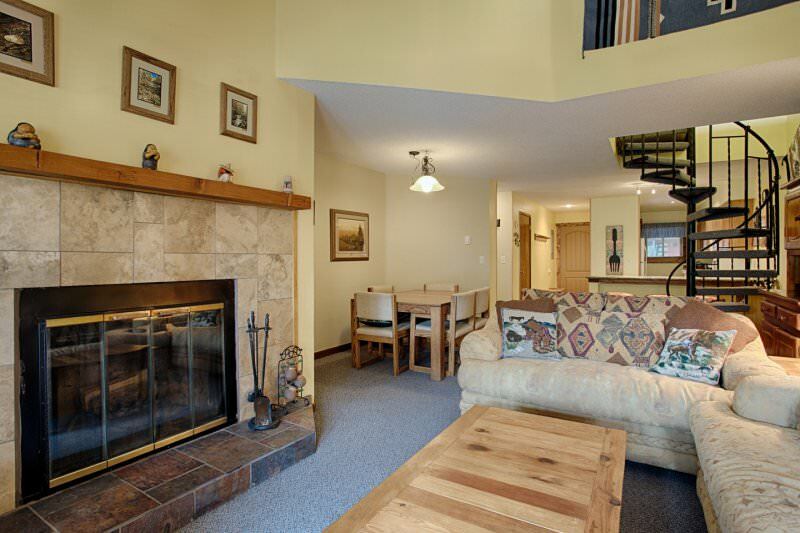 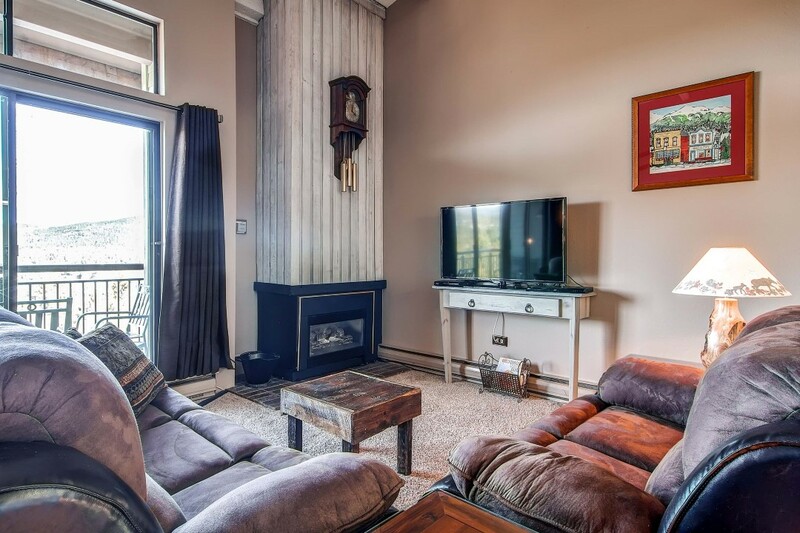 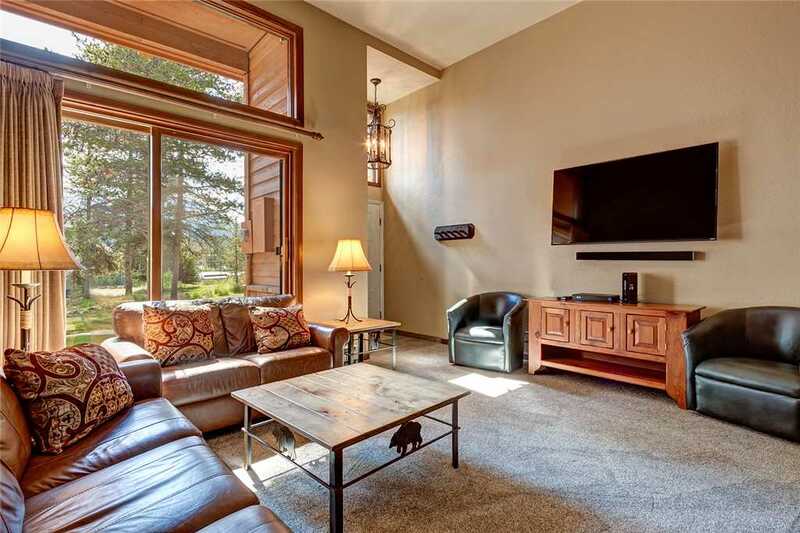 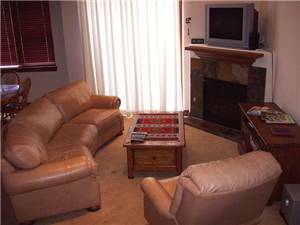 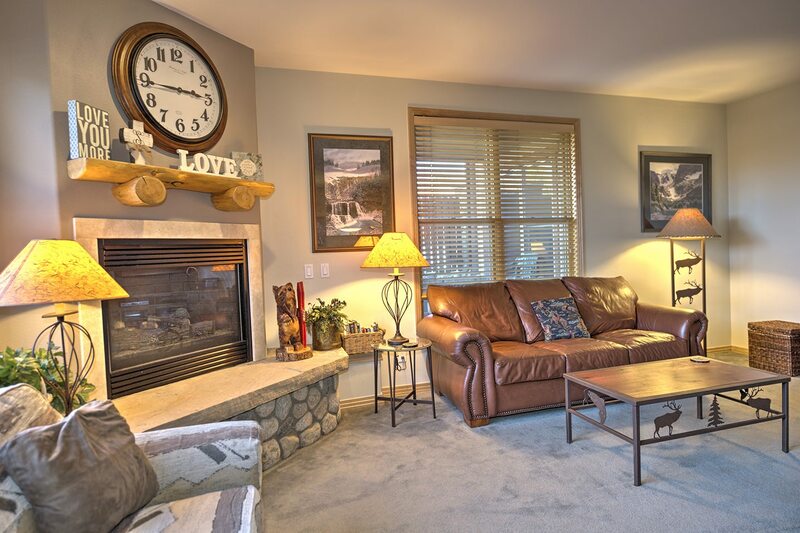 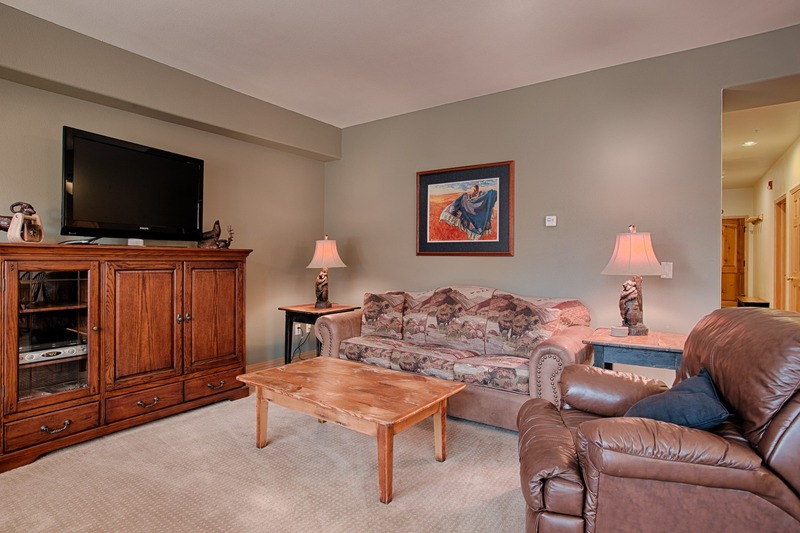 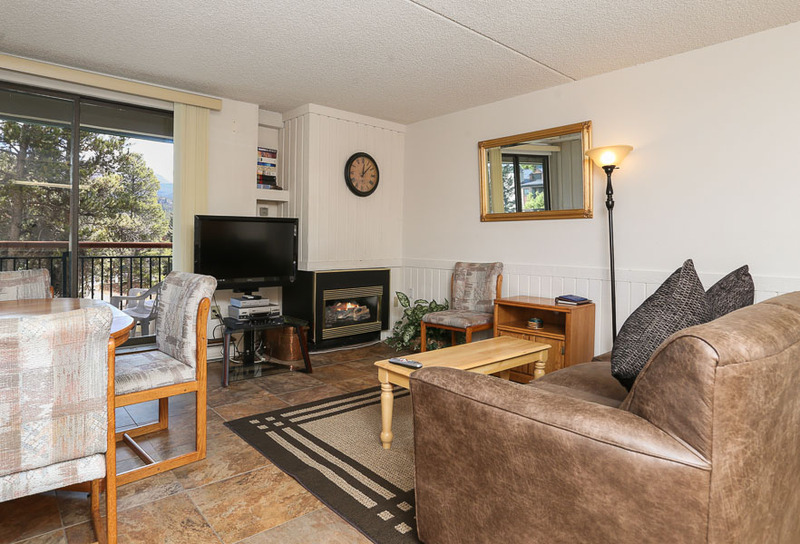 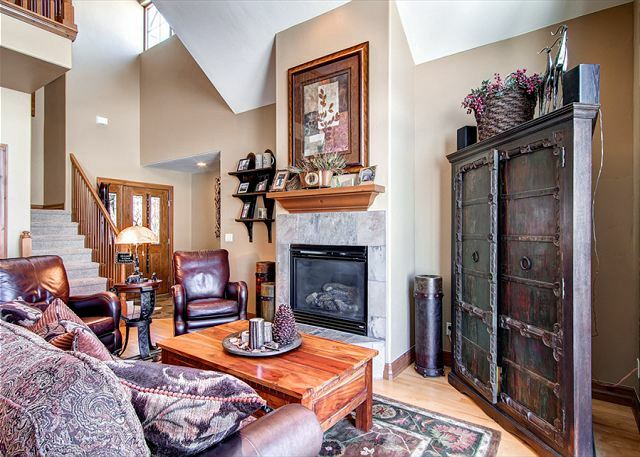 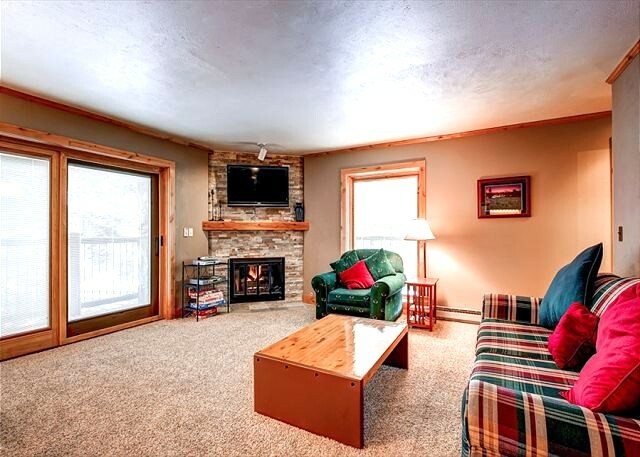 To your left is another sitting room with cozy gas fireplace which opens to the dinning area and well equipped, updated kitchen. 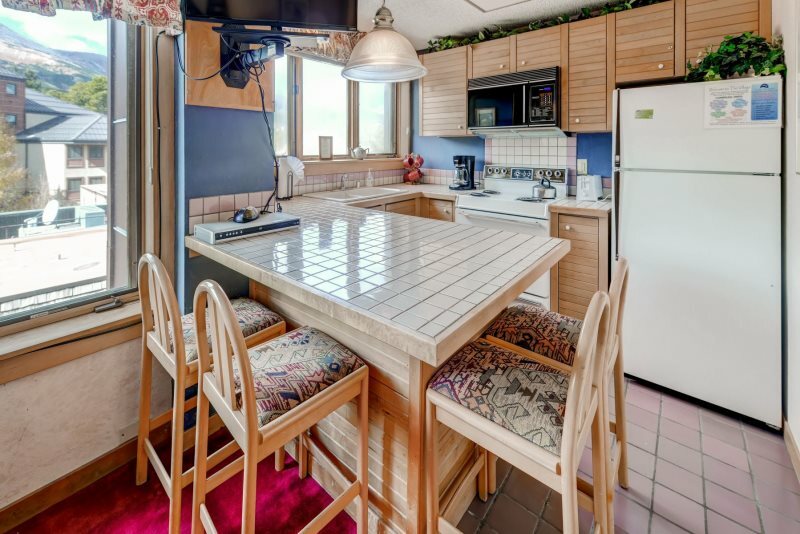 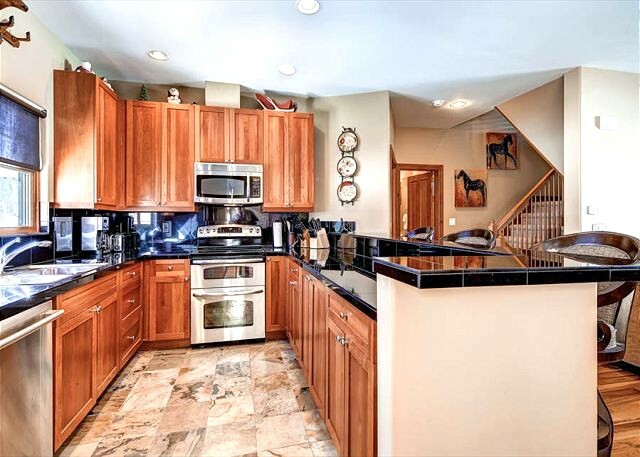 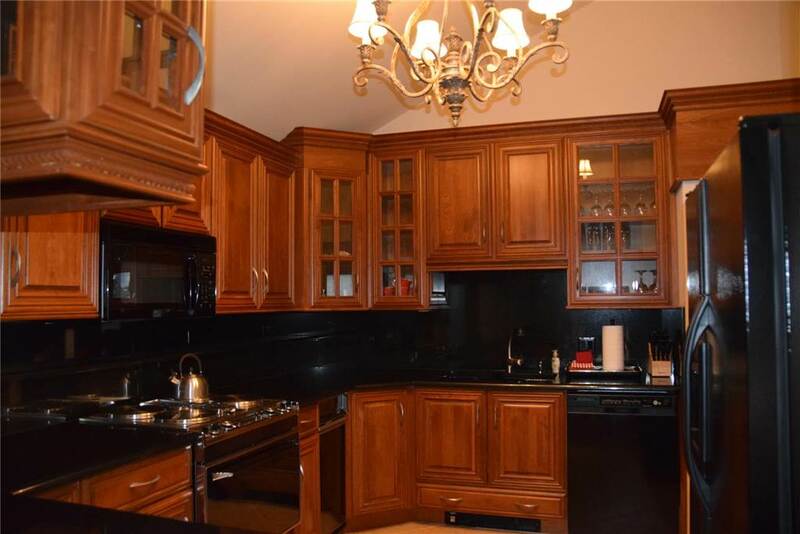 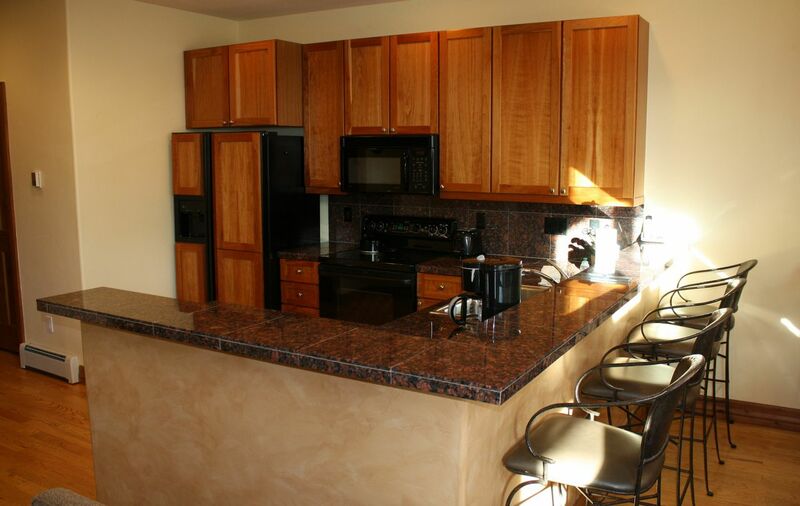 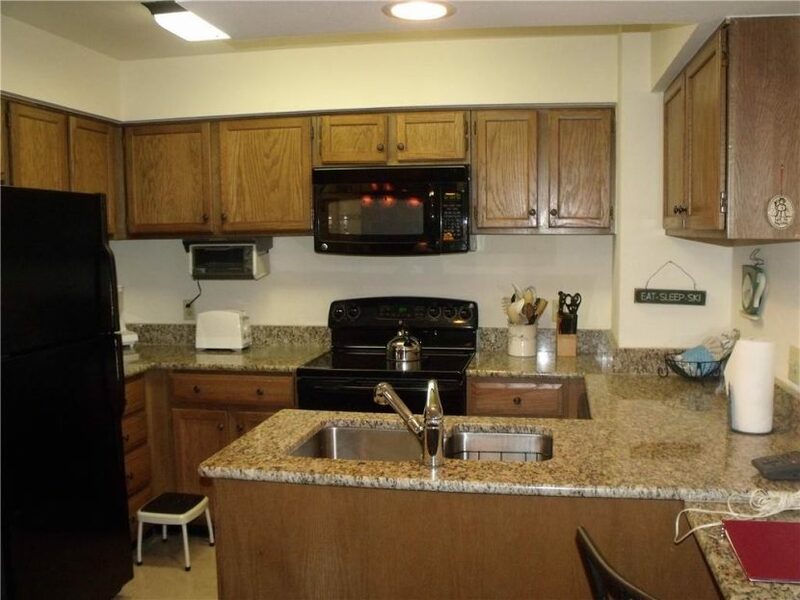 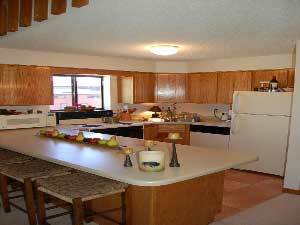 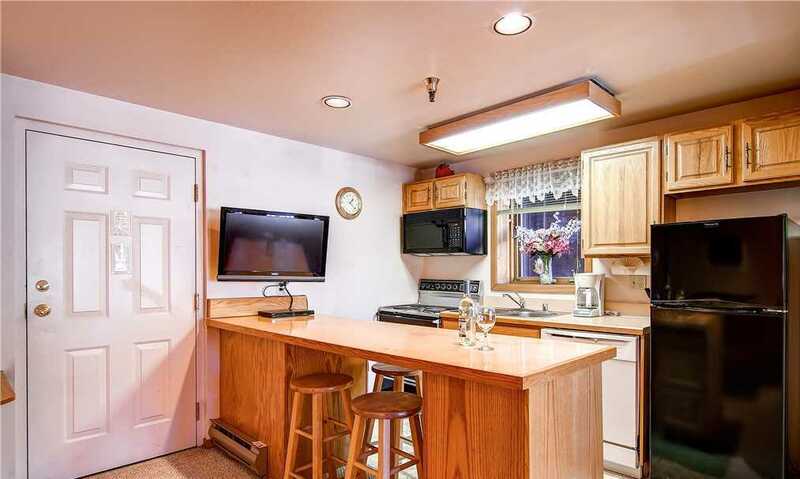 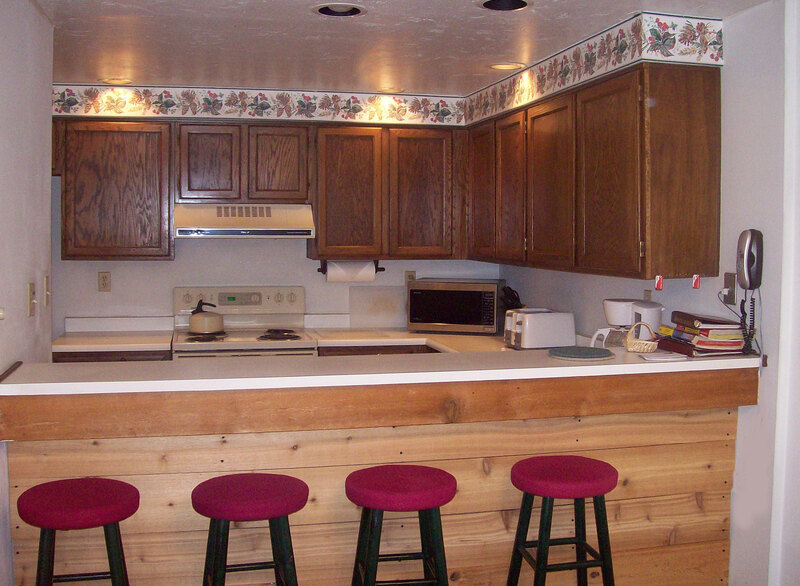 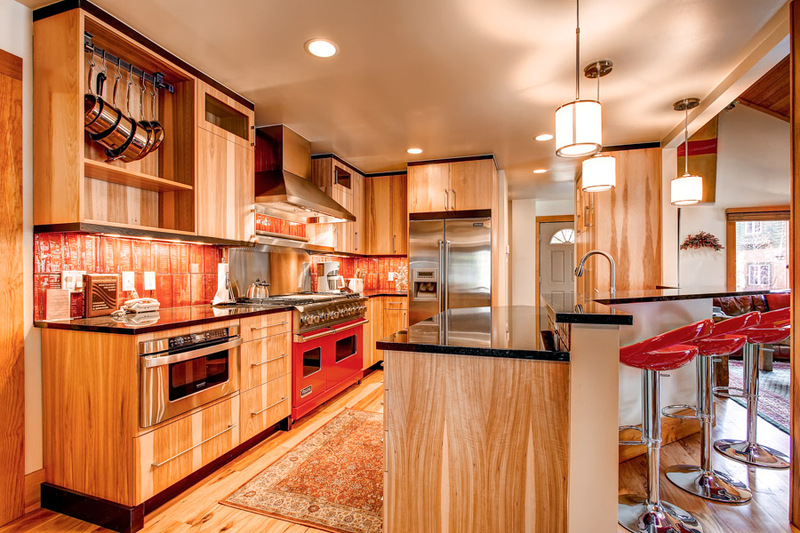 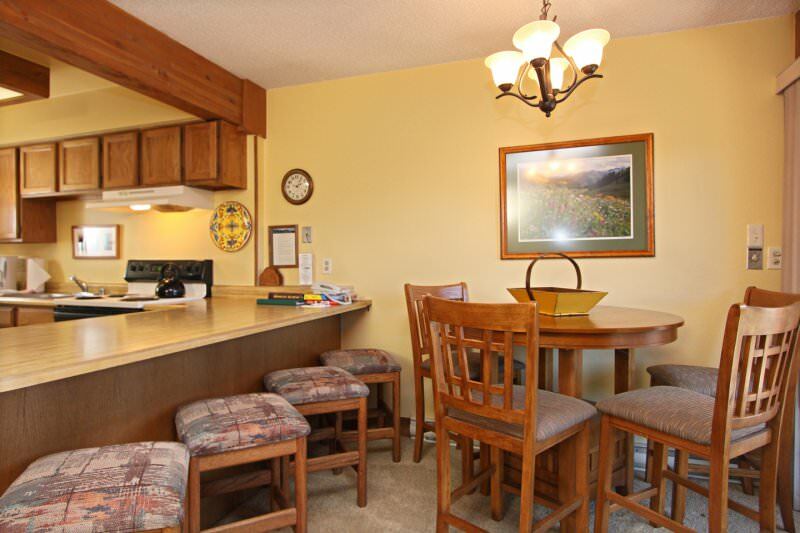 There’s another breakfast table just past the kitchen and also a half bathroom. 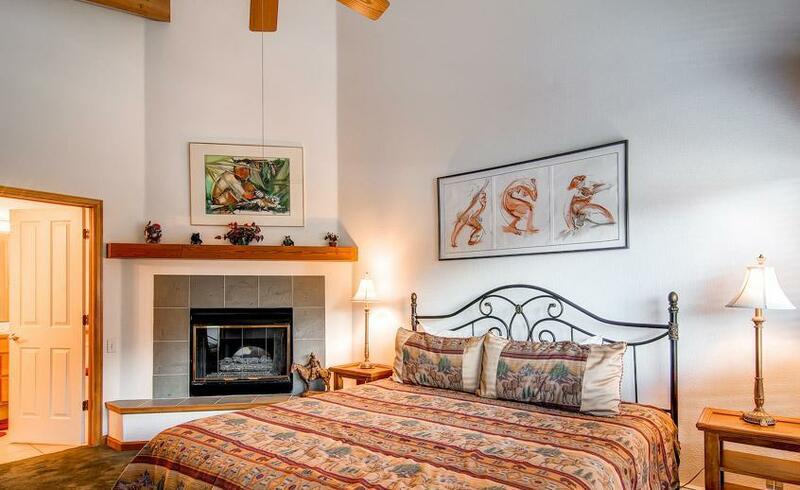 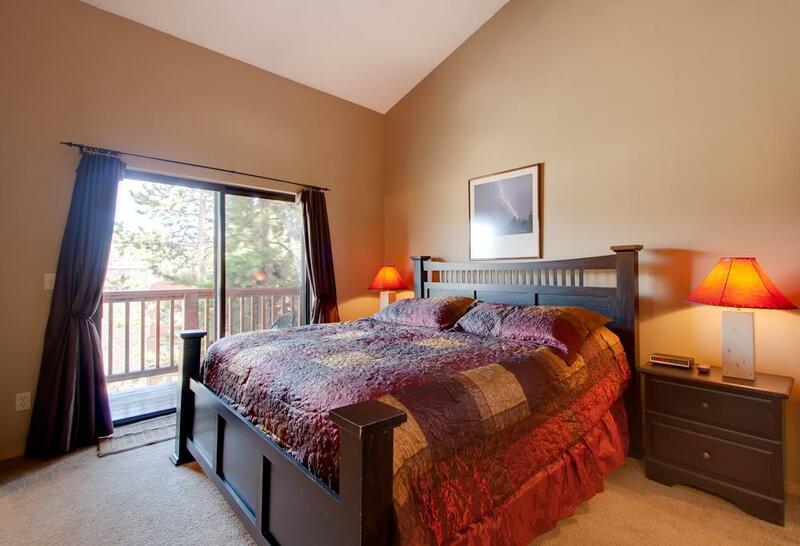 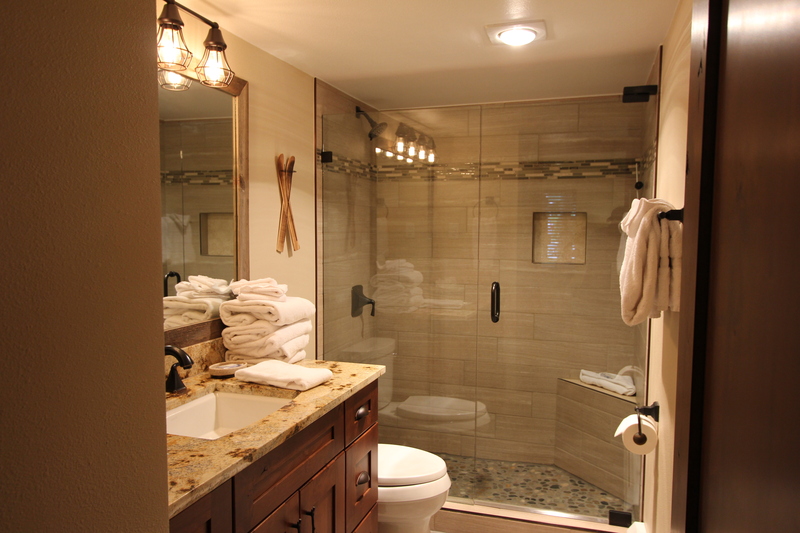 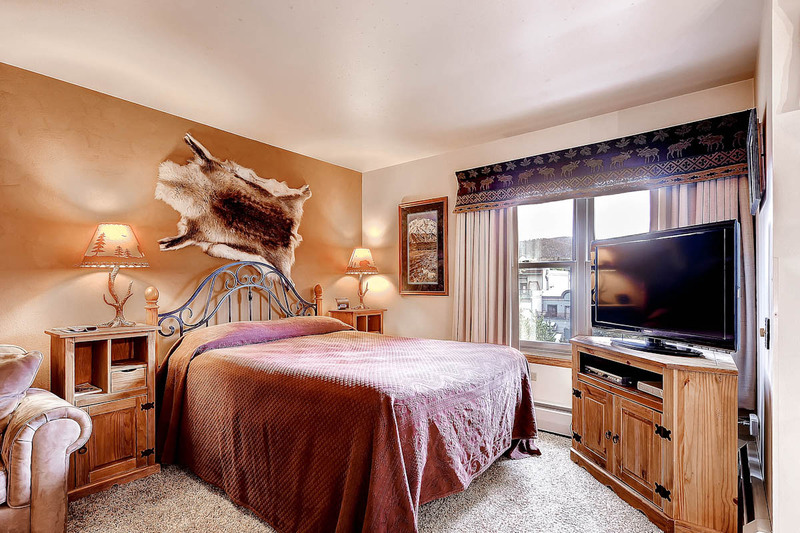 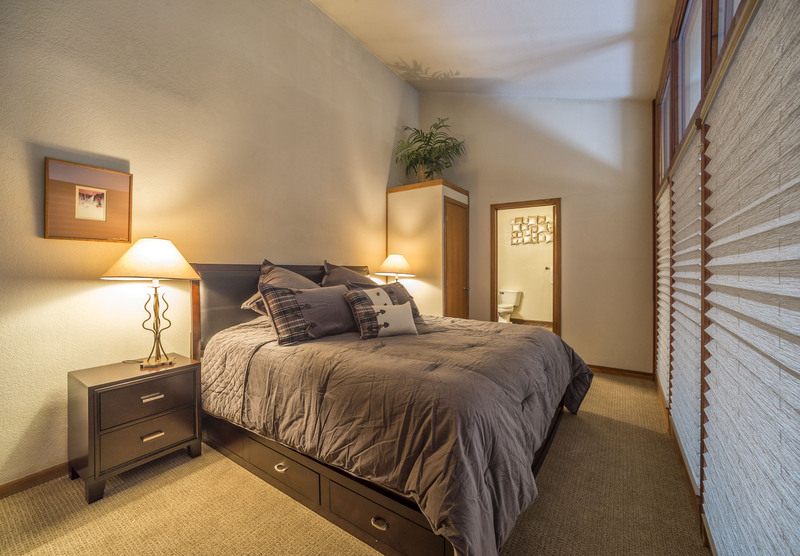 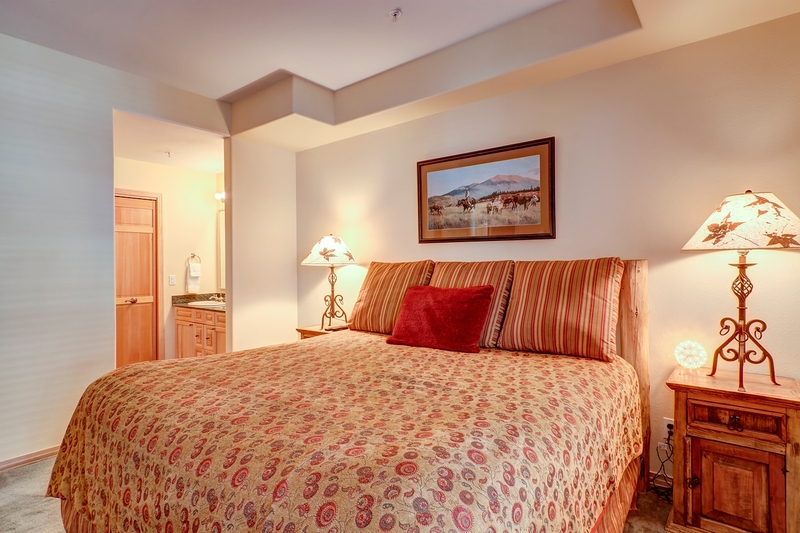 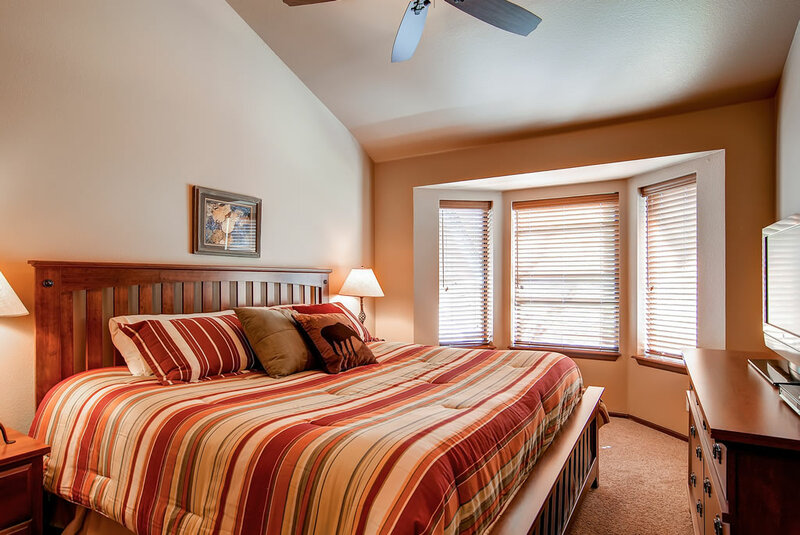 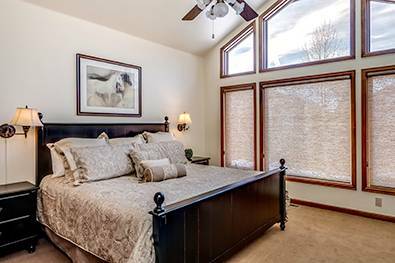 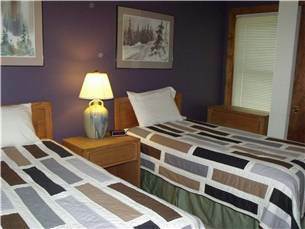 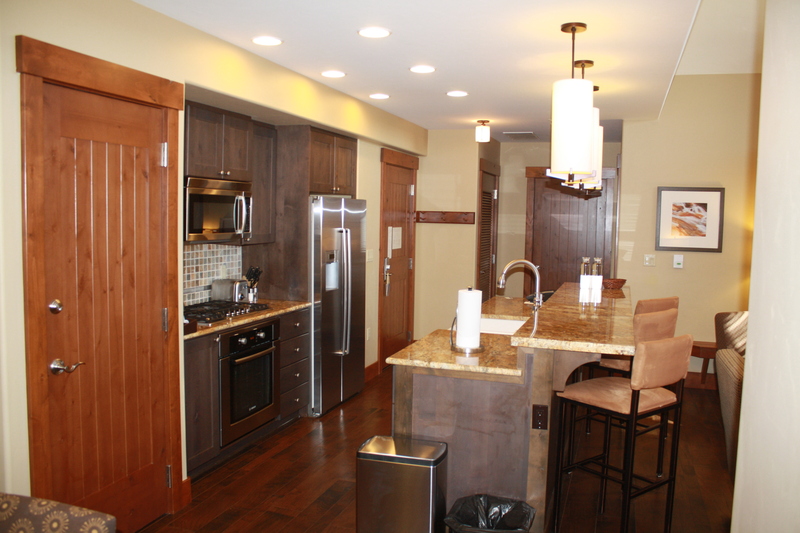 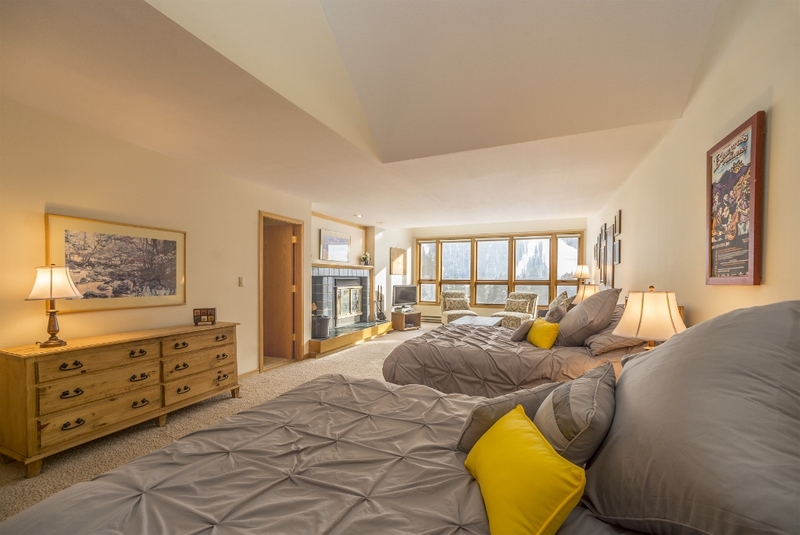 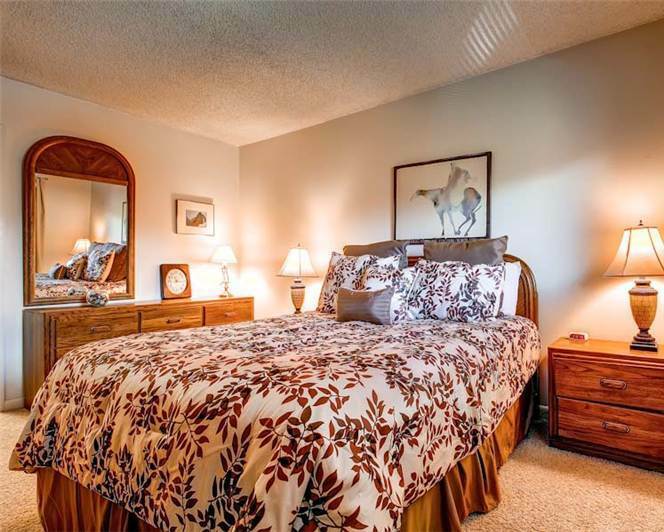 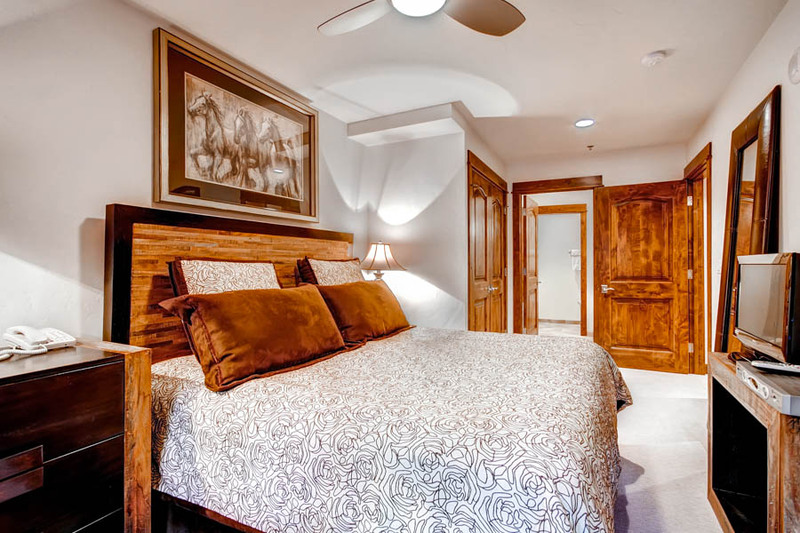 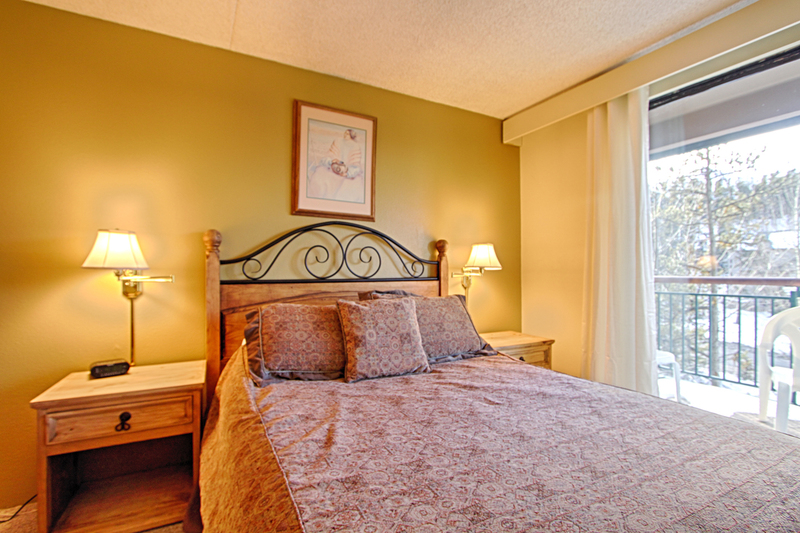 The master bedroom is on the main level with a king bed, en suite bathroom with jetted tub and separate shower. 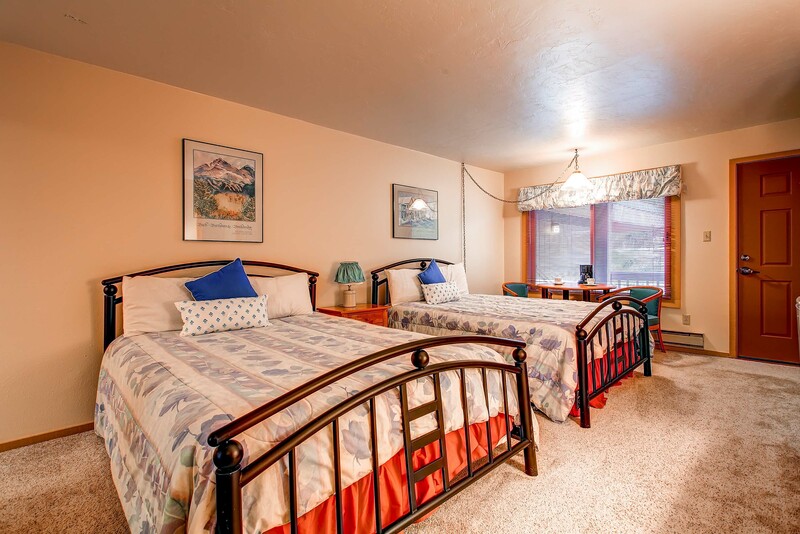 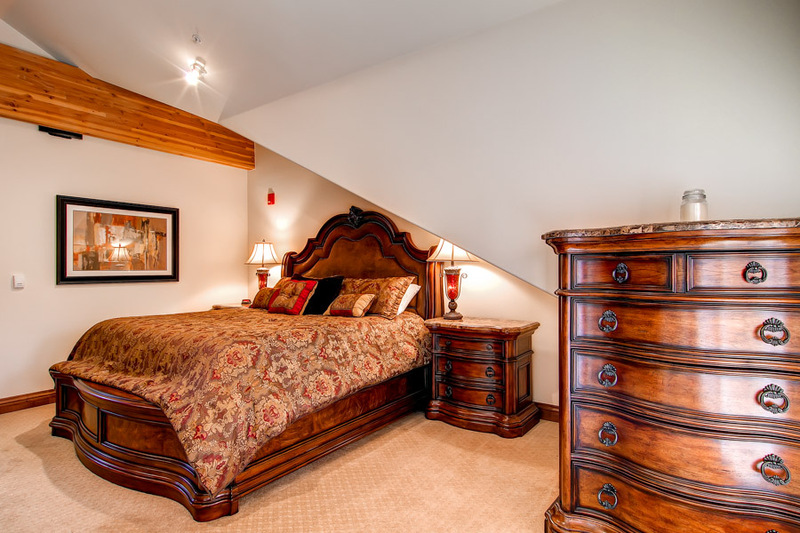 Upstairs you’ll find 2 more bedrooms each with a full bed and a full bathroom in the hallway. 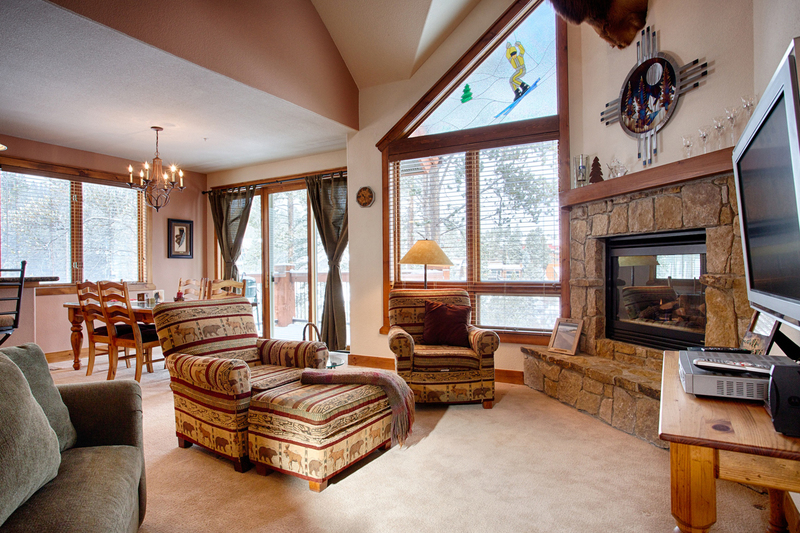 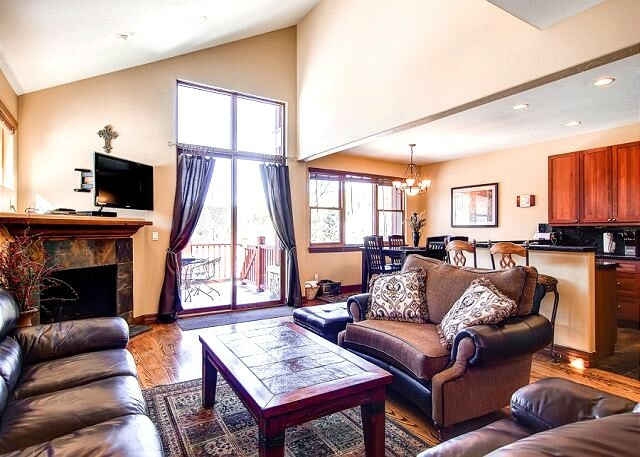 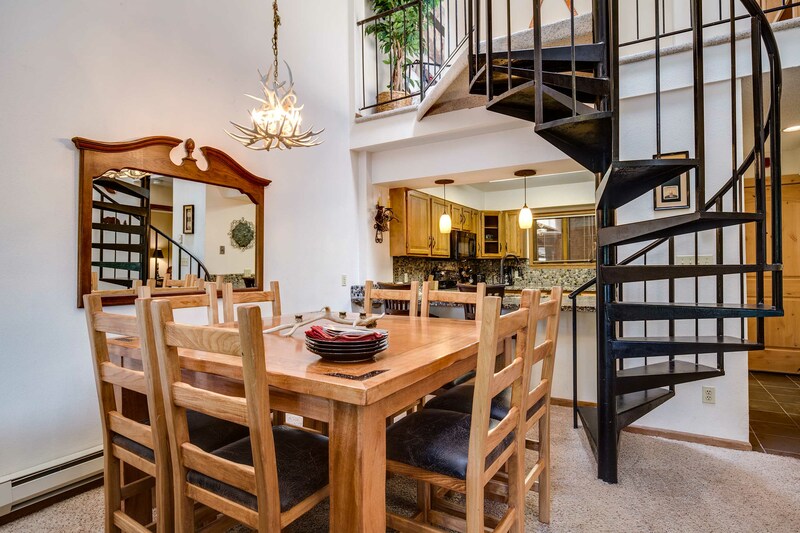 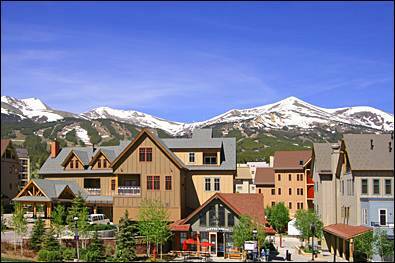 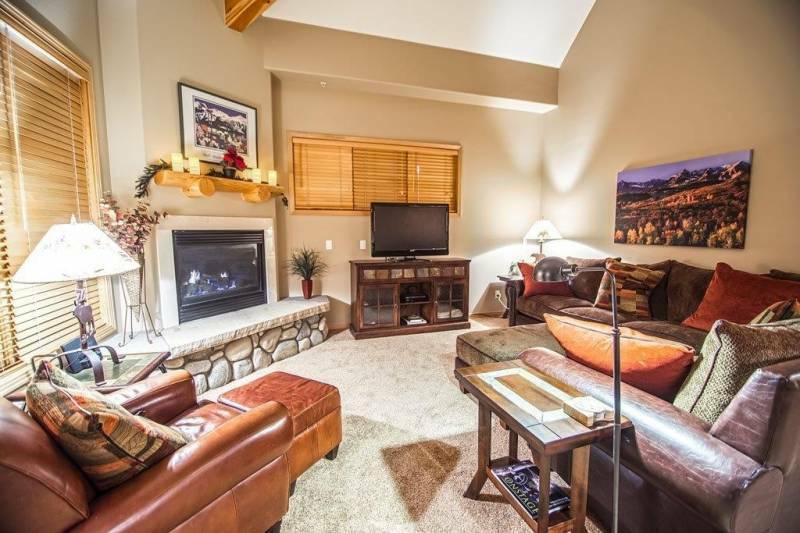 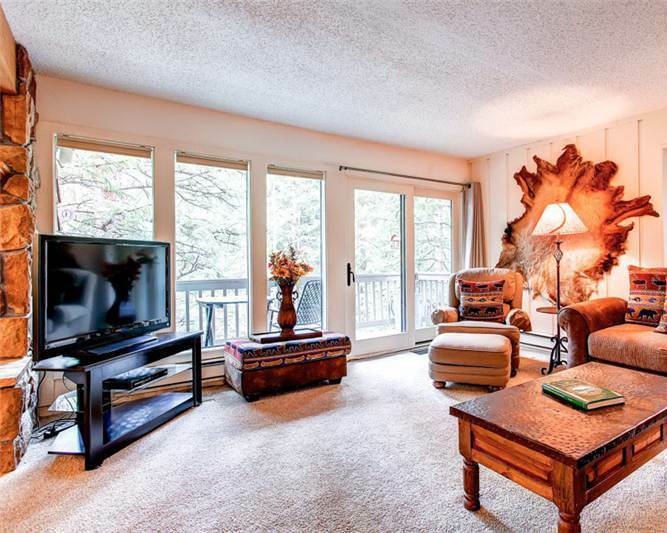 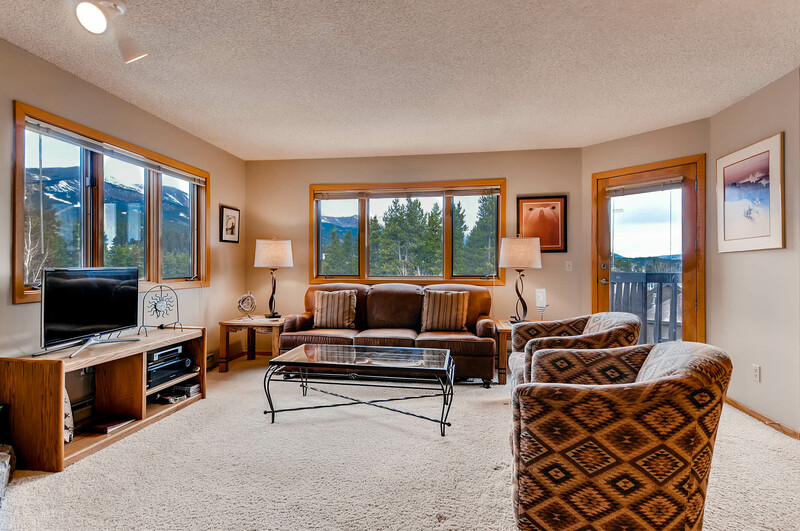 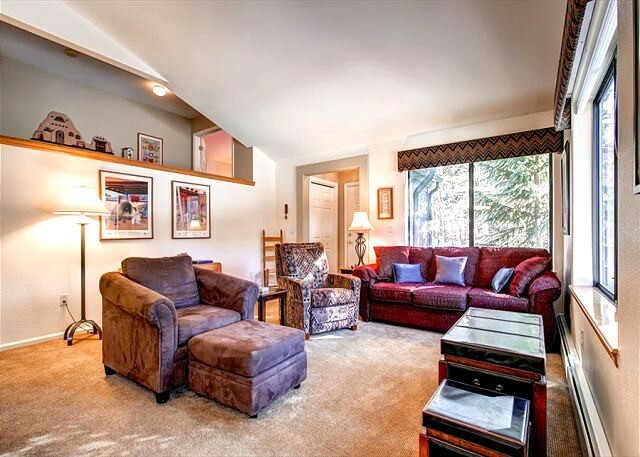 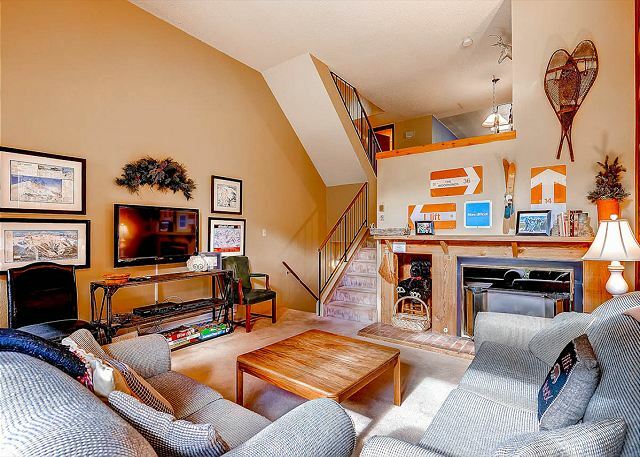 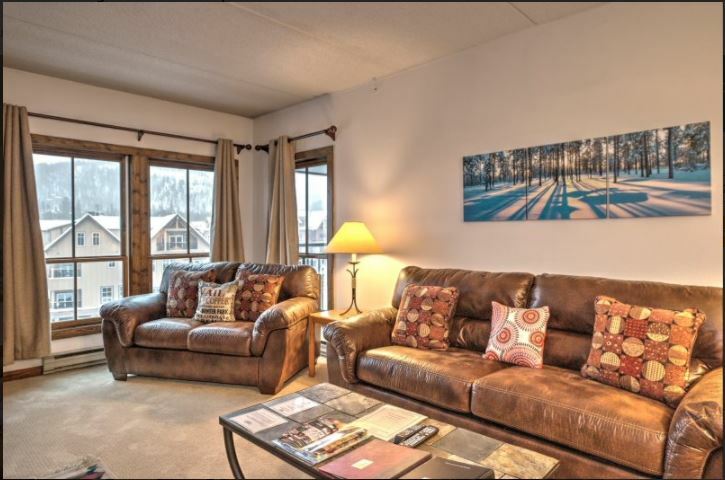 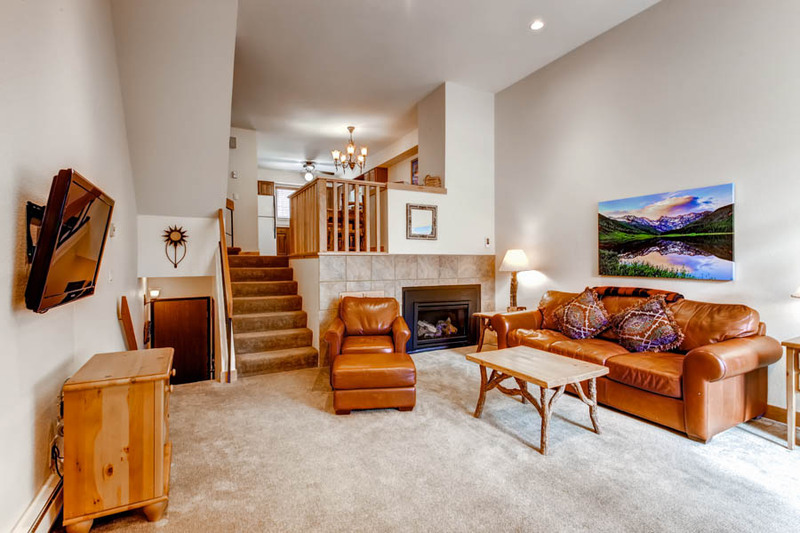 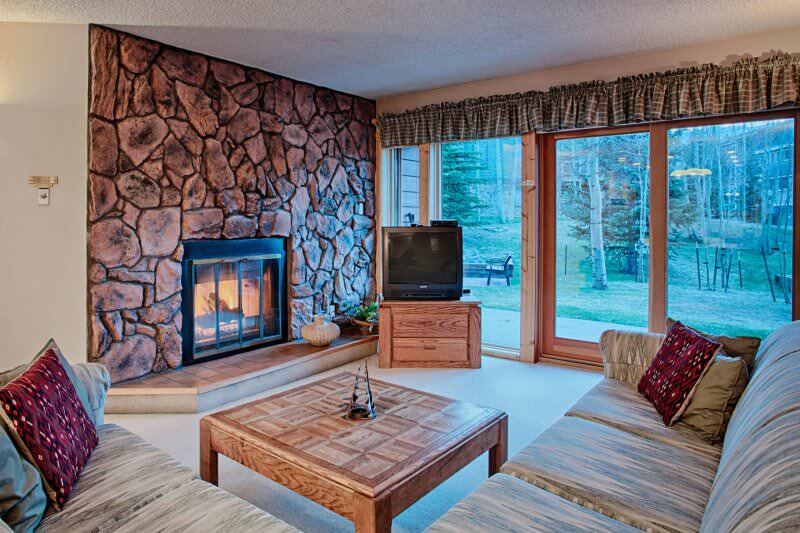 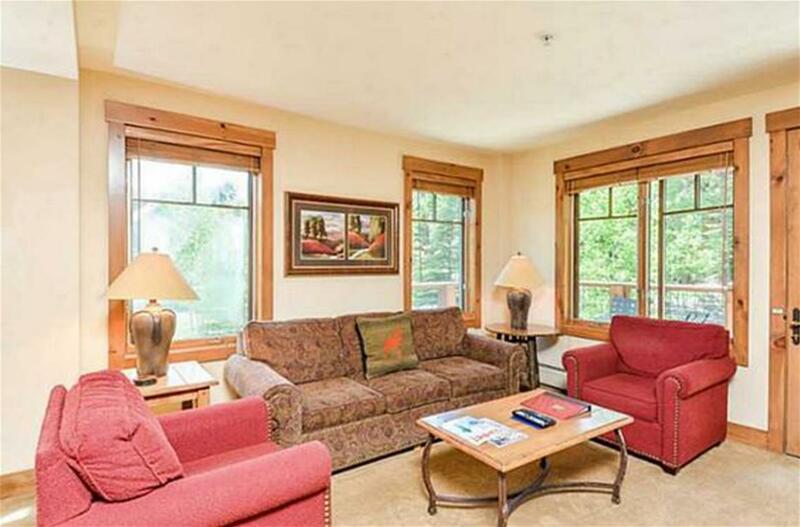 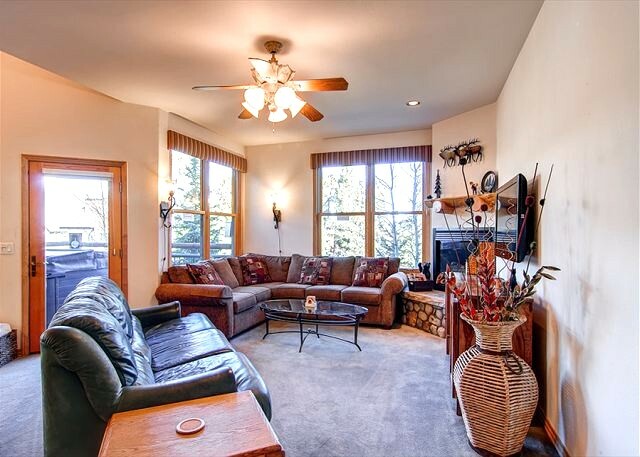 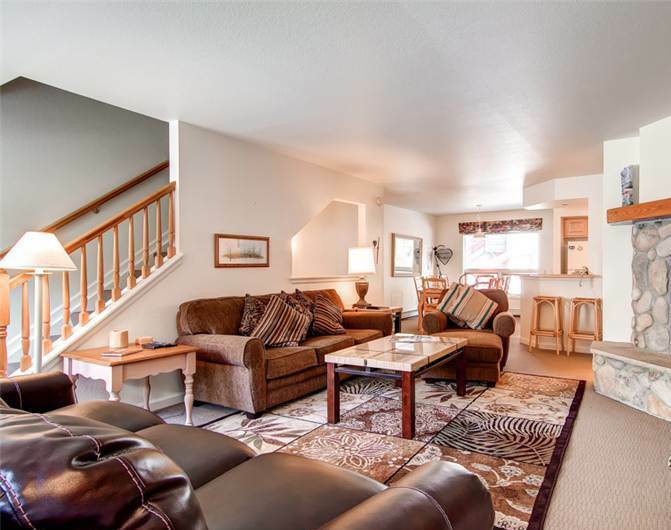 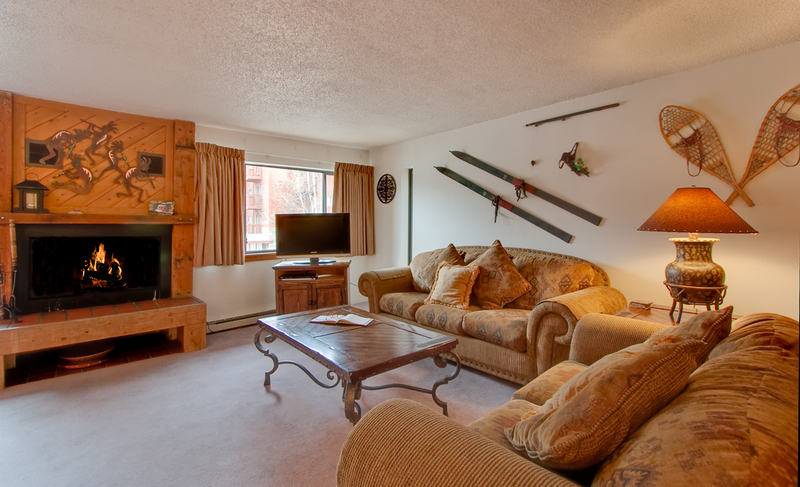 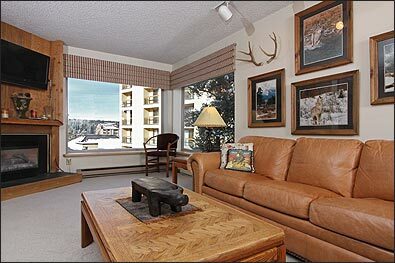 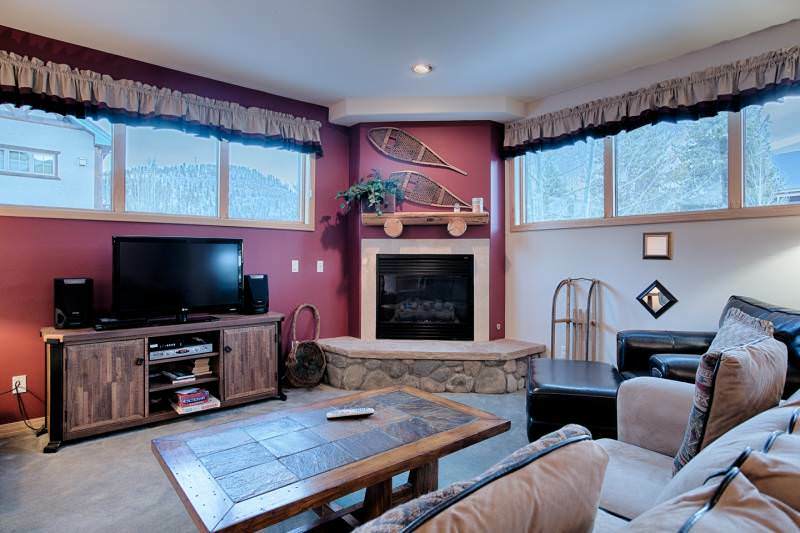 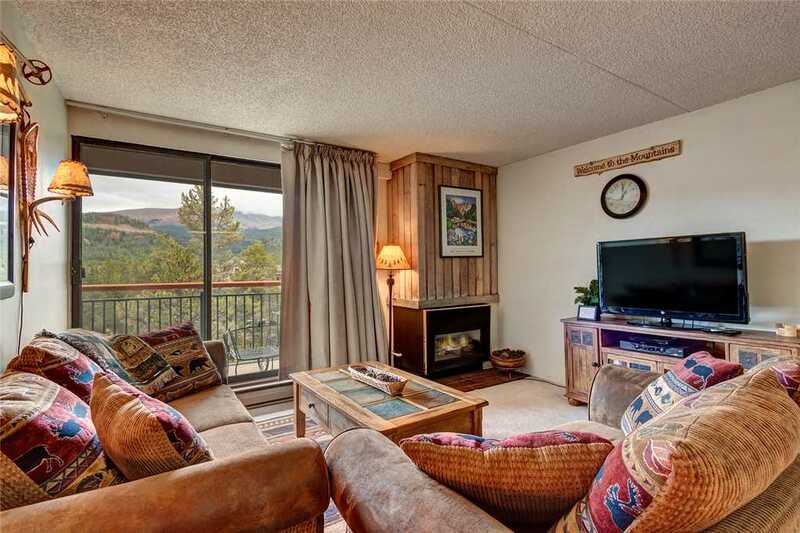 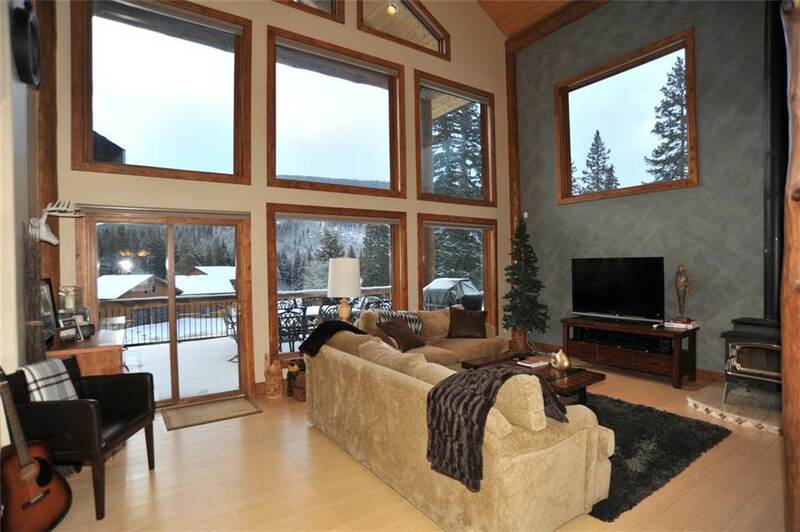 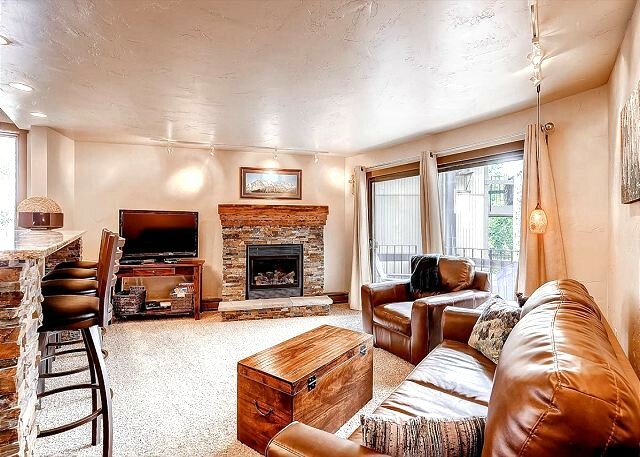 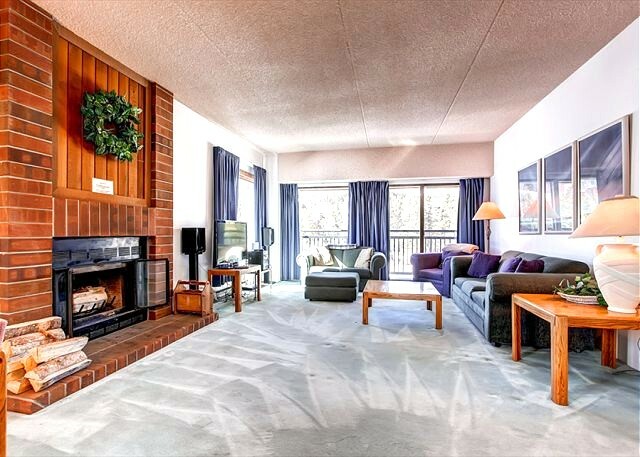 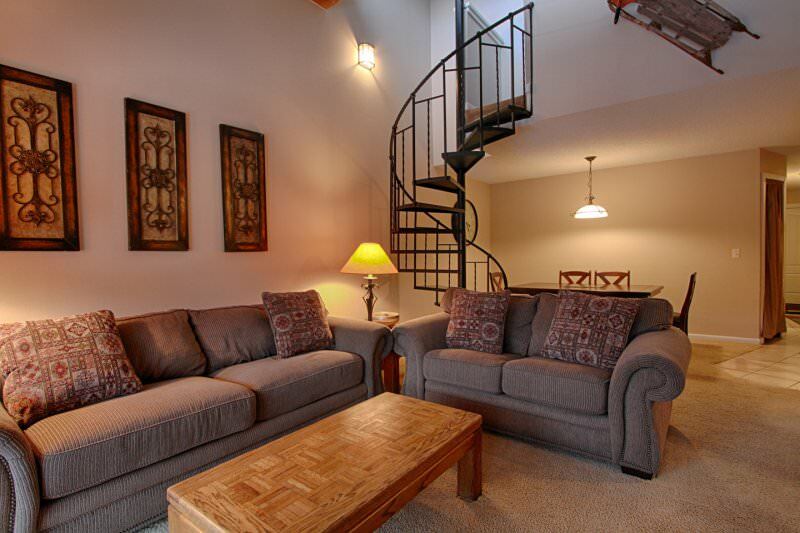 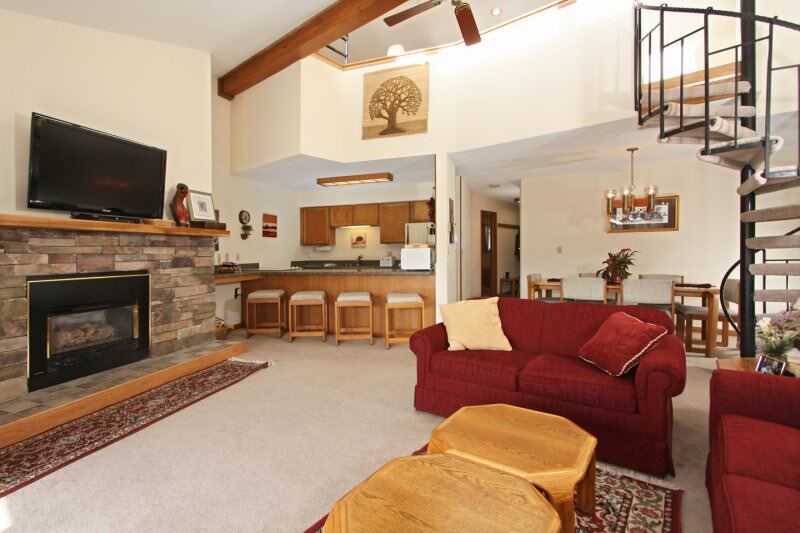 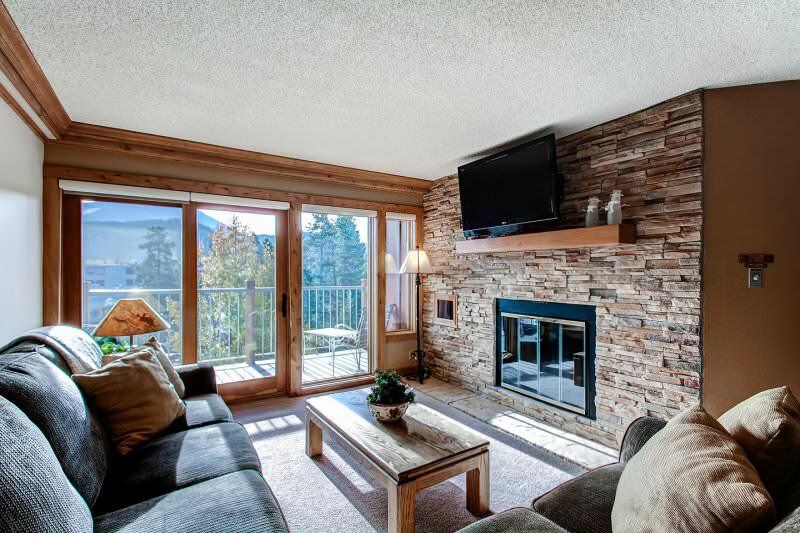 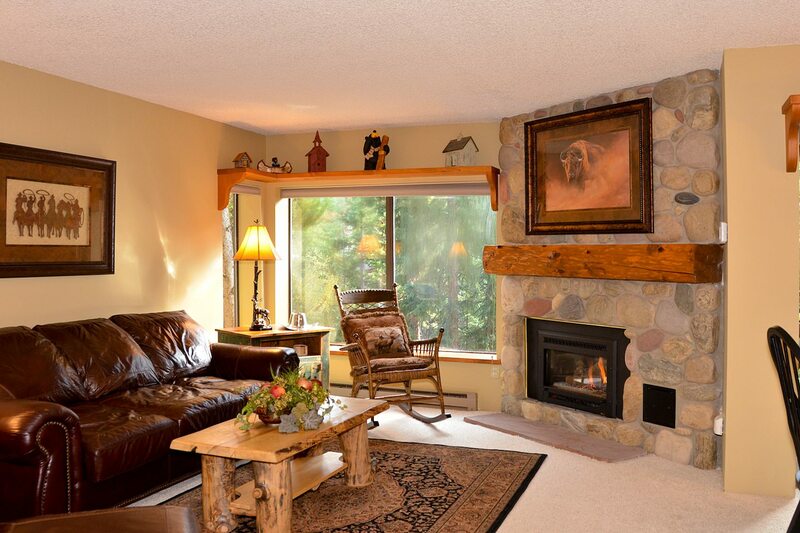 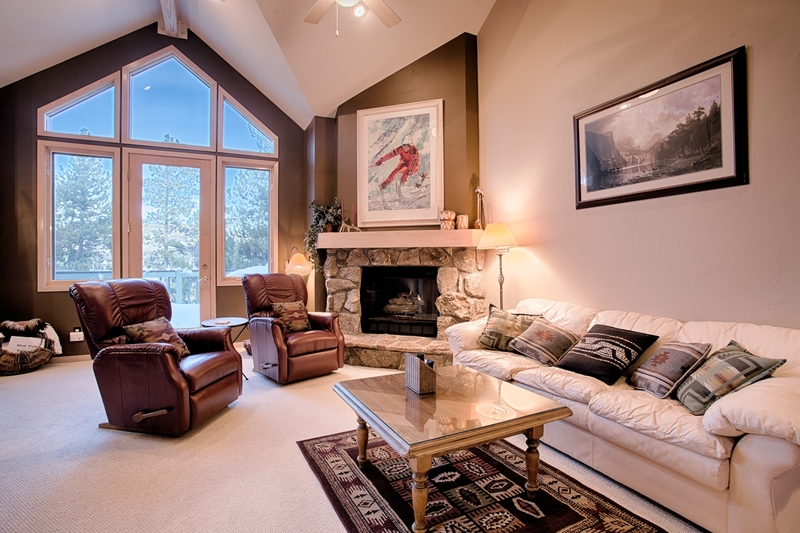 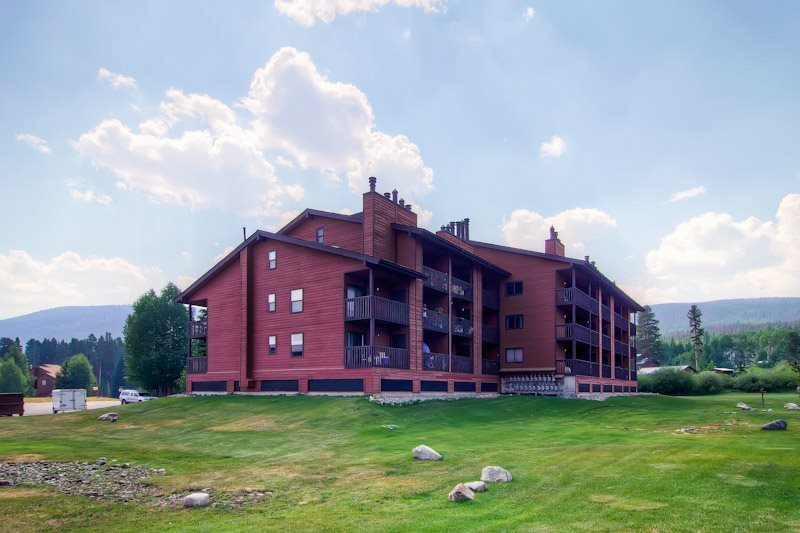 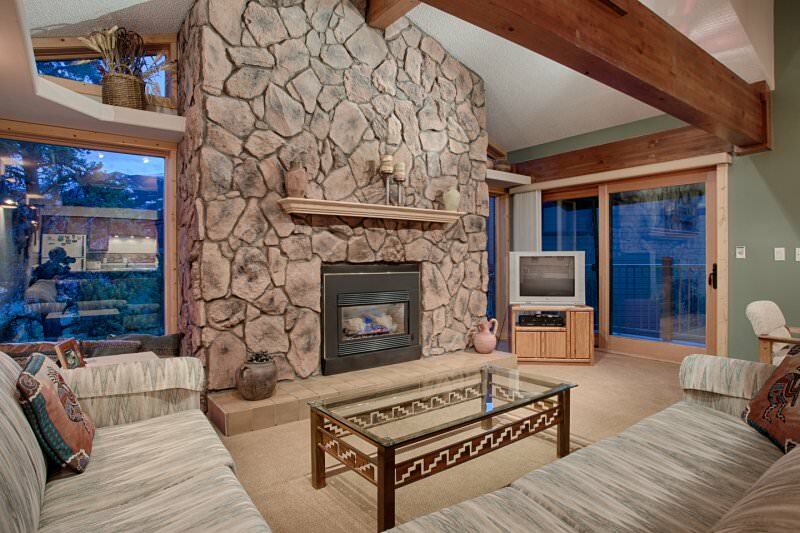 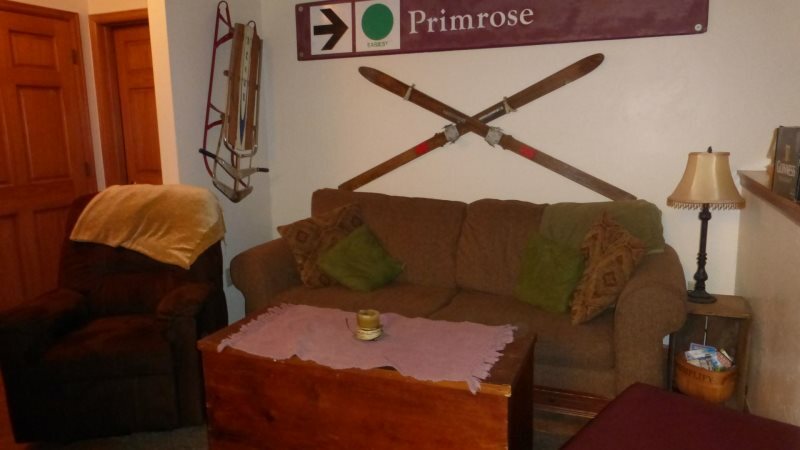 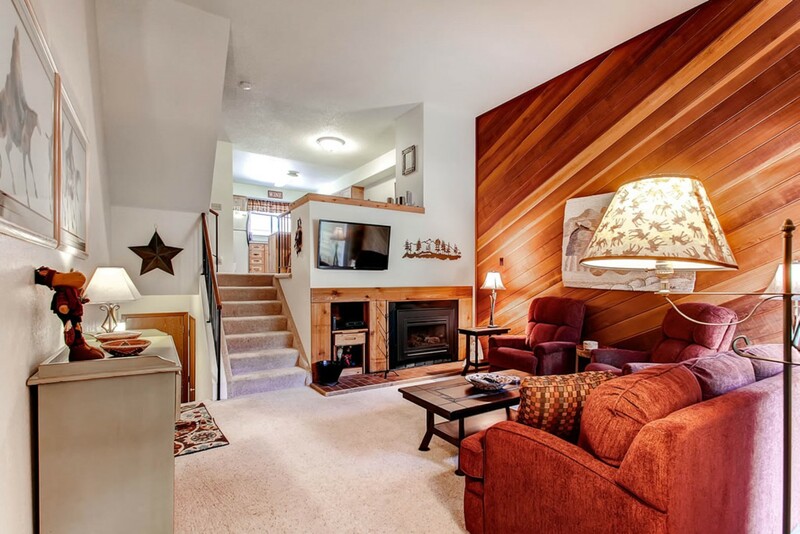 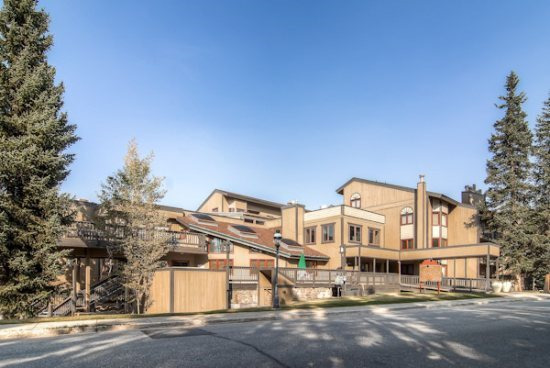 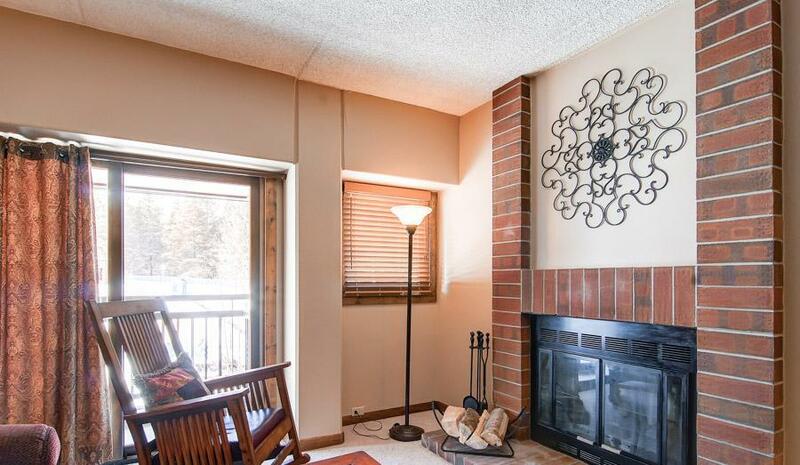 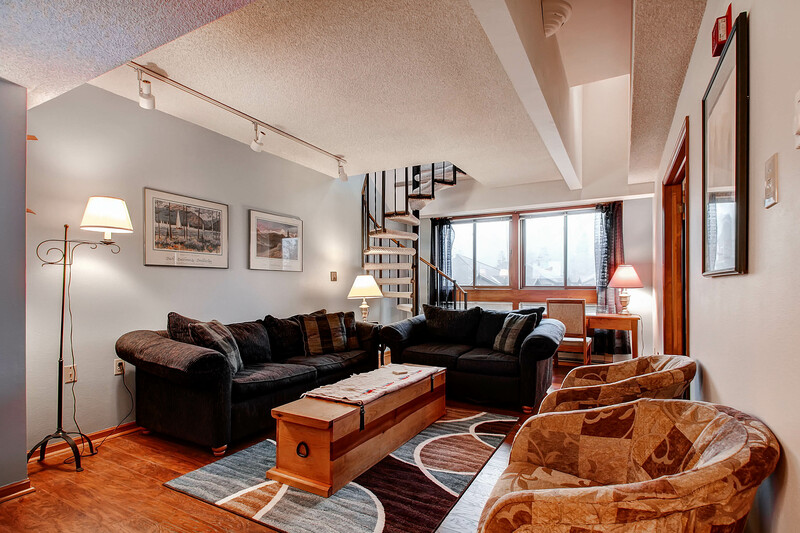 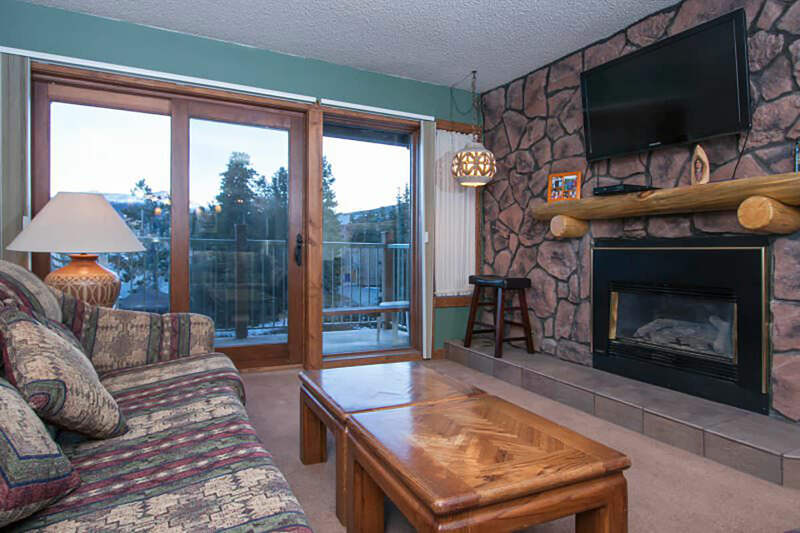 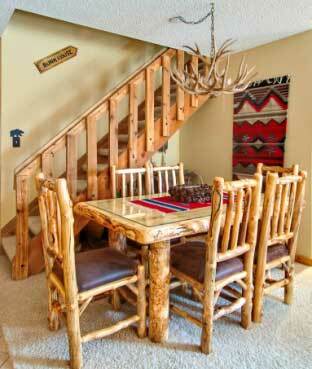 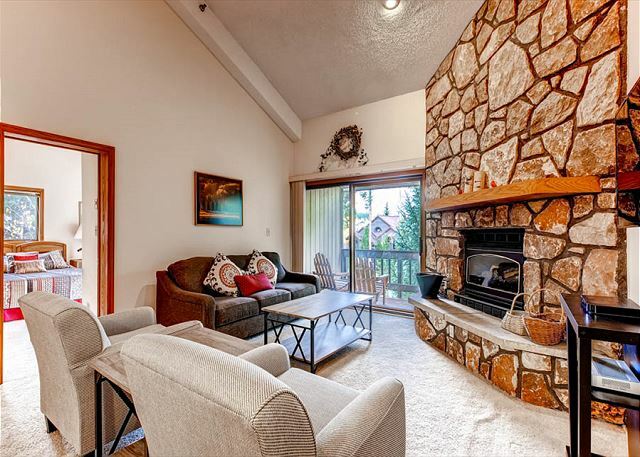 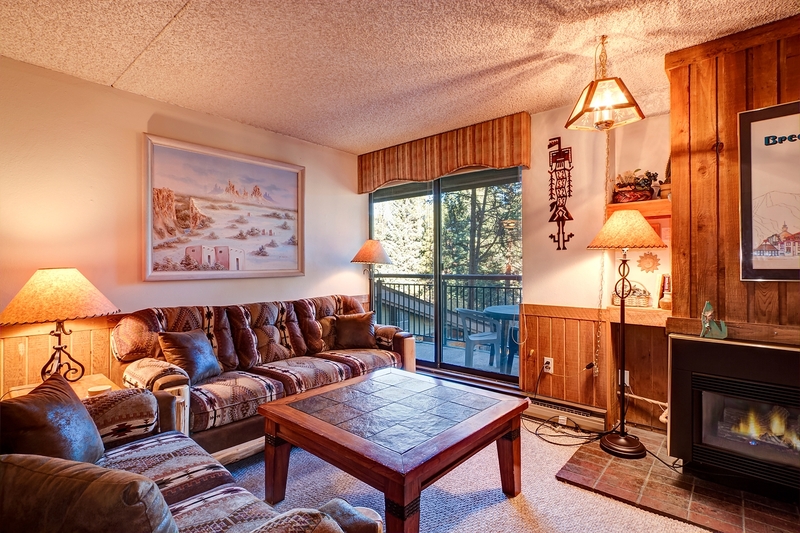 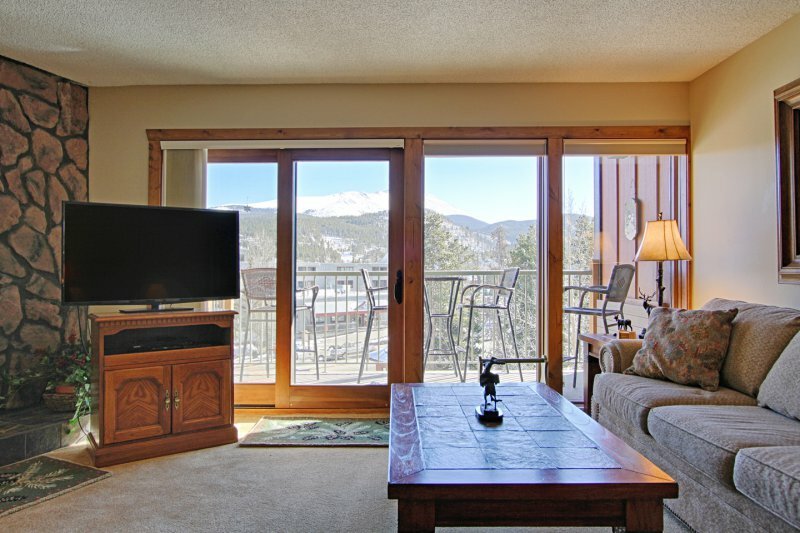 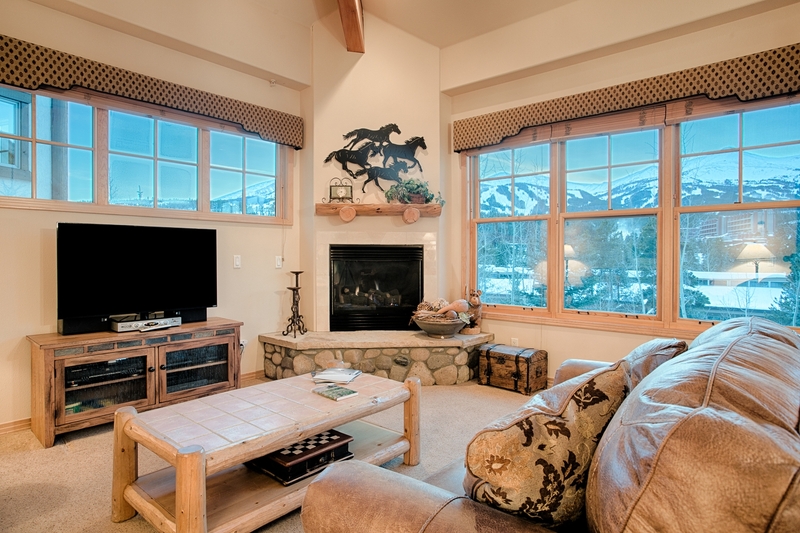 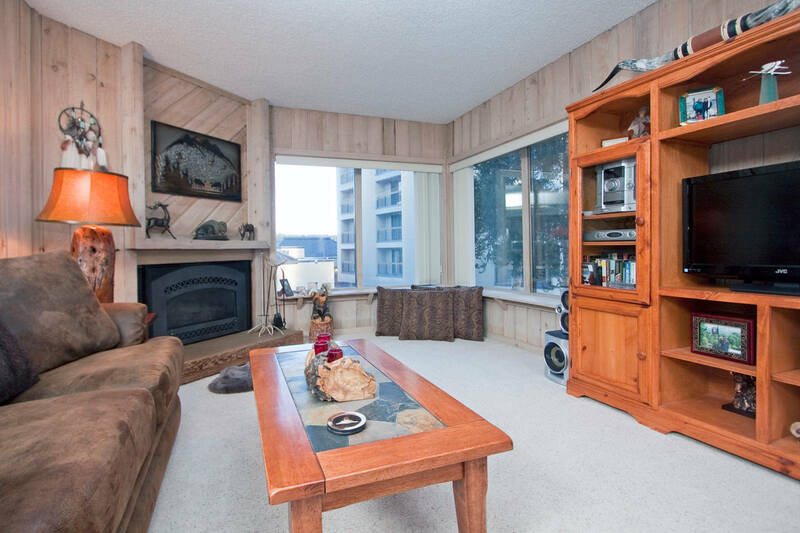 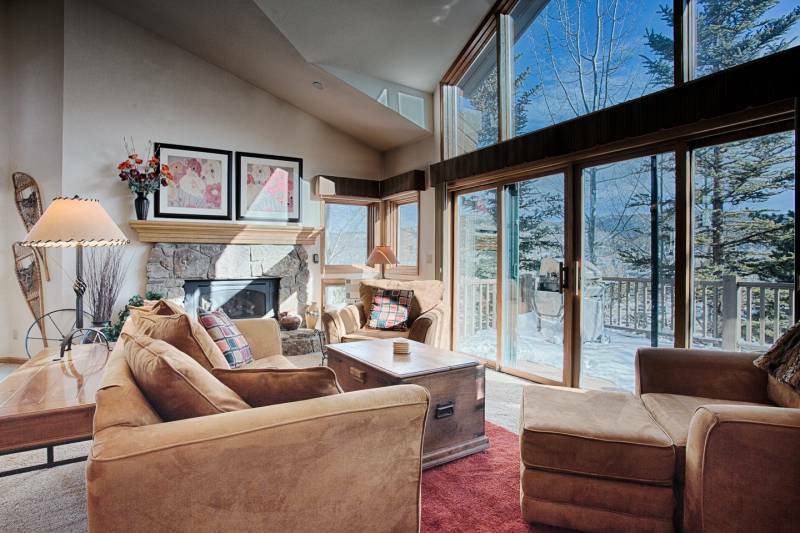 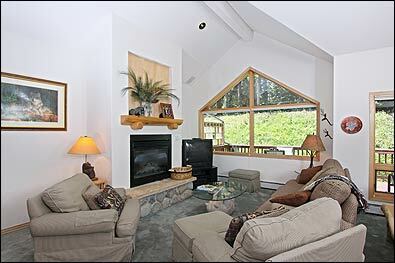 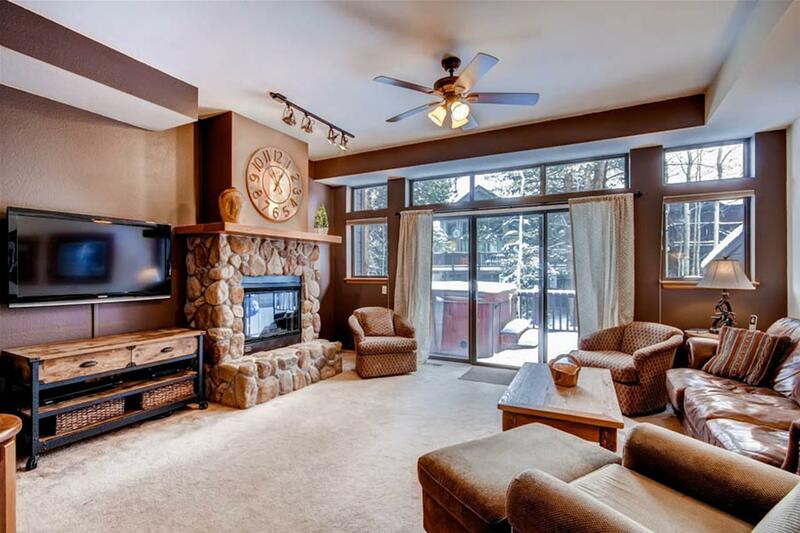 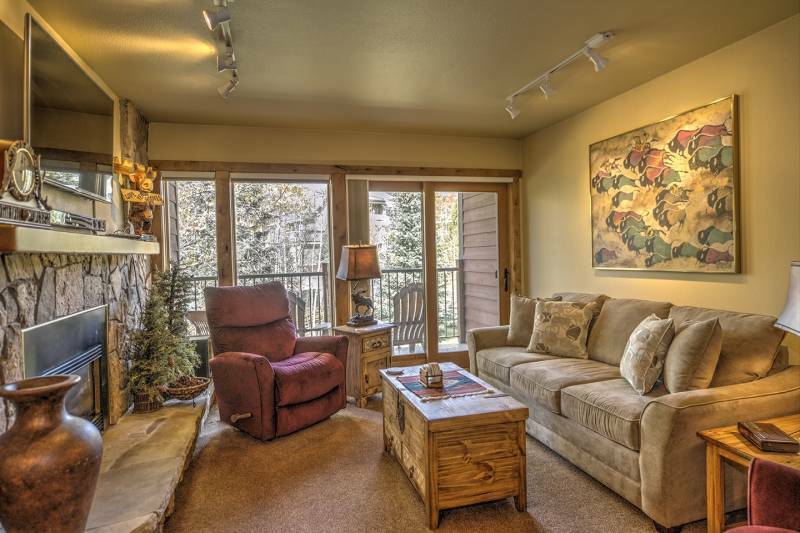 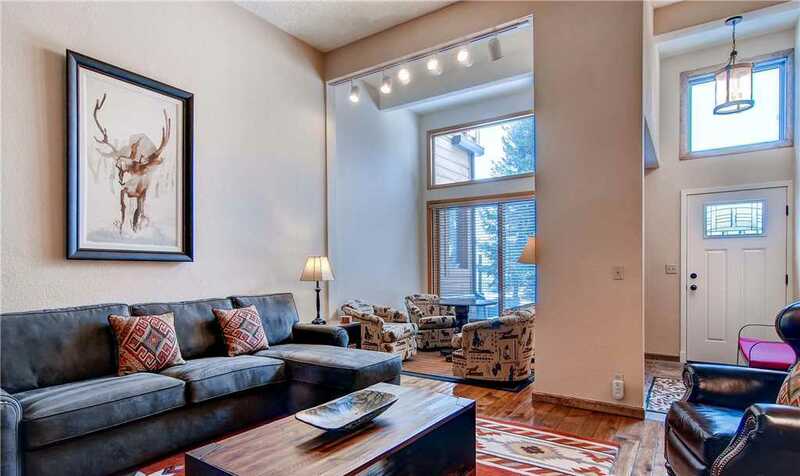 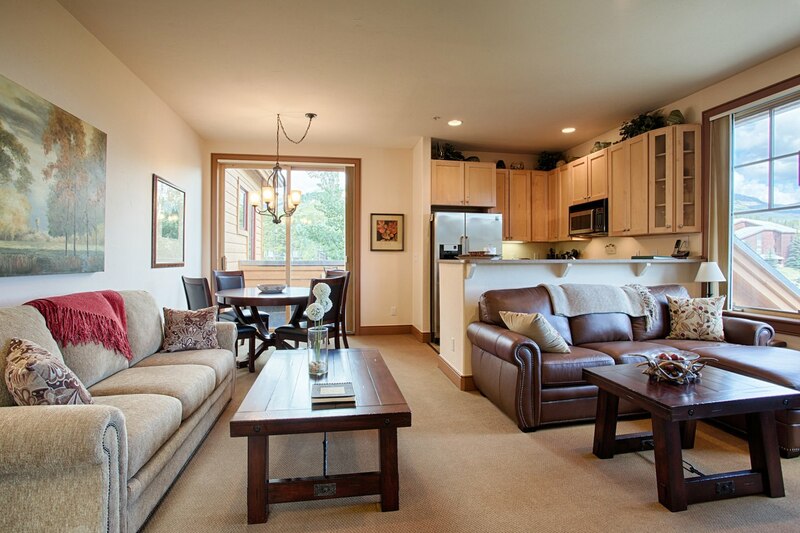 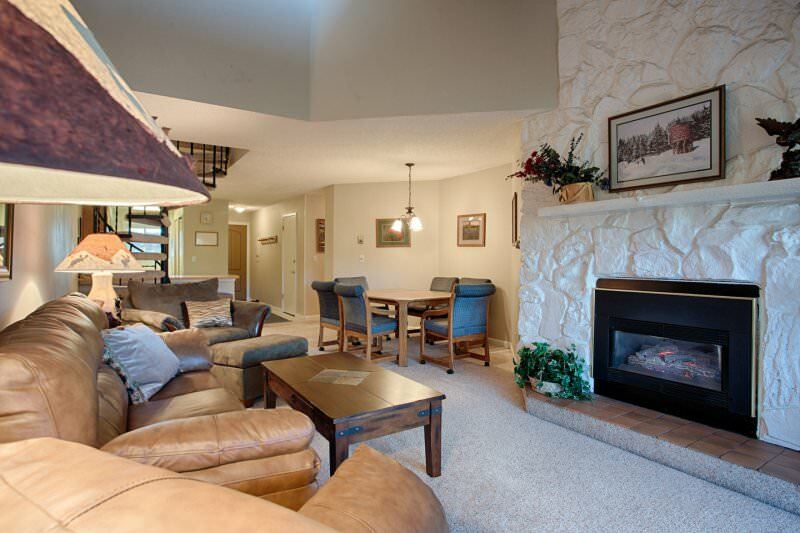 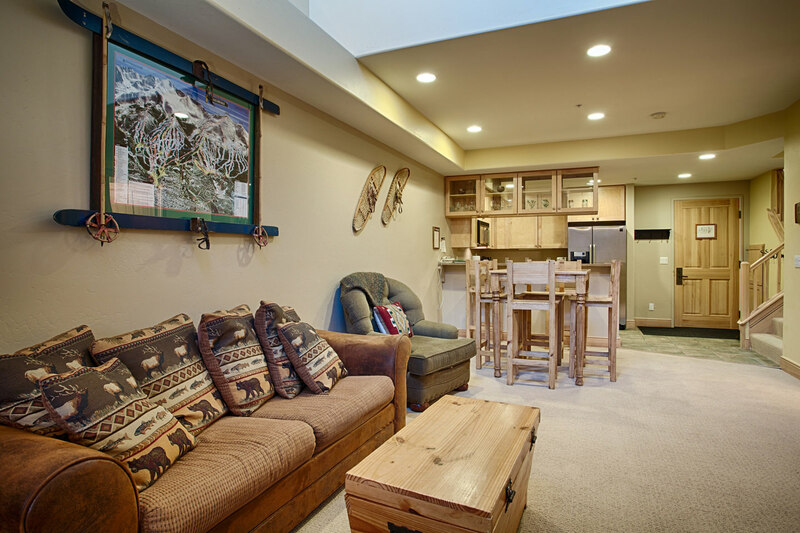 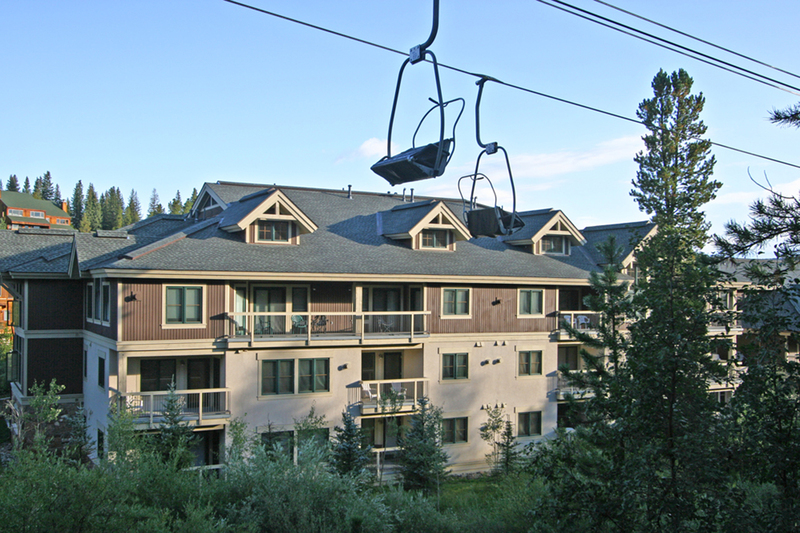 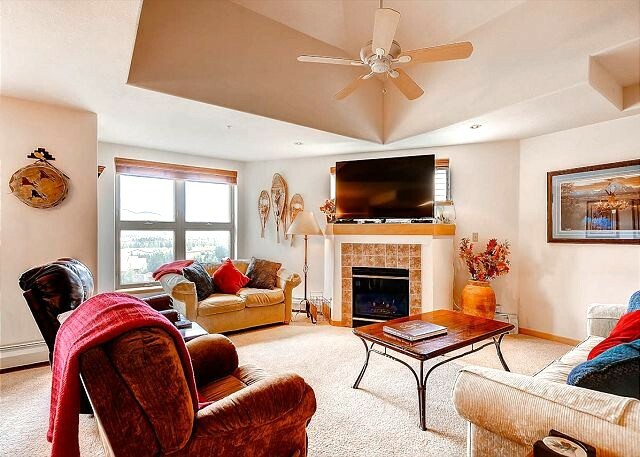 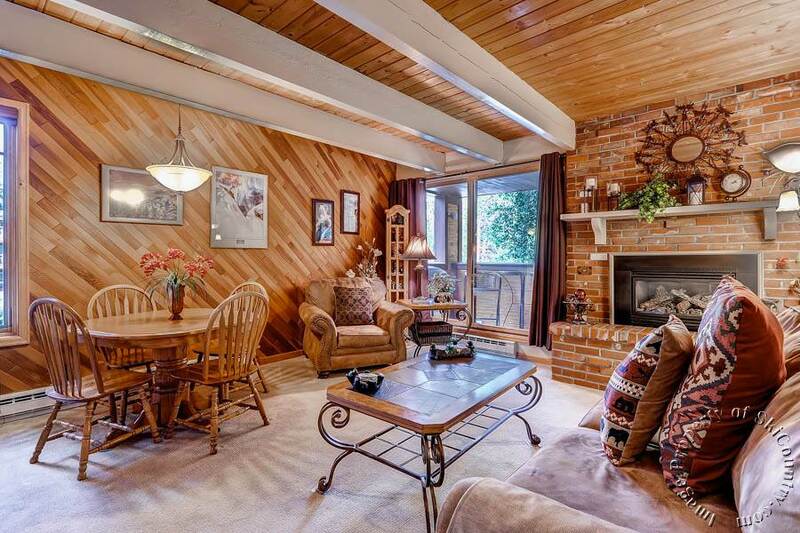 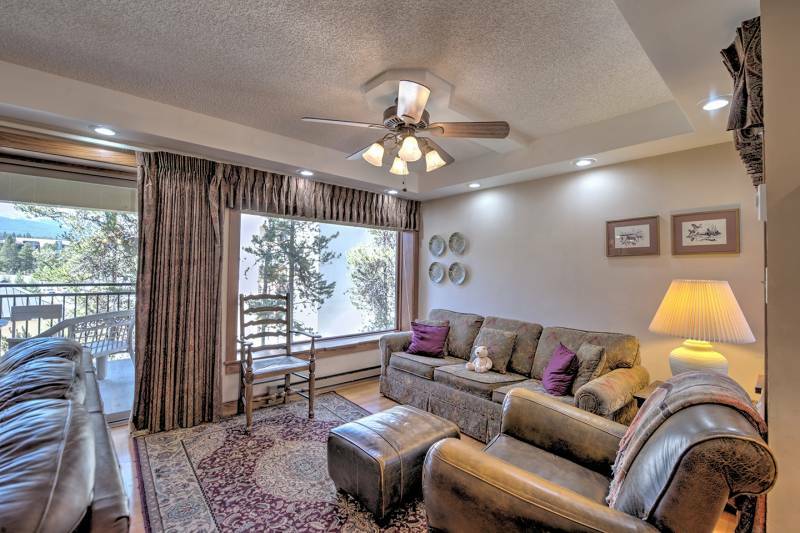 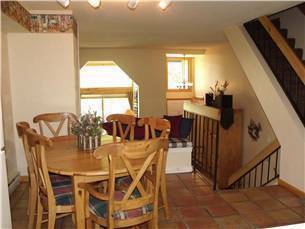 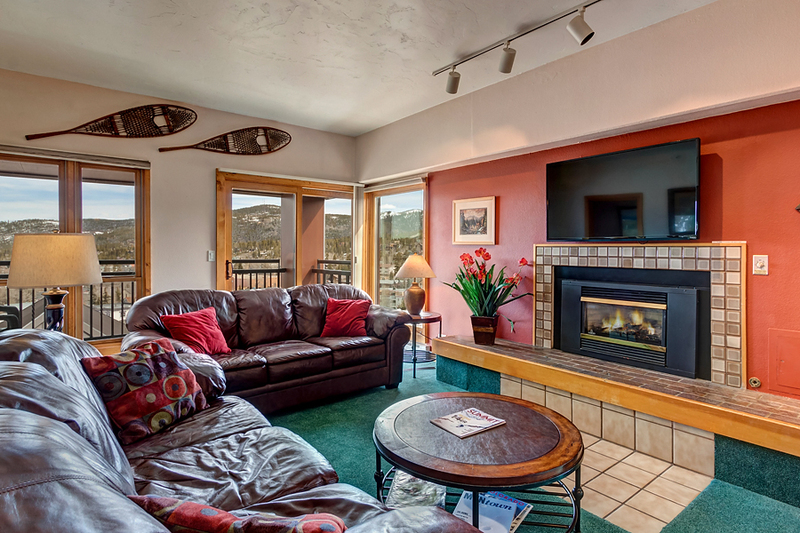 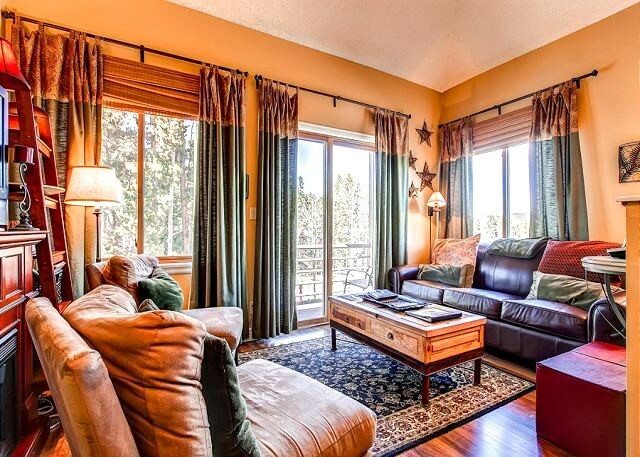 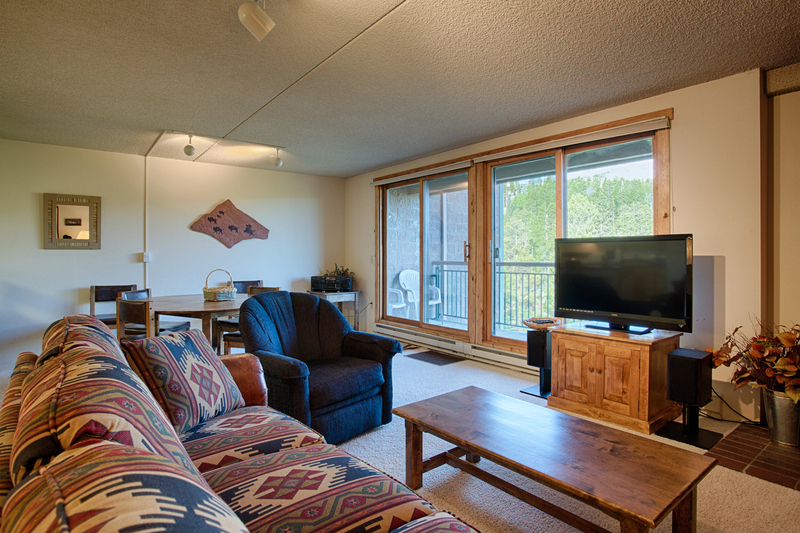 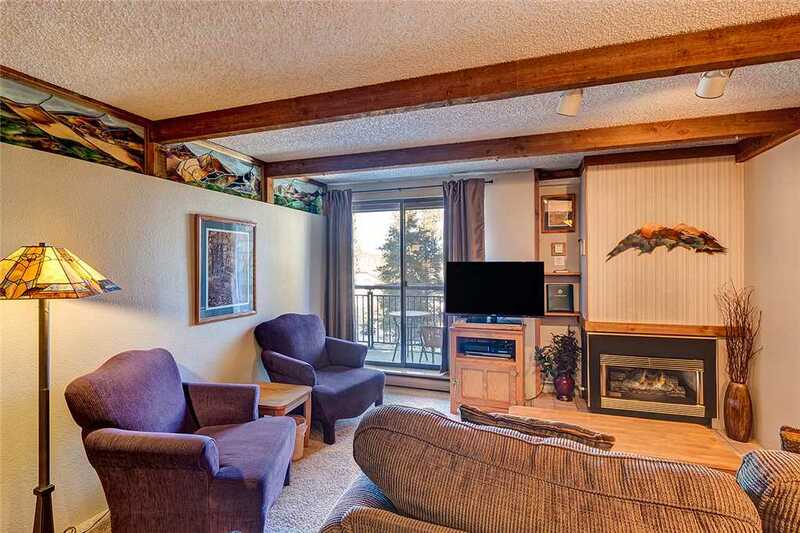 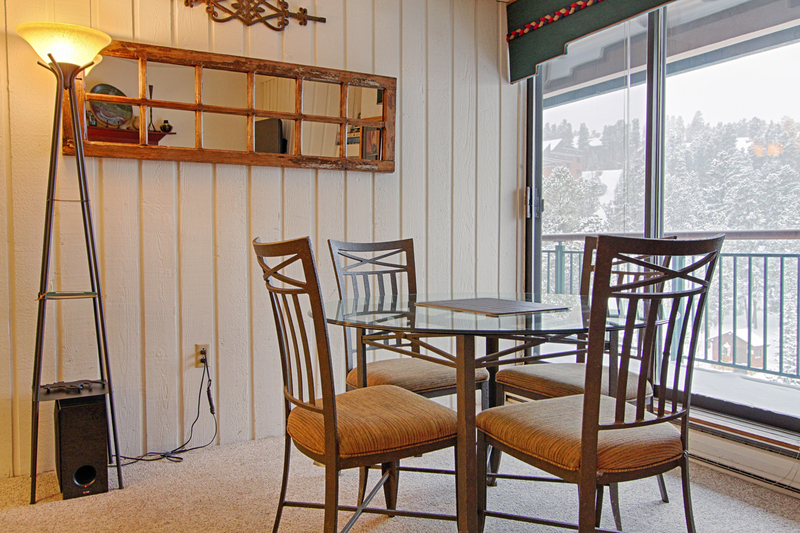 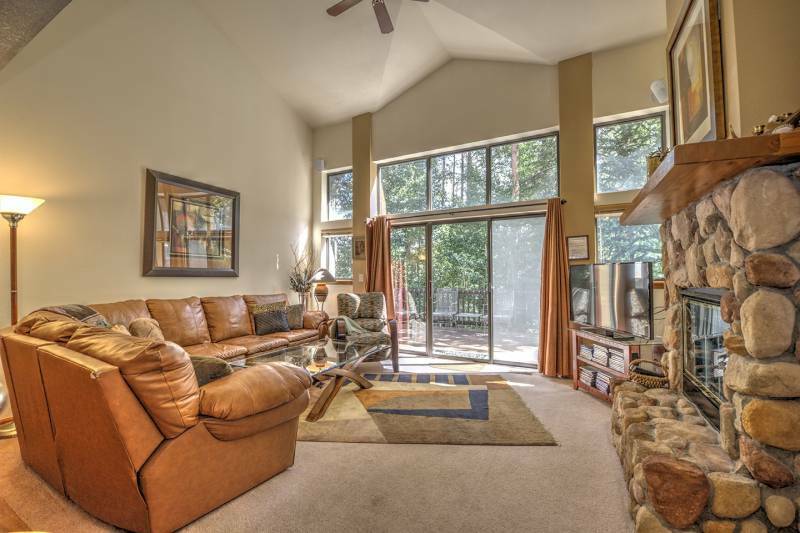 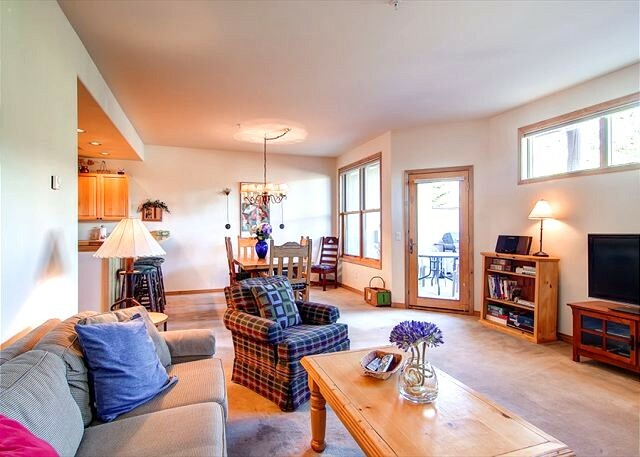 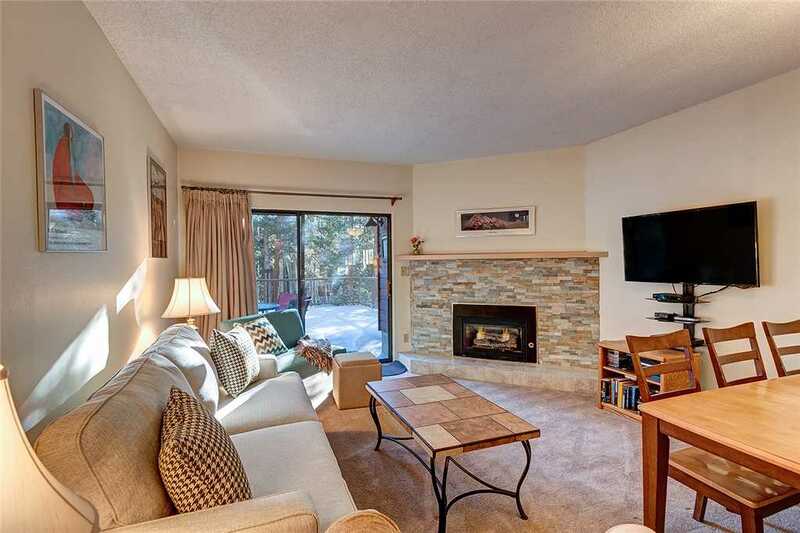 There is a balcony off of the two upstairs bedrooms with partial mountain views. 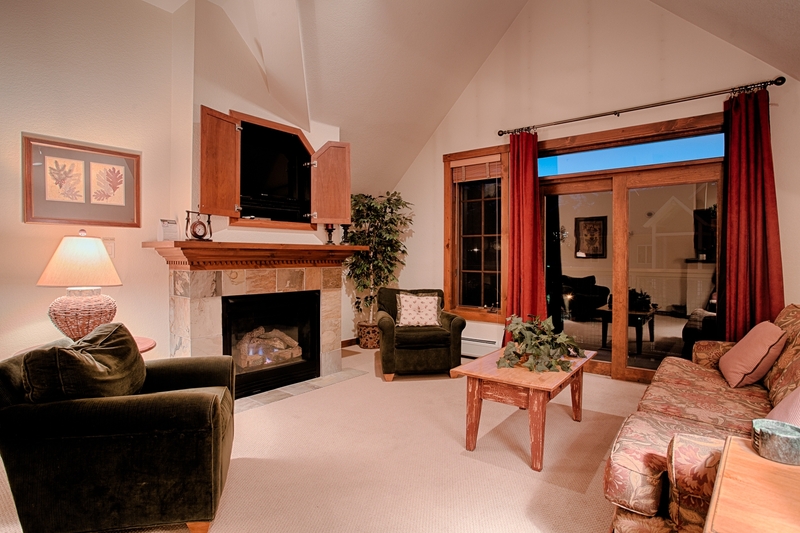 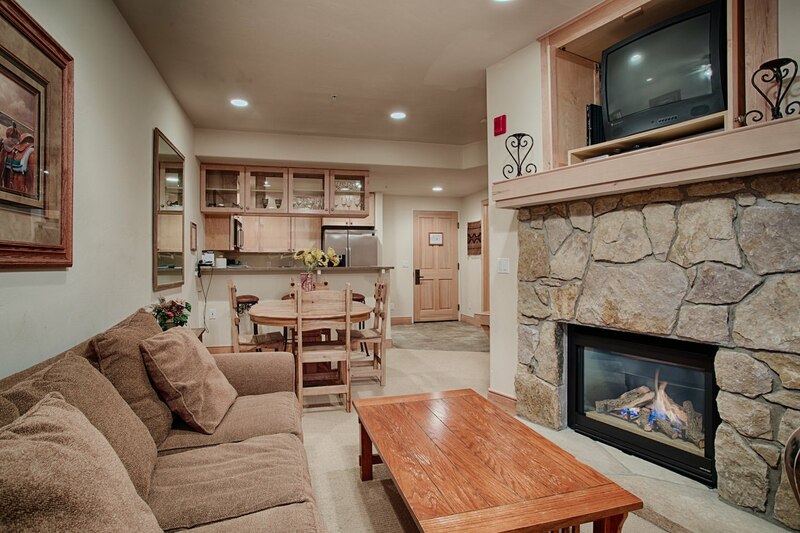 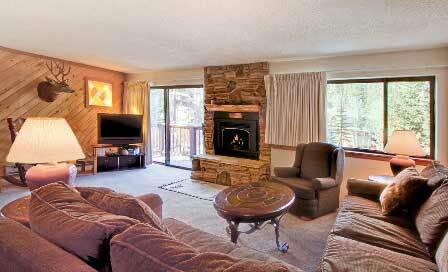 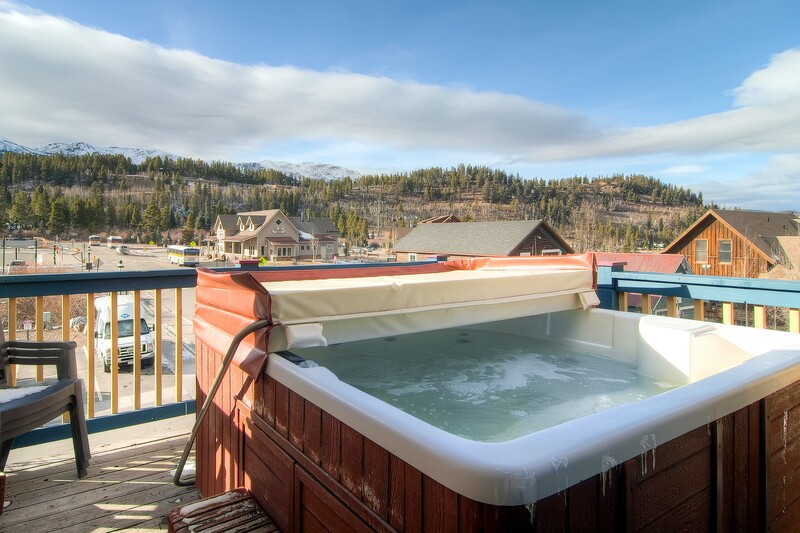 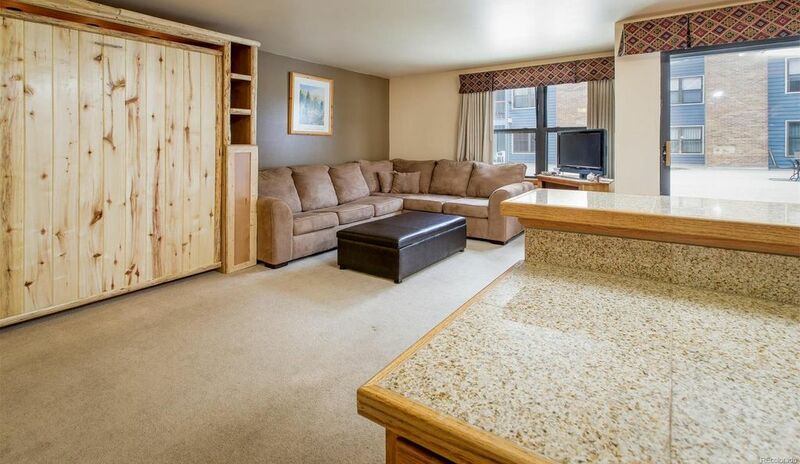 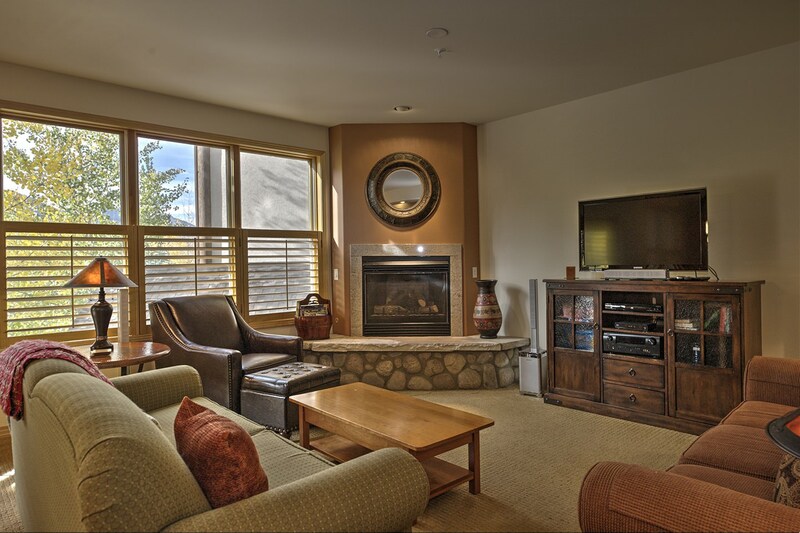 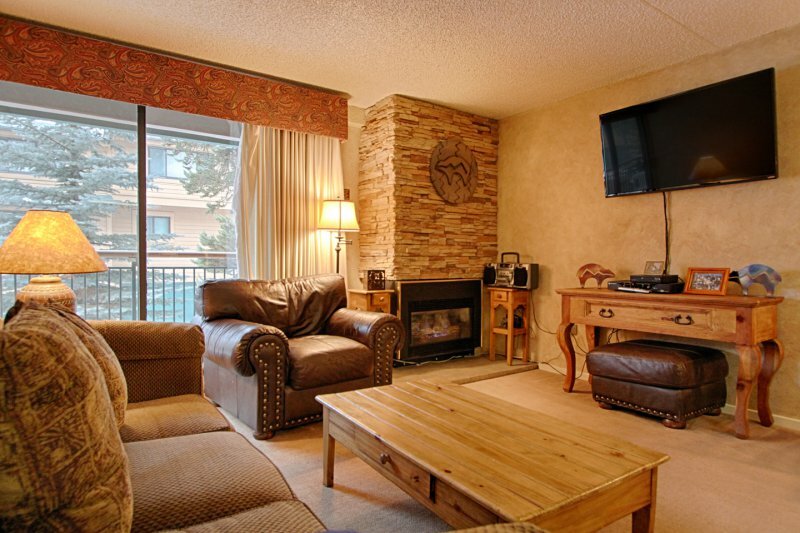 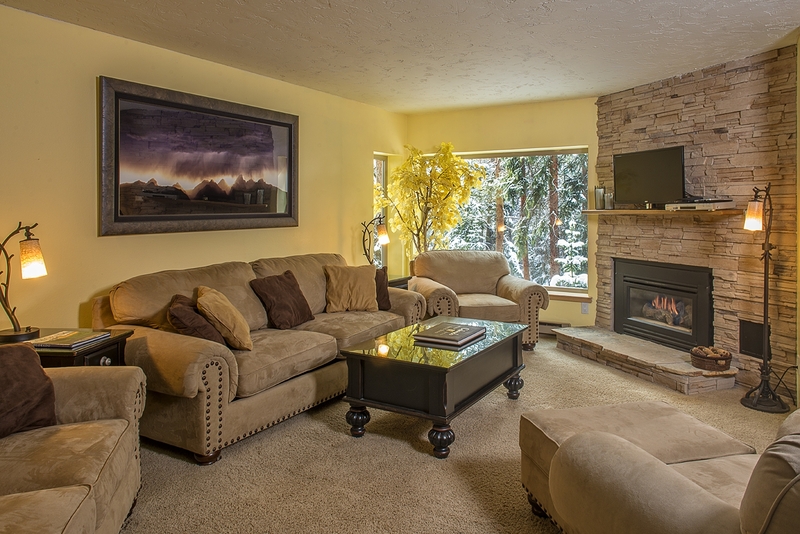 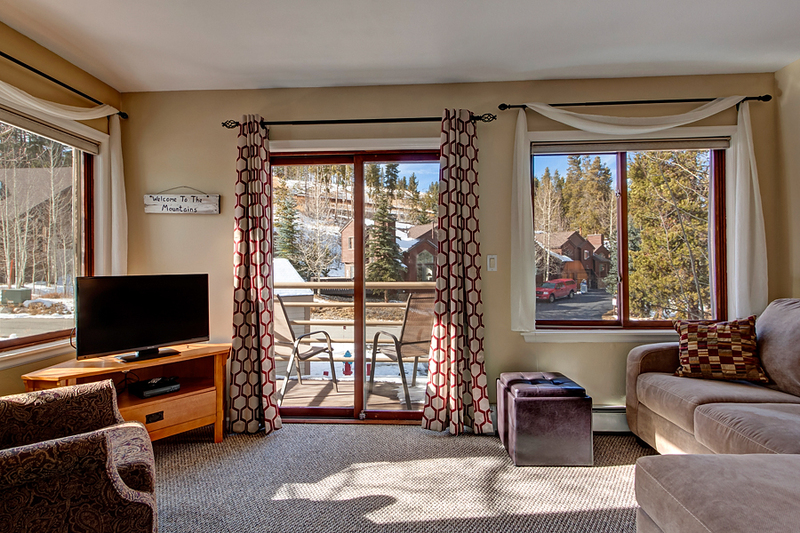 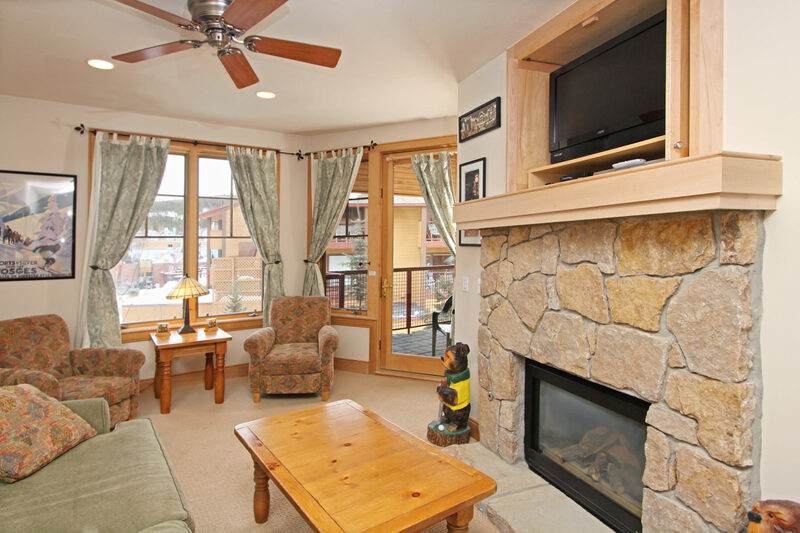 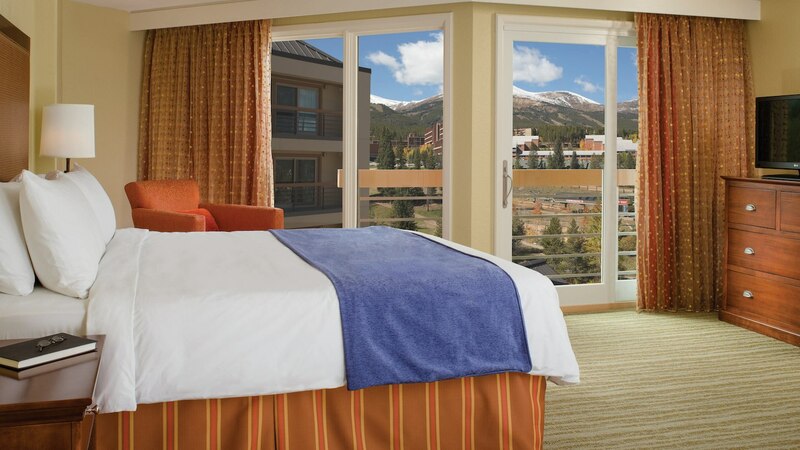 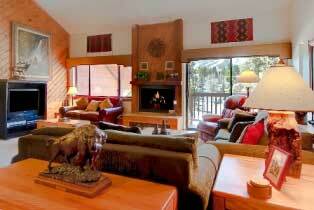 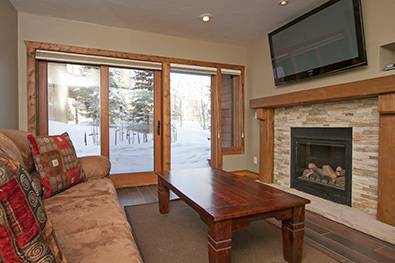 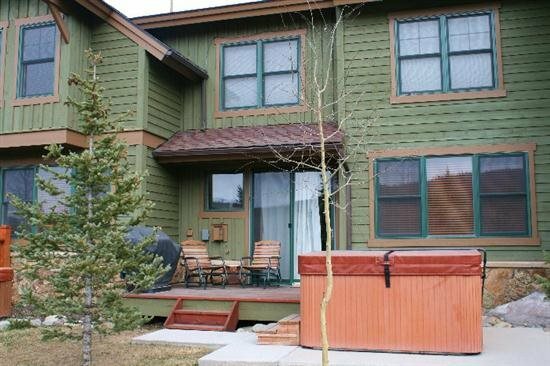 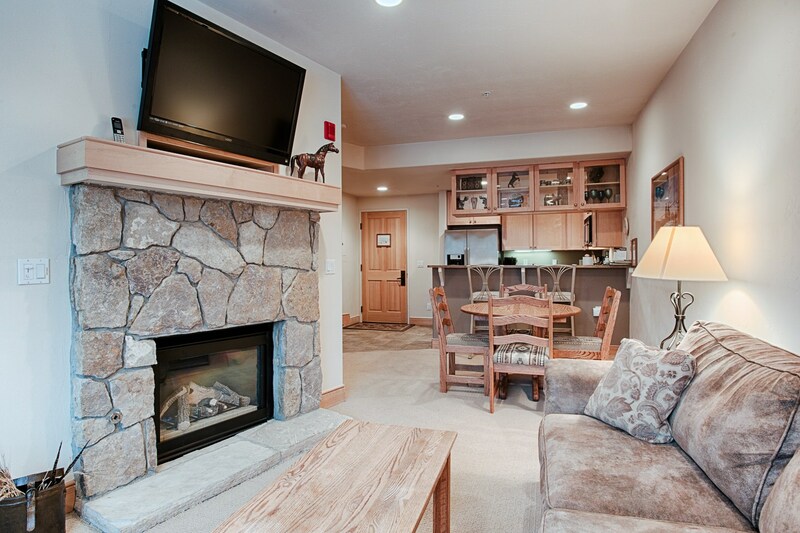 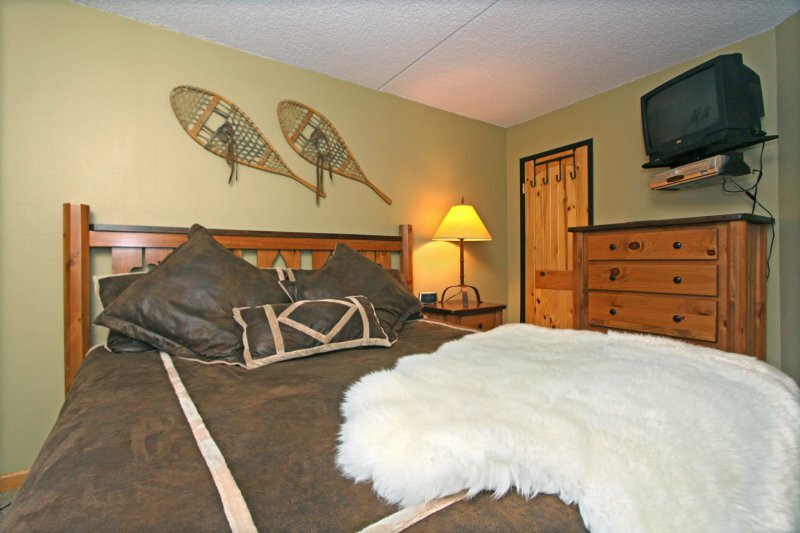 Enjoy a soak in the private hot tub just off the patio after a day of skiing or outdoor activities. 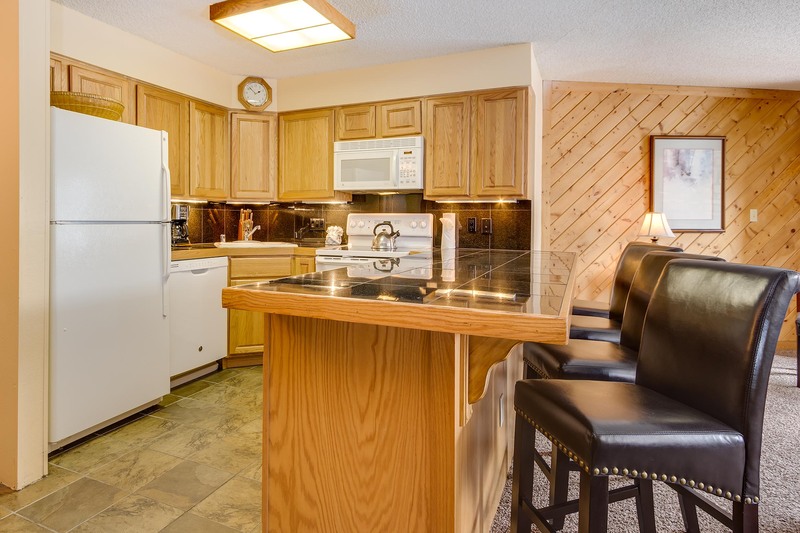 There is a also a gas grill for guests and outdoor furniture. 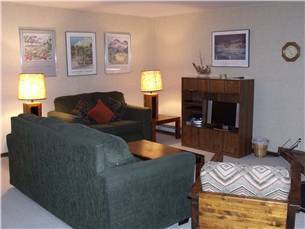 The owner of the home keeps a car in the garage year round, but there is another garage bay as well as a long driveway for ample parking. 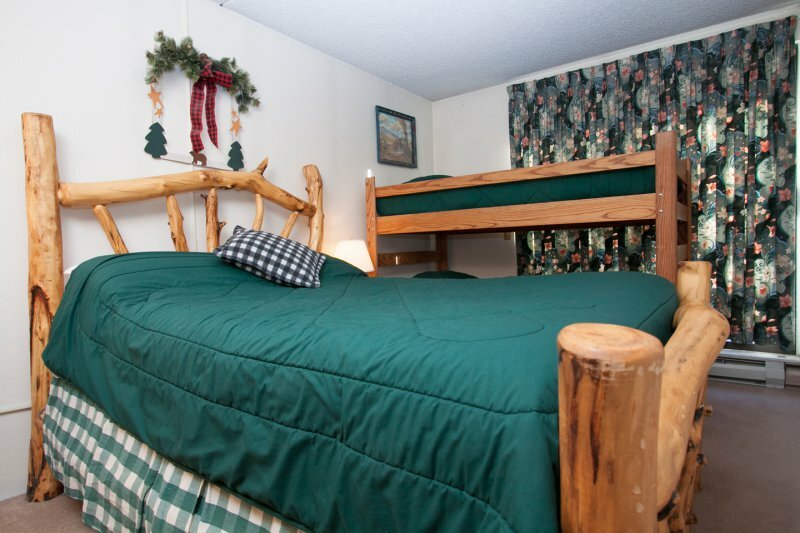 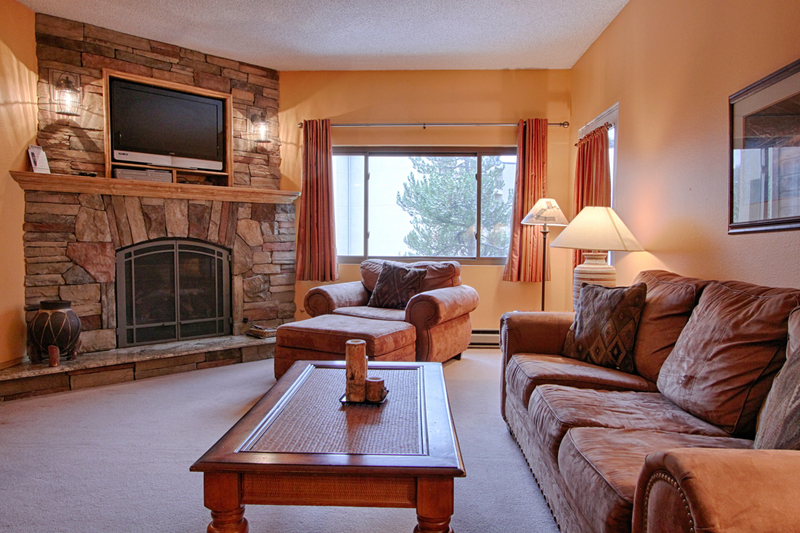 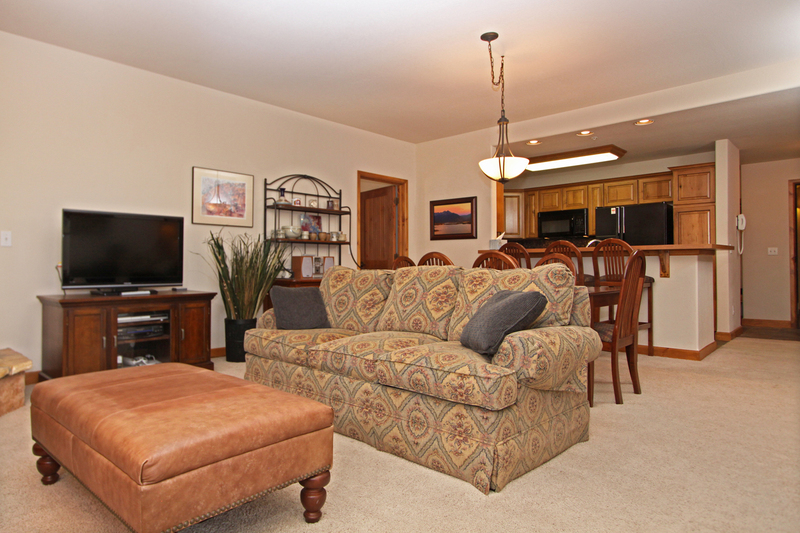 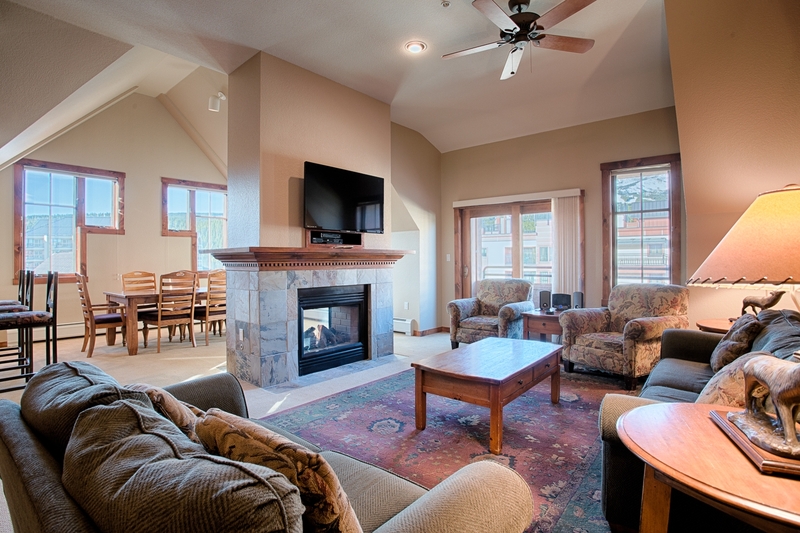 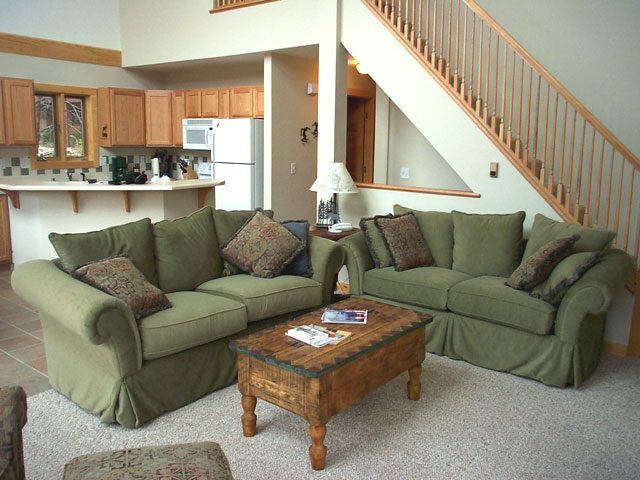 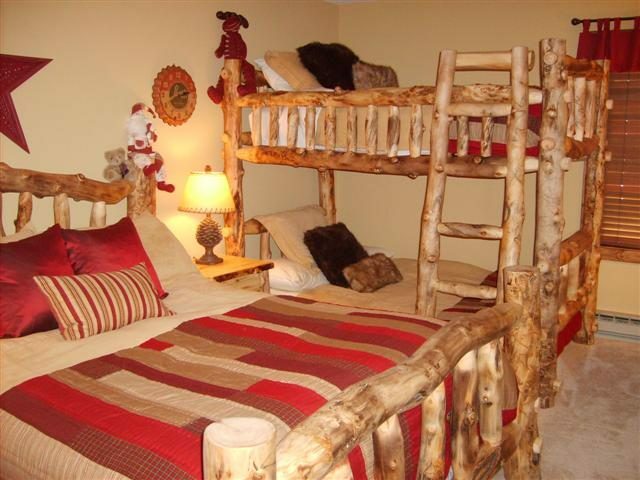 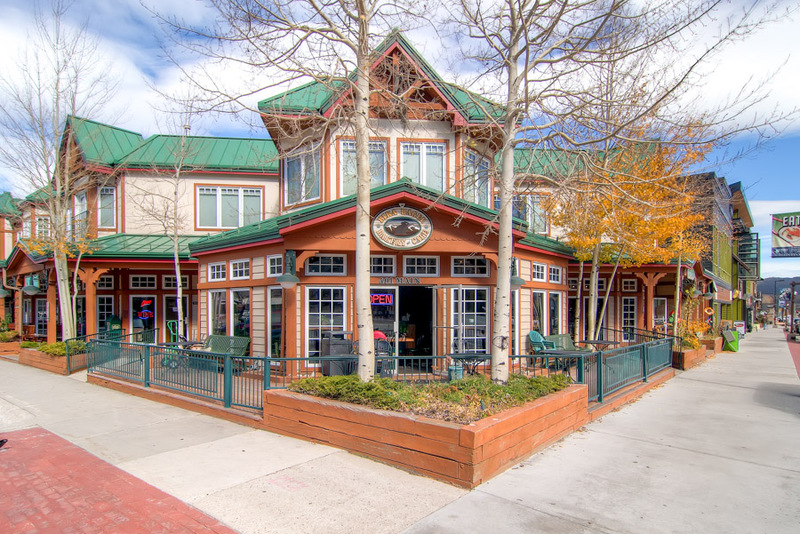 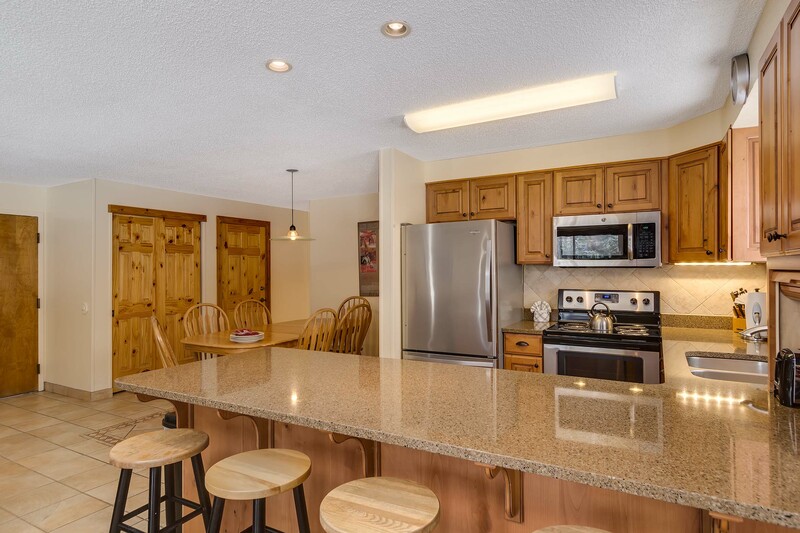 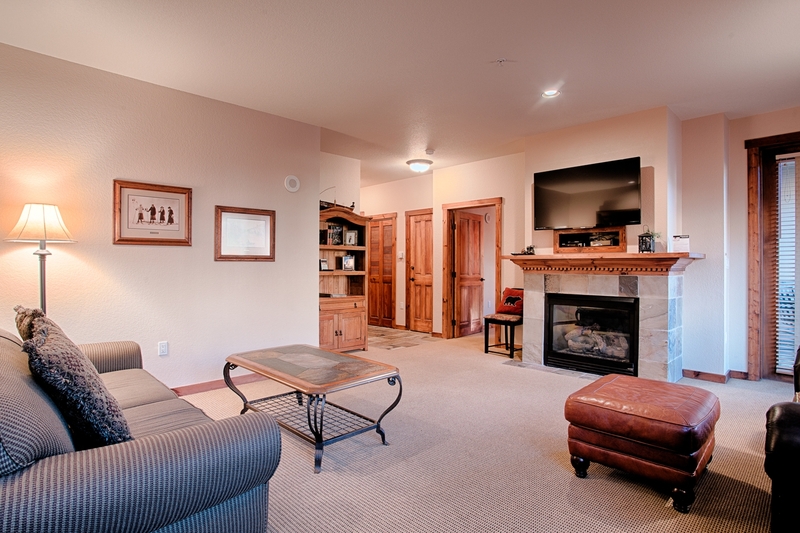 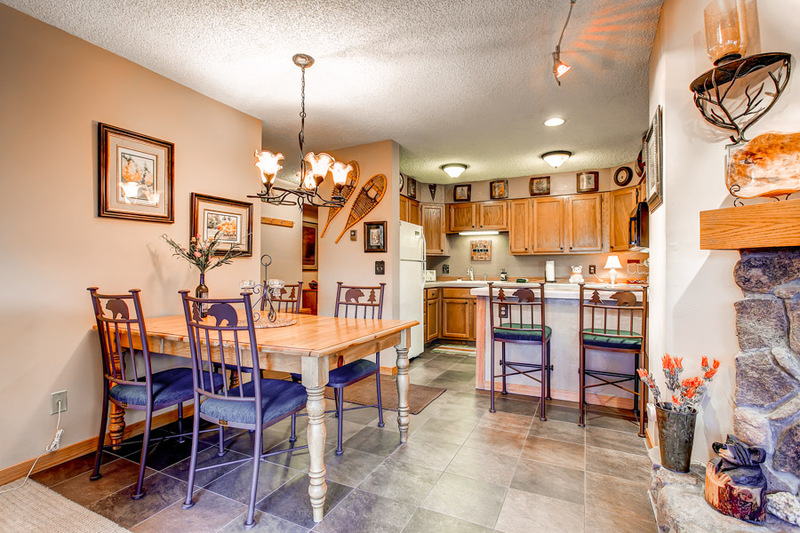 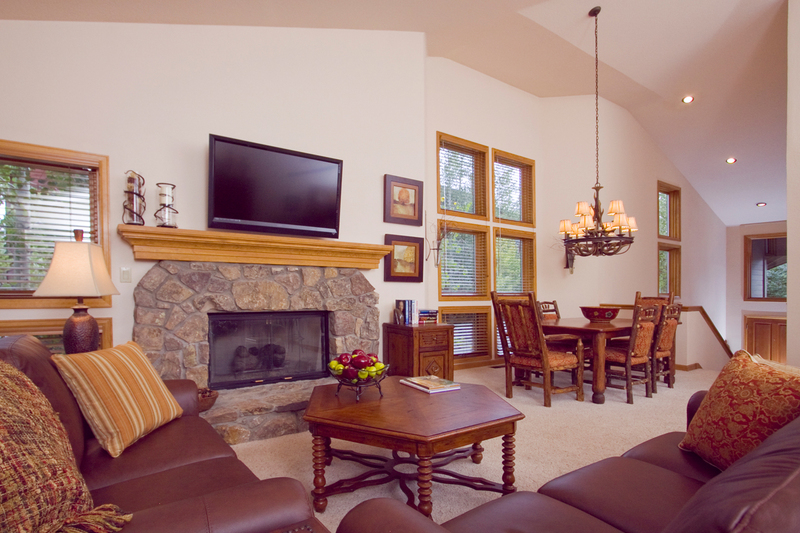 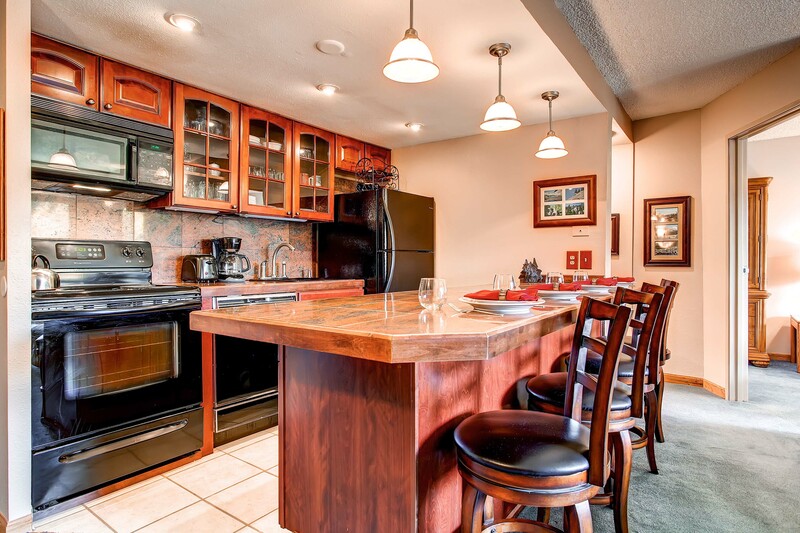 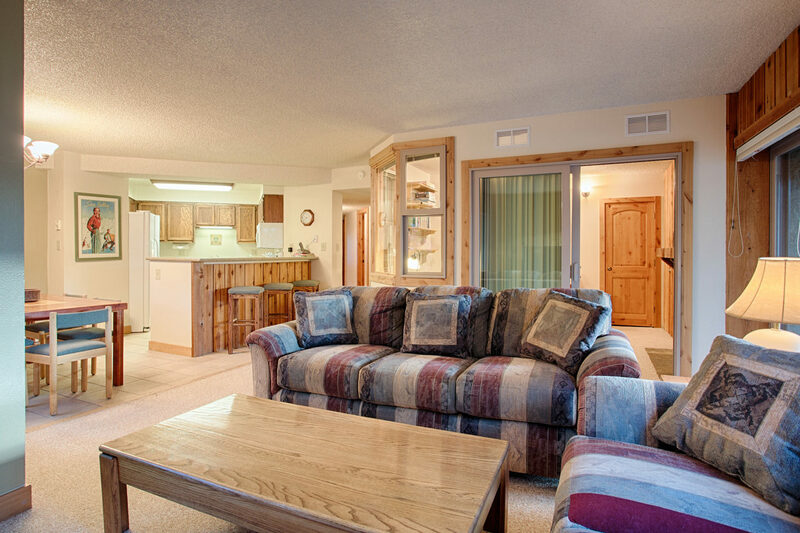 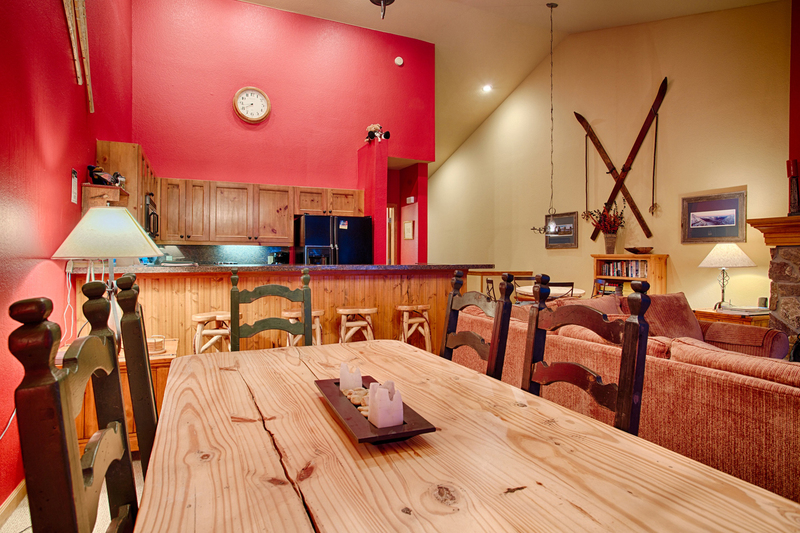 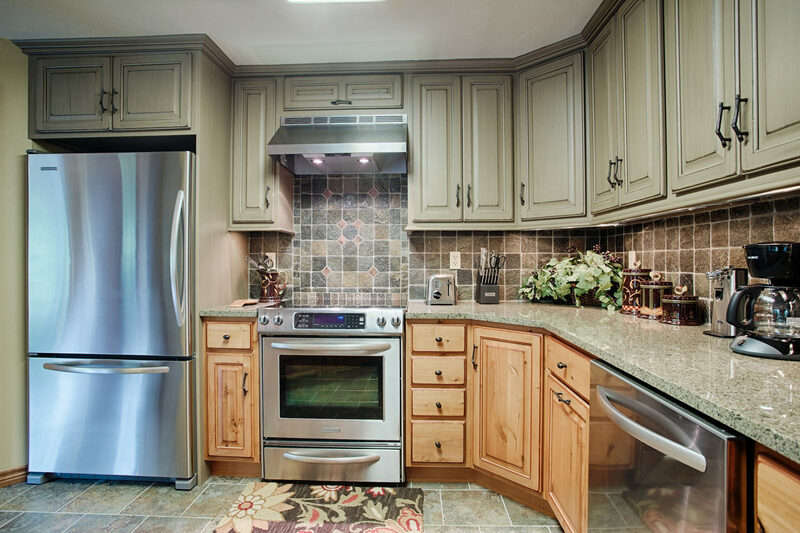 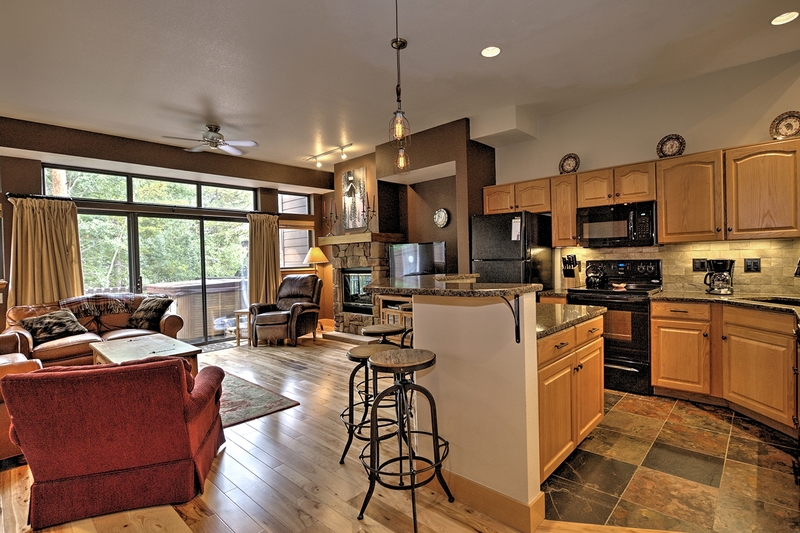 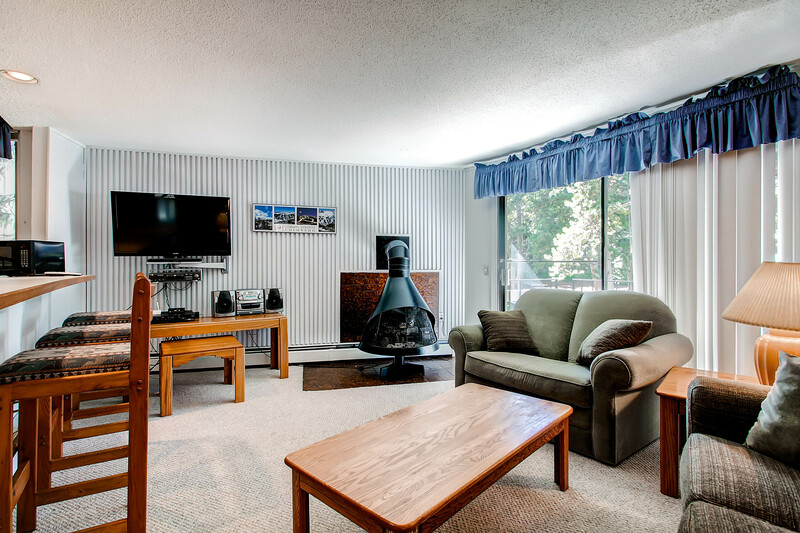 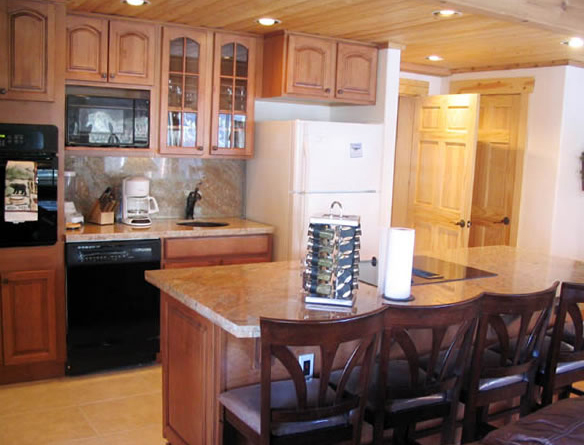 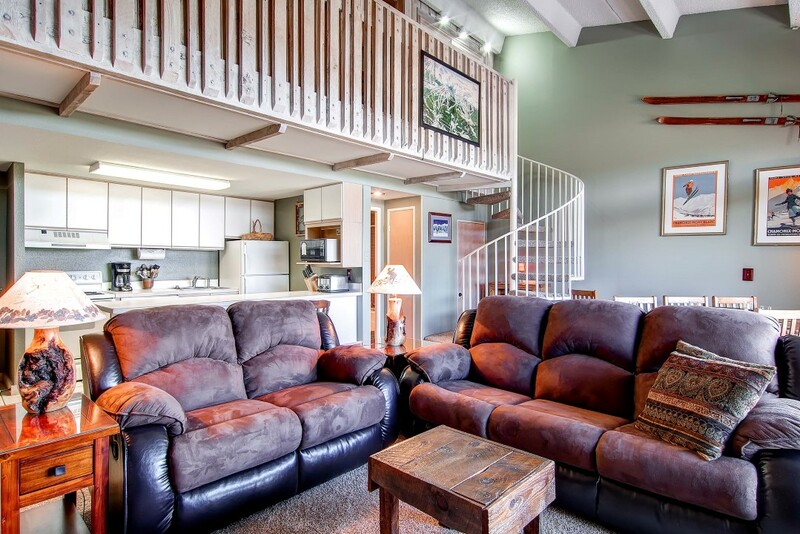 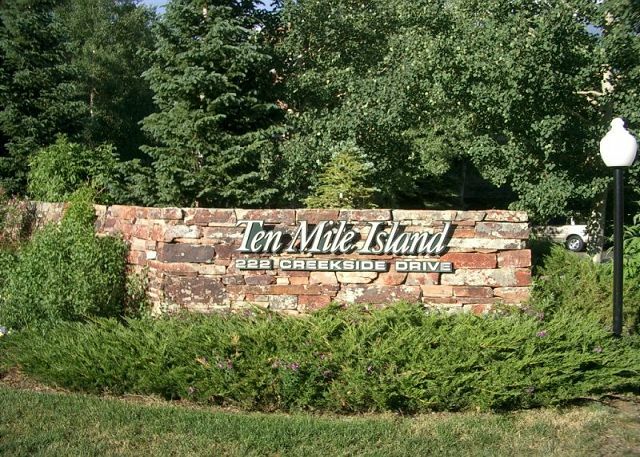 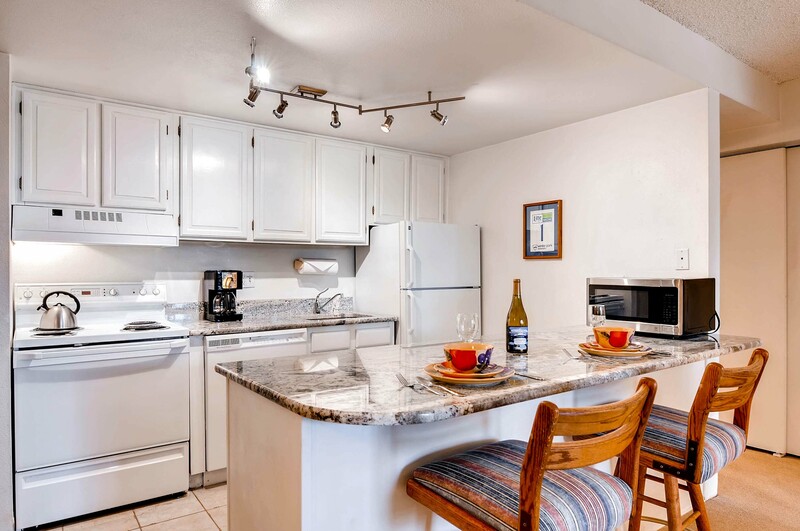 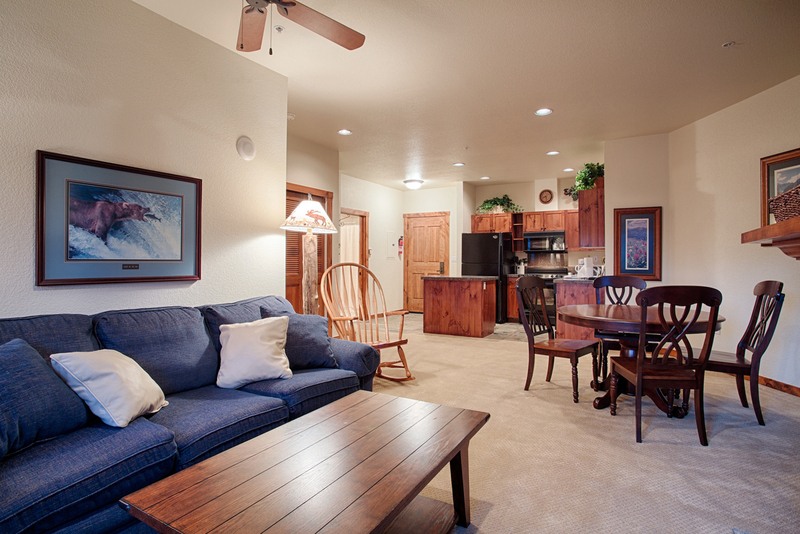 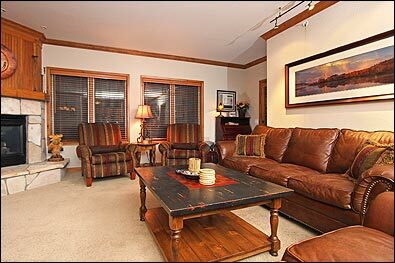 This is a perfect home for making wonderful vacation memories. 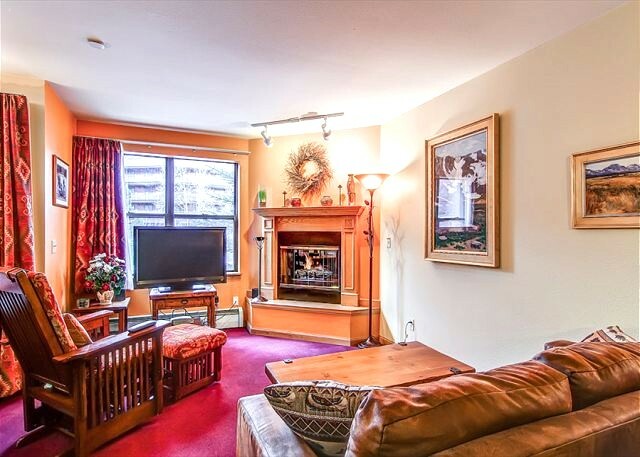 Sq footage is 1902. 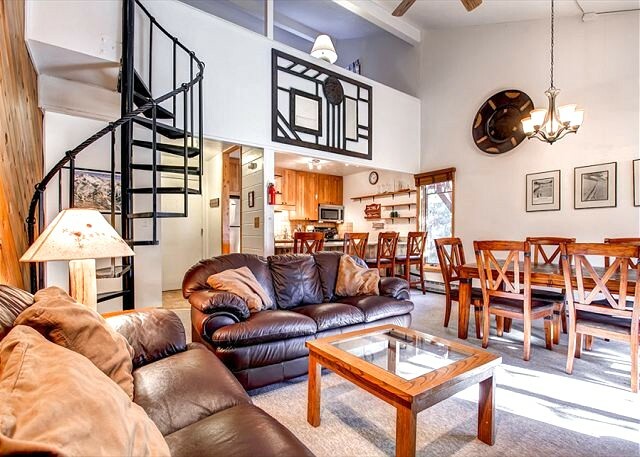 This is a two story home.